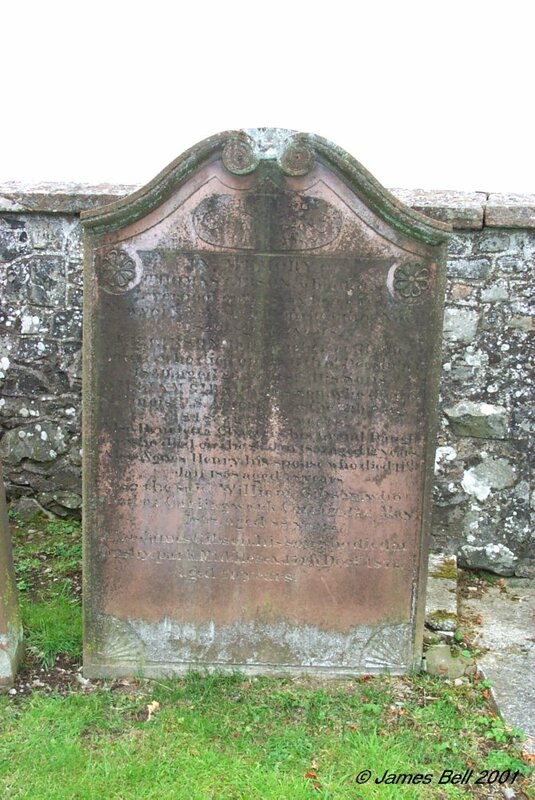 3 In memory of George Thomson, who died the 23rd May, 1810, aged 20 years son of John Thomson, carpenter in Dalbeattie. 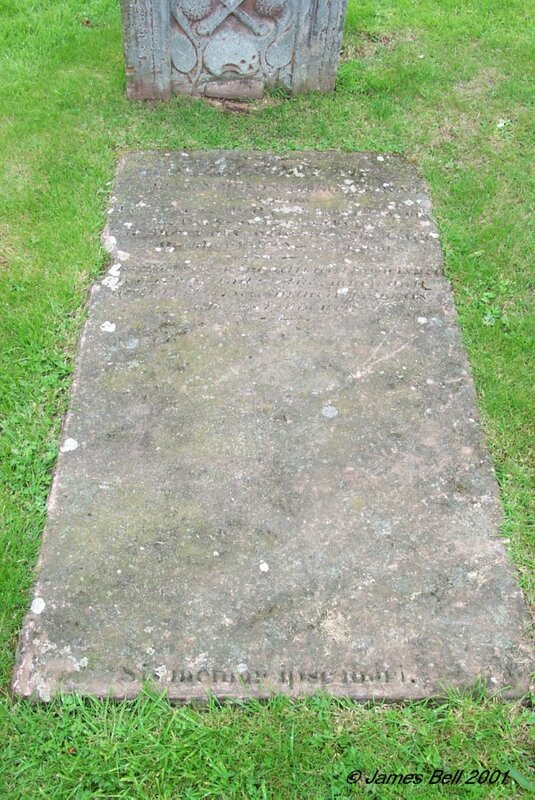 And also of Shusannah Hyde, his wife, who died the 23rd June 1820, aged 63 years. 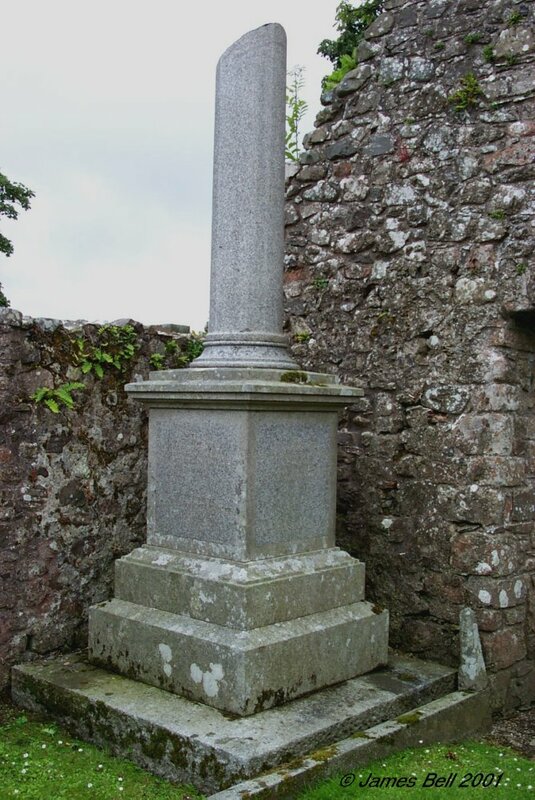 4 Erected by William Halliday to the memory of Robert his brother who died at Dalbeattie, on the 2nd day of September 1820, aged eleven months. Isabella his sister, who died on the 29th September 1847, aged 17 years. 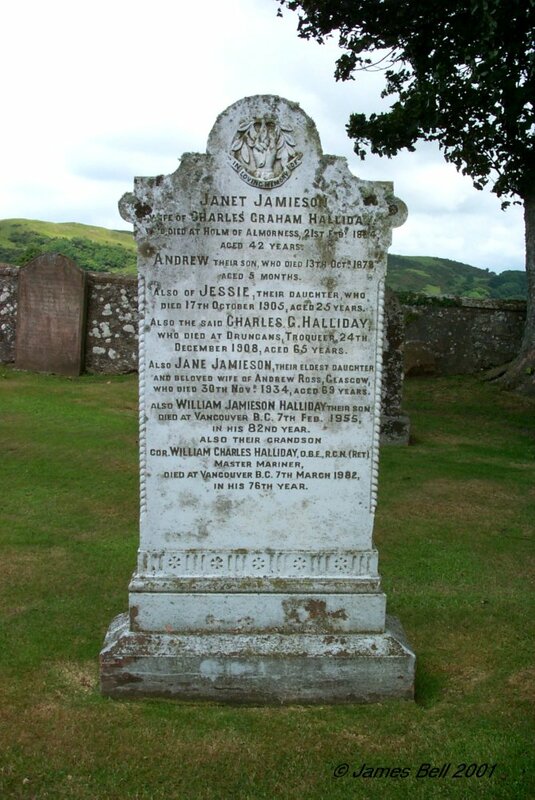 Also James Halliday, his father who died at Dalbeattie, 19th March 1858, aged 74 years. Mary Patterson, spouse to the above James Halliday, who died at Dalbeattie, on the 30th May 1861, aged 71 years. 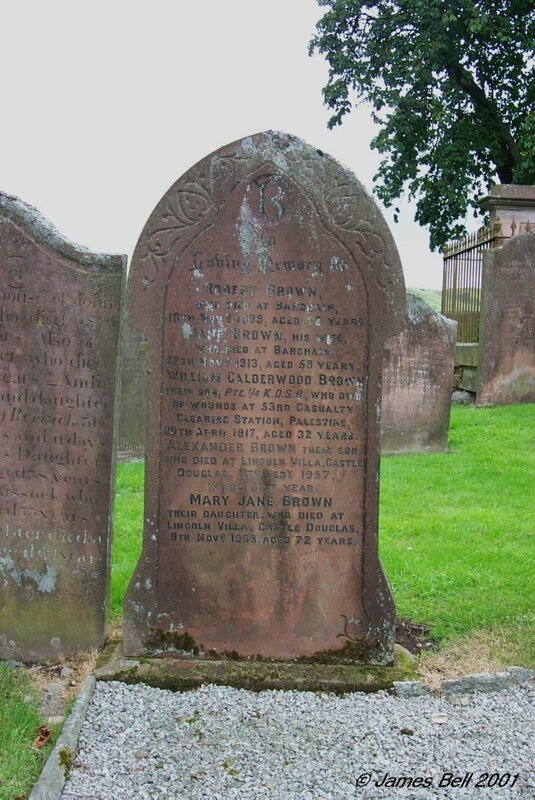 Also Robert Brown their son-in-law, who died at Haugh of Urr, on the 29th of May 1859, aged 39 years. Also the children of Robert Brown:- Mary died 1 Dec 1847, aged 1 year. Jane, died 1 Dec. 1853, aged 3 years. William, died 7 Dec. 1853, aged 8 years. Agnes L. died 2 June 1873, aged 15 years. Also Mary Halliday, wife of the above Robert Brown, who died 3rd October 1891, in her 68th year. 5 In the memory of Barbra Heuchan, spouse to John Sloan, who died at Cullinaw, July the 8th 1831 aged 62. Also of their children James, John, George and Ann Sloan's. Also the above John Sloan, he died the 7th of April 1853, aged 80 years. 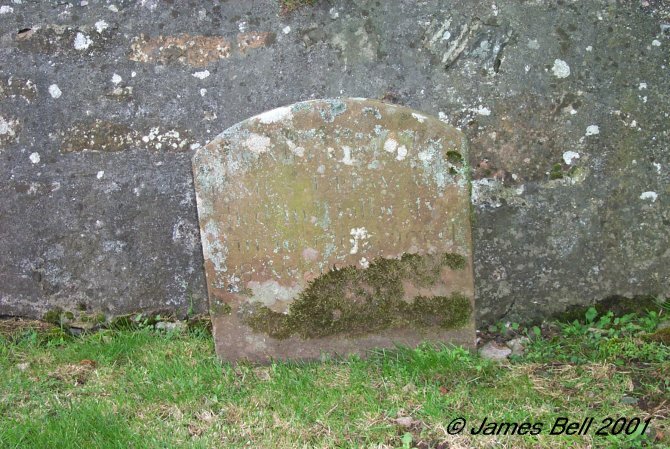 6 In memory of James Drew, who died in Dalbeattie, Jan. 10th 1795, aged 78 years. 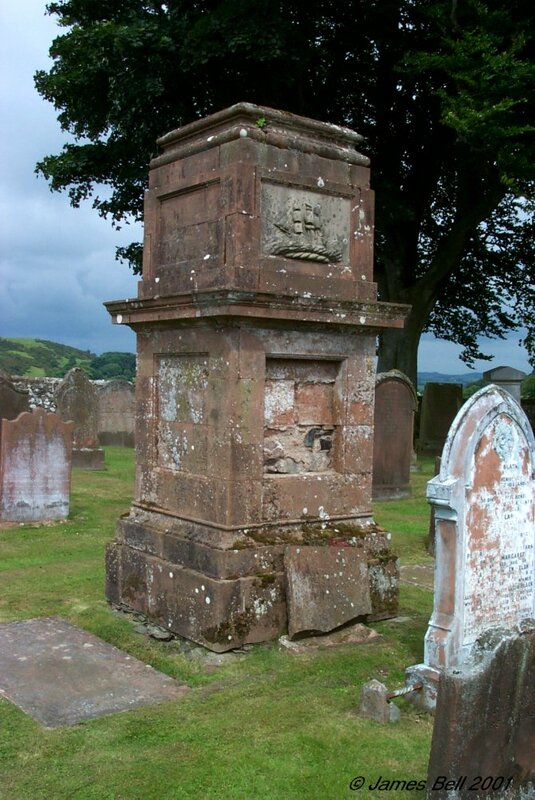 7 Erected by Joseph McAllister, in memory of his daughter Hellen, who died at Breoch, 4th October 1846 aged 7 years. Also Isabella his daughter, who died 26th Dec'r 1847, aged 15 years. Also Margaret his daughter who died 16th Feb'y 1853, aged 26 years. 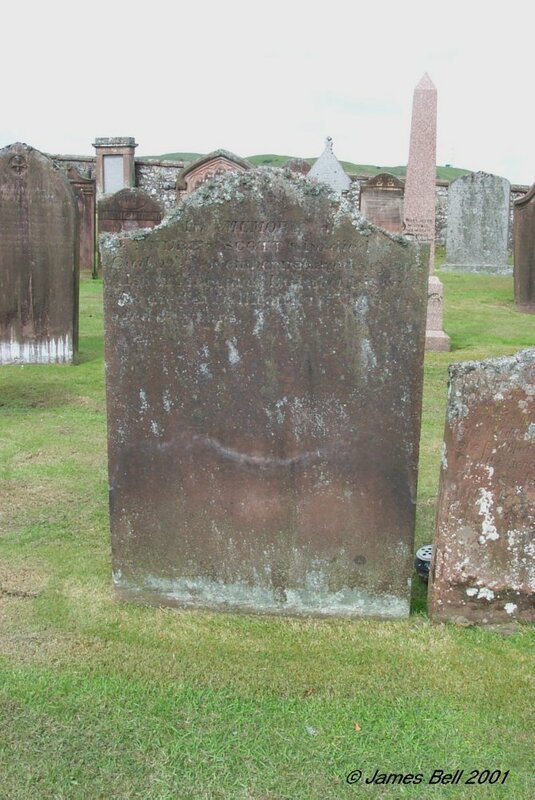 Also Janet Thomson, his wife, who died at Standing Stone, Kelton, the 15th of May 1859, aged 64 years. Also of the above Joseph McAllister, who died at Barwhillinty, Parish of Parton, 20th Aug't 1877, aged 80 years. 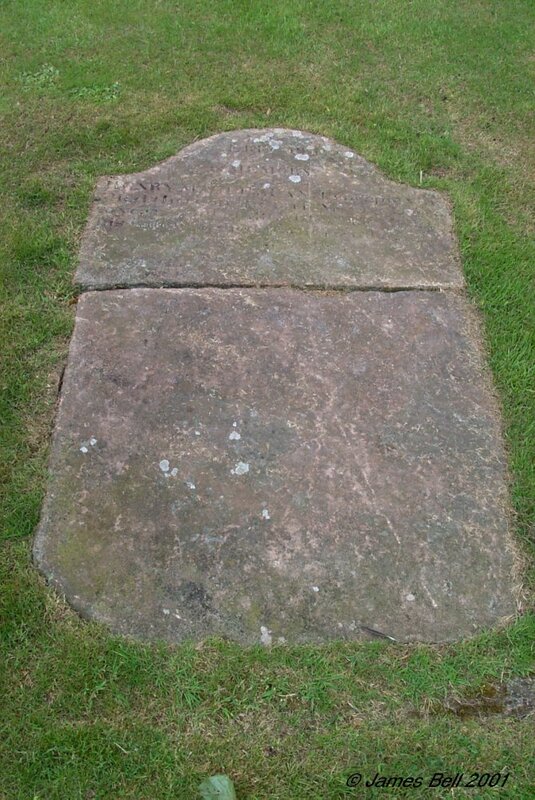 Also Isabella Thompson, the beloved wife of Samuel McAllister, who died at Standing-stone, 26th Dec'r. 1897, aged 61 years. Also Andrew, son of Samuel McAllister, who died at Combination Hospital, Castle Douglas, 7th July 1904, aged 27 years. Also the said Samuel McAllister, who died 6th July 1908, aged 81 years. 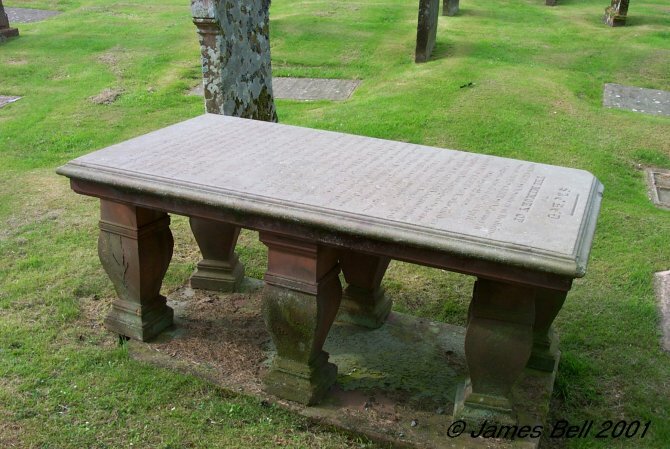 8 Sacred to the memory of James, son of John Hanning, who died at Meikle Knox. on the 10th day of April, 1840, aged 2 years. Also of Mary Ann, his daughter who died at Balmae, on 20th day of April, 1844 in the 8th year of her age. Also of Ann Margaret his daughter who died at Skipmyre, on the 21st day of May 1849 aged 1 year and 8 months. Also the said John Hanning, who died at Skipmyre, Parish of Tinwald, 10th of Dec. 1856, aged 64 years. 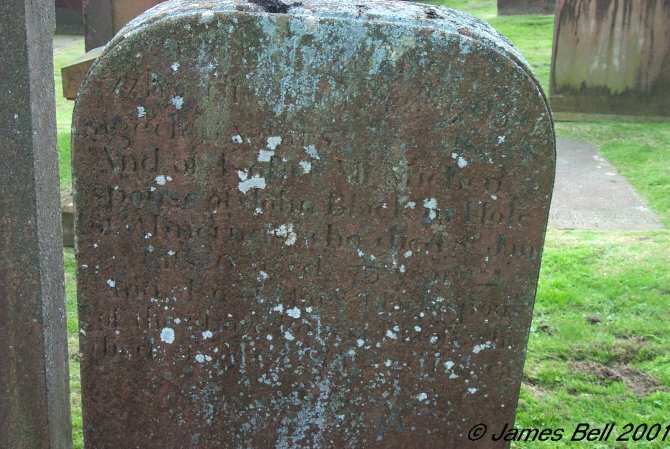 Also Jane Black, his wife who died at Chapelcroft, Lochmaben, 24th Nov'r. 1885, aged 72 years. 9 In memory of William Gillespie, son of Thomas Gillespie, who died at Gelston, June 1834, aged 5 years. Also John Gillespie, who died at Allanbank, 13th November 1869, aged 36 years. Also of the said Thomas Gillespie, who died at Dalbeattie, 10th October 1874, aged 77 years. 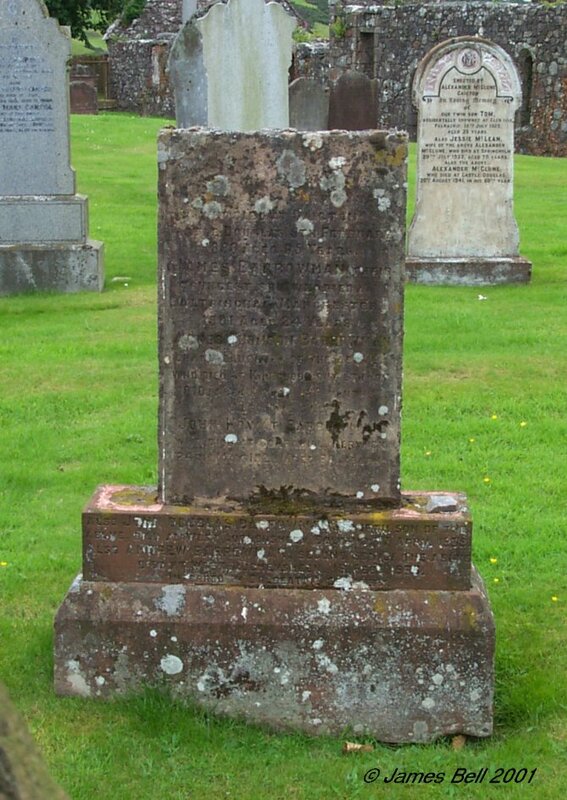 Also of Henrietta Cannon, relict of the said Thomas Gillespie who died at Dalbeattie, June 4th 1882, aged 80 years. 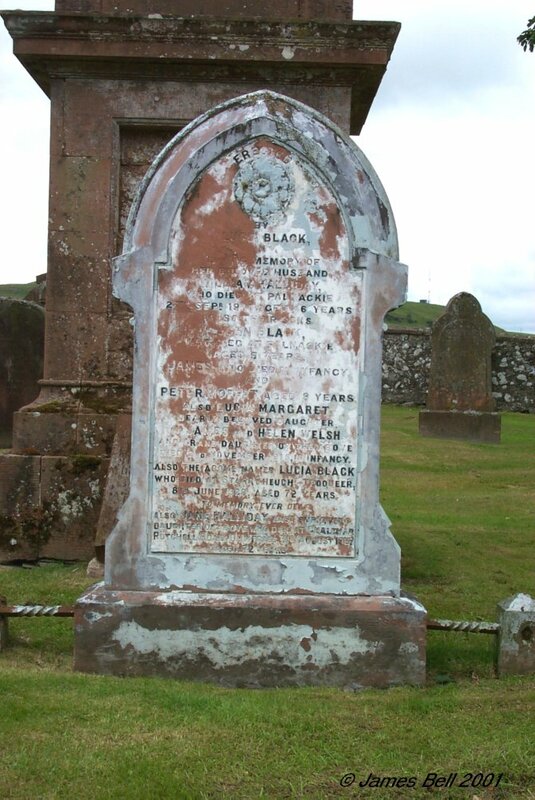 Also Margaret Gillespie, who died at Dalbeattie on the 8th Dec. 1883, aged 39 years. Also Isabella Gillespie, widow of James M. Helm, who died at Dalbeattie, 13th May 1911, aged 83 years. Mary Gillespie, who died at Edinburgh on the 30th June 1915, aged 77 years. Elizabeth Gillespie, who died at Dalbeattie on the 17th December 1915, aged 80 years. Jessie Gillespie, who died at Edinburgh, 20 May 1924, aged 78 years. 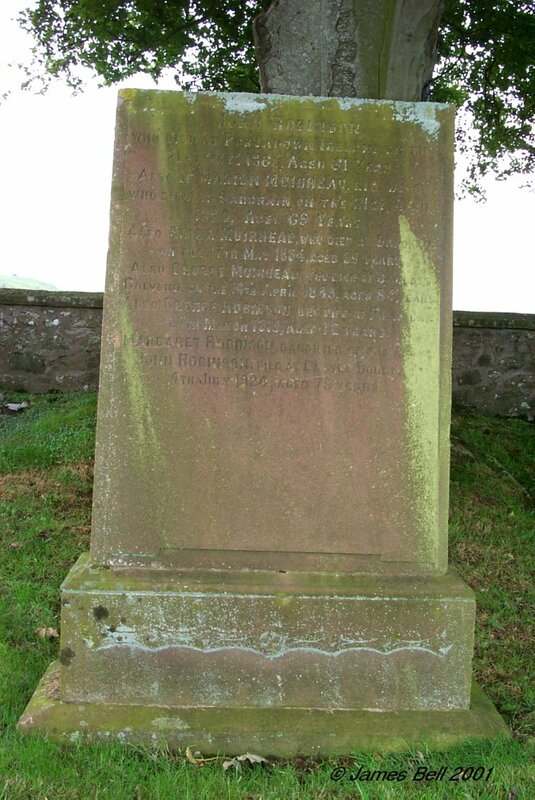 10 Sacred to the memory of Alexander McRobert, who died at Dalbeattie on the 5th of December 1849, aged 84 years. Also of Janet Copland, his spouse, who died at same place on the 25th October 1854, aged 89 years. Also of John McRobert their son who died at Clonyard, in this Parish, 10 Sept. 1865, aged 75 years. Also of Janet, daughter of John McRobert, who died at Clonyard 10th July 1867, aged 46 years. Also of Janet Johnston, wife of John McRobert, who died at Clonyard, 14th Jan 1869, aged 78 years. Also William McRobert, son of the above John McRobert, who died at Clone, 23rd April 1886, aged 56 years. Jane Brown, wife of the above William McRobert, died 24th March 1907, aged 64 years. 11 In memory of John Armstrong, who died at Buittle Place, 10th Feb. 1842, aged 60 years. 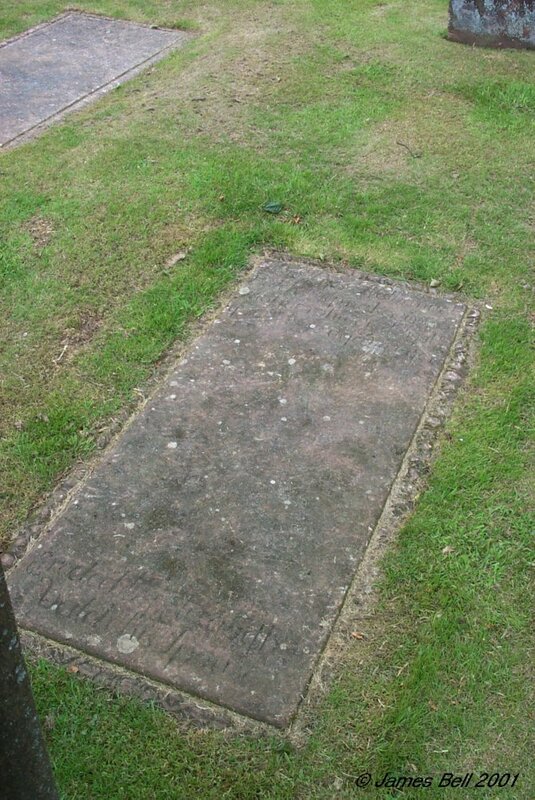 Also of Elizabeth Armstrong, his daughter, who died at Ipswich, County of Suffolk, 29 Dec'r 1854, aged 30 years. Also of James Armstrong, his son, who died at Buittle Place 30th May 1855, aged 43 years. Also of Robert Armstrong, his son, who died at Buittle Place 17th Dec'r. 1863, aged 48. 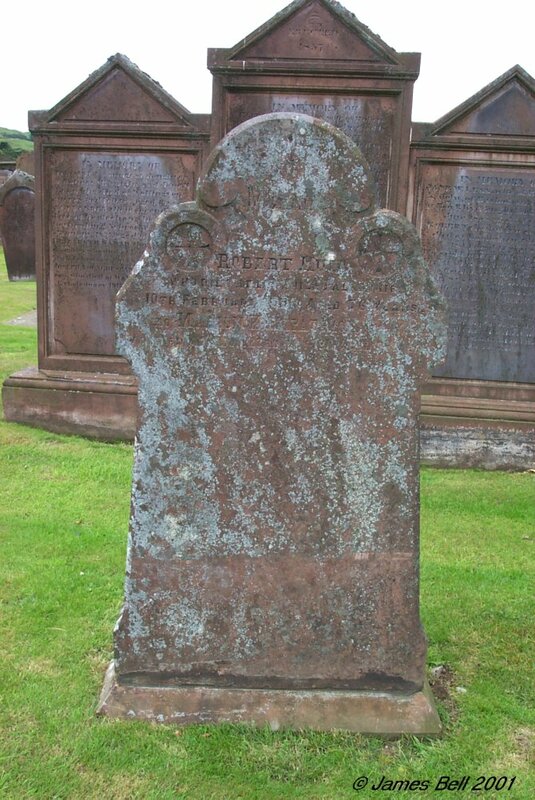 Also of Sarah Wright, spouse of the above John Armstrong, who died at Dalbeattie on the 20th April 1865, aged 73 years. 12 Sacred to the memory of Thomas William Graham, son of Robert and Mary Graham, late in West Linton, Cumberland, who died at Cockleaths in this Parish, 27th June 1860, aged 11 years. Robert Graham, their son, who died 25th May 1872, aged 19 years. 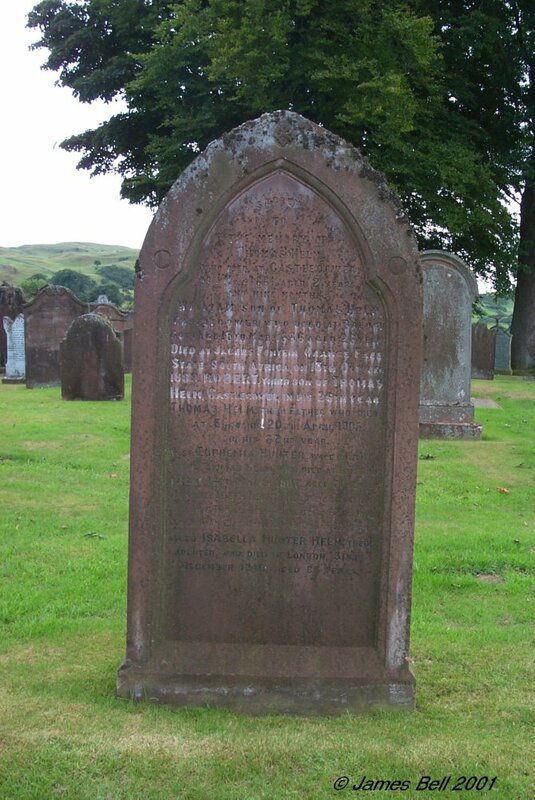 Also the above Mary Graham, who died at Dumfries, 28 March 1891 aged 77 years. 13 (Here lies) the corpse of Jane -----y, spouse to George Riddick, who departed this life the 22nd of ----, 1722, aged 38 years. And of Robert Riddick, son to George Riddick, who departed this life Feb'y 8th 17--. Note. 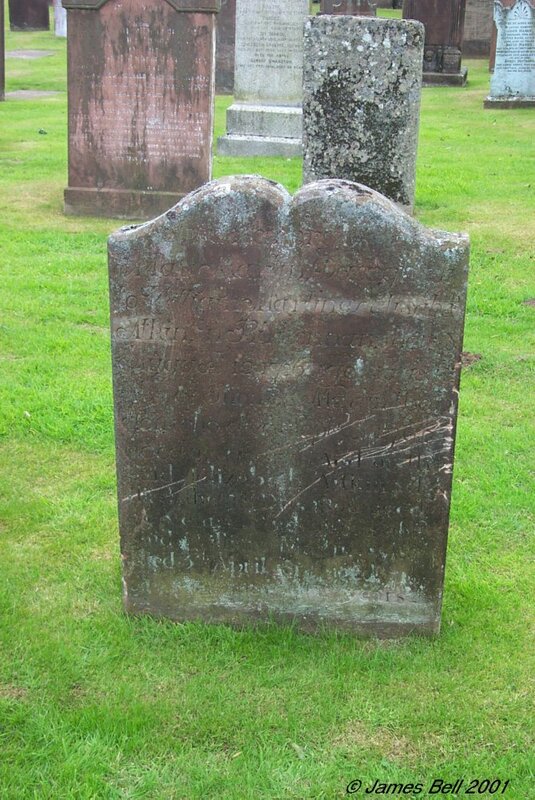 There is a further inscription at the foot, which seemingly relates to a James Riddick in Dumfries. either the body of, or erected by, him. 14 In affectionate remembrance of Isabella, wife of James Mitchell, who died in the prime of life at Little Knox, on 29 July, 1858. 15 In Memoriam. Margaret Carter, wife of Archibald Marchbank of Little Knox, who died 2nd April 1927, aged 54 years. Also the above Archibald Marchbank, who died at Castle Douglas, 11th August 1955. 16 Erected by William Gibson, in memory of Thomas Gibson, who died at Liverpool, on his way home from New York, N. America, on the 9th Nov'r. 1829, aged 22 years. A.H. Gibson, late teacher at Rhonehouse, who died on the 17th of December 1839, aged 23 years, his sons. William Gibson, his son, who died at Illinois, U.S. America, on 12th Aug. 1848, aged 48 years. Also Henrietta Charters, his grand-daughter, who died on the 8th Jan. 1857, aged 12 years. Also Agnes Henry, his spouse, who died 11 Jan. 1858, aged 78 years. Also the said William Gibson, who died at Carlingwark Cottage, 12th May 1868, aged 88 years. 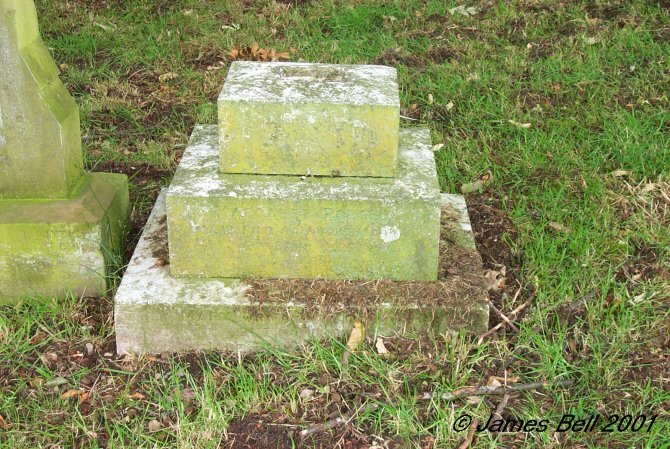 Also James Gibson, his son, who died Bushy-park, Middlesex, 17th Dec'r 1872, aged 70 years. 17 Erected by Robert Gibson, Standingstone, Borgue, in memory of Margaret Hanning, his wife, who died 6th January, 1877, aged 78 years. Also the above Robert Gibson, who died at Pine Rock, U.S.America, 2nd July, 1887, aged 79 years. 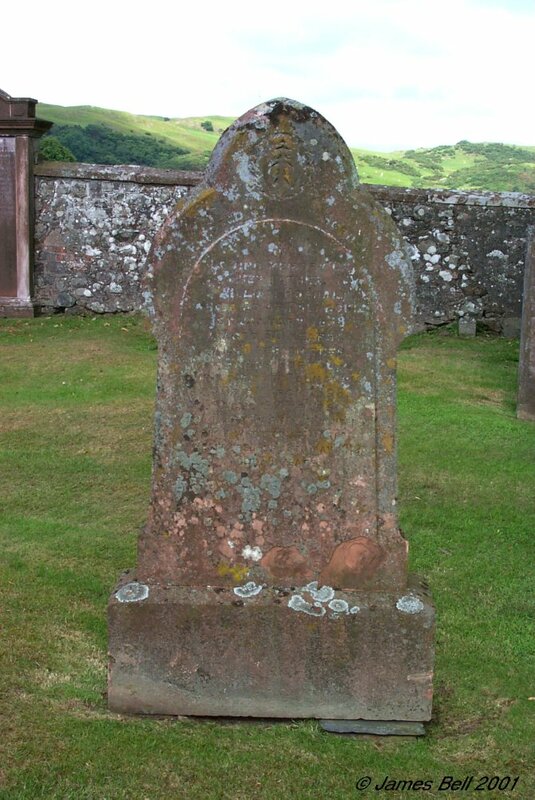 Also Ann H Gibson, his daughter, and wife of Samuel Jolly, who died at Drumore, Kirkcudbright, 12th June 1874, aged 37 years. Also James Gibson, his son, who died at Torrs, Kelton, 26th January 1901, aged 63 years. Also Mary Ann Hanning Gibson, eldest daughter of the above James Gibson, who died at Torrs, Kelton, 28th June, 1902, aged 33 years. Margaret Anne Gibson, his youngest daughter who died at Castle Douglas 11 Feb. 1909, aged 31 years. Also Jessie Gardiner, his spouse who died 13th May 1909, aged 73 years. 18 Joseph Ireland, died 30th May MDCCCLXIII. "Jesus cried and said l am come a light into the world, that whosoever believeth in me should not abide in darkness." St. John XII, 44th & 46th. 19 Sacred to the memory of Agnes Wilson, wife to George McKnight, who died at Palnackie, the 29th of April 1846 in the 27th year of her age. 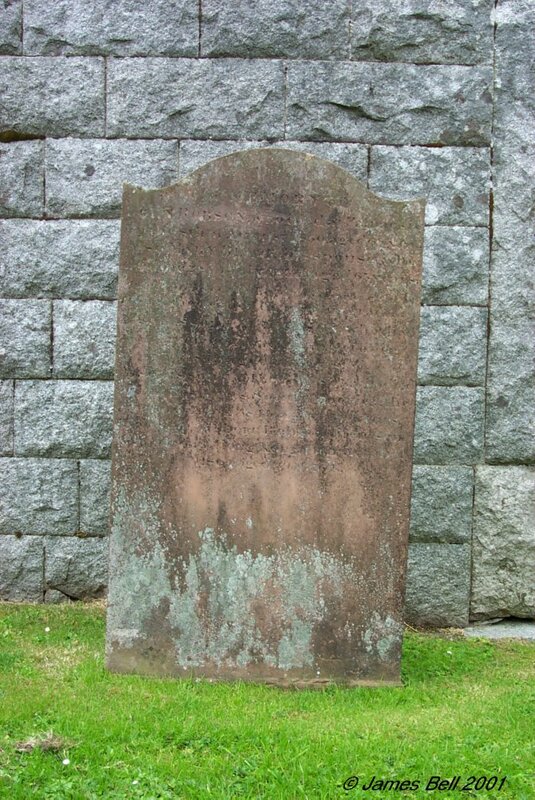 The said George McKnight, died at Amherst, Nova Scotia, the 10th of November 1852, aged 35 years. 20 Erected in memory of William Smart, Farmer, Corbieton, who died 6th January 1870, aged 48 years. Also John Smart, his father, who died at Crossford, Glencairn, 12th October 1871, aged 80 years. 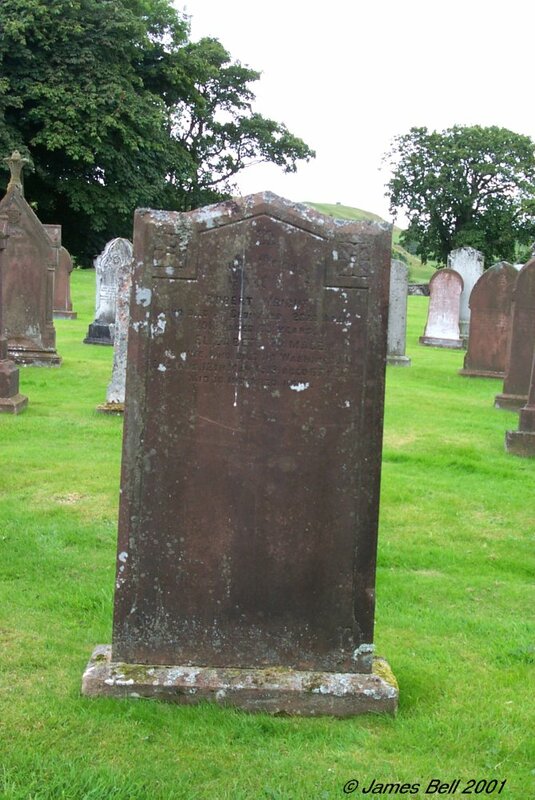 Also Jane Johnstone, wife of John Smart, who died at Blackpark, Kirkpatrick Durham, 1st August, 1875, aged 80 years. 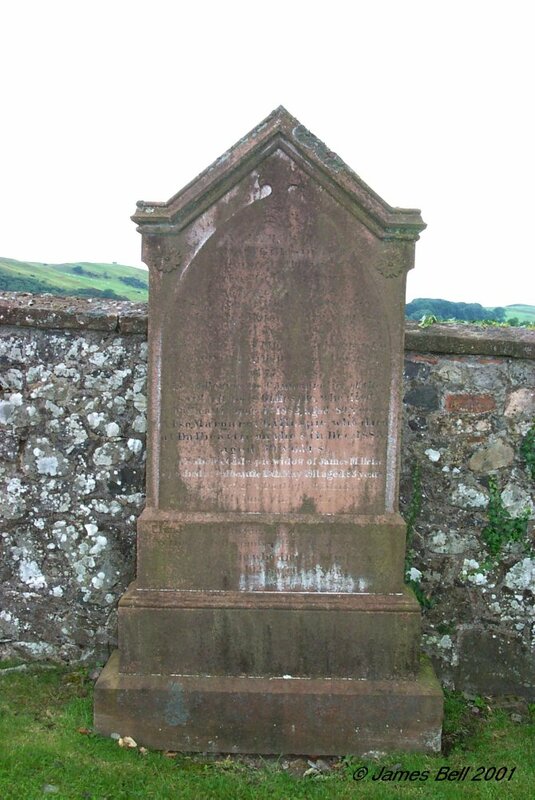 25 Erected in memory of William Gillespie, who died at Colehole, Buittle, 10 Dec. 1857, aged 53 years. Also his twin children who died in infancy in 1830. Also John Gillespie, his son who died in 1833, aged 17 months. Also Elizabeth Gillespie, his daughter who died in 1846, aged 6 months. 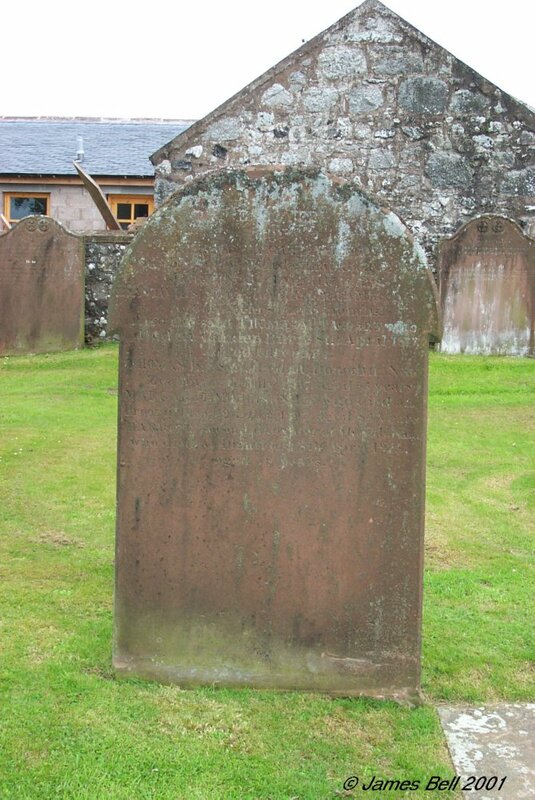 Also Agnes, is daughter who died at Keswick, 2nd Feb. 1864, aged 21 years. 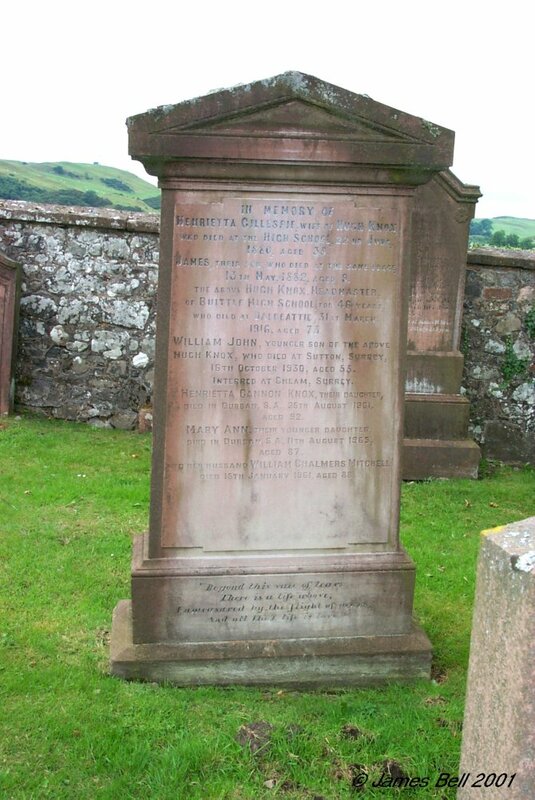 Also Mary Paterson, his wife who died at Dalbeattie 25th Nov. 1879, aged 77 years. 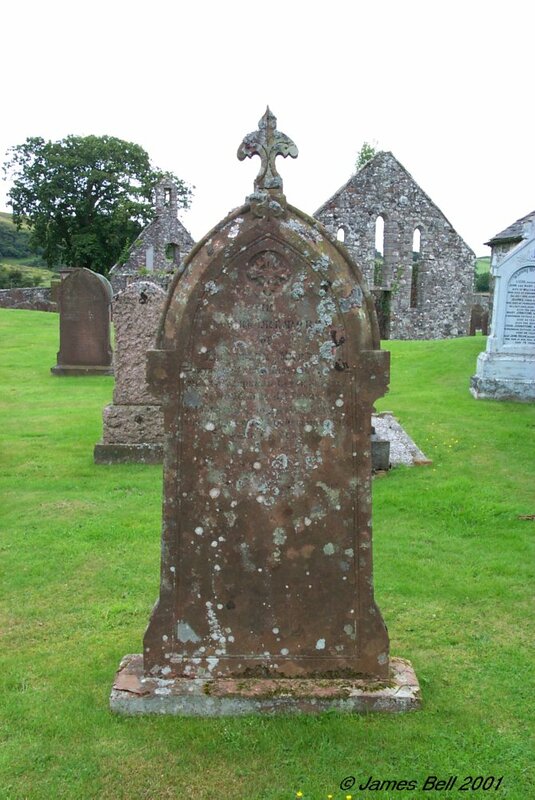 Also Mary Gillespie, his grand-daughter who died at Dalbeattie 16th May, 1864, aged 2 3/4 years. 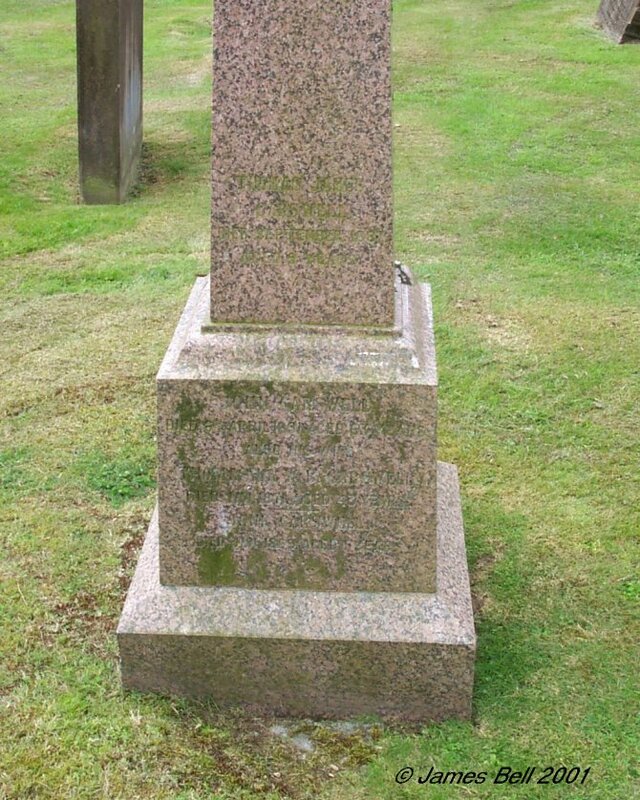 Also Mary, his daughter, widow of Charles Carson, who died at Castle Douglas, 18th August, 1887, aged 53 years. 26 In memory of Isabella Gillespie, beloved wife of Richard Taylor, who died at Craignair, 18th Dec'r 1861, aged 25 years. 27 Erected in memory of David Harper, who died at Corra, 19th Dec'r. 1881, aged 12 years. 28 This stone should have a top ridge stone, and it probably began "Erected in memory of"
John Robinson, who died at Partadown, Ireland, on the 26th Oct'r. 1865, aged 61 years. Also Marion Muirhead, his wife who died at Barchain, on 21st April 1880, aged 69 years. Also Eliza Muirhead, who died at Barchain, on the 17th May 1884, aged 69 years. Also George Muirhead, who died at Barlays, Colvend, on the 16th April, 1888, aged 84 years. Also George Robinson, who died at Palnackie, 27th March, 1919, aged 72 years. 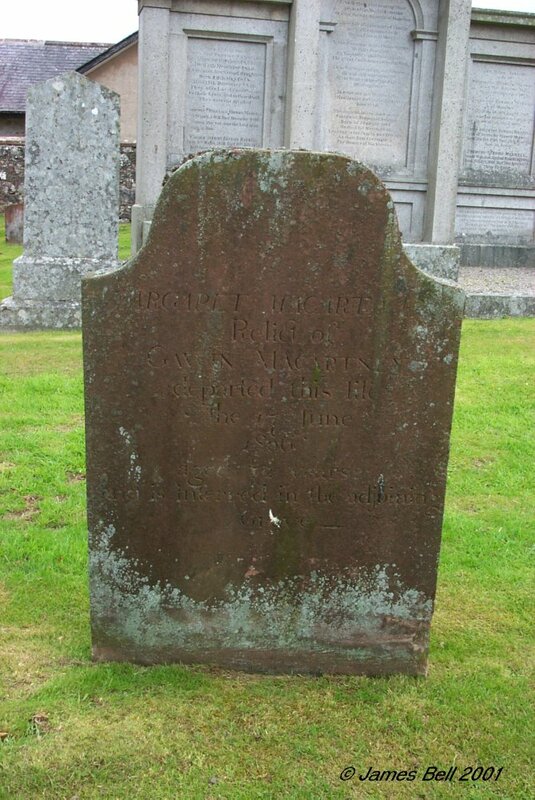 Margaret Robinson, daughter of the above John Robinson, died at Castle Douglas, 4th July, 1924, aged 79 years. 29 In memory of Sarah, seventh daughter of David Porter who died at Guffogland, 2nd February 1880 aged 4 months. David, his fouth son, who died at Guffogland 8th January, 1889, aged 19 years and 9 months. Agnes, his third daughter who died at Guffogland, 17 January 1889, 15 years and 11 months. 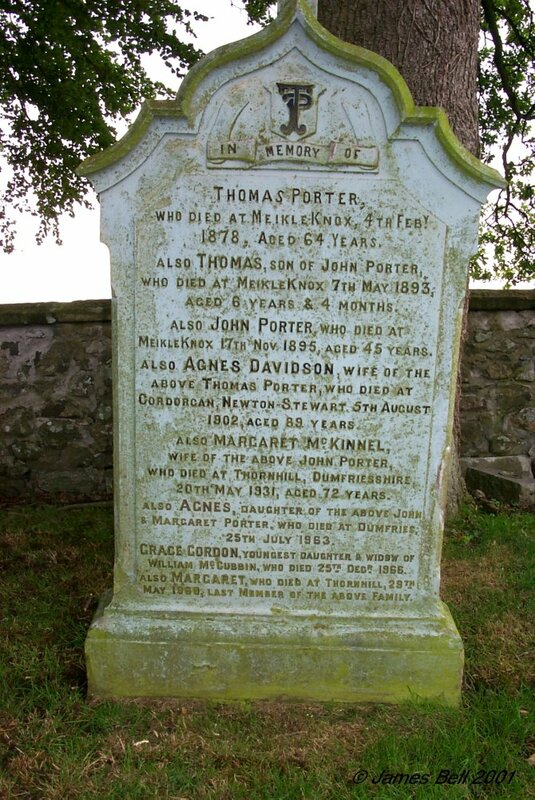 David Porter, the above named, who died at Auchencairn, 17th May 1922, aged 86 years. 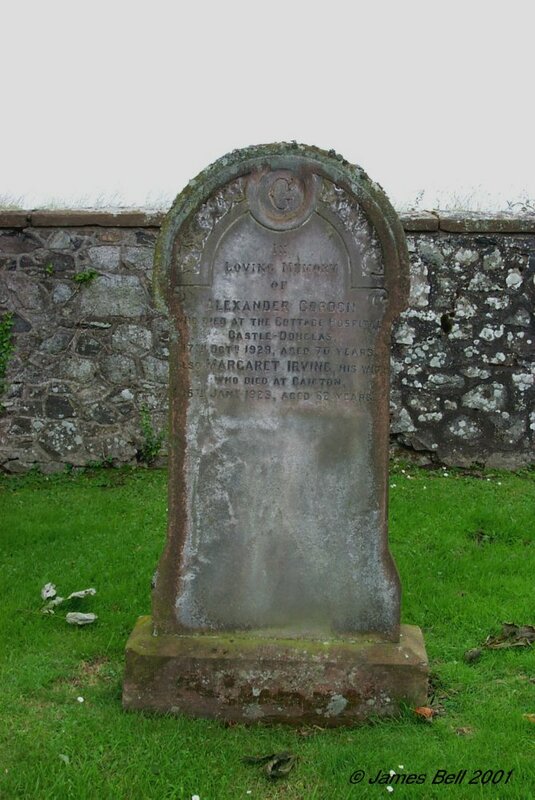 Janet Brydon Little, his wife, who died at Auchencairn 3rd Jan'y 1927, aged 92 years. 30 In loving memory of Margaret Porter, who died at Auchencairn, 2nd April 1926. 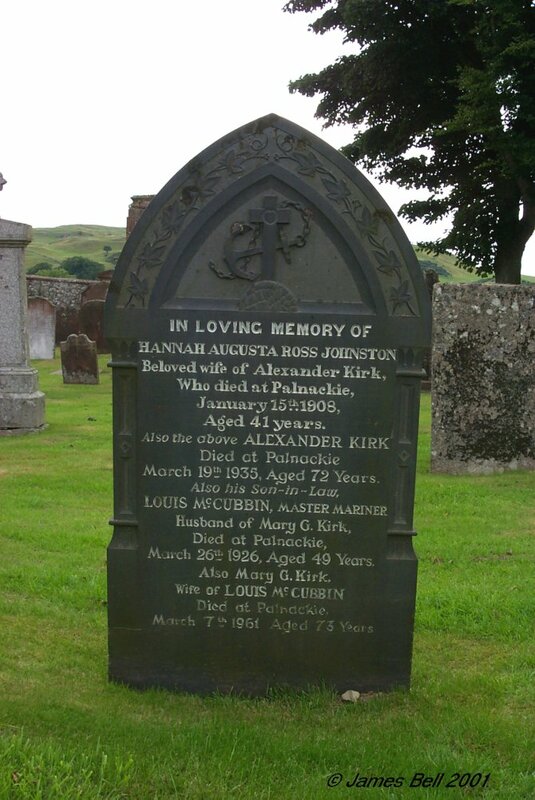 Mary, who died at Culkeist, 21st Nov'r 1932, Jane Dickson Porter, who died at Auchencairn 12th Nov. 1938. 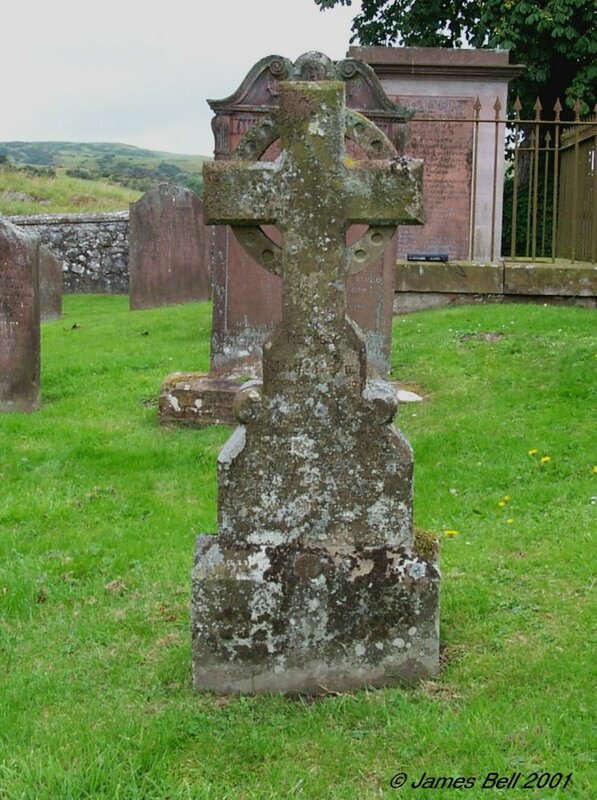 31 Erected by Robert Coskery in memory of Mary, his daughter, who died at Kirk-marrion 17th Dec. MDCCCXXXII aged 1 year and seven months. Also the said Robert Coskery who died 8th January 1860, aged 67 years. Also Grace McGowan, his spouse who died at Crossmichael Village, on 1st December 1862, aged 75 years. 33 Erected by John Rain and Agnes Martin, in memory of John Rain, their son, who died at Cuil, 14th April MDCCCLVI aged XII years. Margaret Christal Rain, their daughter, who died at Cuil, 11th January MDCCCLXVII, aged 24 years. The above Agnes Martin, who died at Cuil, 26th Dec. MDCCCLXXXII, aged LXXII years. The above John Rain, who died at Cuil, 1st Sept. MDCCCLXXXV, aged LXXXV years. Also the Rev. Thomas Rain M.A. 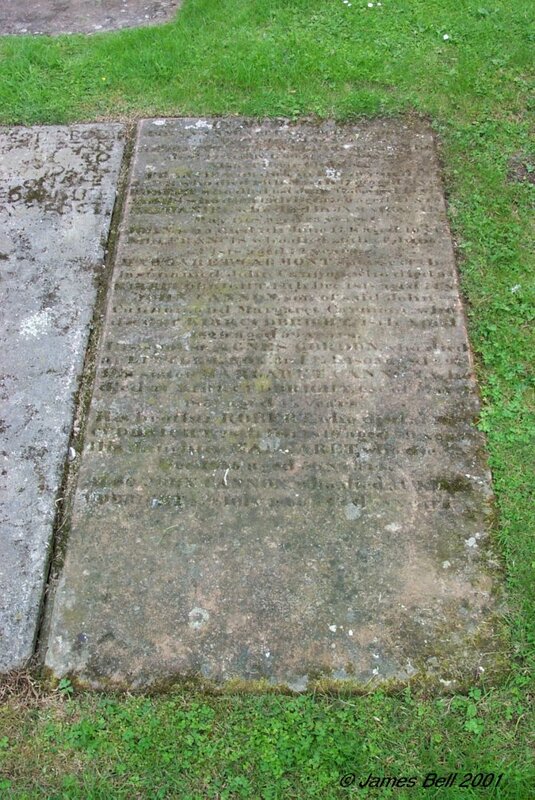 their son, minister of Hutton and Corrie, Dumfriesshire, who died Kings Kerswell, Devonshire, 1st May MDCCCCV, aged LX years. 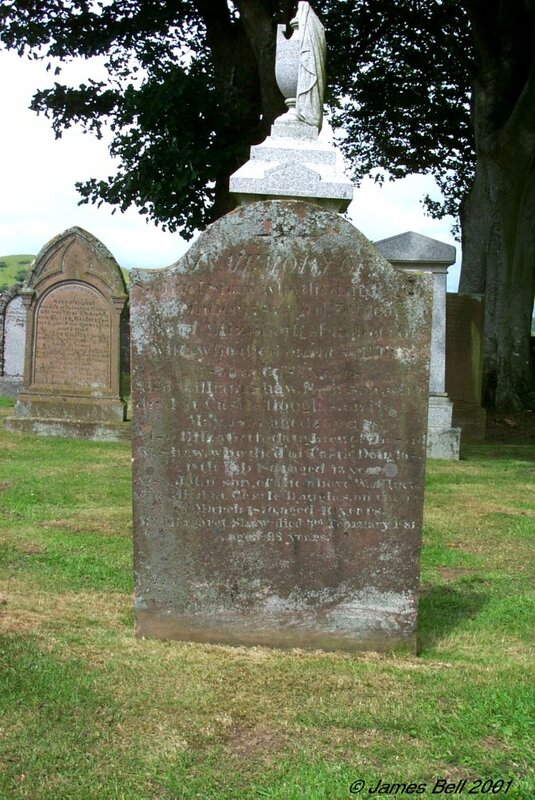 Also of James Rain, youngest son of the above John Rain, who died at the Villa, Castle Douglas, 24th April MCMXIX, aged LXVII and buried in the cemetery there. 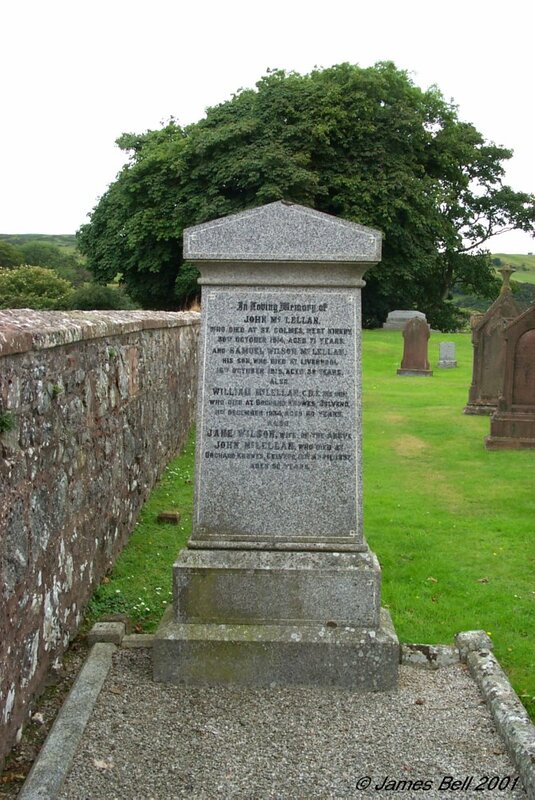 Also Agnes Rain, second daighter of the above John Rain, who died at the Villa, Castle Douglas, 19th Dec. MCMXXI, aged LXXIII years, also interred in Castle Douglas cemetery. 34 In memory of Janet Ross, wife of John McClymont, who died at Barlochan, 29th June, 1888, aged 43 years. 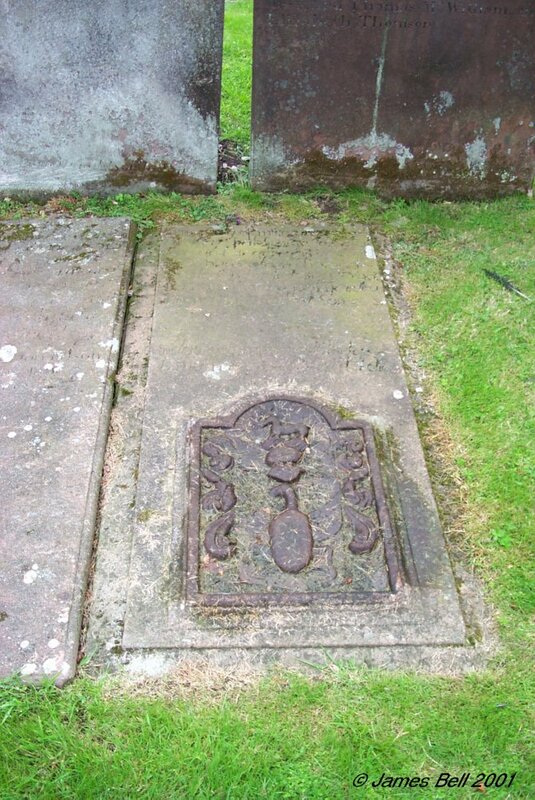 Also of John McClymont, who died at Barlochan, 6th August 1900, aged 58 years. 35 Sacred to the memory of James Cowan, who died at Palnackie, on the 29th of July, 1850, aged 83 years. 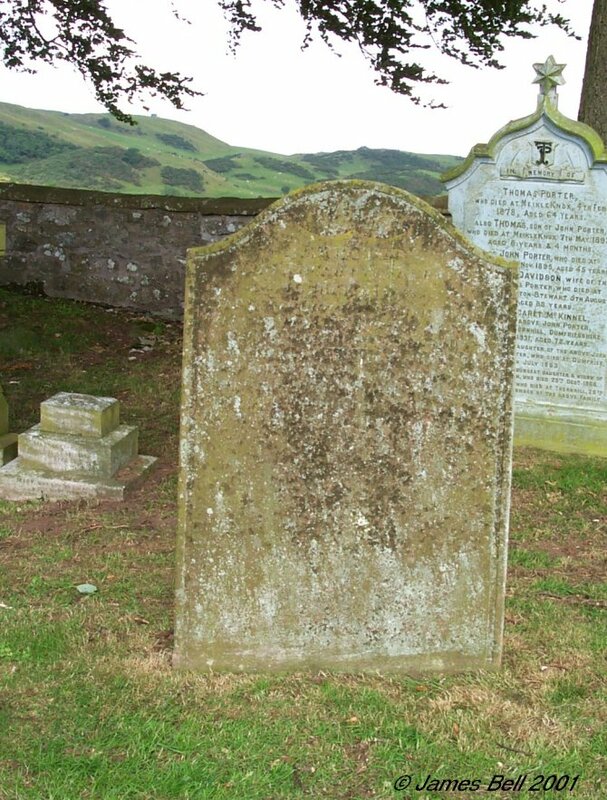 Agnes McKnight, his spouse, who died on the 17th of March, 1843, aged 78 years. 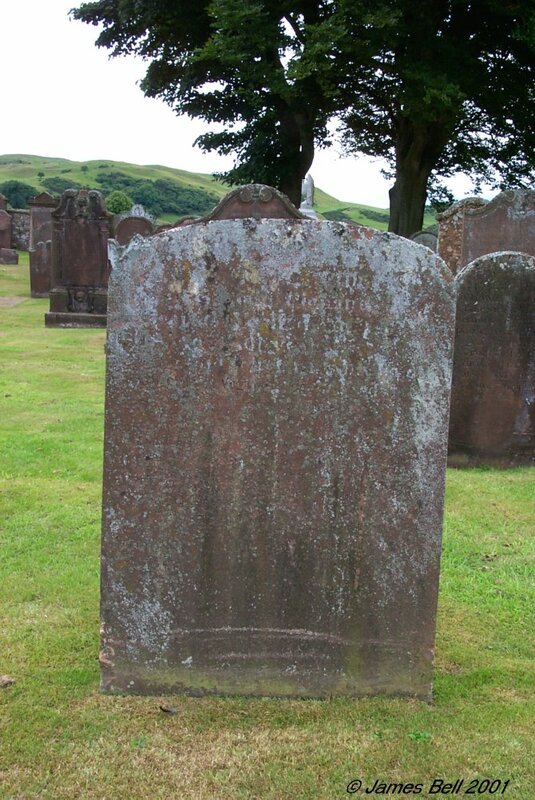 Janet McKnight, who died at Dalbeattie, 25th June 1859, aged 67 years. 36 In memory of Janet McGill, who died 25th January, 1830, in the 78th year of her age. Erected by Joseph Coltart, her nephew. 37 This early stone is very badly worn. It seems to begin as below but is generally illegible. 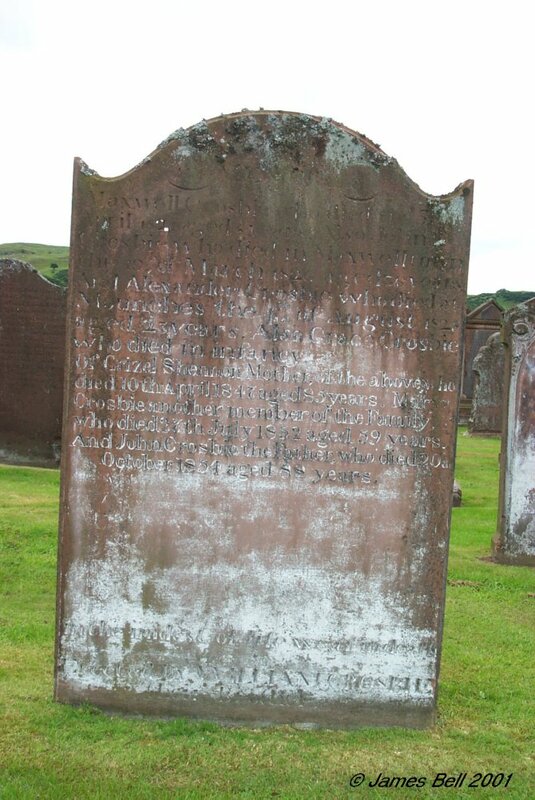 38 In memory of John McKeuen of Glenshinnoch, who died June 1746, aged 70 years. Also Mary Caven, his spouse, who died 5th April 1768, aged 78 years. And of their children, of Ann McKeuen, who died June 1741, aged 17 years, Mary McKeuen, who died Nov. the 20th 1784, aged 60. Samuel McKeuen, who died March the 8th 1791, aged 70 years. 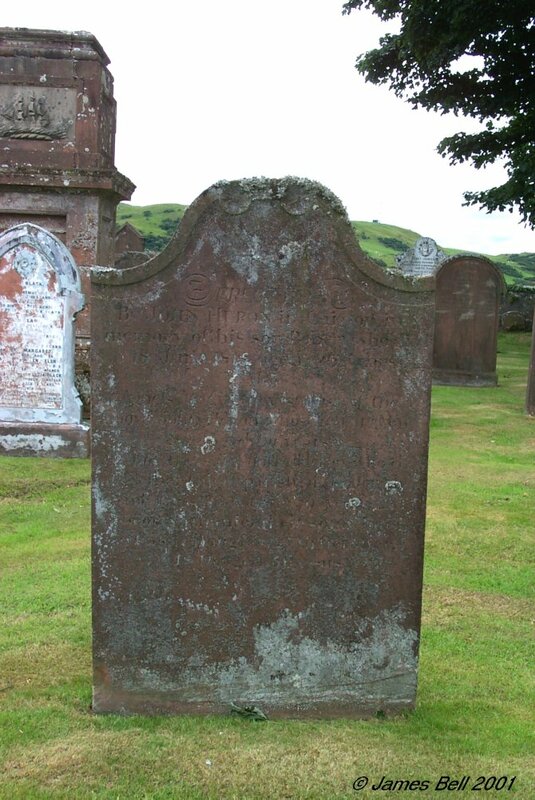 Also John McKeun, who died Jan. 7th 1797, aged 68 years. 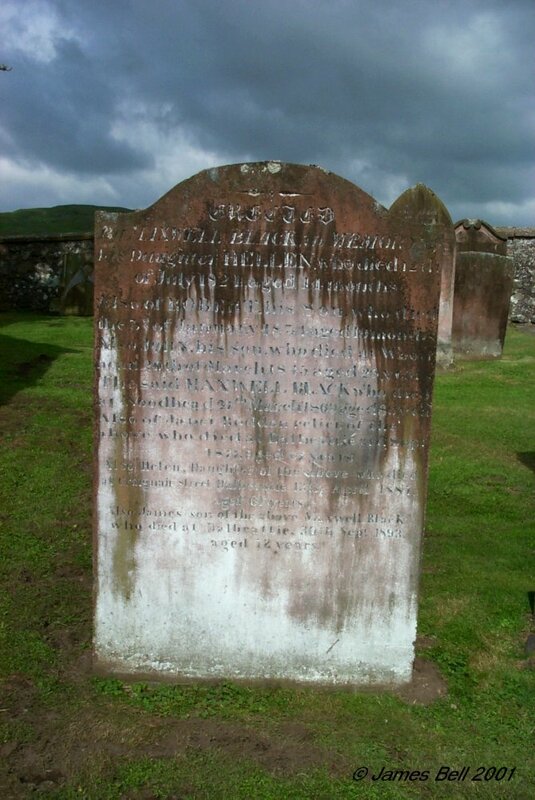 And of William McKeun, who died April 3rd 1812, aged 80 years. Also of Robert Duke, who died 18th Feb 1824, aged 76 years. 39 Sacred to the memory of Margaret Riddick who died in Palnackie, 1836, aged 19 years. John Riddick, her father, who died at Palnackie, 10th August, 1843, aged 60 years. Helen Black, his wife, who died at Palnackie on the 22nd April, 1866, aged 76 years. Also Elizabeth their daughter who died on the 3rd of February 1866, aged 43 years. 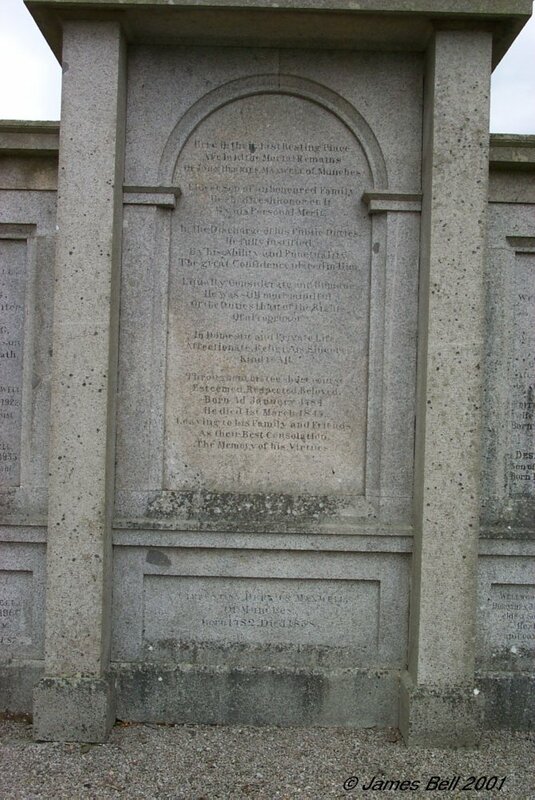 40 Erected by Maxwell Black in memory of his daughter Hellen, who died 12th of July 1824, aged 14 months. Also of Robert, his son, who died the 3rd of January 1834, aged 19 months. Also John, his son, who died at Woodhead 20th of March 1845, aged 25 years. The said Maxwell Black who died at Woodhead 27th March 1869, aged 80 years. 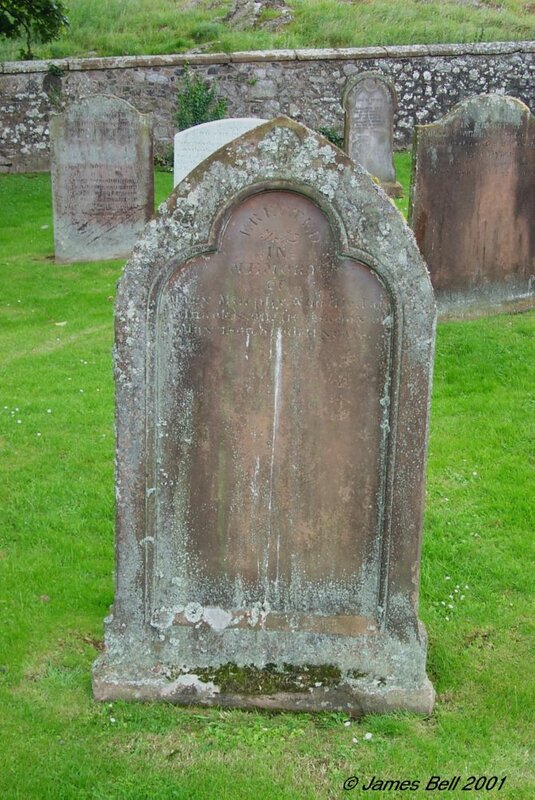 Also of Janet Bodden, relict of the above who died at Dalbeattie, 3rd Sept. 1877, aged 87 years. 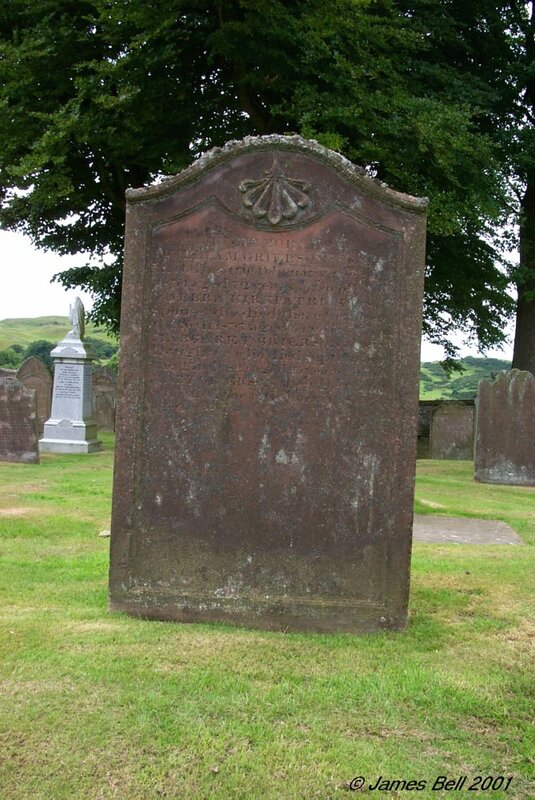 Also Helen, daughter of the above, who died at Craignair Street, Dalbeattie, 13th April, 1887, aged 61 years. 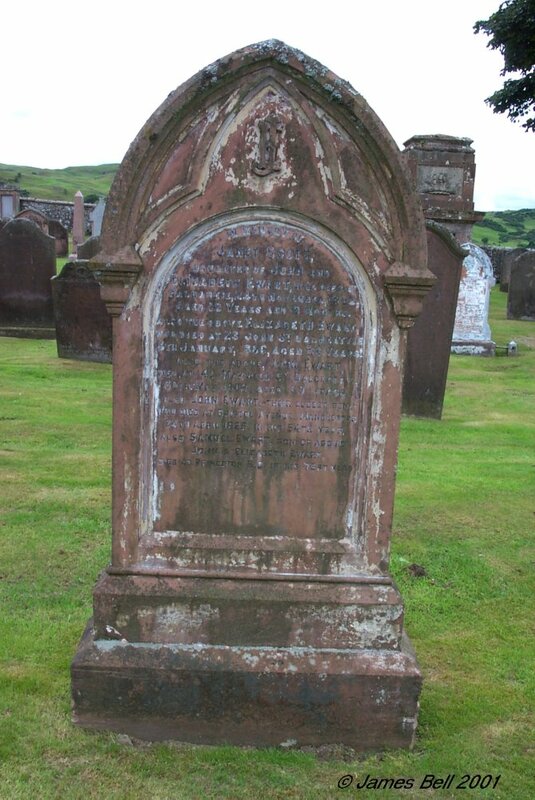 Also James, son of the above Maxwell Black, who died at Dalbeattie 30th Sept. 1893, aged 72 years. 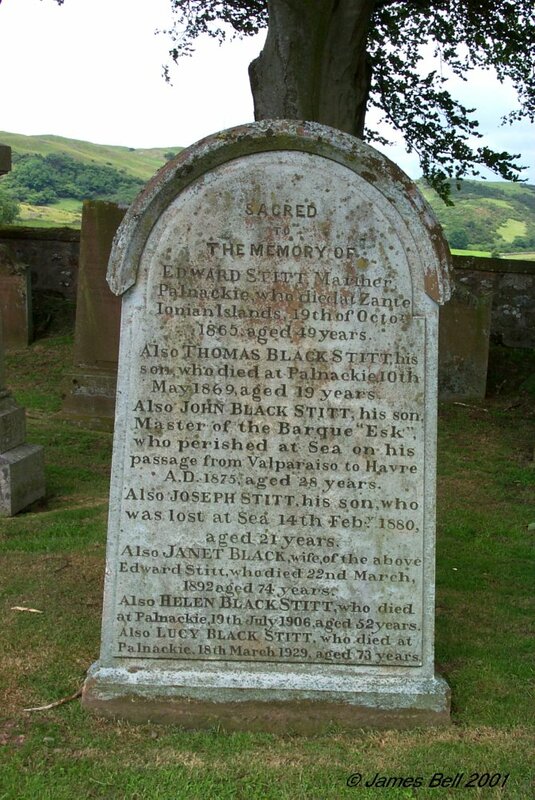 41 Sacred to the memory of James Black, who died at Woodhead, Parish of Buittle, 24th December 1814, aged 69 years. Margaret Black, his daughter, who died 26th October 1826, aged 33 years. Grizzel Graham, his wife, who died 17th December 1836, aged 83 years. William Black, his son, who died 20th January 1844, aged 64 years. "Believe in the resurrection of the dead and in the cross of Christ." This stone was erected as a token of respect by James Black Sen'r of Buenos Aires. 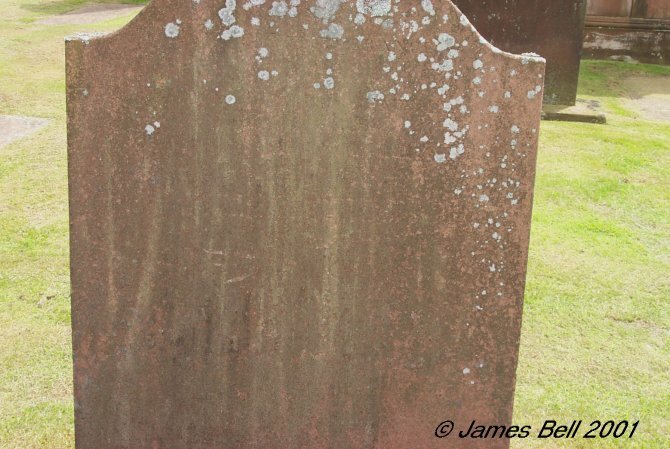 42 Here ly the remains of James Black, who died in Almerness, August 29th 1761, aged 50 years. 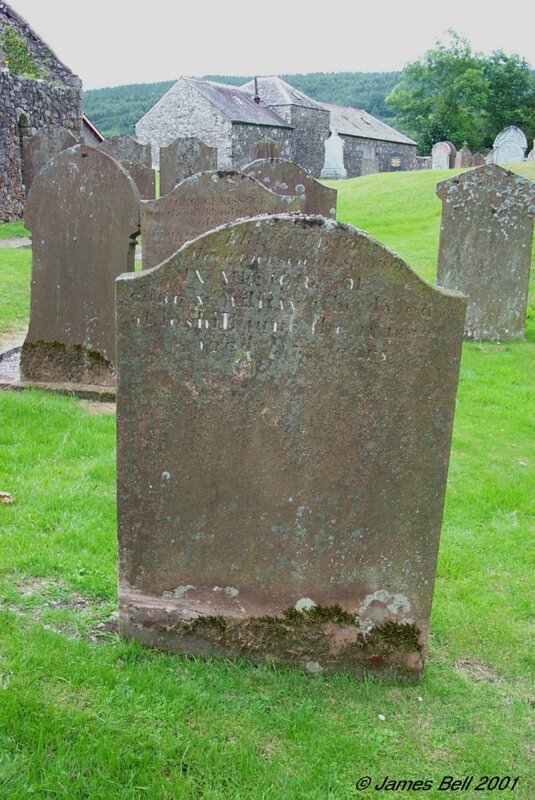 Also Jannet Wilson, his wife, who died July 25th 1778, aged 71 years. 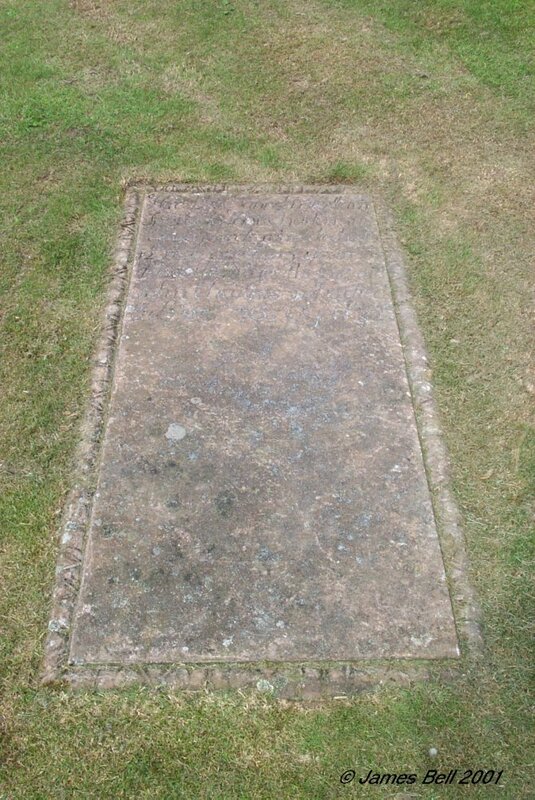 Also the remains of Mary Turner, wife to Robert Black, who died June the 25th 1794, aged 52 years. 'And in a married life she proved a loving wife". 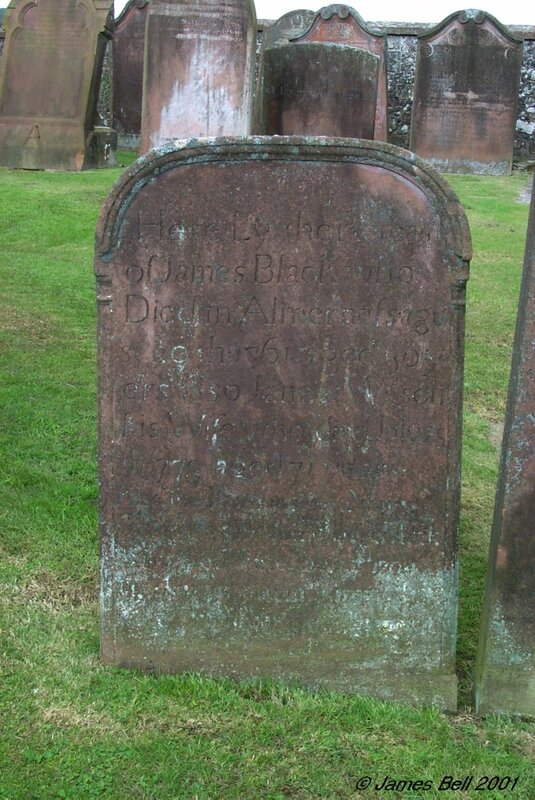 Reverse: Also Robert Black, who died July 18th 1798 aged 67 years. And of Isobel McMichan, spouse of John Black in Hole of Almerness, who died 8th Jan. 1820, aged 73 years. And Also Mary Black, spouse of the above John Black, who died 4th May 1821, aged 60 years. 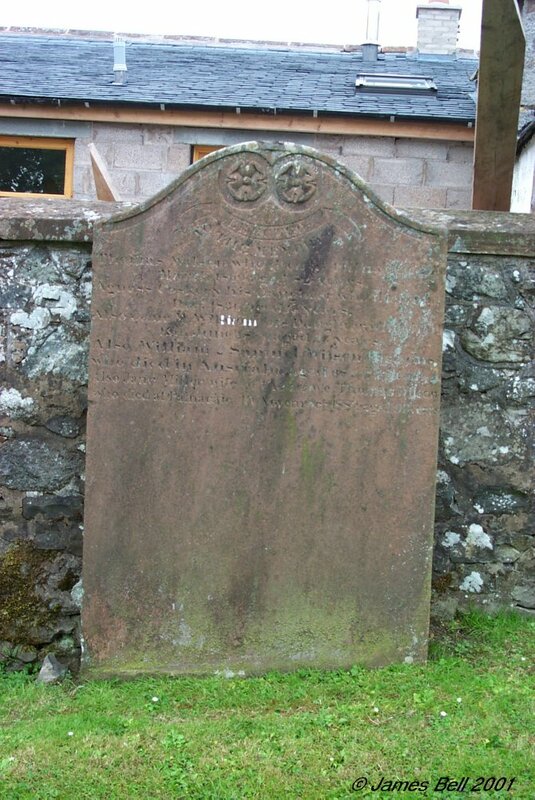 43 Erected to the memory of John Black, who died at Scriel, 7th Feb'y 1830, aged 88 years. 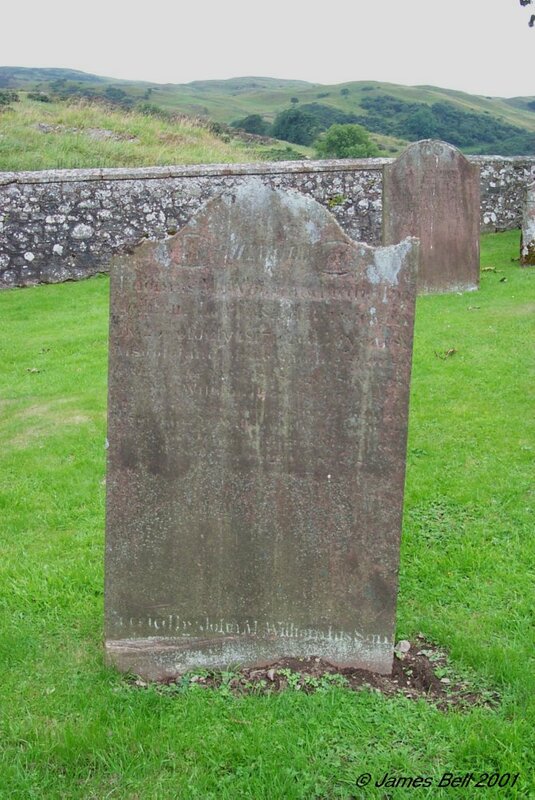 Also Isabella McMichan, his spouse, who died at Hole of Almorness, 8th Feb' 1820, aged 73 years. Also in memory of John Black who died at Palnackie 2nd December 1863, aged 72 years. Also Grace Black, his wife, who died at Palnackie, 20th April, 1863, aged 47 years. 44 Erected by George Black, late in Almorness, to the memory of Elizabeth Cairns, his wife, who died the 7th July, 1806, aged 76 years. 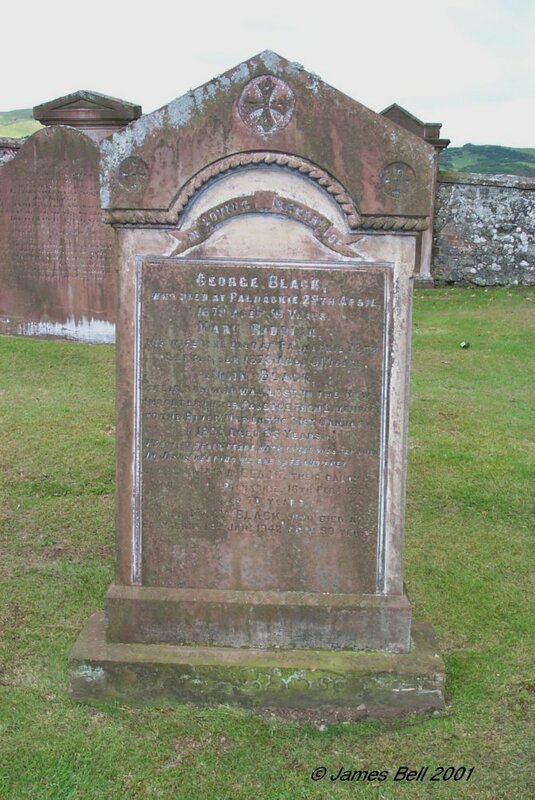 Also the said George Black, who died at Castle Douglas the 30th April 1825, aged 86 years. 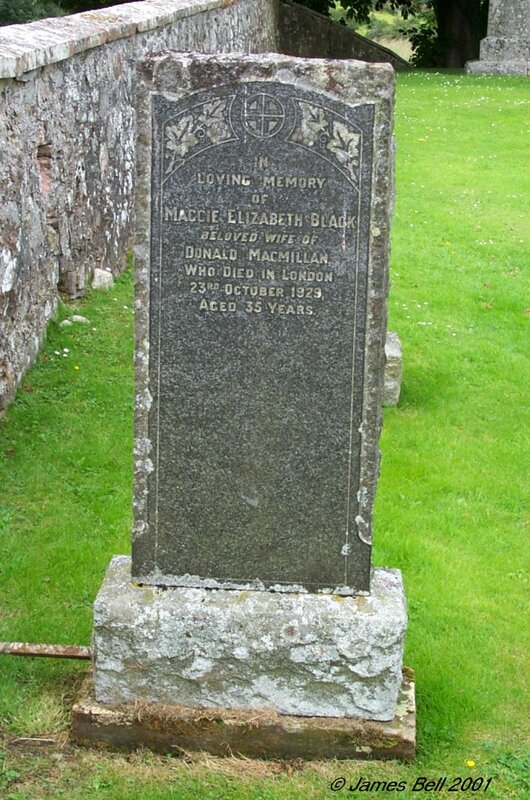 And of his daughter Margaret Black, who died at Castle Douglas, May the 19th, 1832, aged 19 years. Margaret Copland, her mother and second wife to George Black, who died at Castle Douglas, April the 30th, 1866, aged 84 years. And Elizabeth Cairns Black, daughter of the above George Black and Margaret Copland, who died at Castle Douglas, 29th April 1884, aged 79 years. 45 Erected by John Bodden, to the memory of Margret, his wife, and their children, Henrietta, Agnes, Robert, Mary and John Bodden. Henrietta, died the 5th Sept. 1792, aged 18 years. 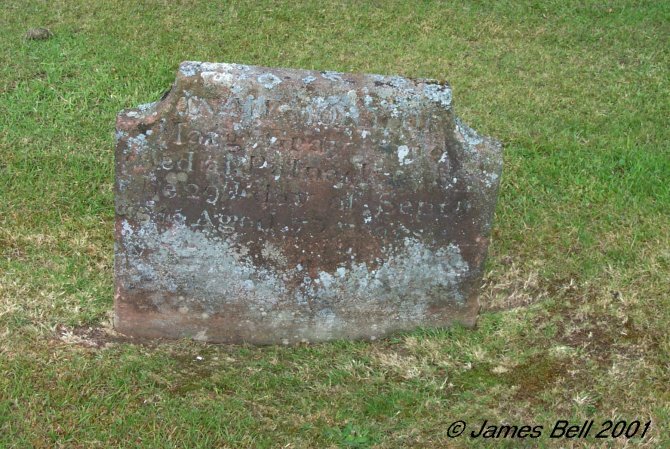 Agnes, died the 3rd July 1793, aged 11 years. Robert, died the 24th July, 1796, aged 26 years. Mary, died the 24th February, 1798, aged 14 years. 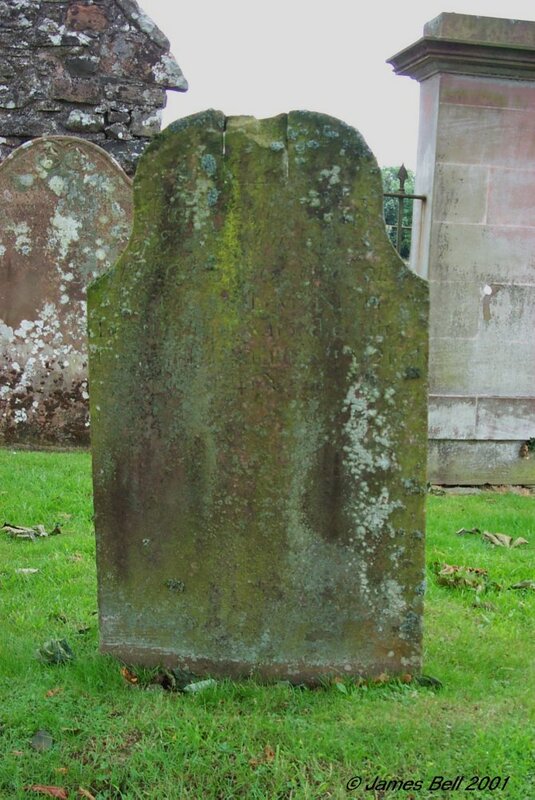 And John, died the 11th Sept. 1800, aged 6 years. 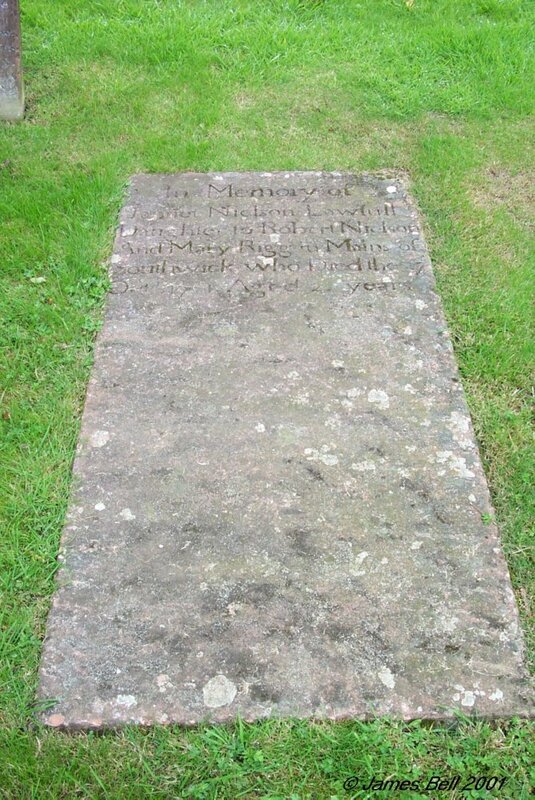 Also the above Margret Stewart, who died the 28th January, 1801, aged 50 years. Who all died Isle of Orchardton. 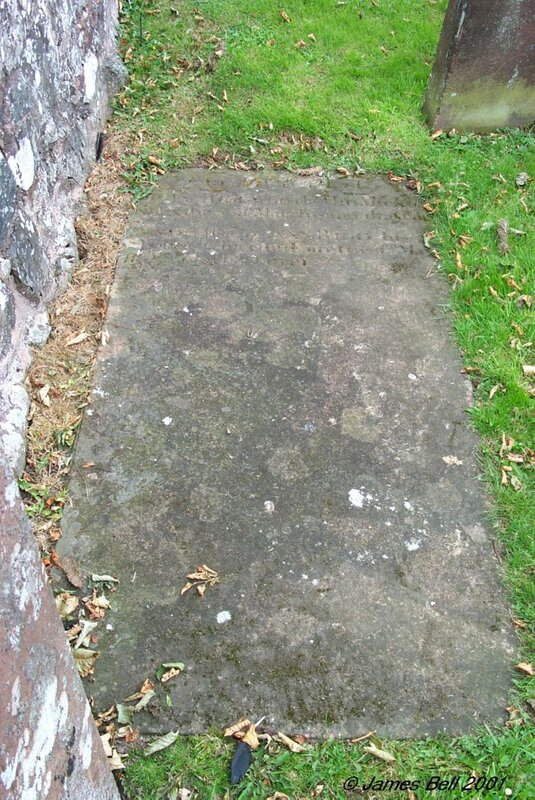 Also the above John Boddan, who died Blackbelly on the 30th of April 1830, aged 88 years. Also Helen Bodden who died Palnackie 16th of April 1862, aged 74. 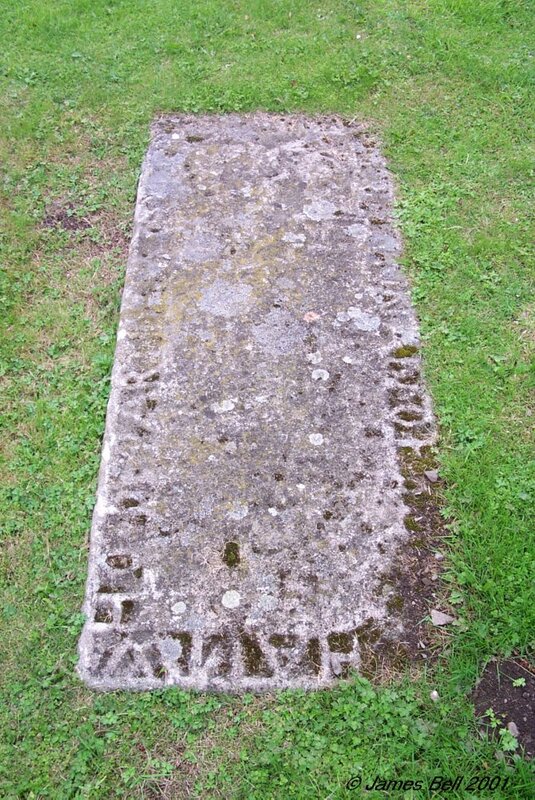 46 Here ly the remains of John Bodden in Almerness, who died June 21st 1768, aged 68 years. 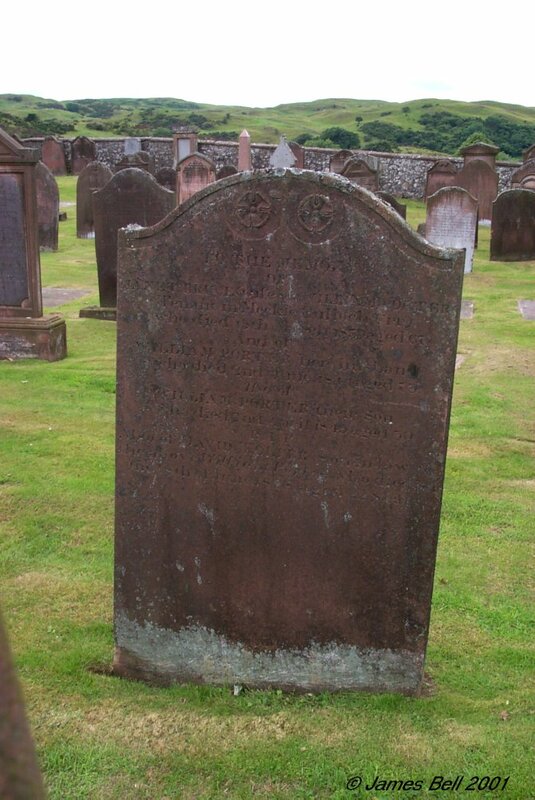 And Barbra Thomson, his wife who died April 4th 1778, aged 74 years. Reverse. In memory of William Bodden, son of Robert Bodden, in Palnackie, who died there, 11th April 1821, aged 21 years. And is interred here. 47 Erected in memory of William Thomson, late merchant in Palnackie, who died there the 26th Oct. 1818, aged 49 years. Also Janet Bodden, his spouse, who died at Douganhill Cottage, 25th March 1860, aged 79 years. Also Robert, their son, who died at Walsal, 31st Aug. 1826, aged 20 years. 48 Erected in memory of Robert Boddan, who died at Palnackie, the 6th November 1826, in the 92nd year of his age. Likewise William Boddan, his youngest son, who died at Palnackie, the 11th April 1821, aged 21 years. Also Helen McGill, wife of the above Robert Boddan, who died at Palnackie, the 17th of Nov'r 1841, aged 85 years. Margaret Boddan, their daughter, who died at Castle Douglas, 1st Dec'r 1862, aged 70 years. 49 Erected by Wm. 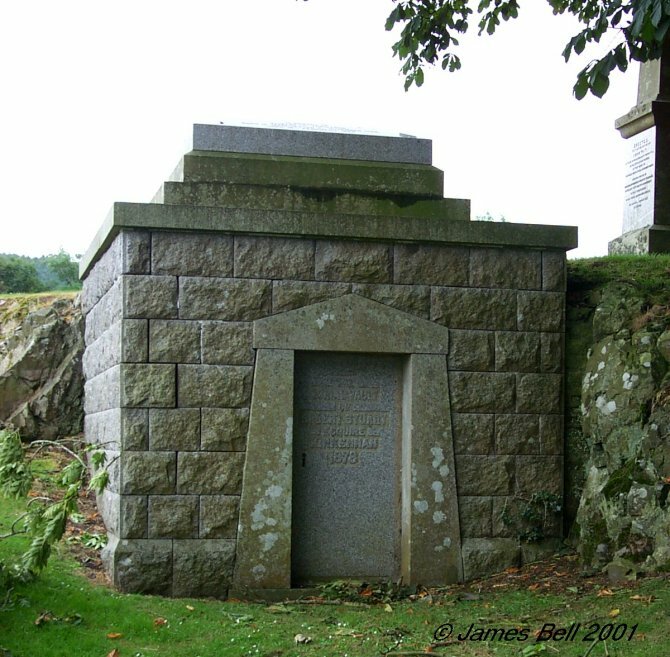 McLellan, to the memory of Margaret, his daughter, who died at Barlochan on the 17th Nov. 1856, in the eighth year of her age. Also William, his son, who perished at sea, Jan'y 1864, aged 19 years. 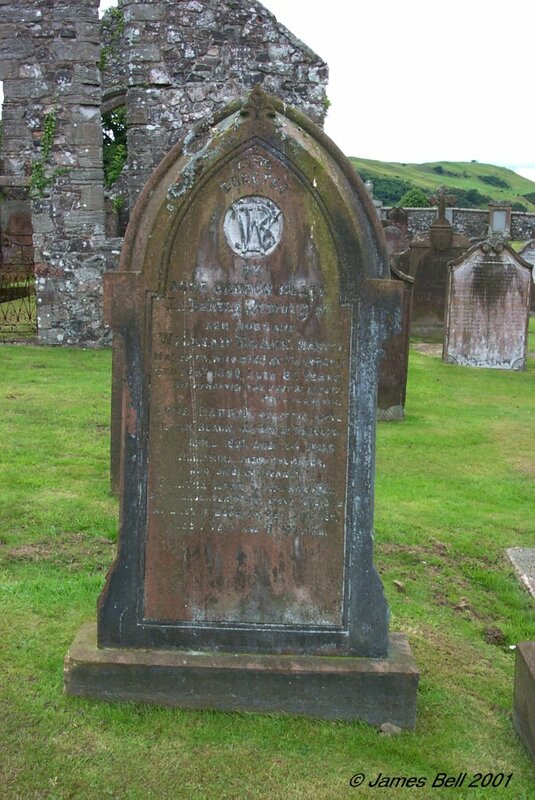 Also Mary Walker, his wife, who died at Barlochan, 17th of Sep. 1868, aged 57 years. 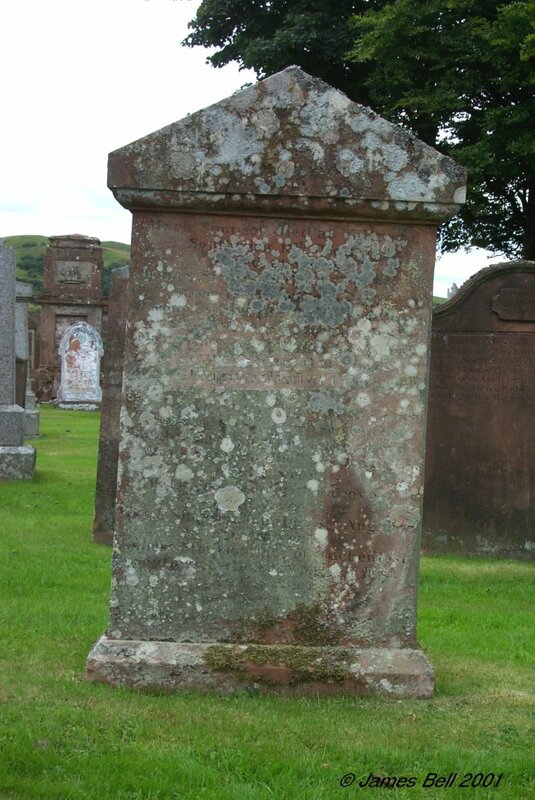 Also Elizabeth Lindsay, his second wife, who died at Barlochan, 3rd September 1874, aged 61 years. Also the abovementioned William McLellan, Master Mariner, who died at Palnackie on the 18th December, 1882, aged 68 years. Also Mary I. Payne, relict of the above, who died at Palnackie, 7th March 1895, aged 66 years. 50 Erected to the memory of Thomas Black Candlish, son of John Candlish, Palnackie, who died in infancy. Helen Wilson Candlish, his daughter, who died 5th November 1847, aged 9 years. Also James Welsh Candlish, his son, mariner, who died at Palnackie on the 16th of October, 1860, aged 28 years. Also the said John Candlish who died at Palnackie on the 12th of March 1869, aged 65 years. Also Lucia Lindsay Black, his spouse, who died at Palnackie, the 27th Aug't 1872, aged 62 years. 52 Erected by Mary Hornal. In loving memory of her father William Hornal, who died at Palnackie 1st January 1838, aged 30 years. Also her mother Sarah Hornal, who died at Palnackie, 20th March, 1898, aged 92 years. Also Mary Hornal, daughter of the above, who died at Warcop, Westmorland, 18th May 1912, aged 80 years. 53 In affectionate remembrance, of Robert Carswell, who died at Palnackie, 21st April, 1885, aged 60 years. William Carswell, eldest son of the above, who died at the schoolhouse, Canonbie, 21st April, 1898, aged 38 years. 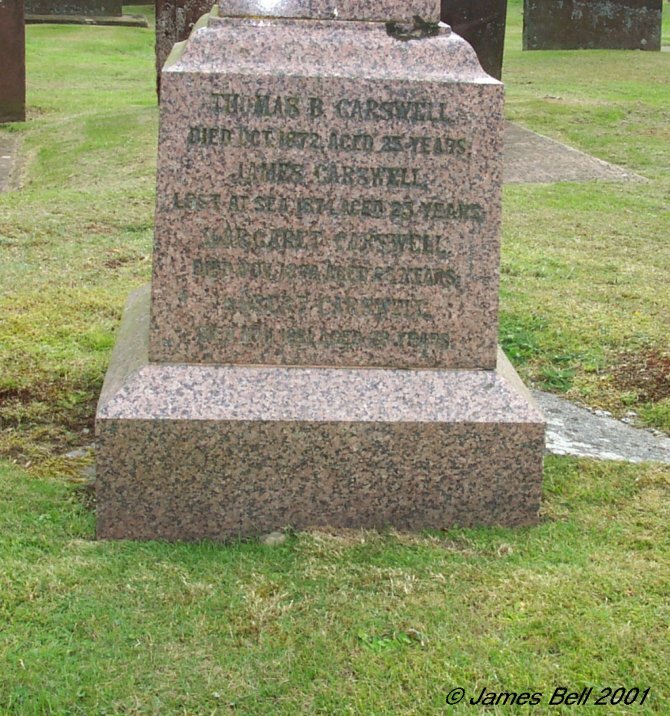 Dr. Robert Carswell, his third son, who died 20th July, 1906, aged 40 years. Jessie Carswell, wife of the above Robert Carswell, who died at Palnackie, 29th September 1912, aged 79 years. Violet Alexander, eldest daughter of the above Robert Carswell, died 18th Nov. 1928, aged 66 years. Samuel Carswell, youngest son of the above Robert Carswell, died Palnackie, 9th June 1933, aged 60 years. 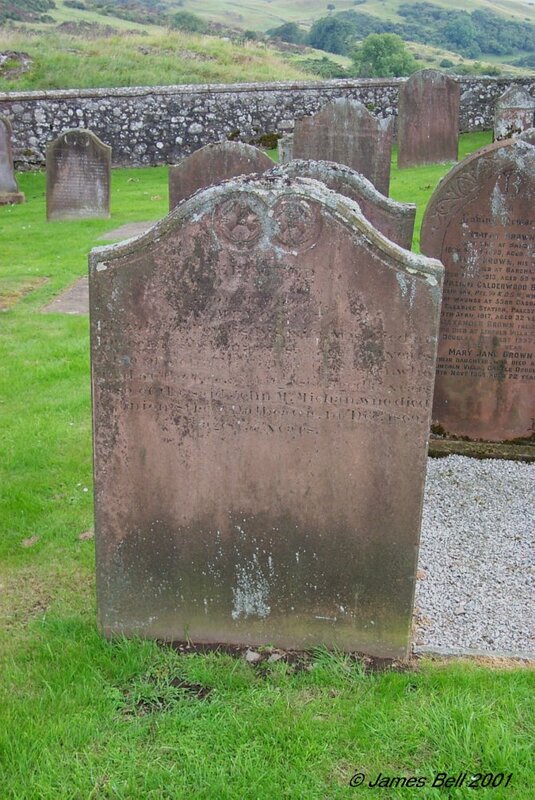 54 In memory of Jane Gilchrist, spouse to John Stewart, Builder, Dumfries, who died Milton, in this Parish, on the XXIX of Oct. MDCCCXXXII, aged LII years. Also William Gilchrist, who died at Milton of Buittle, 24th Sept'r 1849, aged 72. And Grace Clark, his niece, who died at the same place, 22nd May 1850, aged 22. Also Thomas Gilchrist, who died at Milton of Buittle, 28th November 1850, aged 75 years. 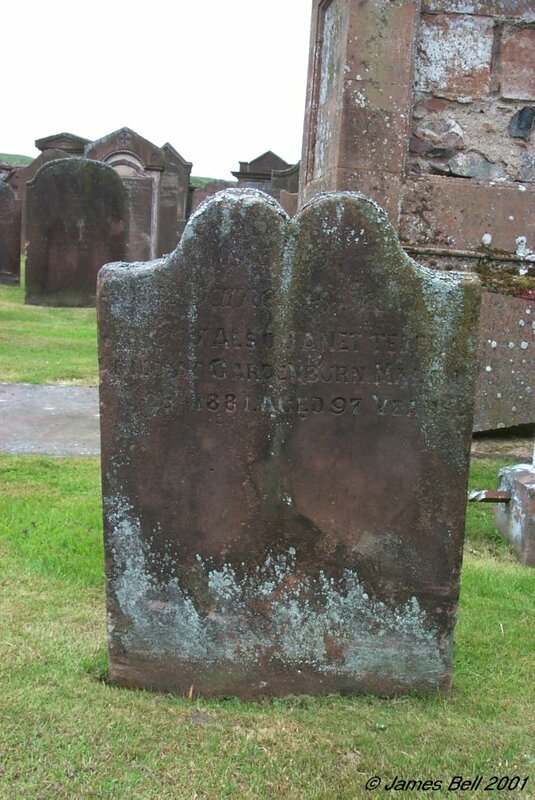 Also Janet Gilchrist, who died at Dalbeattie, 1st July, 1867, aged 88 years. 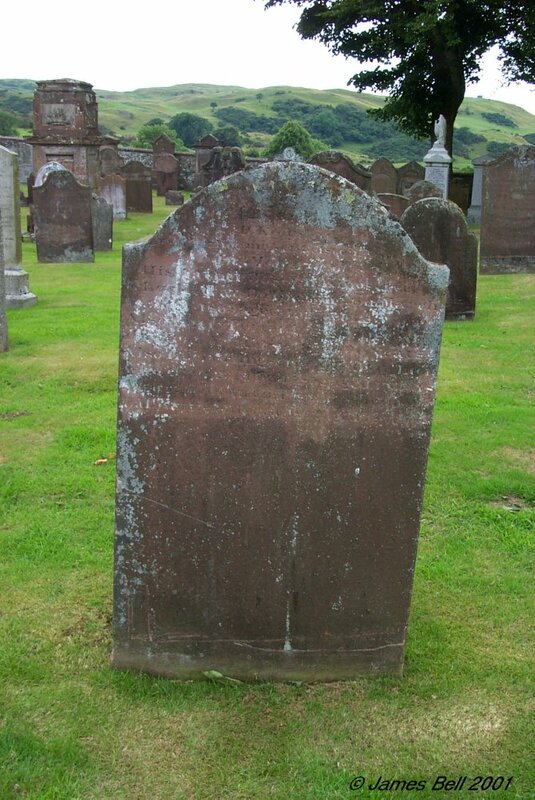 Reverse: Also Sarah Gilchrist, who died at Dalbeattie 20th Sep'r 1871, aged 88 years. Euphemia Gilchrist, who died at Dalbeattie 12th April 1973, aged 92 years. 55 In loving memory of Nathaniel Duke of Leaths and Margaret Gordon, his wife, and also Nathaniel Duke of Leaths, their son, who died Sep'r 19th 1791, aged 62 years. And Jane Agnew, his wife, who died March --th 177-, aged -- years. And of Nathaniel Duke, their son, who died Nov'r 3rd 177-, aged 17 years. 56 In loving memory of Mary Halliday, who died at Palnackie, 13th Dec. 1883, aged 1 year and 11 months. 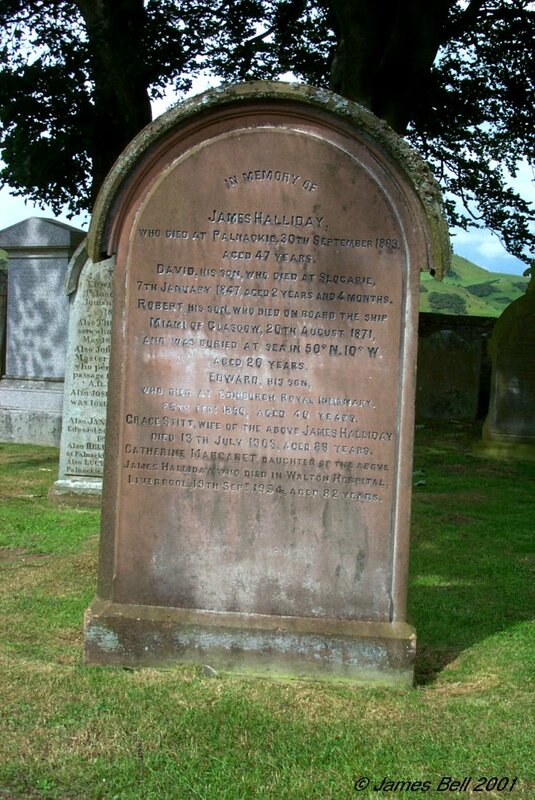 Also William Halliday, who died at same place, 18th May 1889, aged 2 years. Also John Halliday, who died at same place, 16th August 1894, aged 16 years. Also their father George Halliday, Wood Merchant, who died at Saw Mill Cottage, Palnackie, 29th September, 1905, aged 65 years. Also Georgina Lattimer, wife of George Halliday who died 28th June, 1929, aged 86 years. Jessie J Halliday, their daughter died 21st Jan'y 1969, aged 83 years. 57 In loving Memory of Janet Jamieson, wife of Charles Graham Halliday, who died at Holm of Almorness, 21st Feb'y 1884, aged 42 years. Andrew, their son, who died 13th Oct'r. 1878, aged 5 months. Also of Jessie, their daughter who died 17th October, 1905, aged 25 years. Also the said Charles G Halliday, who died at Drungans, Troqueer, 24th December 1908, aged 65 years. Also Jane Jamieson, their eldest daughter, and beloved wife of Andrew Ross, Glasgow, who died 30th Nov'r 1934, aged 69 years. 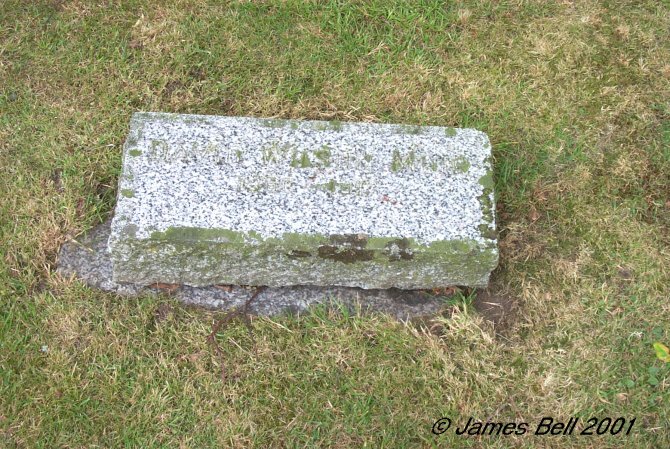 Also William Jamieson Halliday, their son, died at Vancouver, B.C. 7th Feb. 1955, in his 82nd year. Also their grandson William Charles Halliday, O. B. E., R. C. N. (Ret), master mariner, died at Vancouver, B. C., 7th March 1982, in his 76th year. 58 In loving memory of George Black, who died at Palnackie, 29th April, 1879, aged 56 years. Mary Riddick, his wife, who died at Palnackie, 13th September 1873, aged 51 years. John Black, their son, who was lost in the 'New Importer' on her passage from Liverpool to the River Urr, on 31st January 1891, aged 33 years. 'Peace perfect Peace, With loved ones far away, In Jesus keeping we are safe and they.' Also Georgina Black, their daughter, who died at Palnackie, 18th Feb'y 1931, aged 70 years. Also Mary Black, who died 12th Jan'y 1942, aged 90 years. 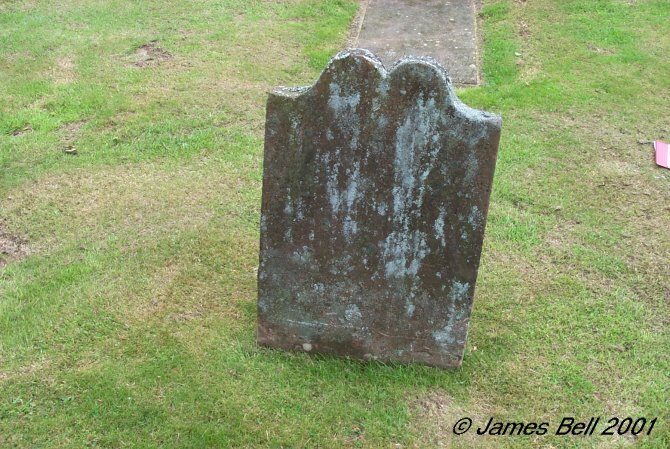 59 To the memory of James Anderson, Merchant in Buittle Parish who died May 16th 1771, aged 34 years. 60 In memory of Sarah Armstrong, who died at Buittle Place, on the 23rd January 1868, aged 1 year and 4 months. Also William Armstrong, her father who died at Buittle Place, the 15th Dec'r. 1869, aged 40 years. Also Wilhelmina, daughter of the above Wm. 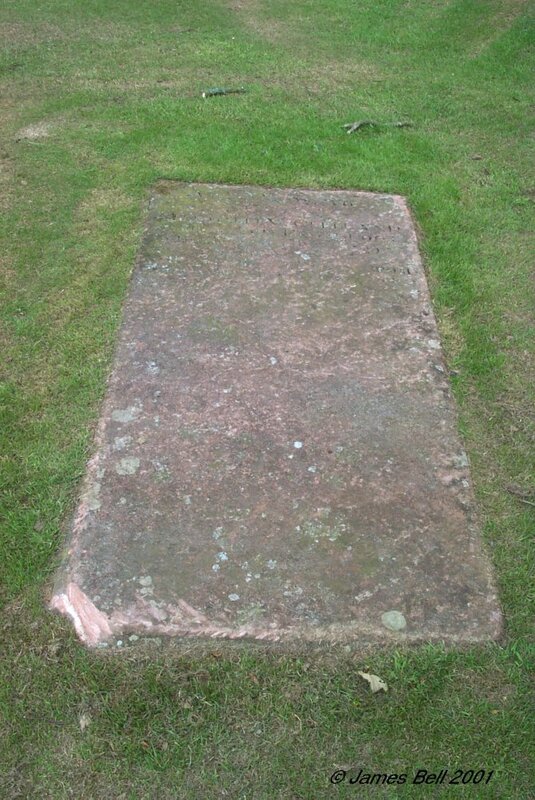 Armstrong, who died at Saughtree Cottage, Dumfries, 9th Oct'r. 1890, aged 20 years. Elizabeth Armstrong, wife of the above who died 1st June 1920, aged 84 years. 61 In memoriam, Elizabeth Corson, died at Palnackie, March 10 1881, aged 78 years. Elizabeth McMillan, wife of James Wilson, died Dec. 24th 1898, aged 65 years. 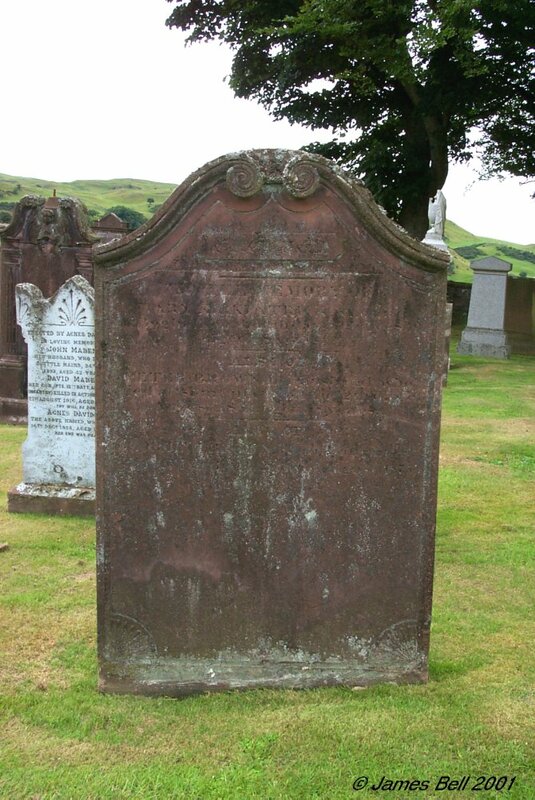 Irvine Hughes, grandson of the above, died Jan. 6 1887, aged 4 years. 62 (Erected) In memory of Agnes, eldest daughter of William Caird, Schoolmaster, Palnackie, who died 13th April 1877, aged nine years. The above William Caird, who died at Palnackie, 6th Nov. 1905, aged 72 years. Barbara Jane, his daughter, aged 28 and her husband John Murdoch, aged 29, master of the barque 'Craignair' who were lost at sea, in the year 1901. William, son of the above William Caird, and beloved husband of Lucia Crosbie, who died at Tain, 18th April, 1907, aged 39 years. Mary McLellan, widow of the above William Caird, who died at Palnackie, 17th October, 1913, aged 72 years. Also James Caird, elder son of the above William Caird, who died at Glasgow, 9th February, 1921, aged 55 years. 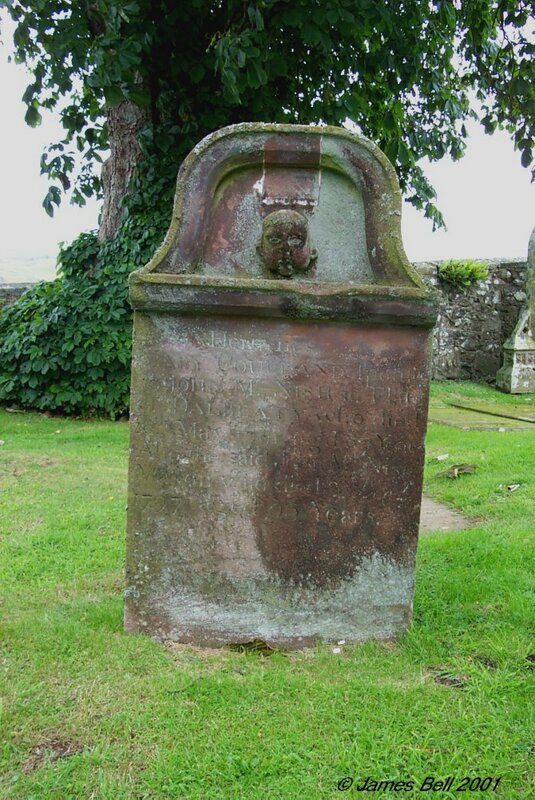 63 Erected by John Carson in Orchardton, in memory of his son Robert, who died there, 11th Jan. 1818 aged 16 years. And also in memory of the above John Carson, who died there 29th Dec. 1826, aged 69 years. Also William Carson, his son, chief mate of the barque 'Nailer', who died on the coast of Africa, on the 3rd May 1831, aged 27 years. Also Jane Carson, his daughter, who died on the 1st day of April, 1835, aged 19 years. Also David Carson, his brother, who died on the 8th day of May, 1838, aged 76 years. 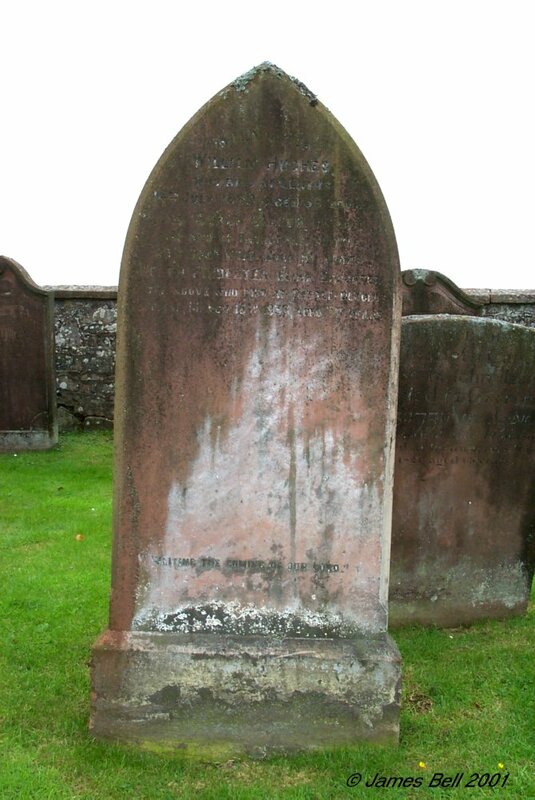 Also Jane Boddan, his relict, who died on the 17th day of Dec. 1846, aged 74 years. 64 In memory of Robert Scott, who died on the 3rd of Oct'r. 1829, aged 38 years. And Mary, his daughter, who died on the 10th of Feb'y. 1817, aged 2 years. And also Jane, his daughter, who died on the 6th March, 1817, aged 10 months. And of William, his son, who died at Creetown, 12th of Feb'y. 1835, aged 11 years. 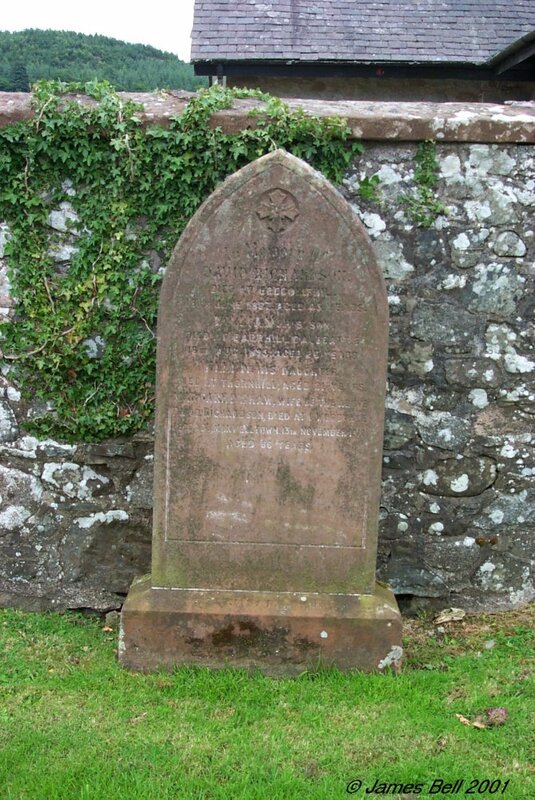 65 In memory of James McGregor who was drowned in the River Urr, near Almorness, 22nd Nov'r 1881, aged 21 years. "Boast not thyself of tomorrow." Also his mother Elizabeth Brown, of Palnackie, who died 3rd July, 1924, aged 89 years. 66 In memory of Margaret Lammie, wife of Captain Samuel Wilson, who died at Orchardton Mains, 7th July, 1892, aged 72 years. Charles, their son, who died at Palnackie, 25th May 1861, aged 1 year. The above Samuel Wilson, died at Orchardton Mains, 12th Dec. 1904, aged 97 years. William, his son, died 4th April, 1906, aged 63 years. Mary, daughter of the above Samuel Wilson, who died at Bow House, Palnackie, 6th June 1935, aged 78 years. Caroline, their daughter, who died at Bow House, 2nd Sept. 1953, aged 93 years. 67 Erected by David Clark, in memory of James, his son who died at North Glen on the 30th of March 1861, aged 29 years. Janet Kirk, his wife, who died at Palnackie, 11th October, 1881, aged 75 years. The above David Clark who died at Palnackie, 25th September 1882, aged 76 years. Thomas, his son, who died at Toronto, Canada, 24th January 1895, aged 57 years. 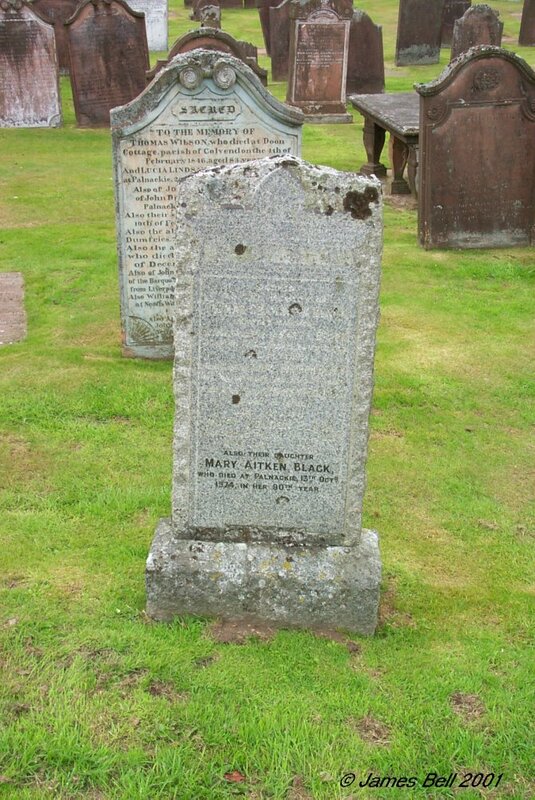 Mary, his daughter, who died at Dalbeattie, 24th December 1903, aged 57 years. John Clark, his son, who died at Hardhills, 23rd March 1918, aged 76 years. Also Andrew McEwan Clark, son of the above John Clark, who died at Niantic, R.I., U. S. A., 24th Nov. 1908, aged 39 years. Also Eliza McEwen, widow of the above John Clark, who died at Inglestonford Cottage, Newabbey, on the 11th June 1926, in her 82nd year. 68 There is no inscription on the front of this stone. Although a few words can be made out on the rear, I was unable to find a name. 70 Front: Mary Helen McKinnel, died in South Australia 16th August 1959, aged 85 years. In Memorium. Captain John Carswell, late of South American Steamship Company, Valparaiso, died 1st Sept. 1927, aged 65 years. Sadly missed. Left: James Henry, died 13th Dec. 1902, aged 47 years. Isabella Black Carswell, his wife, who died at Adelaide, Australia, 31st Jan'y 1938, aged 82 years. Helen W. Carswell, wife of Samuel Milby, died 28th Aug. 1910, aged 47 years. Elizabeth Henry, died 15th June 1891, aged 2 years. Thomasina B. Henry, died 17th April 1901, aged 13 years. Jessie Henry, wife of William Gordon, died 19th Nov. 1924, aged 39 years. Right: Thomas James Carswell, died September 1887, aged 9 years. John Carswell, died 8th April 1891, aged 63 years. Also his wife Thomasina W. B. Carswell, died Jan. 1871, aged 43 years. Jane Carswell, died Jan. 1869, aged 1 year. Rear: Thomas B. Carswell, died Oct. 1872 aged 25 years. James Carswell, lost at sea 1874, aged 23 years. Margaret Carswell, died Nov. 1874, aged 25 years. Robert Carswell, died Nov. 1881, aged 28 years. 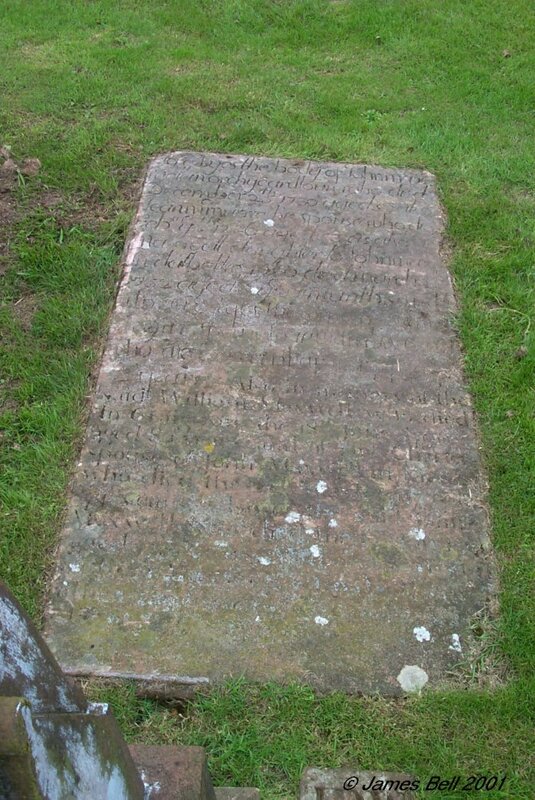 71 Here lyes the corpse of Jean Duff, who died May 27th 1764, aged 69, spouse to John Coupland in Muckle Leaths. 72 In memory of Sarah McKim, who died Aug't. 1768, aged 1 year. 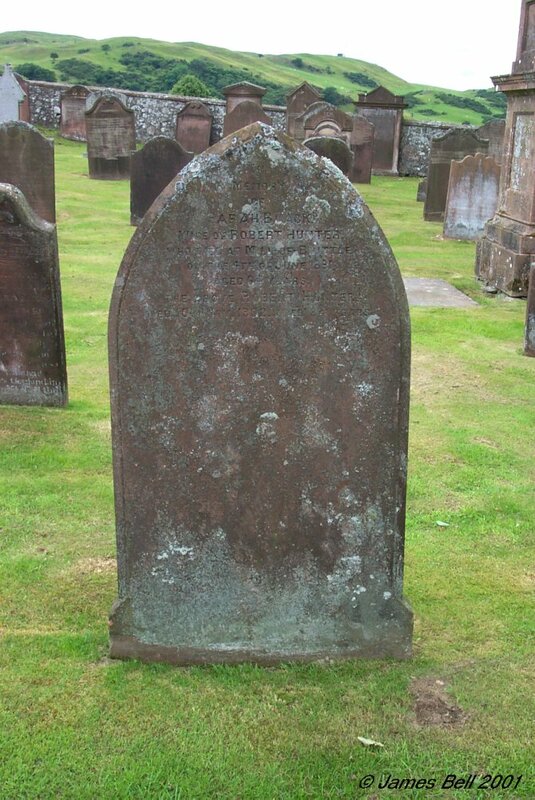 Also John McKim, who died Nov'r 1778, aged 13 months. Children to Robert McKim. 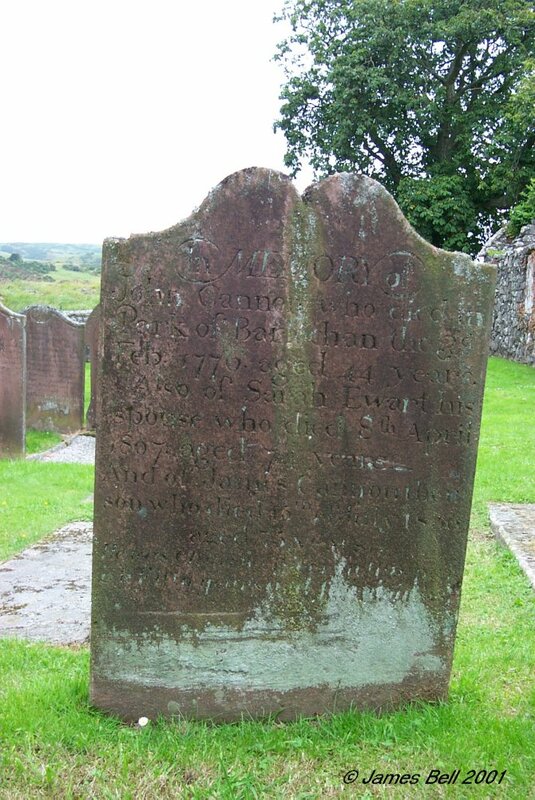 73 In memory of John Copland, who died at Camphill, Parish of Kirkgunzeon, 20th March, 1818, aged 69 years. Also of Elizabeth Roan, his wife who died the 6th of May 1841, aged 83 years. 74 In memory of Elizabeth, daughter of the late Charles Lace Esq'r. of Bellycribing (Isle of Man), and spouse of William Coupland, mariner. She died at Palnackie the 10th of Oct'r. 1812, aged 27 years. Also of the above William Coupland, who died at Palnackie, on the 9th day of June 1822, in his 44th year. 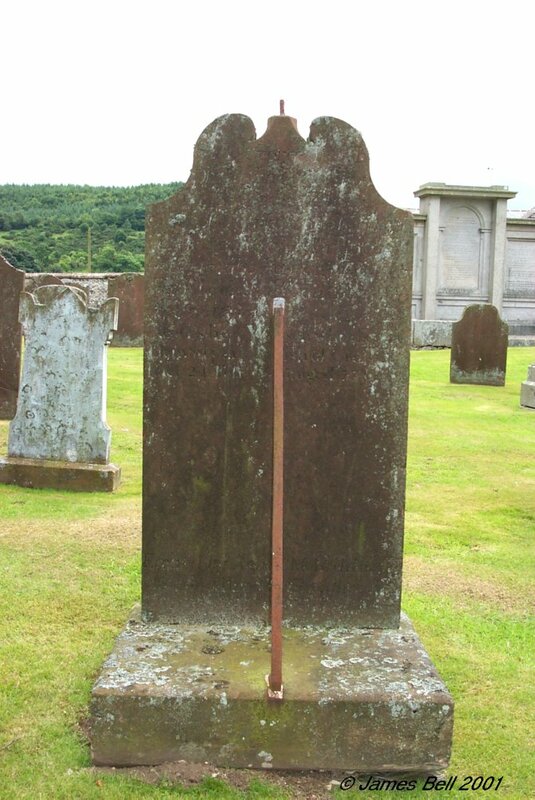 75 Erected to the memory of Robert Ewing, late in Clonyards, who died May 5th 1808, aged 67 years. Also of Isabel Copland, his spouse, who died on the 8th current, aged 63 years. 76 Here lyes James Coupland son to James Coupland, who died 3rd March 1752 aged 2 years. Also Elizabeth, his daughter, who died Oct'r. 7th 1762, aged 19yrs. 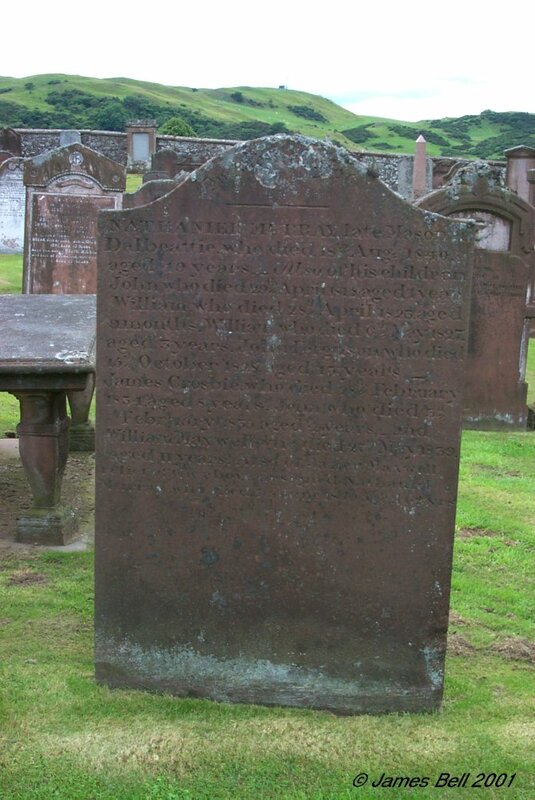 Also Janet Tait, his spouse, who died in Porterbelly, Oct. 9th 1777 aged 65 years. 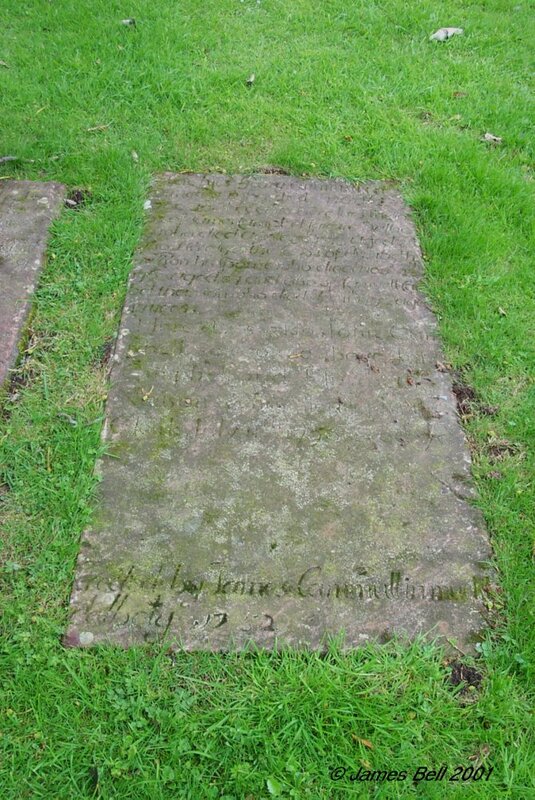 Also the said James Coupland, who died there Jan. 25th 1783, aged 68 years. 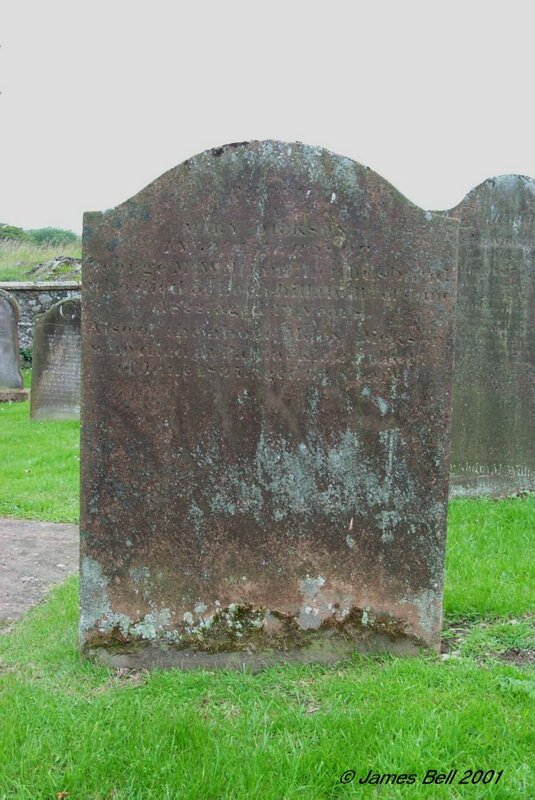 77 Here lyes the bodie of James Coupland, in Ceagton, who died November 10th 1746, aged 77 years. Also Jannet Coupland, his spouse who died May 1st 1748, aged 71 years. Samuel Coupland, late in Buittle Mains, their son, who died May 1st 1790 aged 83 years. Also of Mary Copland, his spouse, who died Sept. the 27th 1785, aged (blank) years. 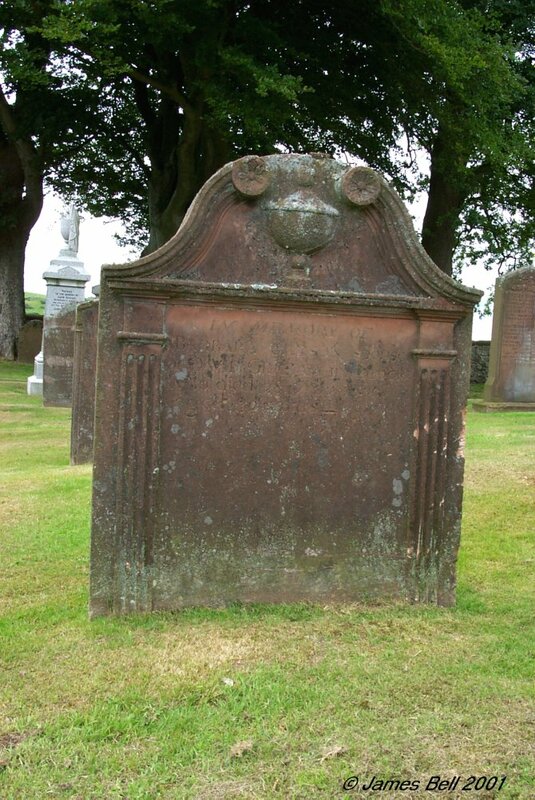 Also of William Copland, son to Samuel & Mary Coplands who died April 1st 1787, aged 19 years. 78 In loving memory of John Black, of the Barque 'Loch Dee' who was lost on a voyage from Lyttelton, New Zealand, in 1883, aged 33 years. "The sea shall give up its dead." 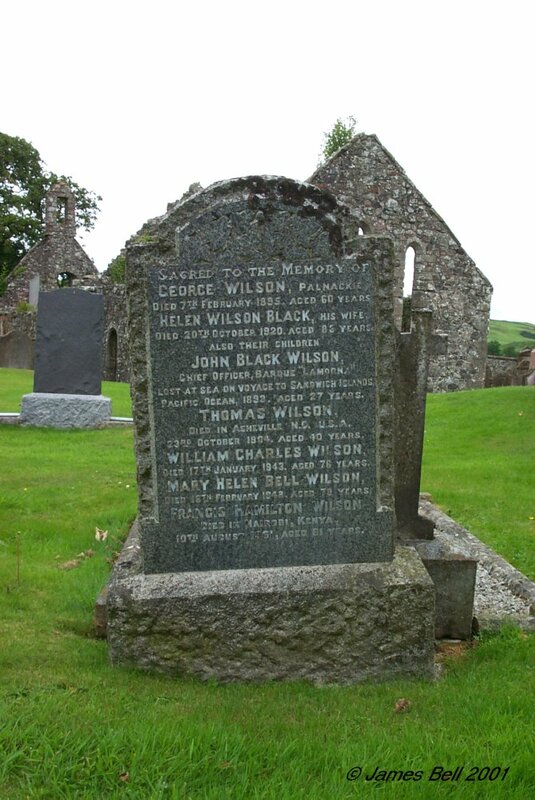 Also of Jane Grey and Thomas Wilson, children of the above John Black & Elizabeth Wilson, who died in infancy. John, eldest son of the above who died at Ottawa, Canada, 23rd May 1931, in his 57th year. 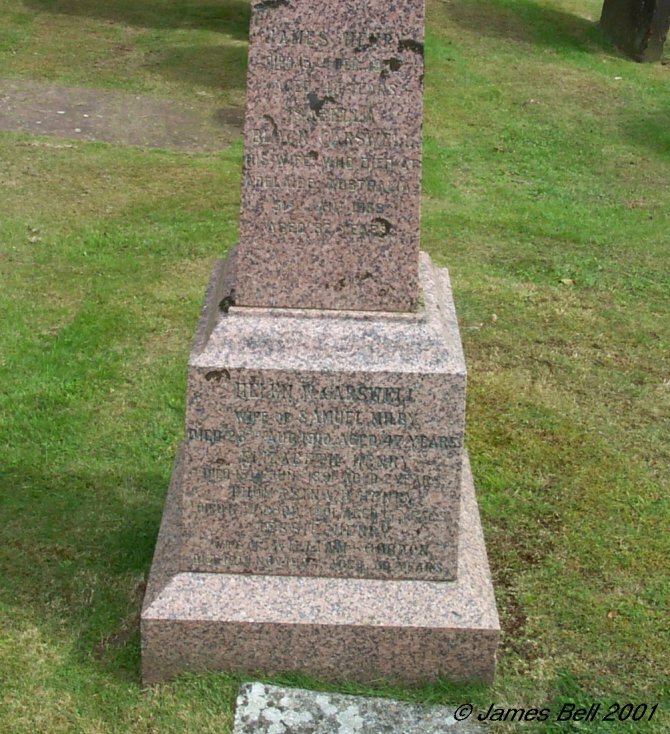 Also William Black, second son of the above died in Glasgow, 28th May 1934, aged 58 years. Also the above Elizabeth Wilson, died at Dalbeattie, 10th July 1934 aged 86 years. 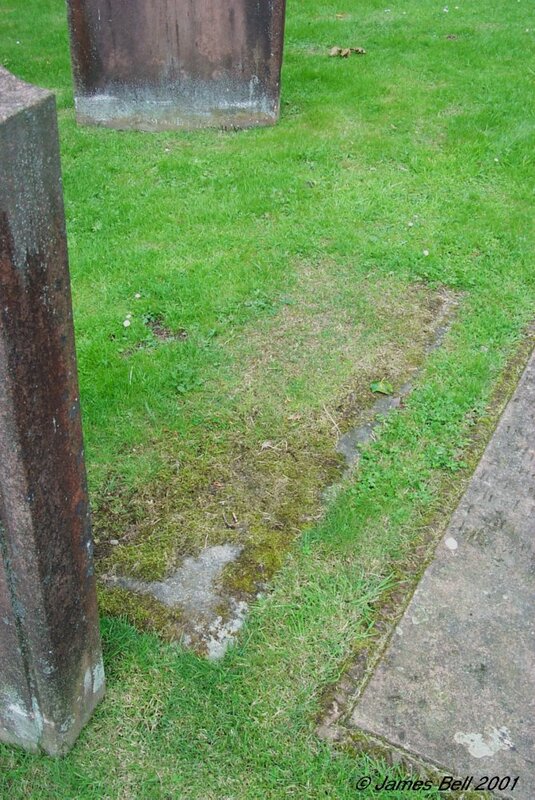 79 Here lyes the remains of Robert Thomson in Garden, who died theyear 17--, aged 68 years. Also Mary Carson, his spouse, who died the year 1767 aged 62. And William Thomson, their son who died 28th Jan. 1795, aged 62 years. Also Jannet Maxwell his spouse, who died --- 1796 aged --. Penelope Lindsay, spouse to William Thomson, who died 28th Dec. 1816 aged 67 years. 80 Two large pieces have broken off the rear of this stone, and parts of the inscription are missing. 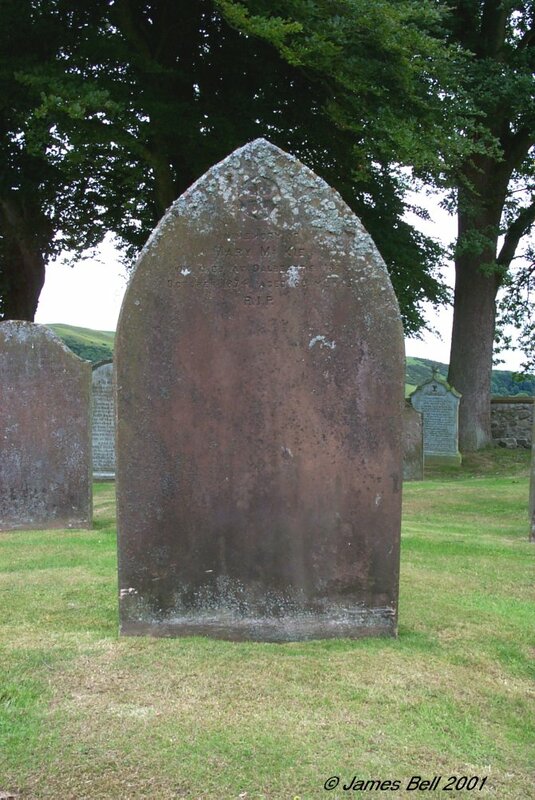 Rear: (Here lies the) body of --- Carson, who departed this life at Clone the 27th day of June 1757, aged 64 years. Also Helen Black who died the 10th day of Nov'r 1738, aged 49 years. And Mary Coupland, who died the 17th day of Dec'r. 1760, aged -- years. Erected by John & George Carson, their sons. 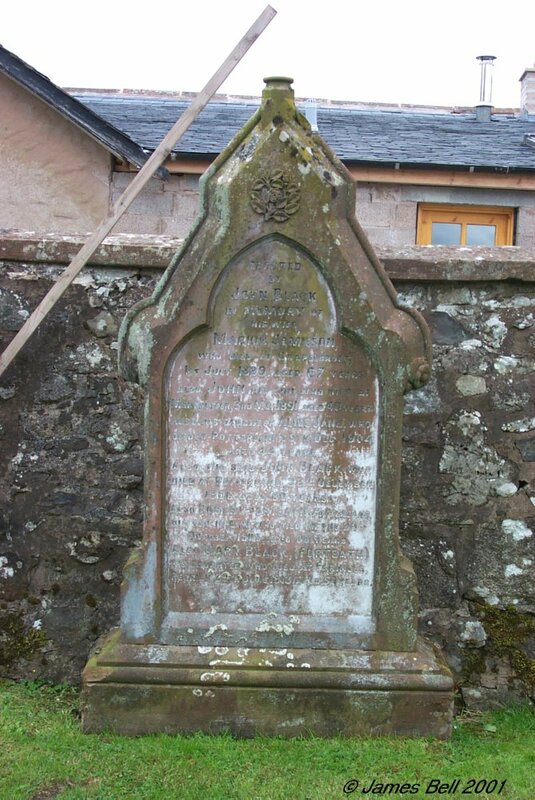 81 Erected by George McAdam, Barlochan, in memory of George, his son, who died on the 8th day of July 1835, aged 16 years. Anthony, his son, mate of the Brig. 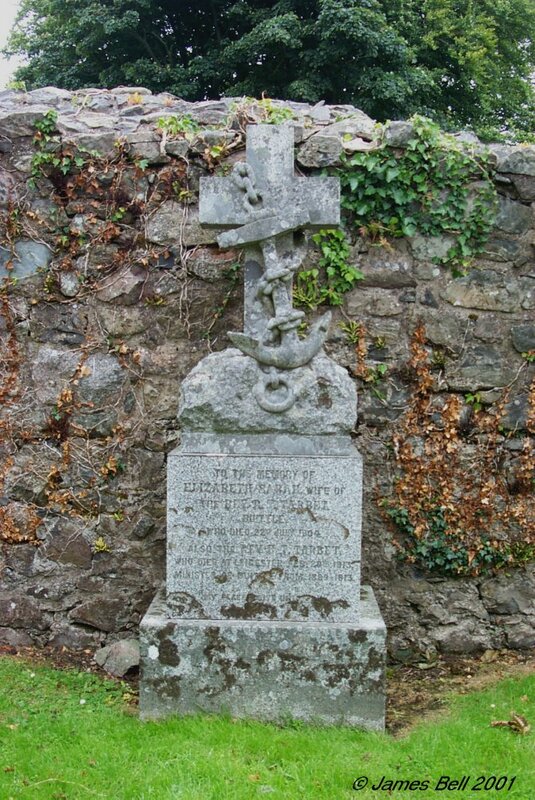 George and Catherine of Annan, who was lost at sea on the 23rd day of Jan. 1836, aged 31 years. 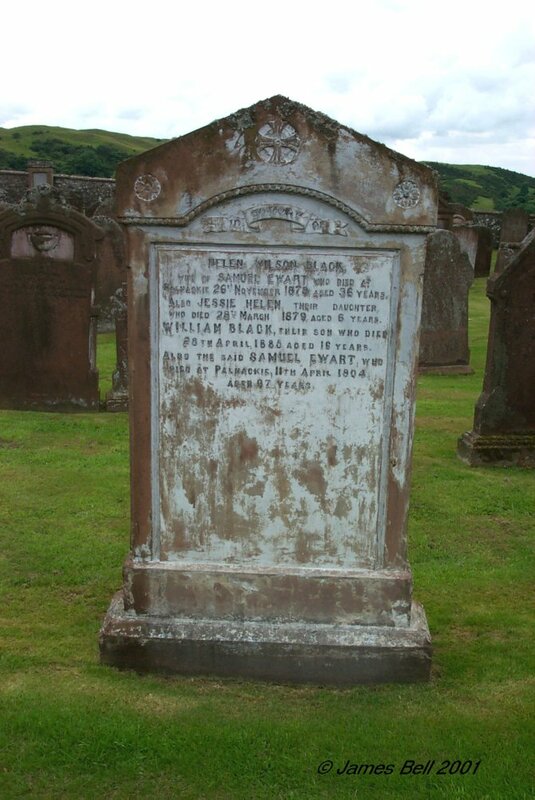 William McAdam, his father, who died on the 11th of March 1837, aged 89 years. Thomas, his son, who died on the 26th day of November 1844, aged 23 years. 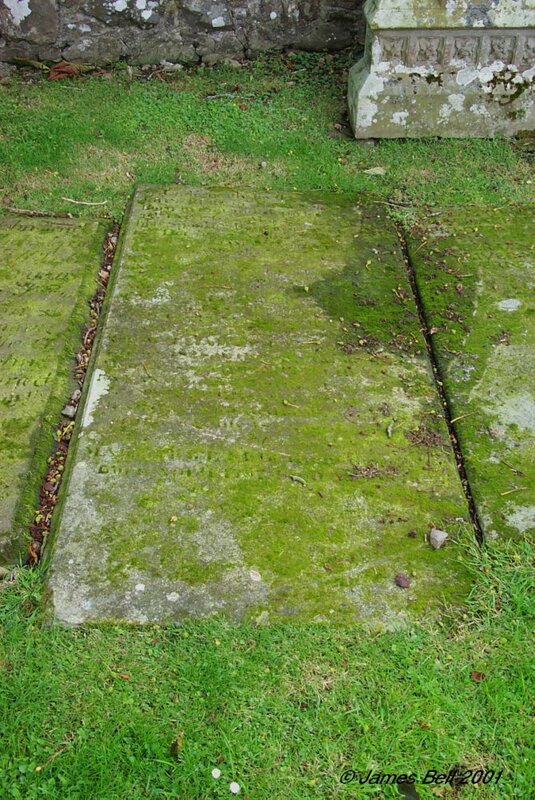 William, his son who died at Darlington, on the 5th of October 1846, aged 43 years. 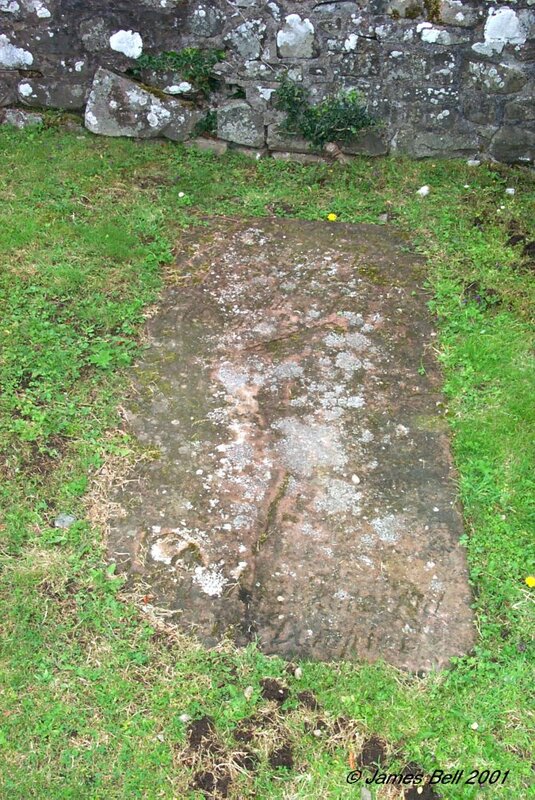 Also Alex'r McAdam, principal coast officer at Barlochan, died 1st June 1851, aged 27 years. Also Agnes McCartney, his wife who died 8th December 1857, aged 76 years. Also the said George McAdam, who died 15th February 1858 aged 80 years. 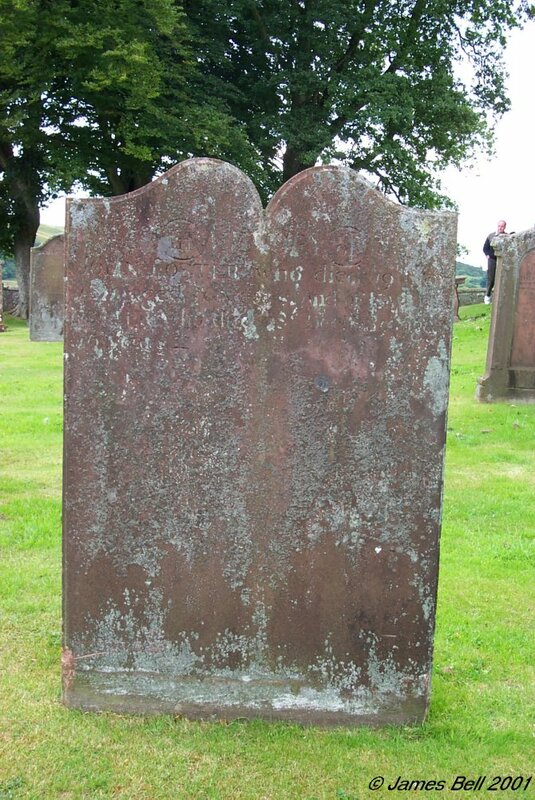 82 Here lyes Robert Thomson, a child who departed this life June 6th 1725. 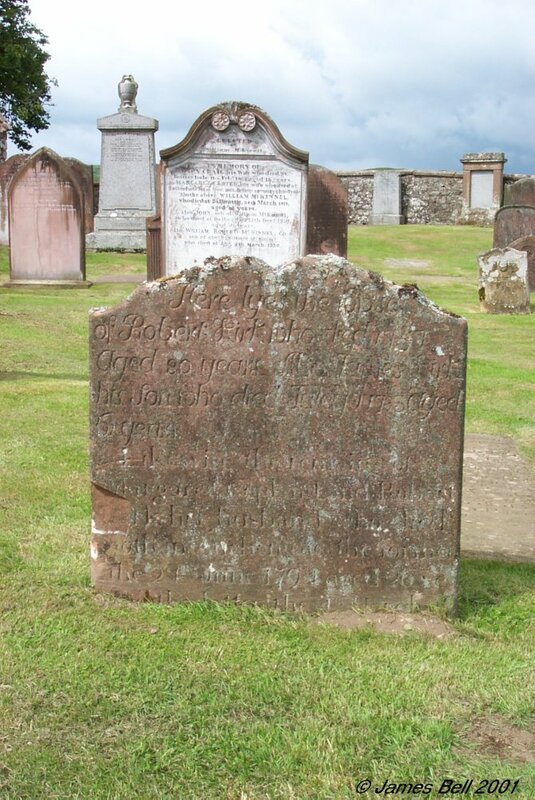 83 Here lyes body of Robert Coupland who lived in Marnoch, who died the -- of June 1739, aged 60. 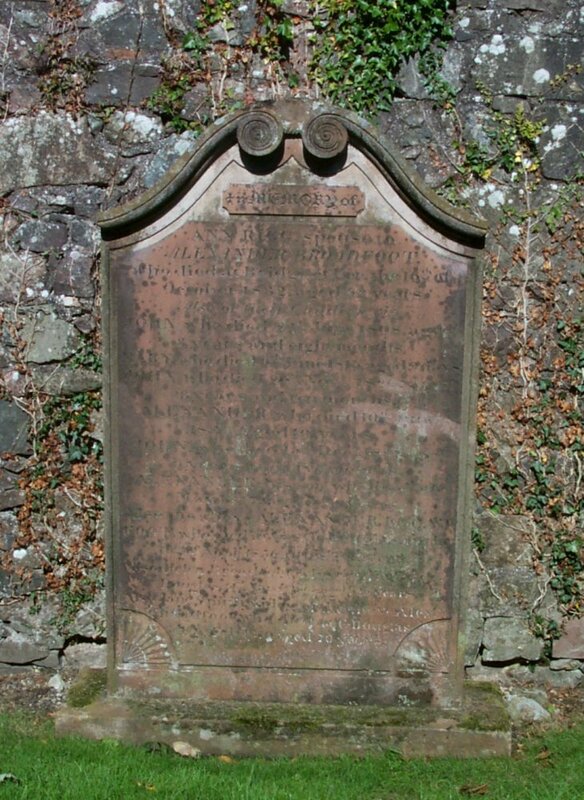 84 Erected by John Coupland in Rhonehouse, to the memory of his son John, who died in Kirkcudbright Parish Nov. 1st 1848, aged 28 years. Also Mary Geddes, his mother and wife of the above who died at Rhonehouse, Feb'y. 15th 1865, aged 79 years. Also the said John Coupland, who died at Rhonehouse Parish of Kelton, on the 14th August 1875, aged 86 years. Reverse: In the memory of Samuel Coupland, who died at Thorn, 16th May 1825, aged 66 years. And to Elizabeth Conchar, his wife, who died 4th April 1833, aged 77. 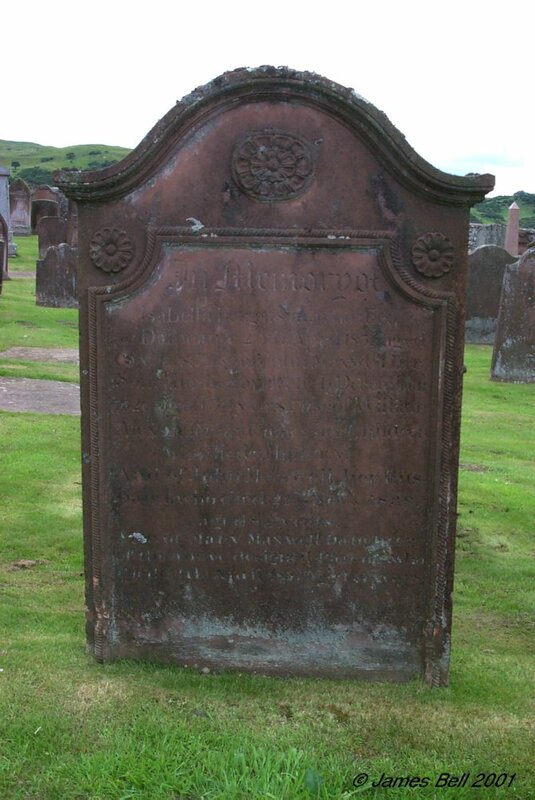 Also of Margaret Copland who died 5th February 1826, aged 75 years. 85 Erected by William McKinnel, in memory of Mary Craig, his wife, died at Butterhole, 11th Feb'y. 1863, aged 26 years. Also Margaret Carter, his wife, who died at Butterhole, 13th Nov. 1901, in her seventy third year. Also the above William McKinnel, who died at Dalbeattie, 29th March 1918, aged 83 years. 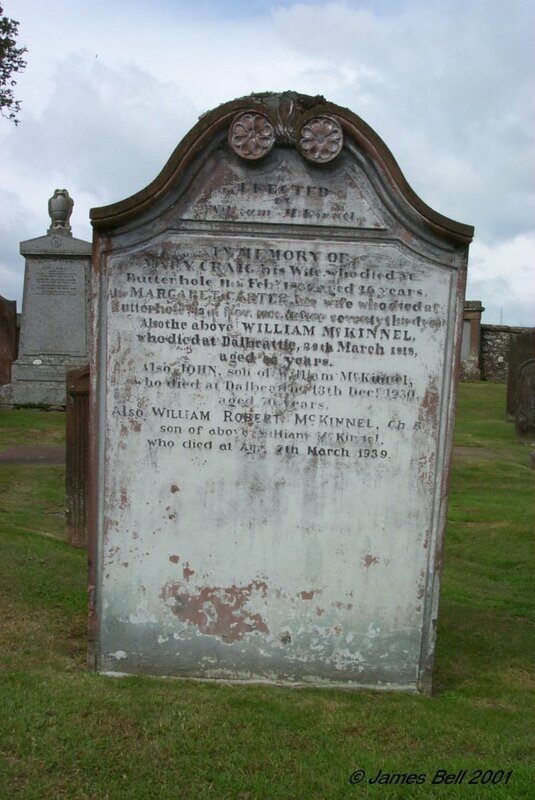 Also John, son of William McKinnel, who died at Dalbeattie, 13th Dec'r. 1930, aged 70 years. Also William Robert McKinnel, Ch. B., son of the above William McKinnel, who died at Ayr, 7th March 1939. 86 In memory of James Caldow, who died at Palnakie, 27th March 1883, aged 84 years. And Janet Sayers, his wife who died at Palnakie, 12th May 1874, aged 63 years. 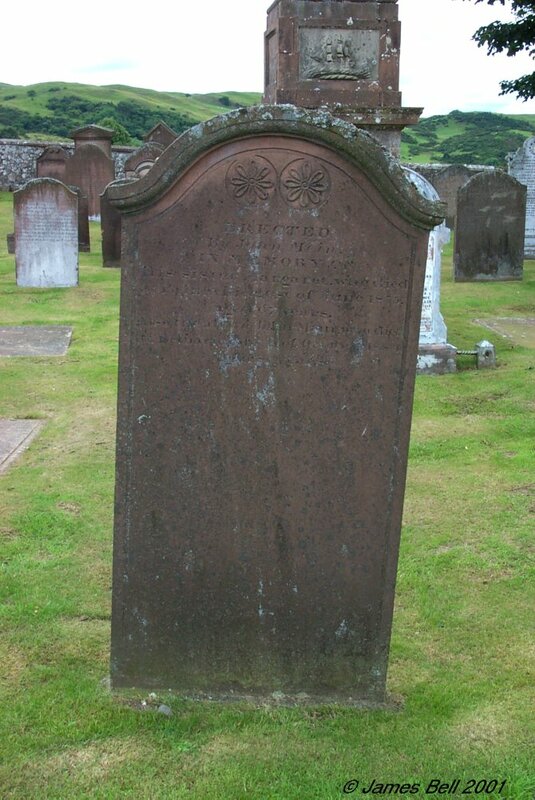 Also of Mary, fifth daughter of the above, who died at Dumfries, 11th April 1911, aged 65 years. 87 In memory of Andrew Scott, who died at Cuil, 22nd November 1799 aged 54 years. 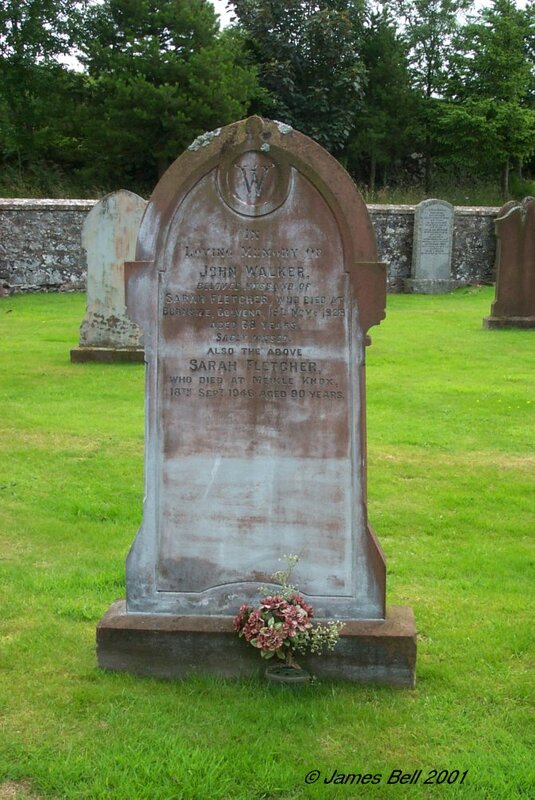 Also of Margaret Burnett, his wife, who died at Dalbeattie, 15th May 1844, aged 94 years. 88 Here the corps of John Gordon, late in Cuil, who died Dec. 9th 1781, aged 55 years. He was the Affectionate Husband, the Indulgent Parent, the Faithful Friend and the Generous Master. Also Grizzel and Basil Gordon his children. 89 To the memory of Thomas Carswell, son of James Carswell, in Cullinduch, who died the 20th of March 1836, aged 15 years. Also Margaret Carswell, who died the 18th of March 1836, aged 6 years. And Mary Carswell, who died the 4th of July 1834 aged 1 year. Also Violet Alexander, mother of the above, died at Palnackie, 2nd of Sep. 1861, aged 67 years. 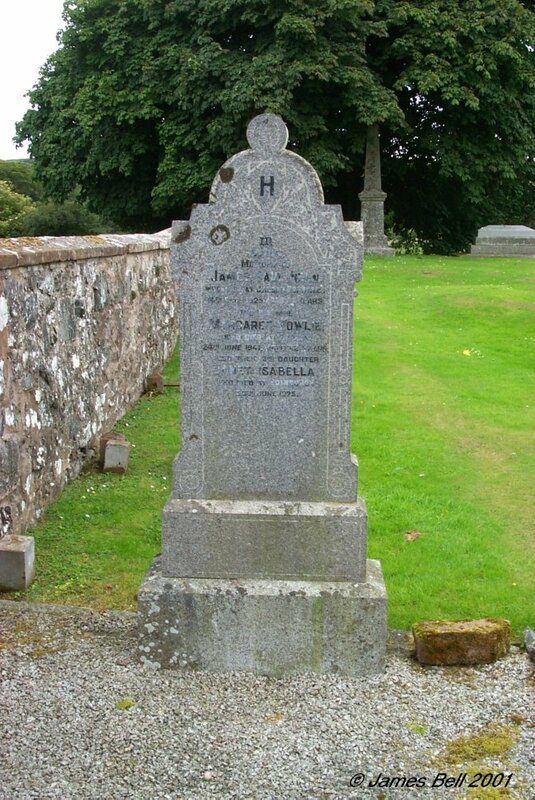 Also James Carswell, her husband, who died at Palnackie, 24th of March 1871, aged 78 years. Also James Carswell, son of the above James & Violet Carswell, who died at Palnackie, 25th of December 1877 aged 59 years. Also Helen McLeod, his wife, who died at Palnackie, 31st May 1906, aged 91 years. Reverse. In loving remembrance of John Hunter Beattie, lost at sea 1883. Also James Carswell Beattie, his son, lost at sea 1906. Also Mary Carswell, his wife, died at Palnackie, 25th Dec. 1920. 90 Erected by James Brydson, in memory of William his son, who died at Broomiebrae, 11th Dec. 1868, aged 18 months. Also Marrion Hyslop Carnon, his daughter, who died at Palnackie, 4th January 1882, aged 22 years. Also John, his son, who died at Palnackie, 28th March l883, aged 17 years and 4 months. Also William, his son, who perished at sea, 31st January 1891, aged 17 years. Also Mary Candlish, his wife, who died at Palnackie, 29th January 1910, aged 76 years. Also the above James Brydson, who died at Palnackie, 29th Dec. 1914, aged 78 years. 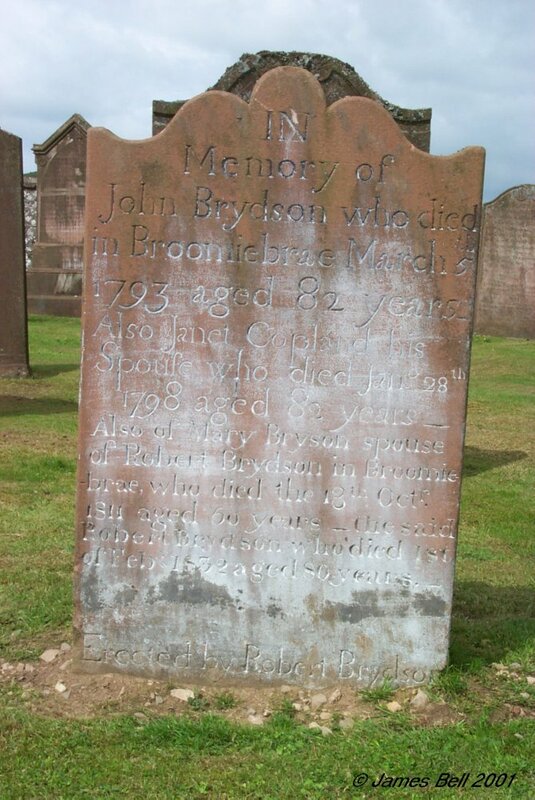 91 In memory of John Brydson, who died at Broomiebrae, March 5th 1793, aged 82 years. Also Janet Copland, his spouse, who died Jan'ry. 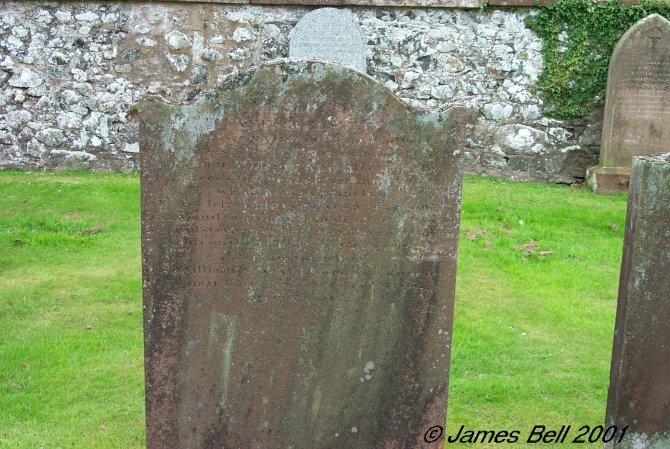 28th 1798, aged 82 years, Also of Mary Bryson, spouse of Robert Brydson, in Broomiebrae, who died the 13th Oct'r. 1811, aged 50 years. The said Robert Brydson, who died 1st of Feb'y. 1832, aged 80 years. Erected by Robert Brydson. 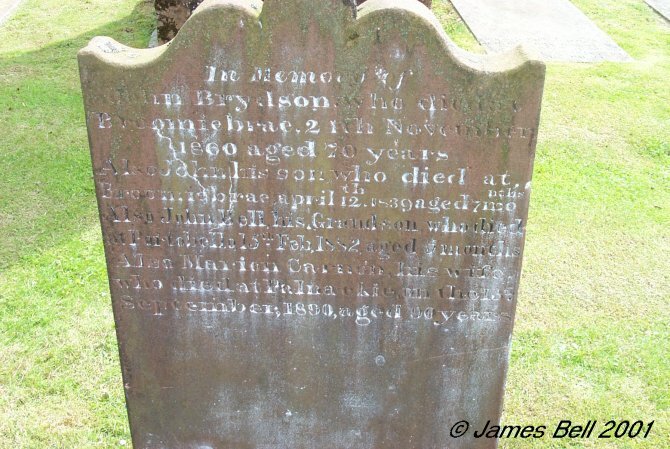 Reverse: In memory of John Brydson, who died at Broomiebrae, 24th November 1860, aged 70 years. 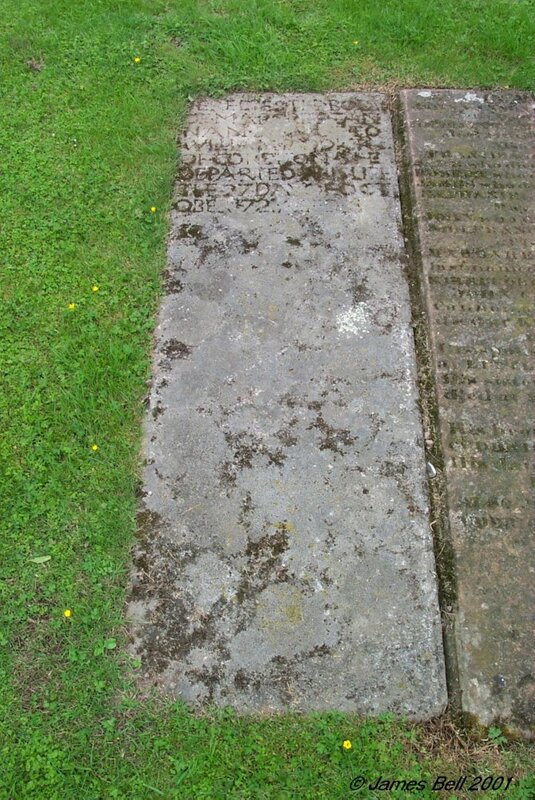 Also John, his son, who died at Broomiebrae, April 12th 1839, aged 7 months. Also John Bell, his grandson, who died at Portobello, 15th Feb.1882, aged 5 months. Also Marion Carnon, his wife, who died at Palnackie, on the 13th September 1890, aged 90 years. 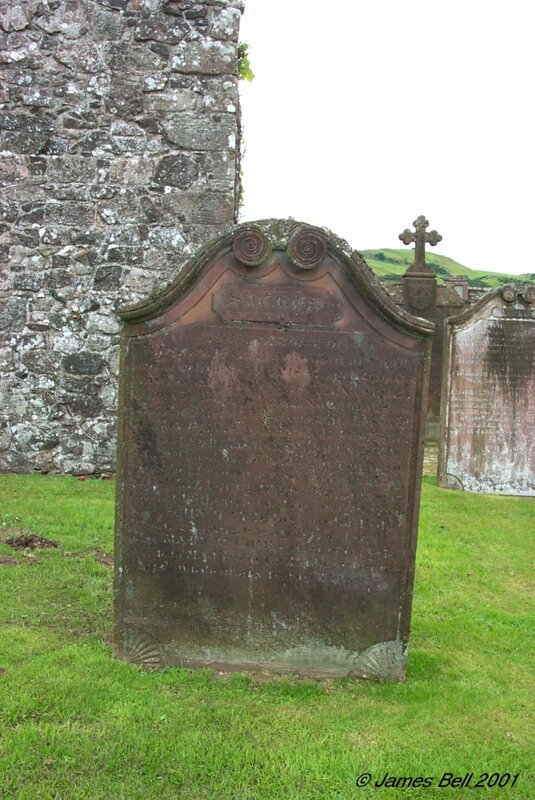 92 Sacred to the memory of Margaret Hyslop, spouse to John McKay in Claycroft who died 12th Feb'y 1841, aged 67 years. Also her husband John McKay, who died 12th Oct. 1852, aged 75. Also of their son-in-law John McQuie, who died at Claycroft on the 14th of March 1889, aged 74 years. Also of Mary McKay, his wife, who died at same place, on the 18th of March 1890, aged 81 years. 93 In memory of William Hunter, who died at Dalbeattie, April 21st 1881, aged 75 years. Mary Hunter, who died at Aikieslack in 1853 aged 18 years. William Hunter, who died at Valparaiso, South America, in 1875, aged 33 years. Wellwood and John, who died in infancy. Elizabeth McKay, wife of William Hunter, who died at Aikieslack, 3rd February 1890 aged 84 years. 94 Front:- Sacred to the memory of John Sproat, Nethertown of Almorness, who died at Laggan, Anwoth, 9th Feb. 1897, aged 80 years. Janet Livingstone, his wife, who died at Orchardton Mains, 10th March 1914 aged 83 years. Their son George, who died at Borness, Borgue, 23rd Jan'y 1927, aged 69 years. Left:- Their daughter Margaret, who died at Gatehouse 6th Dec'r 1929, aged 65 years. 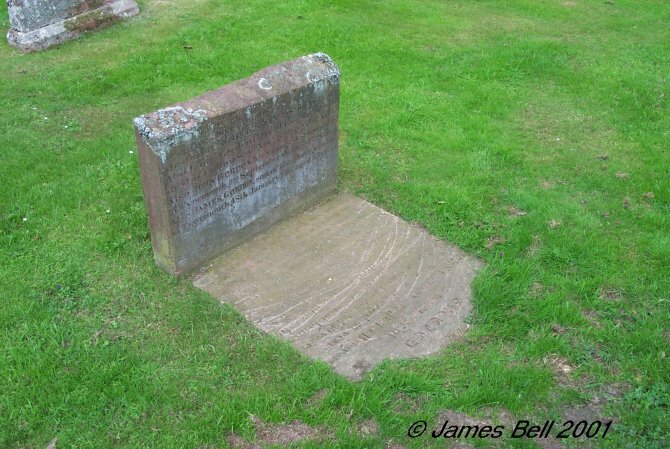 Their daughter Isabella, who died at Castle Douglas, 9th Dec'#r 1936, aged 75 years. Their daughter Mary, who died at Miles City, Montana, 22nd Feb'y 1947, aged 73 years. Their daughter Judith, who died at Orchardton Mains, 4th March 1947, aged 79 years. 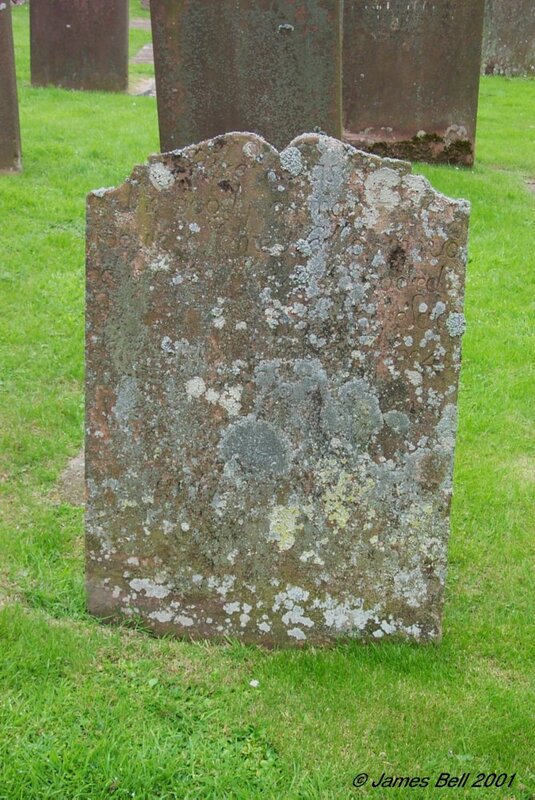 Right:- Their daughter Janet, who died at Nethertown, 26th Feb. 1870, aged 14 years. Their son Robert Barbour, who died at Bradford, 5th April 1883, aged 36 years. 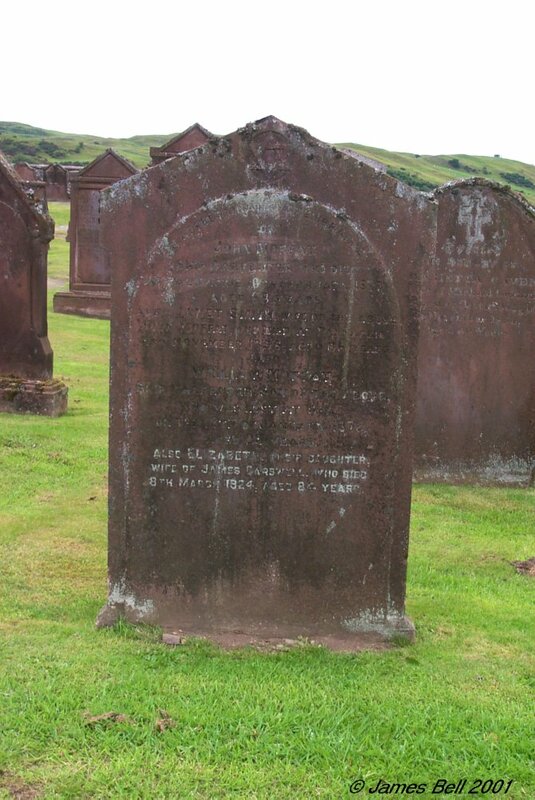 Their daughter Agnes who died at Stranraer, 22nd Feb. 1894, aged 43 years. 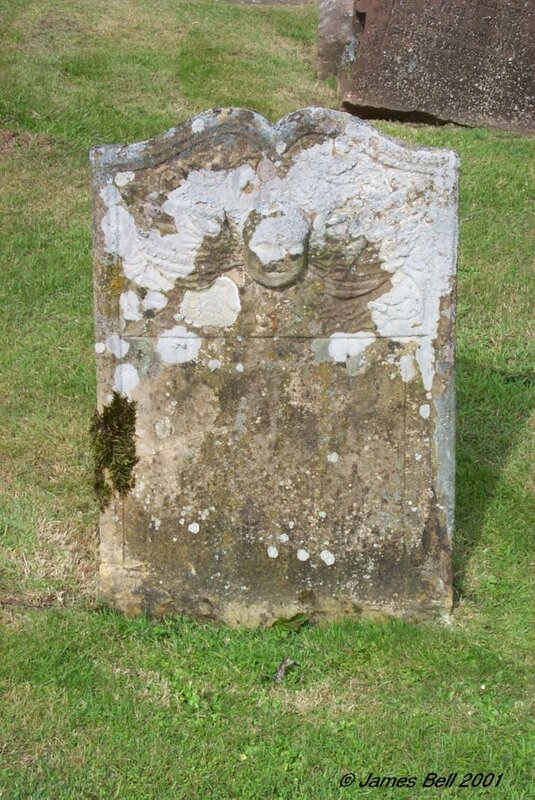 Their daughter Phoebe, who died at Nairn, 17th Feb. 1908, aged 48 years. Their son John, who died at Laggan, Anwoth, 17th Nov, 1913, aged 42 years. 96 Sacred to the memory of Thomas Rae, Hardhills, Parish of Buittle, who departed this life, 4th March 1839, aged 54 years. 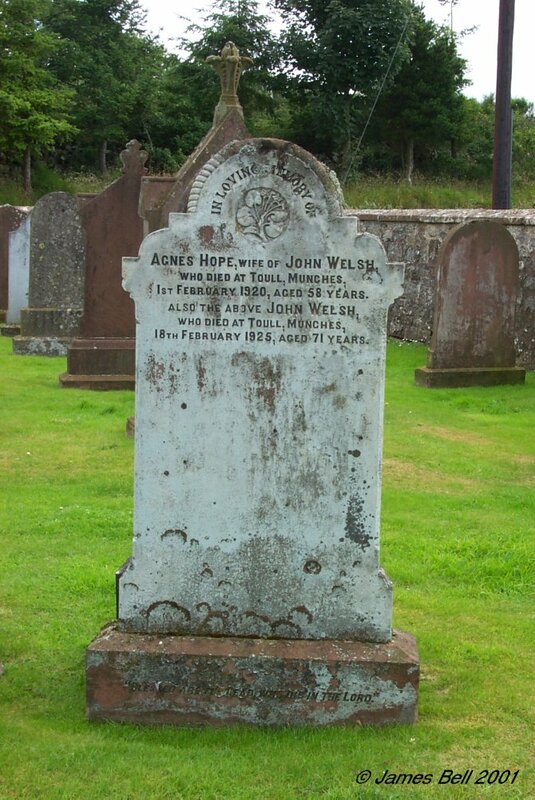 Walter Rae, his son, who died at Annoghloy, Ireland, on the 11th of Feb. 1859, aged 26 years. Mary Gillies, his spouse,who died at Raeburn Cottage, 27th of Dec. 1866, aged 68 years. Agnes Murray Rae, his daughter, who died 20th Jan'y. 1873, aged 46 years. Elizabeth Rae, his daughter, wife of David Donnan, who died at Broomiebrae, 21st July 1874, aged 53 years. David Donnan, who died 22nd Nov'r. 1878, aged 62 years. Also Jessie Crosbie Rae, who died 29th July 1880, aged 17 years. Also David Rae, who died 19th April 1887, aged 61 years. Also Mary Rae, who died at Hardhills, 29th Jan'y. 1913, aged 84 years. David Rae Mitchell, who died at Hardhills, 8th August 1916, aged 19 years. 97 Sacred to the memory of Jessie Mitchell, beloved wife of James Mitchell, born at Hardhills, died at Claycroft, 6th Oct'r 1940, aged 75 years. Also their son David Rae Mitchell, died at Hardhills, 8th Aug't. 1916, aged 19 years. Also the said James Mitchell, who died 20th Feb'y. 1941 aged 77 years. 98 In memory of James Halliday, who died at Palnackie, 30th September 1863, aged 47 years. David, his son who died at Slogarie, 7th January 1847, aged 2 years and 4 months. 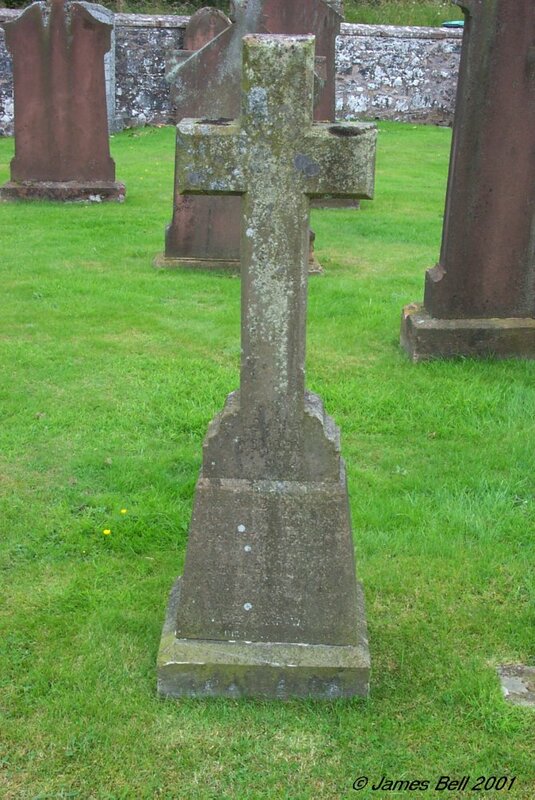 Robert, his son who died on board the ship Miami of Glasgow, 20th August 1871, and was buried at sea in 50 deg N. 10 deg. W. aged 20 years. Edward, his son, who died at Edinburgh Royal Infirmary, 26th Feb'y. 1890 aged 40 years. Grace Stitt, wife of the above James Halliday, died 13th July 1903, aged 89 years. Catherine Margaret, daughter of the above James Halliday, who died at Walton Hospital, Liverpool, 19th Sept. 1934, aged 82 years. 99 Sacred to the memory of Samuel Dinneston, who died at Craig-end, 9th Oct. 1840 aged 69 years Also his beloved spouse, Mary Thomson, who died at Craignair, 23rd November 1841, aged 72 years. Also of their children, William, David, James, Margaret, John and Mary who all died at Buittle Mains. Jane, daughter of Robert Kirk, who died at Auchenhay, 22nd Nov'r. 1861, aged 22 years. 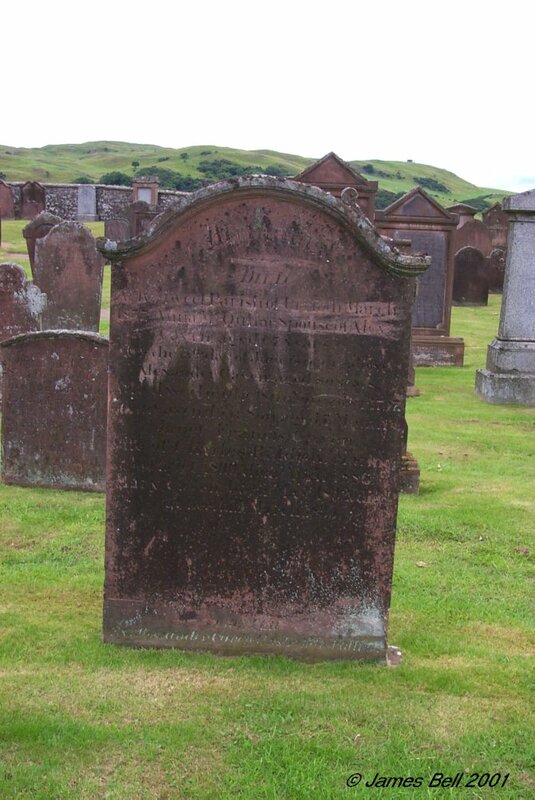 Also Robert Kirk, who died at Dalbeattie, 16th May 1875, aged 60 years. Also Margaret Denniston, his wife who died at Southwick Road, 28th January 1883, aged 73 years. 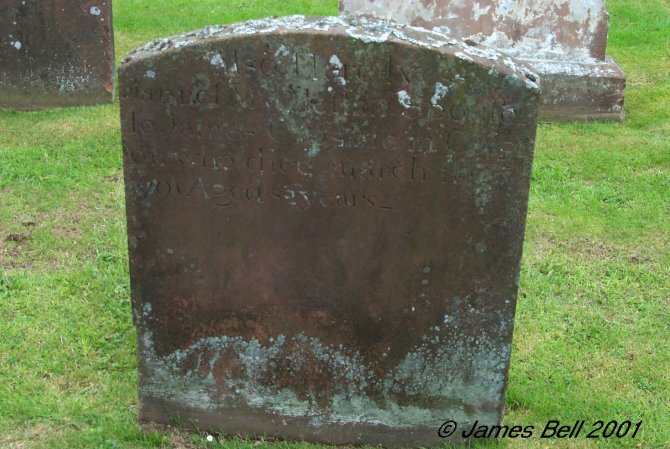 100 In memory of Samuel Shaw, who died in Caigton, December 1787, aged 39 years. Also of Elizabeth McRobert, his wife who died on the 3rd July 1836, aged 84 years. 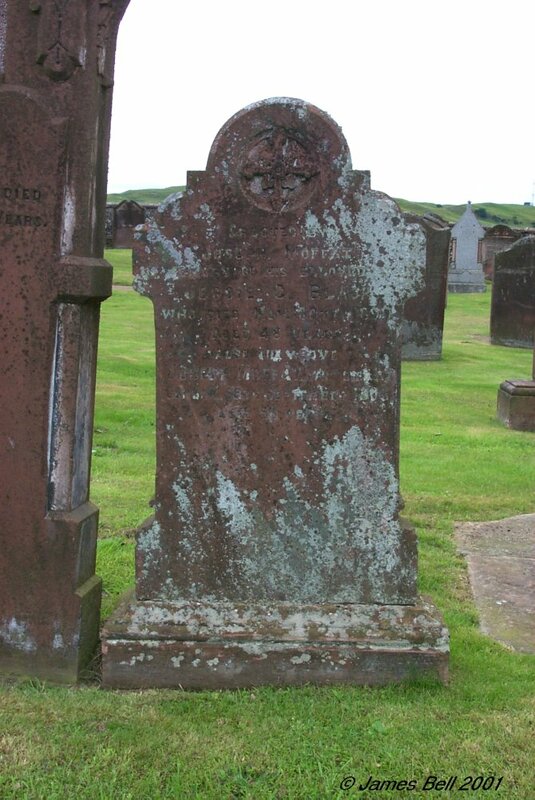 Also William Shaw, their son who died at Castle Douglas, on the 22nd May 1857, aged 75 years. Also Elizabeth, daughter of the said Wm. 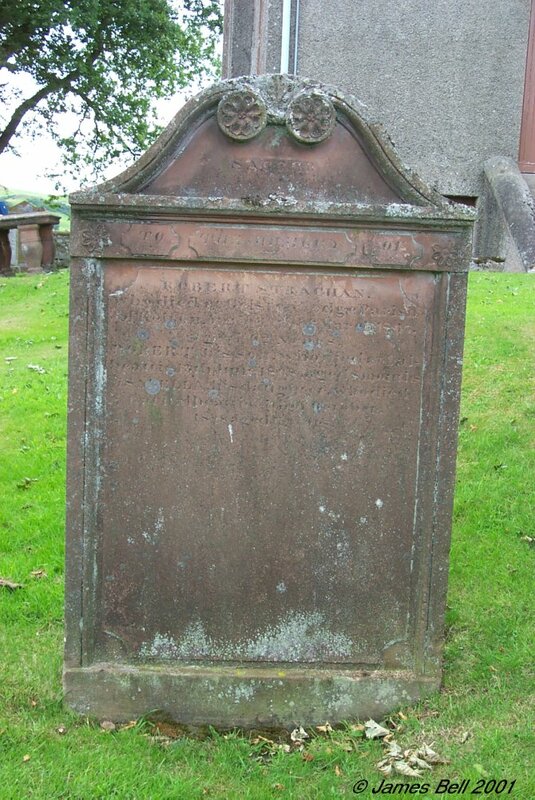 Shaw, who died at Castle Douglas, 18th Feb. 1801, aged 43 years. Also John, son of the above Wm. 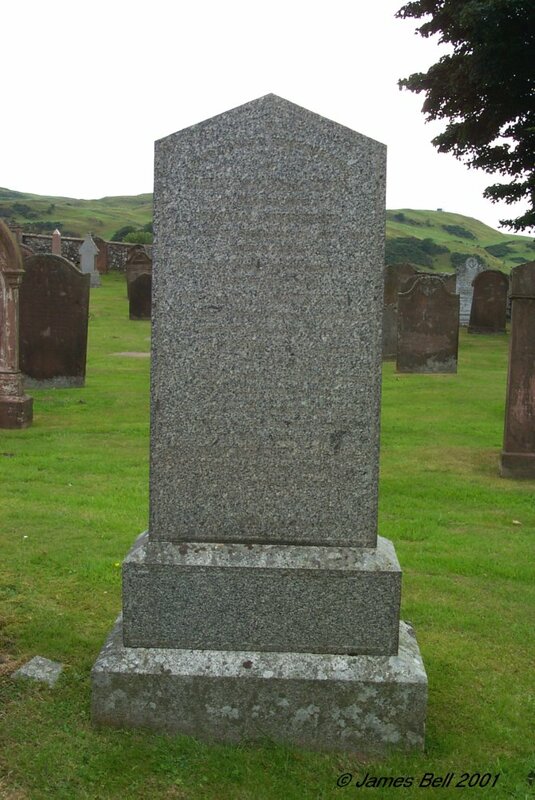 Shaw, who died at Castle Douglas, on the 9th of March 1870, aged 46 years. Mrs. Margaret Shaw, died 3rd February 1881, aged 98 years. 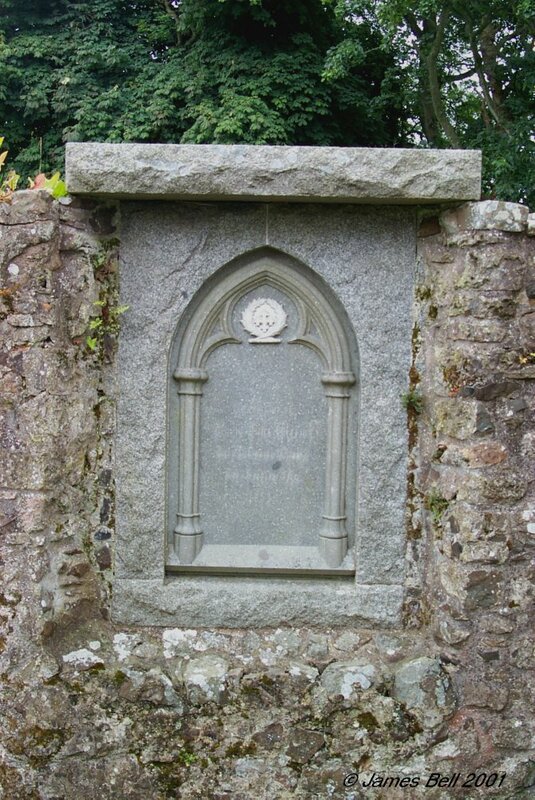 101 Sacred to the memory of Mary, daughter of John Myers who died in Borgue, 1823 in infancy. Thomas, his son who died at Blackbelly, 24th Nov. 1837 aged 14 months. Martha, his daughter who died at Red Leggate, 1st Feb. 1842, aged 5 years. Mary, his daughter who died at Castle Douglas, 20th Aug't. 1872, aged 40 years. Susannah. his daughter who died at London, 17th Sep'r 1876, aged 46 years. Also the above John Myers, who died at Castle Douglas, on the 25th of March 1883, aged 91 years. Also Susannah Emmott, his wife, who died at Castle Douglas, on the 17th of April 1888, aged 88 years. 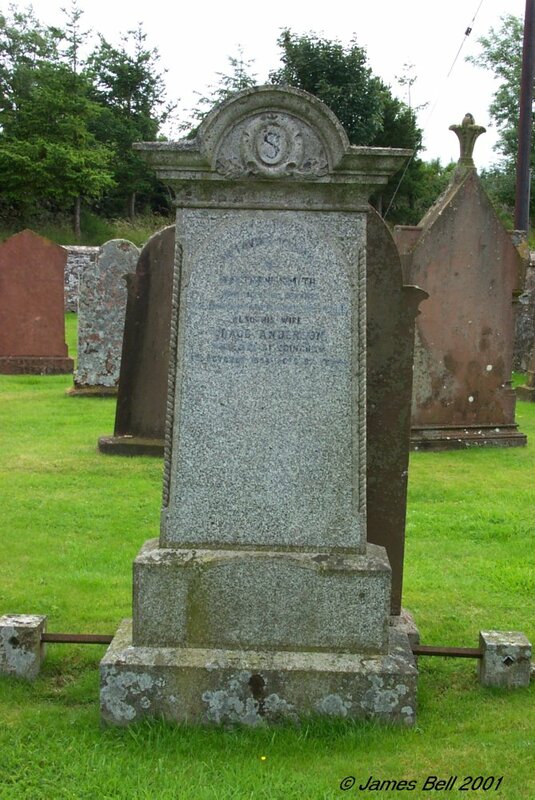 Thomas, his son died at Castle Douglas, 30th April 1891, aged 51 years. 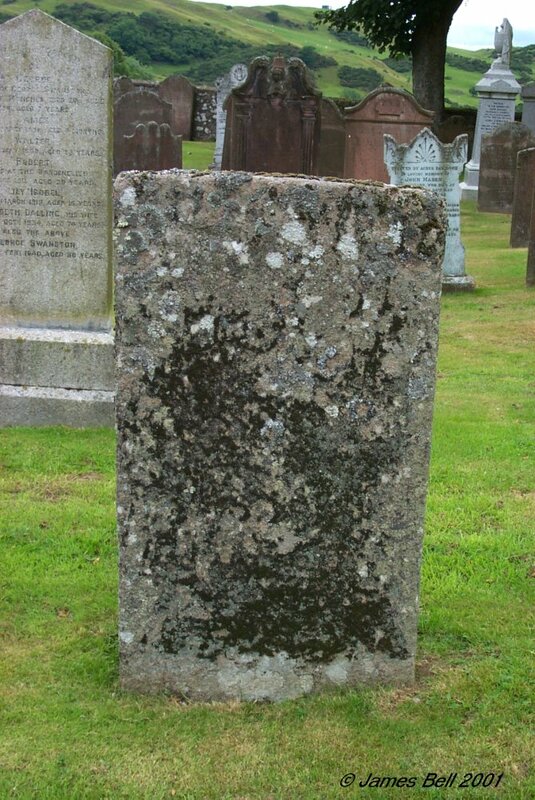 Also Elizabeth Myers, died at Castle Douglas, 29th Oct. 1900, aged 76 years. 102 In memory of John Affleck in Dalbeaty, who died 26 Dec'r. 1793, aged 6 years. 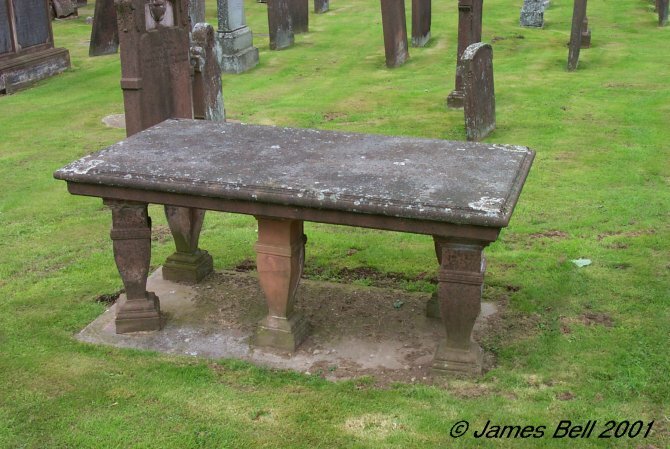 Also Agness Tait in Dalbeaty, who died 9 April 1794, aged 64 years. Erected by John Affleck in Dalbeaty. 103 In memory of John Affleck, Joiner, Dalbeattie, who died 7th Dec'r. 1822, aged 67. And Elizabeth Stewart, his spouse, died 17th Feb'y. 1838, aged 76. And of Helen and Stewart, twins died 3 Feb'y. 1800, aged 3 months. Also Stewart, died 18 July 1821 aged 18. And Meonimla died 1 April 1823 aged 29, their children. 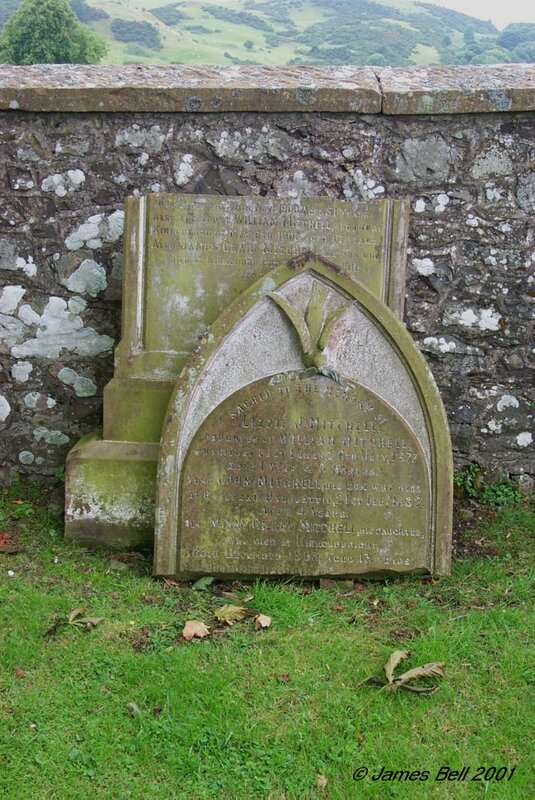 Also Agnes Affleck, who died at Dalbeattie, 10th March 1869, aged 80 yrs. 104 In memory of David Milligan Esquire of Dalskairth, Merchant in London, who died the 24th Jan'y. 1798, aged 64 years. And of Marian Clark of Culgruff, his wife who died the 13th Feb'y. 1800 aged 60 years. 105 In memory of David Milligan, who died 1733 aged 64 years. 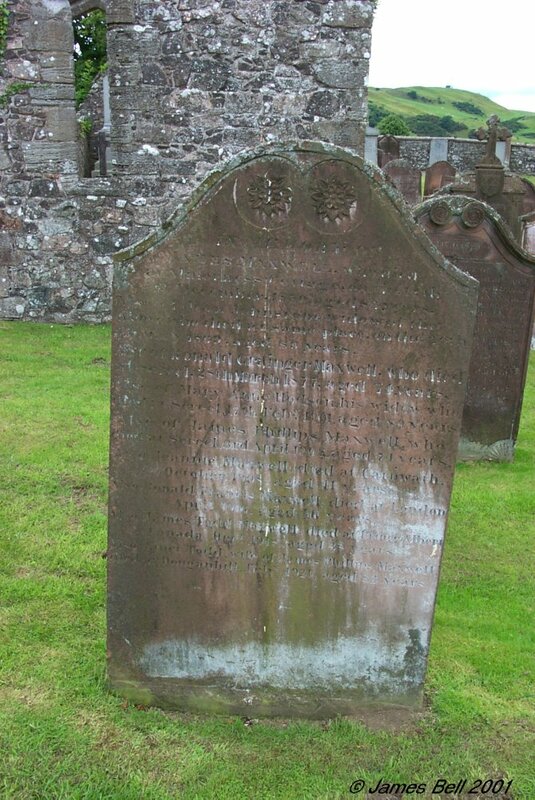 Also his wife Mary, Lamont, who died 1767 aged 83 years. Erected by M. Milligan Dalskairth, their daughter-in-law. 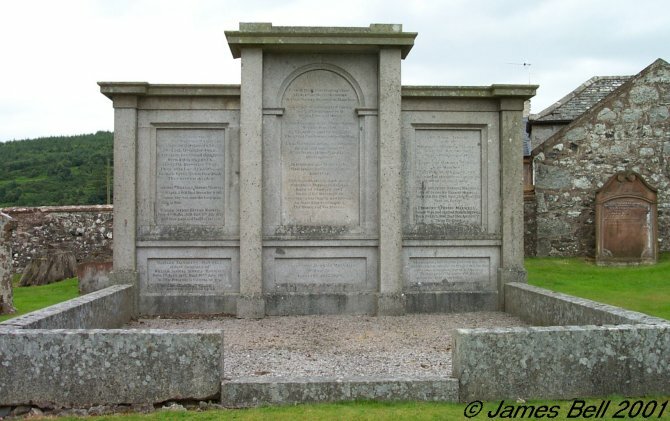 106 Erected in memory of David Milligan of Dalskairth who died the 24th January 1798, in the 64th year of his age. 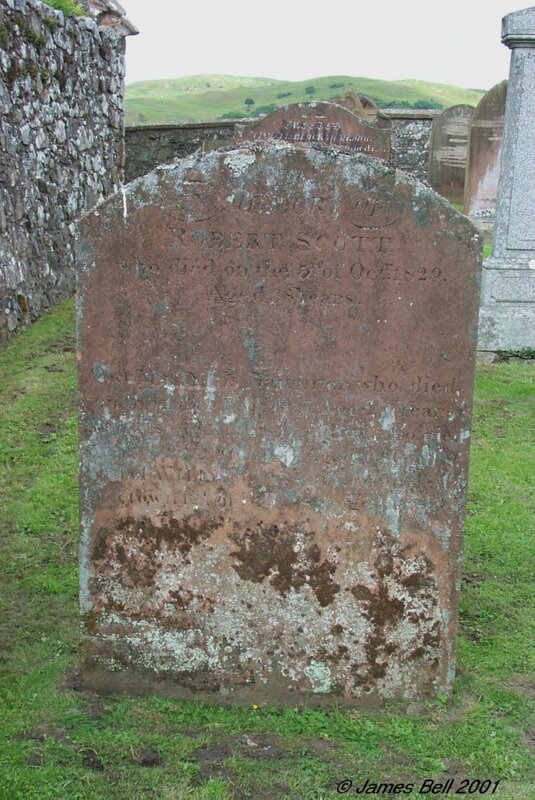 107 Here lyes the body of Robert Scott in ---- Knox, who departed this life Jan'y. 2nd 1739, aged 70 years. Also Marion Carson, his spouse, who departed this life, November 3rd 1738, aged 68 yrs. 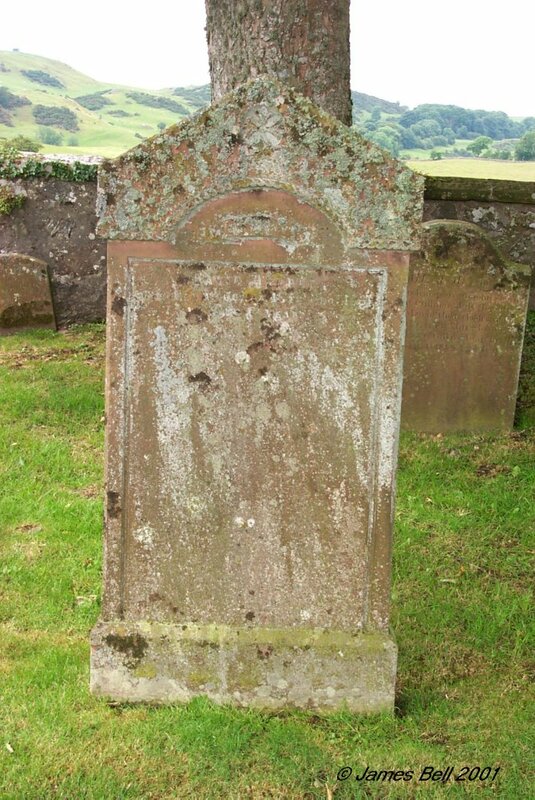 Also John McLelland, who died in Shield Hills, Parish of Colvend, Nov. 1790, aged 79 years. Also William, Jane and John McLelland, children of the above John McLelland. 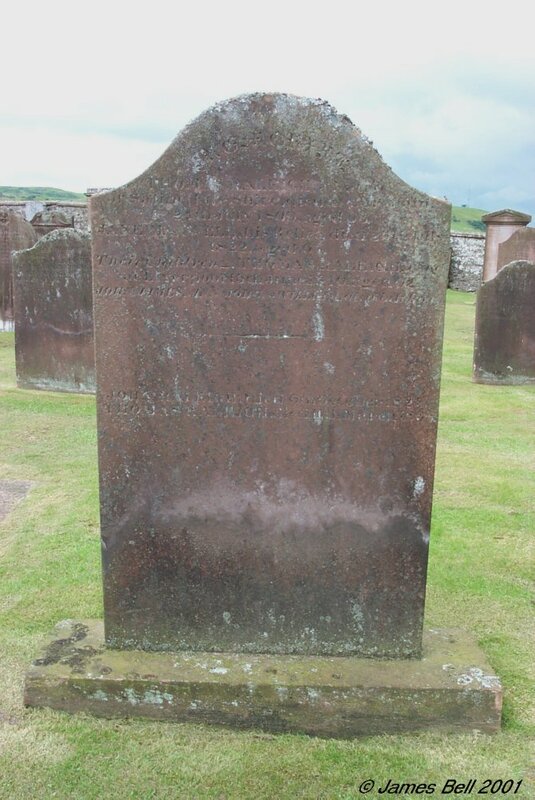 And of Mary Wilson, his spouse who died at Drumstinchall, 9th July 1816 aged 76 years. Erected by Robert McLelland, -------- ------, John McMiken, John McGeorge. 108 In memory of James Telfer, who died at Craigheron, Parish of Buittle, A.D., 1800 aged 61. 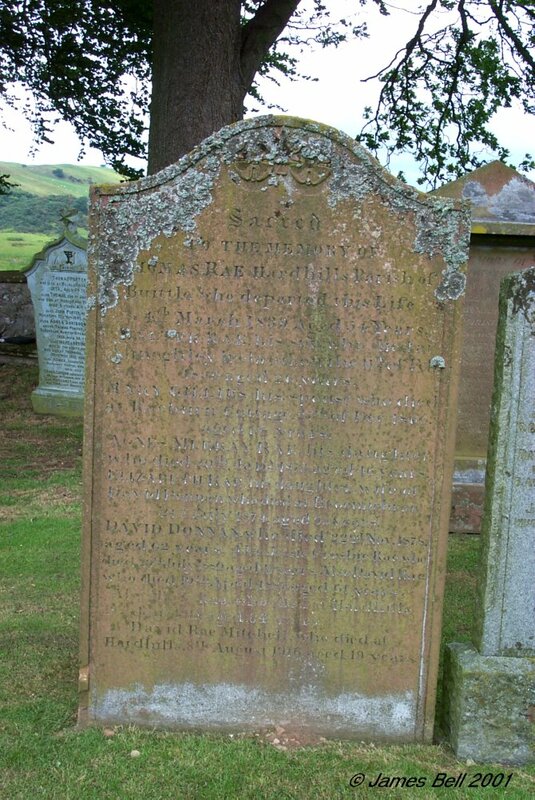 Also Mary Carson his spouse, who died at Dalbeattie, the 14th May 1840, aged 90 years. Also of Jane, their daughter, who died on the 21st of December 1841, aged 54 years. And Elizabeth, their daughter, who died on the 17th of April 1842, aged 52 years William Telfer, died 18th June 1873, aged 57 years. Agnes Telfer, died 24th February 1876, aged 85 years. 109 In memory of John Kirko in Palnackie, who died Feb'y (1)3th 1751, aged 83 years. Also Ann Carson, his spouse who died March 4th 1767. Also of their children Barbra Kirko, a child who died 1706. Robt Kirko, who died July 30th 1739, aged 18 years. Mary Kirko, who died Nov'r. 8th 1787, aged 62 years. 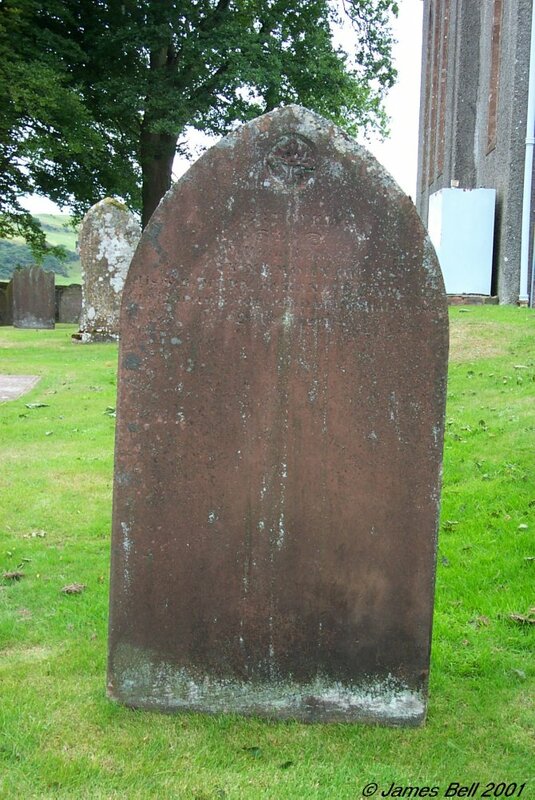 Nathaniel Kirko, who died May the 29th 1793, aged 64 years. 110 In memory of William Crosby, in Barwhanny, who died Jan'y. 11th 1781, aged 75 years. And Jannet Coupland, his spouse, who died Agu't -- 1791, aged 81 years. Also of their children Thomas Crosby, who died Jan'y 1st 1771, aged 23 years; Agnes Crosby, who died Aug. 1st 1771, aged 17 years. Samuel Crosby, their grandson, who died Dec'r 9th 1776, aged 13 years. Broun Crosby, who died Dec'r 13th 1776, aged 28 years. 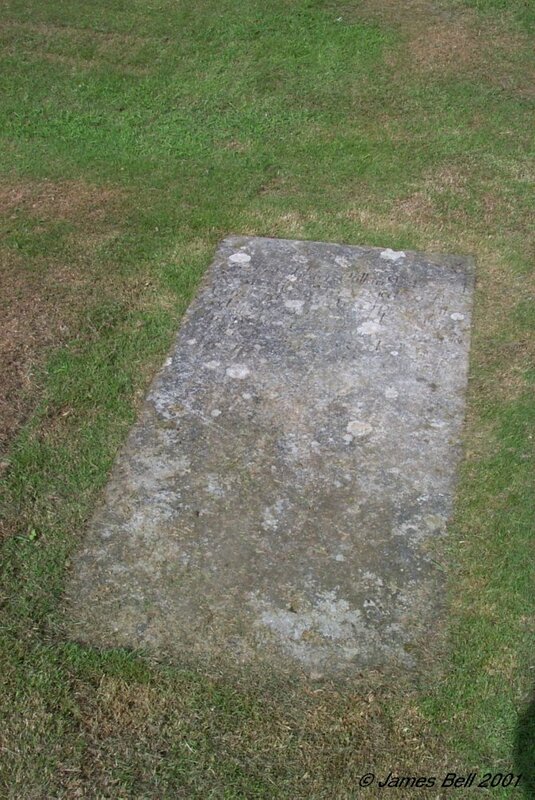 Margret Crosby, who died 13th Agu't 17th 1793, aged 51 years. Also John Crosby, who died -- Aug. 1819, aged 81 years, and erected this stone. 111 In memory of William Copland in Dalbety, who died June 1, 1793, aged 73 years. 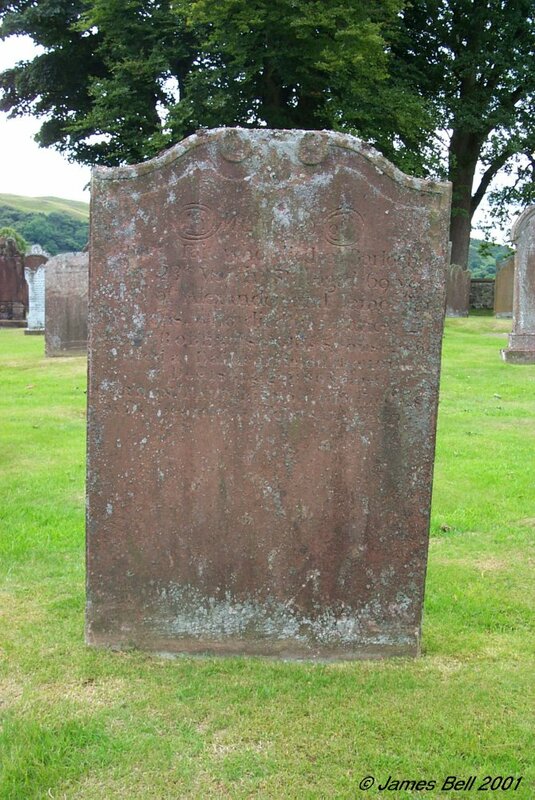 Also Grizal Black, his spouse, who died April 22nd 1782, aged 66 years. Also Thomas Copland, his son who died Dec'r. 11 1780, aged 39 years. 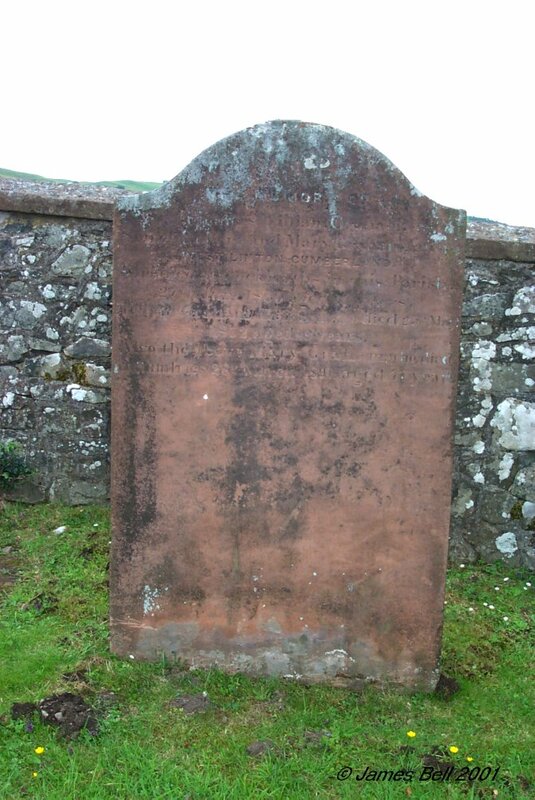 112 In memory of Robert Coltart of Logan, who died at Glen of Almorness, 8th March 1738, aged 57 years. And of Janet Reid, his spouse, who died 23rd March 1761, aged 76 years. 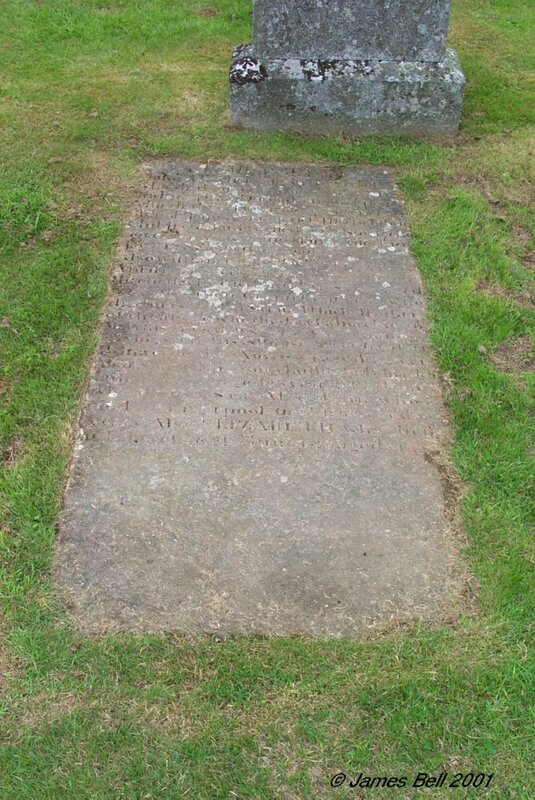 And also William Coltart of Blue-hill, his son, who died 1st March 1772, aged 51 years. 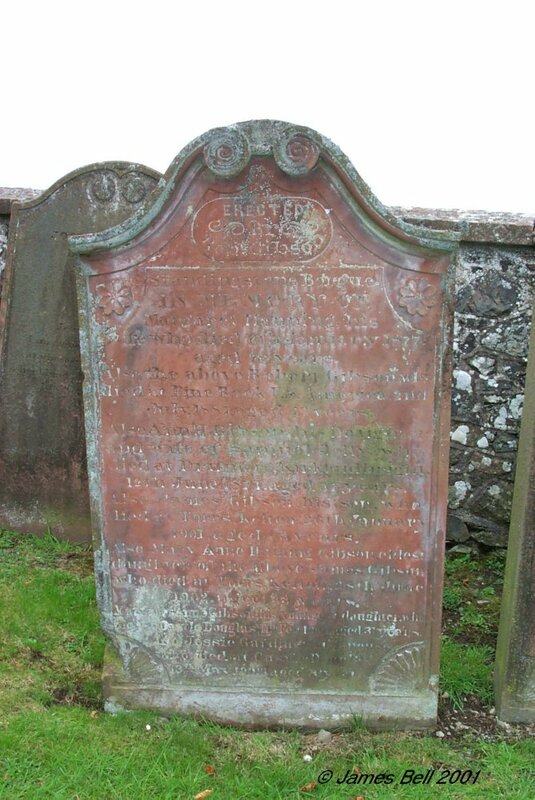 And of Catherine Kirkpatrick, his (wife), who died at Bluehill, 18th Jan'y 1807, aged 73 years. 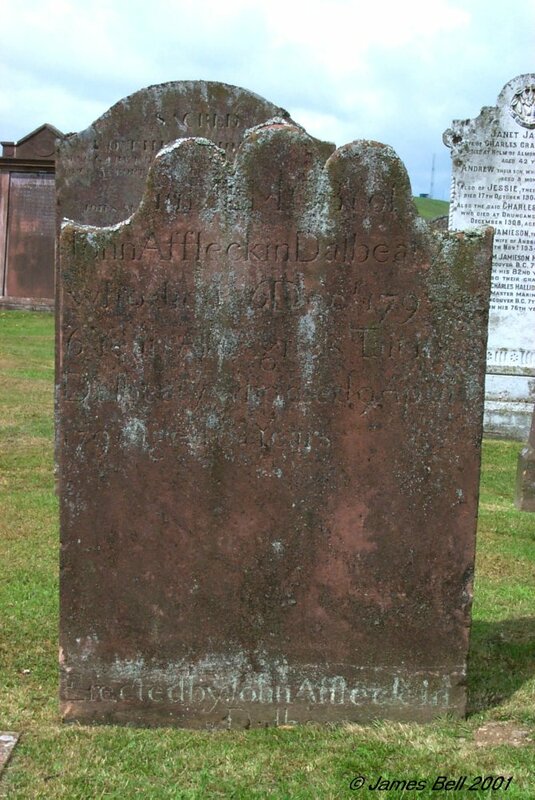 And also of Rodger Coltart, late of Fredericksburgh, Virginia, their son, who died 3rd March 1803, aged 36 years. Also Robert Coltart, their eldest and last surviving son, who died --th May 18(1)2, aged 81 years. Beloved and mourned by all who knew him. 113 Erected by James Coltart, in North Glen. 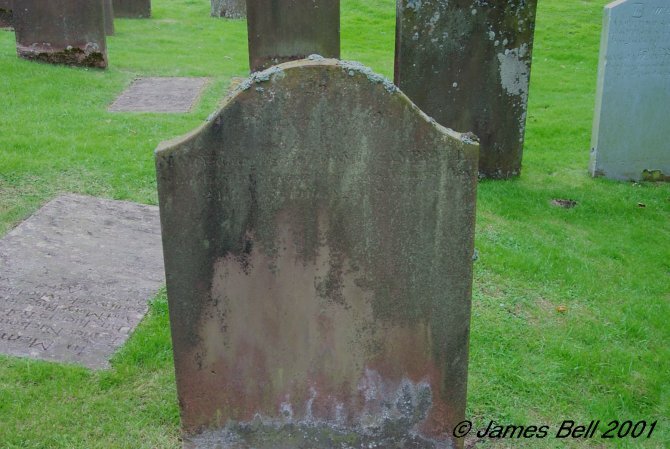 In memory of James, his son, who died on the 23rd of Aug. 1834, aged 16 years. 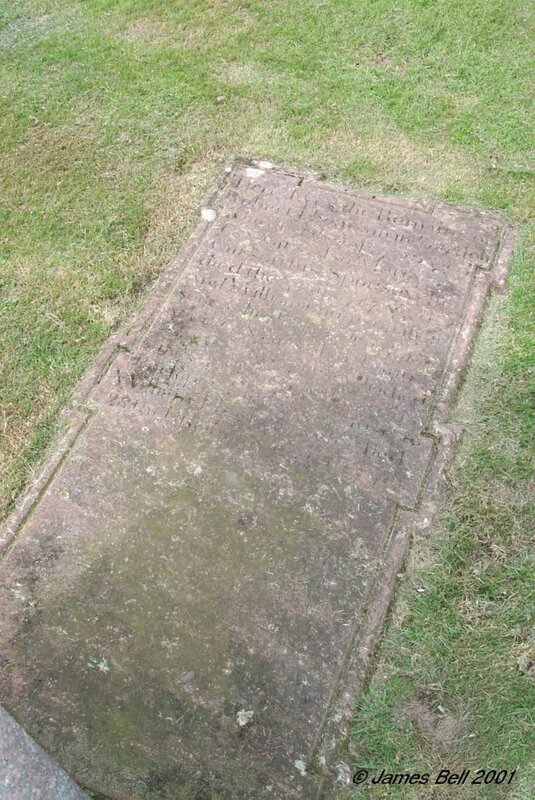 Also of William, his son, who died at Whitehaven, on the 16th of March 1838, in the 24th year of his age. Also Joseph, his son, who died at California, on the 9th of October 1851, in his 42nd year. Also of Marion Coltart, his wife who died at North Glen, on the 3rd August 1855, aged 73 years. And the foresaid James Coltart, who died at North Glen 25th July 1861 aged 80 years. Robert who died at Palnackie, 2nd Nov. 1873, aged 61. Alexander, who died at North Glen, 20th Feb. 1877, aged 56. 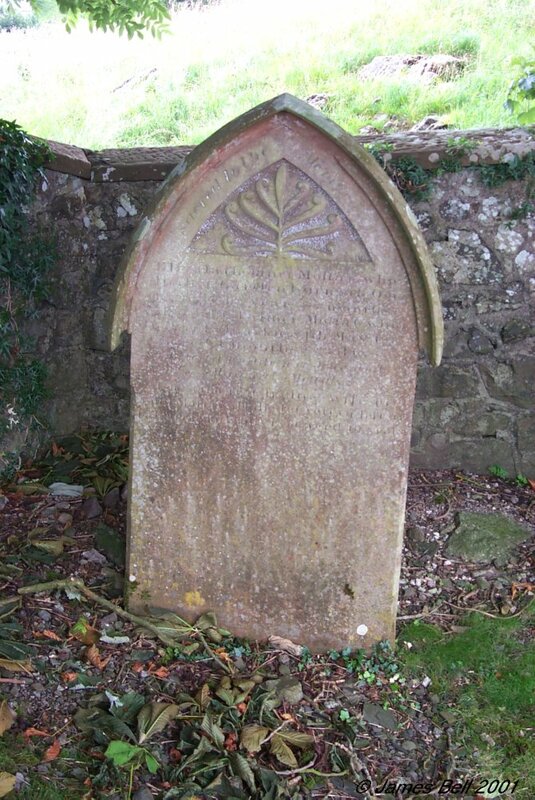 114 In memory of Joseph Coltart who died at Blaiket, Parish of Urr, 29th June 1812, aged 72 years. Mary Campbell, his wife, who died at Blaiket, 7th May 1794, aged 46 years. 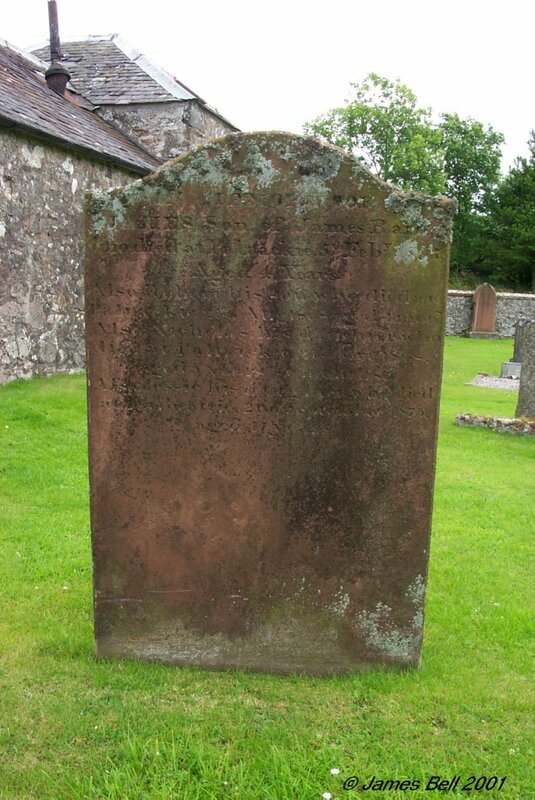 William, their son, who died at Threave Mains, Parish of Balmaghie on 19th May 1855, aged 70 years. Robert, their son, who died at Threave Mains, 2nd June 1869, aged 81 years. 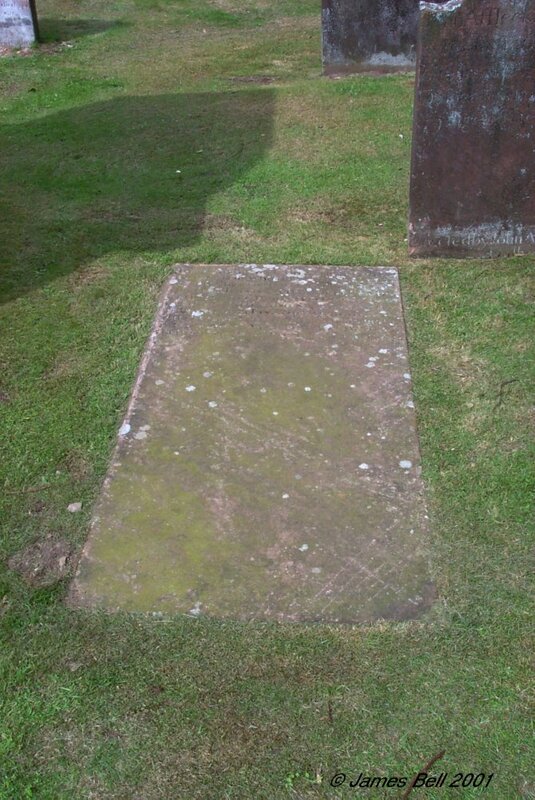 116 Here lies the corpse of Robert Kirk, who died 1757, aged 80 years. 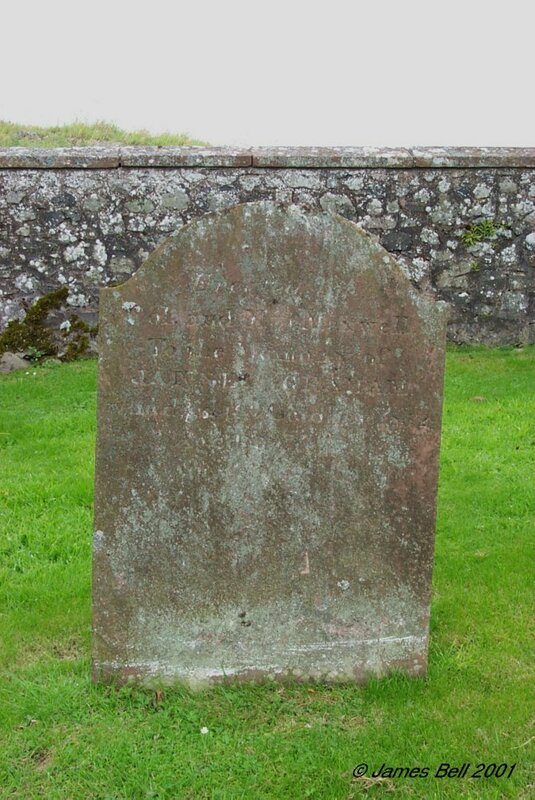 Also James Kirk, his son, who died June 1772, aged 61 years. 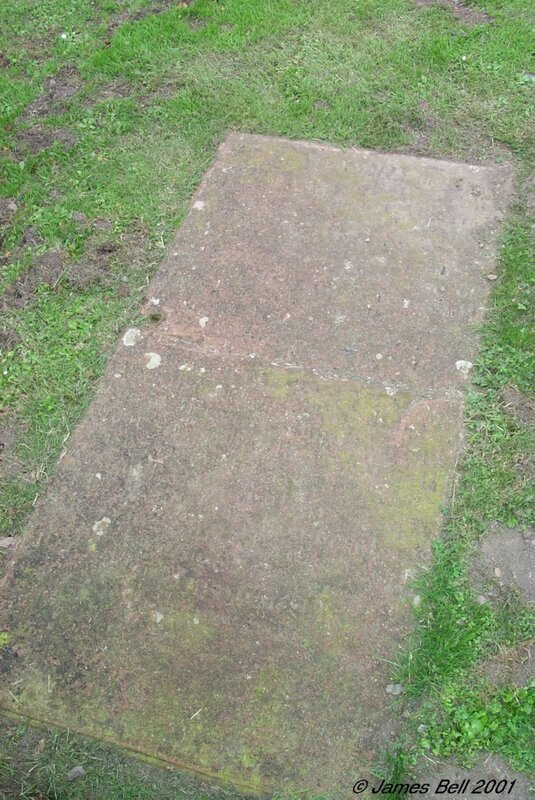 Likewise the remains of Margaret Copland and Robert Kirk her husband who both died in Auchengate, the former, the 24th June 1794, aged 26 years and the latter, the 4th March 1827, aged 48 years. 117 Erected to the memory of John Henderson, who died at Butterhole, on the 4th Sept. 1821, aged 76 years. 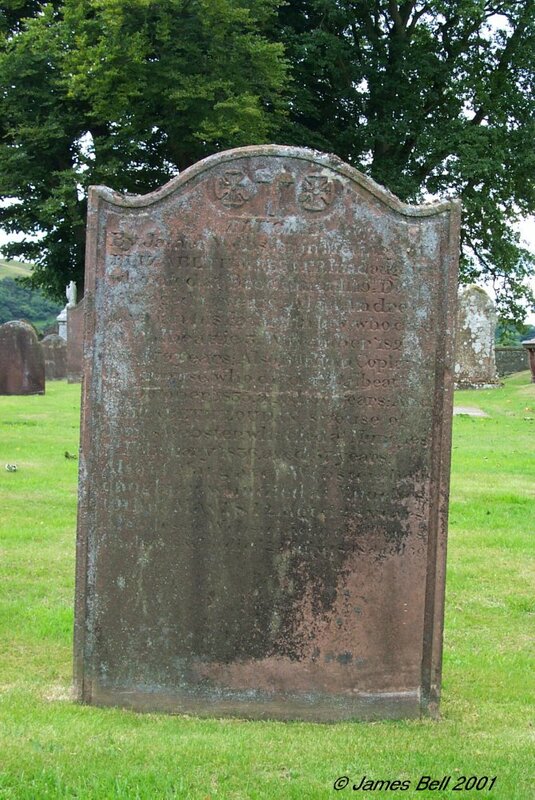 Also of Agnes Lowden, his spouse, who died on the 15th of December 1836, aged 79 years. Also of William Henderson their son, who died at Park Place, Parish of Rerrick, on the 18th of January 1841, aged 60 years. Also of George Henderson, their son, who died at Park Place, on the 15th day of June 1848, aged 31 years. Also of Margaret Henderson, their daughter, who died at Park Place on the 4th day of January 1851, aged 67 years. Also of the Rev'd. James Henderson, their son who died at Edinburgh, 20th Oct. 1855, aged 62y. Also of Thomas Henderson, their son who died at Park Place, Parish of Rerrick, on the 21st April 1860, aged 58 years. 118 In memory. Mr John McKnaught, min'r of Buittle, died May 7th 1792, in the 95th year of his age, and in the 56th of his ministry, and is interred here - along with an intimate and experimental acquaintance with the Gospel of Christ, he possessed the happy talent of conveying religious knowledge to his flock in a manner equally familiar and engaging - genuine piety, benevolence, humility & self-denial marked his private character - zealous exertion and indefatigable ------- distinguished his labours in that sacred ministry. Blessed is that servant whom his ------ when he cometh -------. 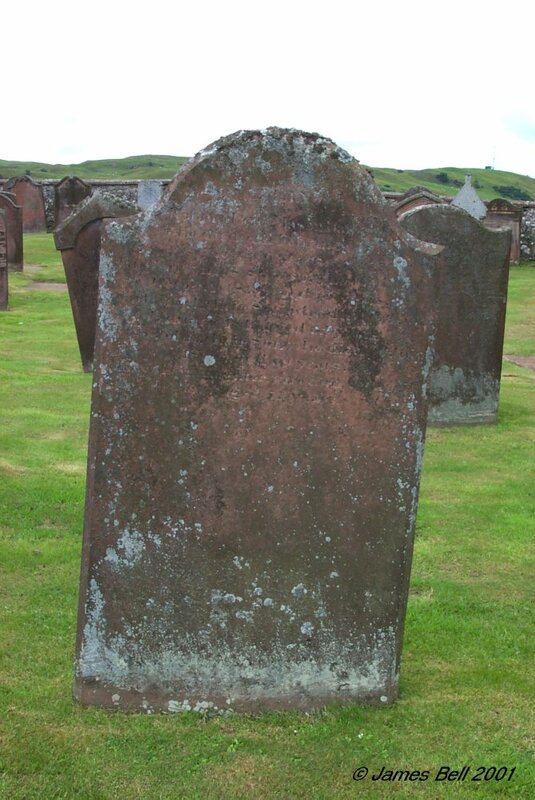 Also Margaret Gordon, his spouse, who died June 12th 1765, aged 67. 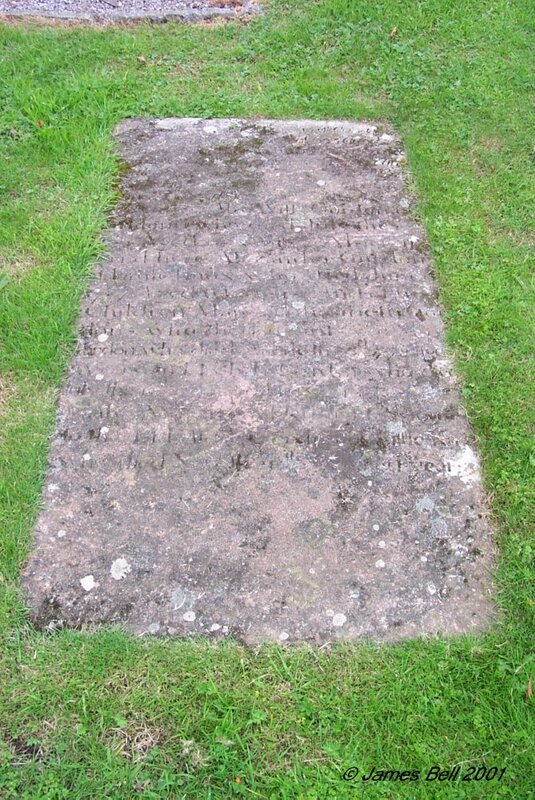 Also John McNaught, his son, who died May -- 1766 aged 24 years. 119 Memorial. 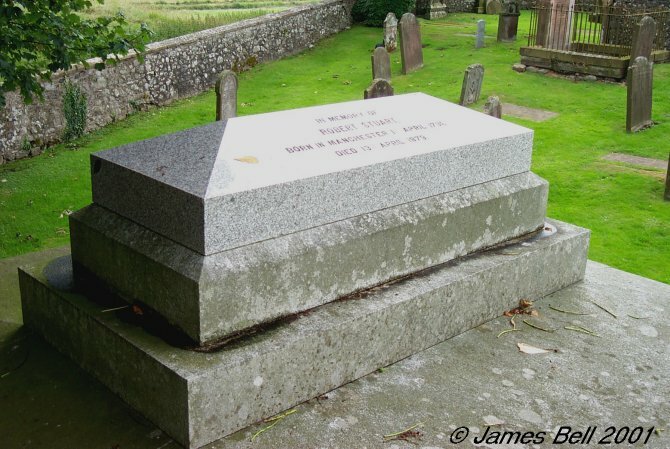 Thomas Raleigh, a native of Saline, Fifeshire, died Barchain 24th July, 1809, aged 63. 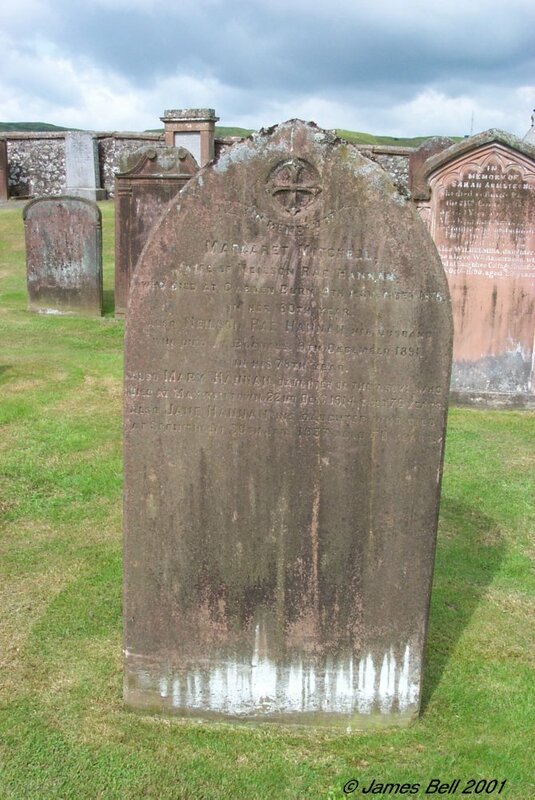 Jane Maxwell, relict, died 29 July 1822, aged 67. Their children Thomas Raleigh, died at Liverpool, 15 June 1840, aged 62. John, James, Ann, John, William died in infancy. John Raleigh, died 6 October 1825. Thomas Raleigh, died 11 March 1835. 120 Here lyes Jannet McWilliam, spouse to John Charters in Cloynyeards,, and who died October 12 1750, aged 59 years. Also here lyes the aforesaid John Charters, who died Feb. 23 1765, aged 72 years. 121 Here lyes John, James & Jean Telferts. Also Janet Telfer, died at Gardenburn, March 25th 1881, aged 97 years. Reverse: Samuel Telfert in Kirkennand, who died Jan. 6 1787 aged 64 years. 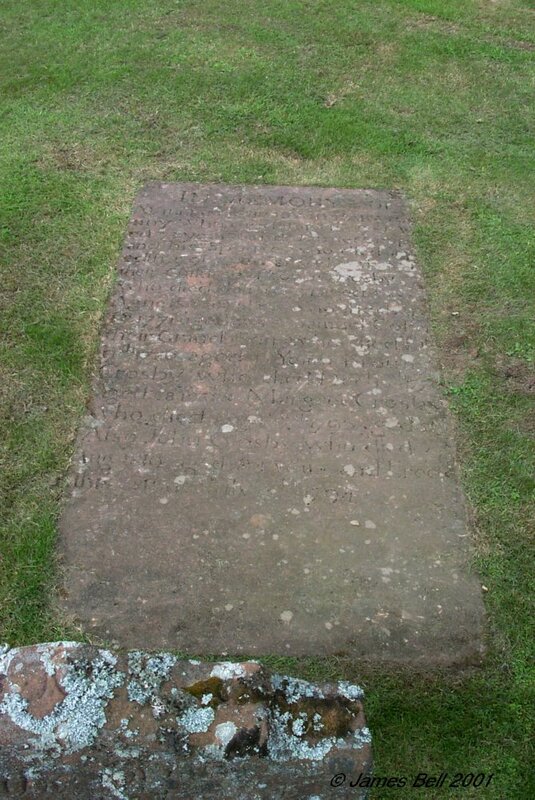 Also of Janet Charters, his spouse, she died April 24 1787, aged 65 years. 122 Erected by Lucia Black, in loving memory of her beloved husband William Halliday, who died at Palnackie, 27th Sept. 1901, aged 46 years. Also their sons John Black, who died at Palnackie, aged 5 years. James, who died in infancy. And Peter Moffat, aged 3 years. Also Lucia Margaret, dearly beloved daughter of James and Helen Welsh and grand-daughter of the above, died 2nd November 1915, in infancy. Also the above named Lucia Black, who died at Starryheugh, Troqueer, 8th June 1928, aged 72 years. To memory ever dear. Also Jane Halliday, last surviving daughter of above, who died at Chalemar, Rotchell Road, Dumfries, 31st August 1967, aged 72 years. 123 In memory of Isabella Murray, spouse of William Adamson, who died at Munshes, on the 18th of May 1857, aged 32 years. Also the above William Adamson, born 1st May 1815, died 23rd January 1886. 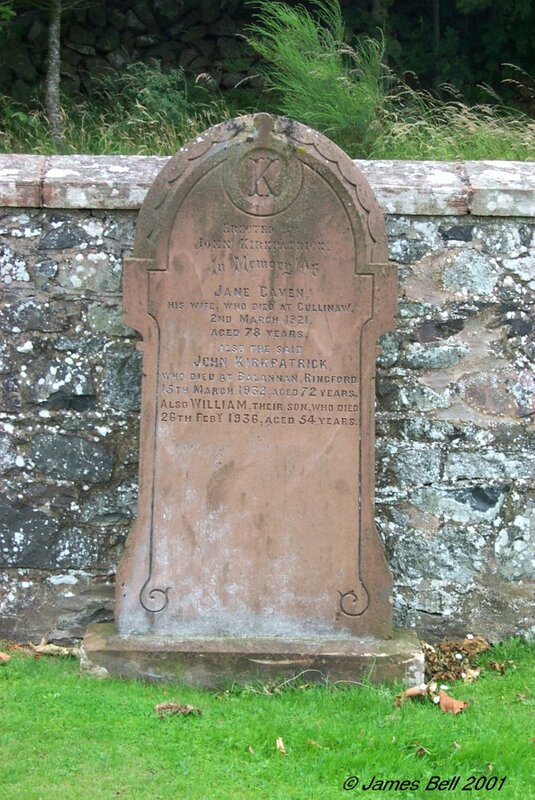 124 In memory of Katherine Caven, spouse of John Stitt, who died at Cloanshank, 3rd March 1815, aged 66 years. A loving wife and dutiful mother. And also of the above John Stitt, who died 5th May 1817, aged 72 years. 125 In loving memory of Helen Campbell, fourth daughter of Matthew Campbell, who died at Broomiebrae, 19th August 1905, aged 16 years. Also Sarah Margaret, his second daughter, who died at Broomiebrae, 6th May 1906, aged 21 years. Also Thomasina McTaggart, his third daughter, who died at Broomiebrae, 27th October 1907, aged 20 years and 7 months. Also the said Matthew Campbell, who died at Dumfries, 13th February 1917, aged 60 years. Also Jessie McTaggart, who died at Georgetown, Dumfries, 26th Sept. 1932, wife of above Matthew Campbell. 126 Erected by William Charters, to the memory of John and Jane Charters, his children; John, died 15th Nov. 1801, aged 8 years and Jane, died 1st Feb. 1806, aged 5 years. 127 David Wilson Muir, 1866 -1917. 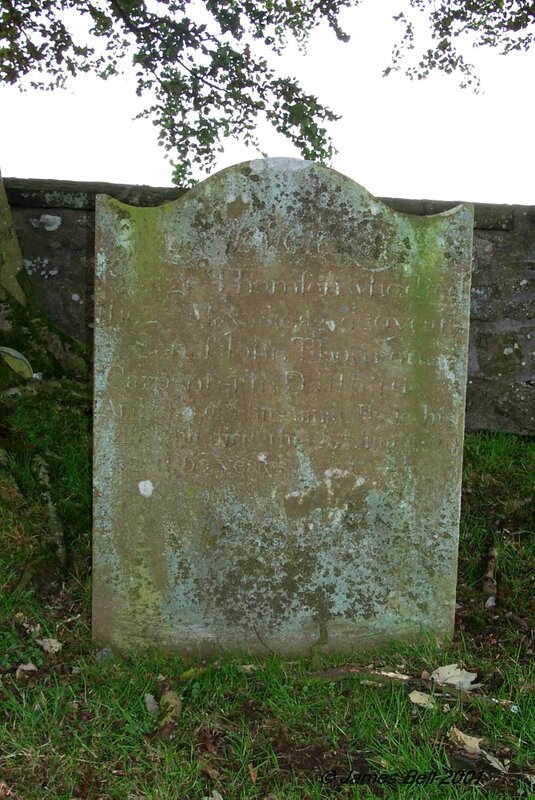 128 In memory of Matthew Wightman, son of William Wightman, tenant in Little Knox, who died July 1800 aged 15 years. 129 In memory of Margaret Clelland, spouse to John Broadfoot, who died April 7 1798, aged 62 years. Also of the said John Broadfoot, who died Dec. 1800 aged 57 years. 130 Here lyes Anna Hepburn, spouse to William Tod, Minister of the Gospel in Buittle, she died the 12th day of July 1706, in the 34th year of her age. Here lyes also William Todd, son of the foresaid Mr. Tod, who died the 17th day of May 1713, in the 12th year of his age. Also the Reverend Mr. William Todd, who was ordained here Sept. 21st 1699, and continued in the faithful exercise of his Ministerial Office till he died Oct'r. 24 1735. Also Janet Wright, his spouse, who died Nov'r. 15 1752 aged --. 131 Here lyes John Tod, Chyruregeon Apothecary, and father to Wm Tod, Min'st. of Buittle, he died Feb'ry. 1700 in the 81 year of his age. Here also lyes John Tod, Margaret Tod and John Tod, children to the foresaid Minister. Also James Tod, son to the foresaid Minister, who died Au'st. 12 1740, aged 8. 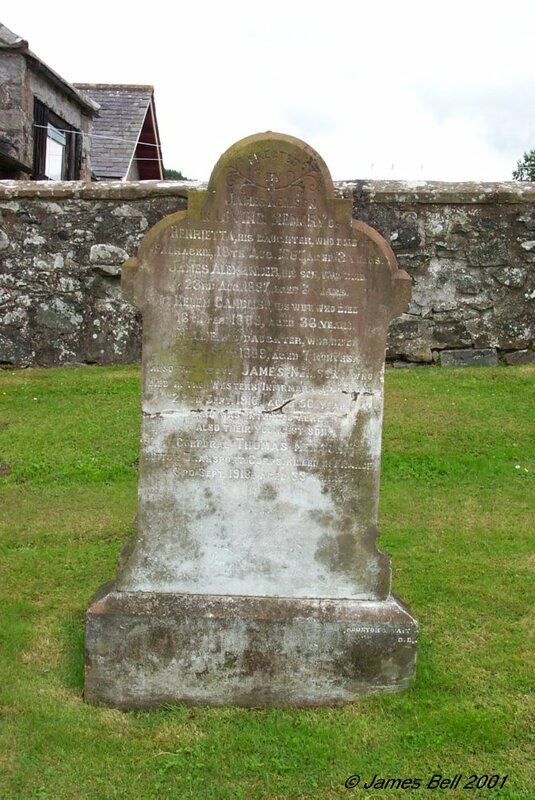 132 In memory of Mary McKie, who died at Dalbeattie, 18th October 1874, aged 60 years. R.I.P. 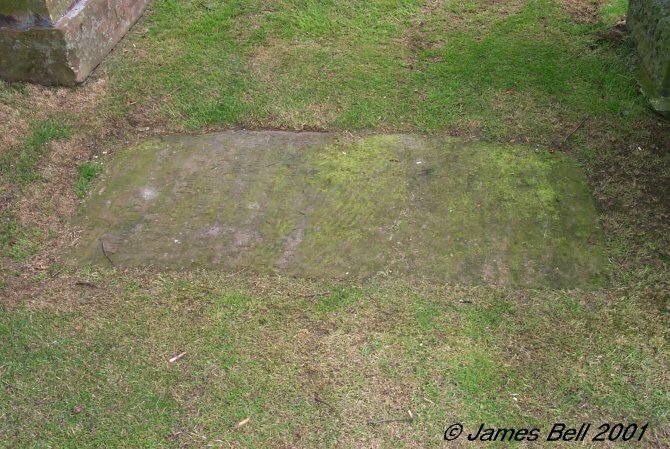 133 The burying place of John Black, in Hole of Gelston, where lye Mary McNish his spouse, who died Ap'l 11th 1768. Also Janet, George, Agnes, Margaret, James & Robert Blacks, their children. Also the said John Black, who died Jan'y. 17th 1783, aged 83 years. 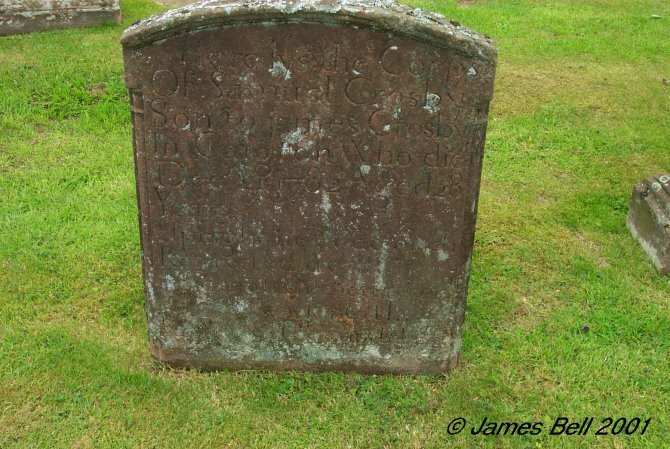 Reverse: Also here lyes John Black, son to John Black & Mary McNish, who died at Loch of Almerness, January 1st 1794, aged 57 years. 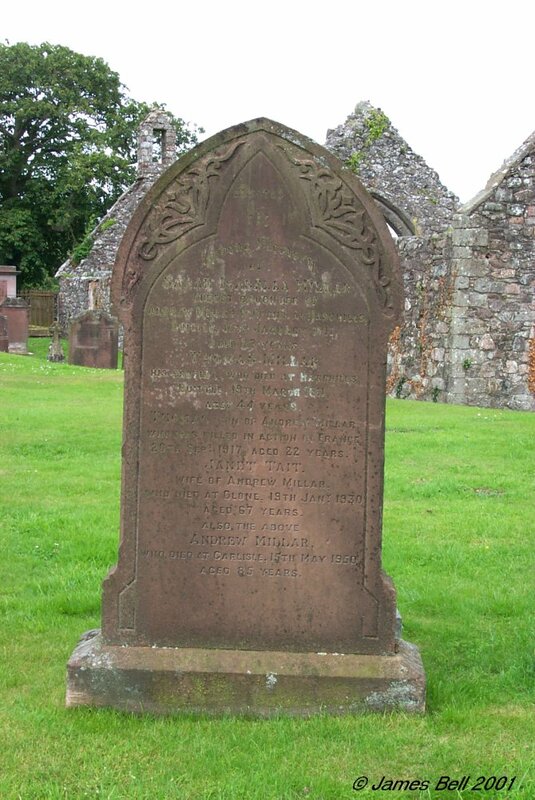 Also of Agnes McClune, his spouse, who died 16th January 1836, aged 82 years. 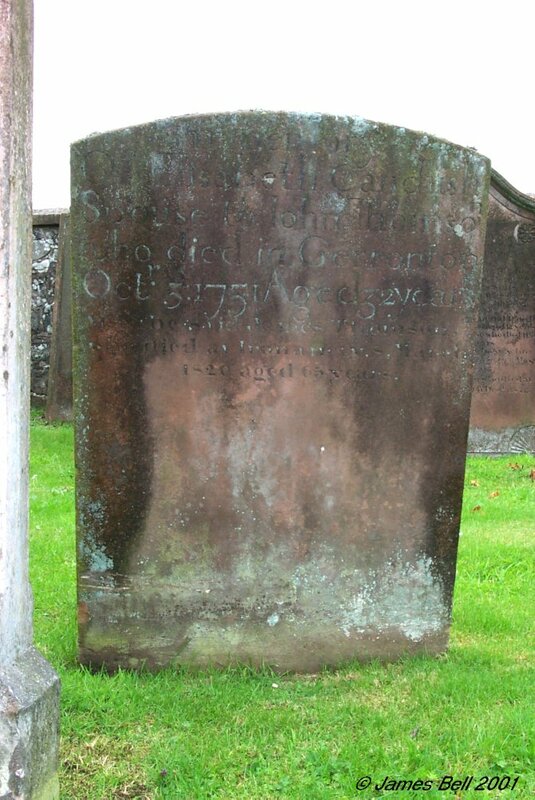 Reverse: Also George McNish, who died in Carton, 6th Nov. 1759, aged 85 years. And Nicholas Copland, his spouse, who died in Logan, Jan. 24th 1740, aged 62 years. 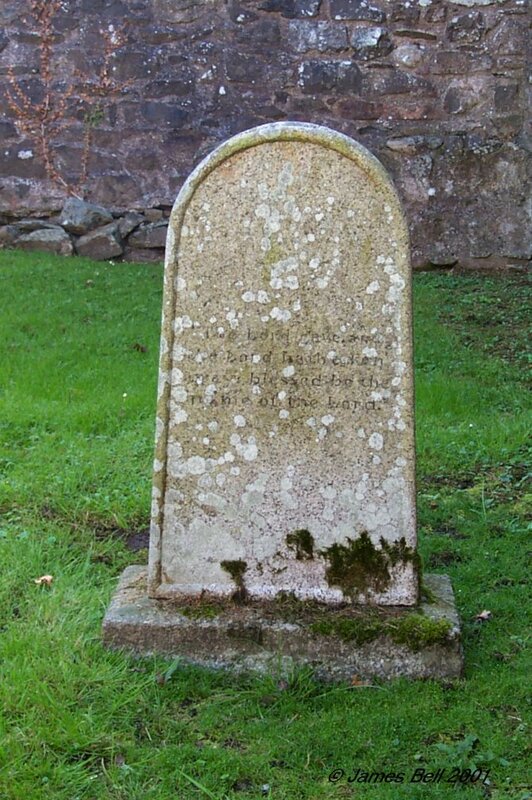 Also John McNish, their son who died in Logan, Nov. 22nd 1740, aged 30 years. Also Robert Watson, who died at Danvale Park, Parish of Crossmichael, 24th Feb'y. 1827, aged 73 years. Erected by Agnes McNish, his spouse & Robert Watson their son. 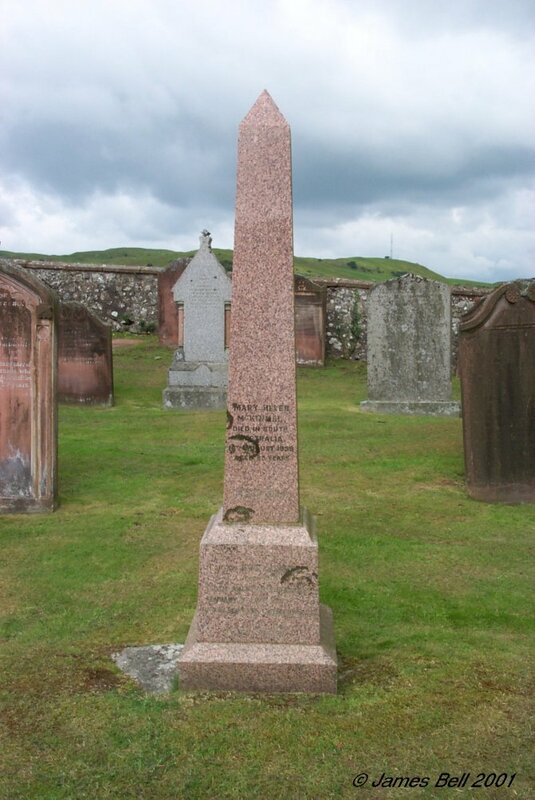 135 Erected to the memory of Edmund Watson, who died in Orchardton, 13th Oct. 1797 aged 80 years. 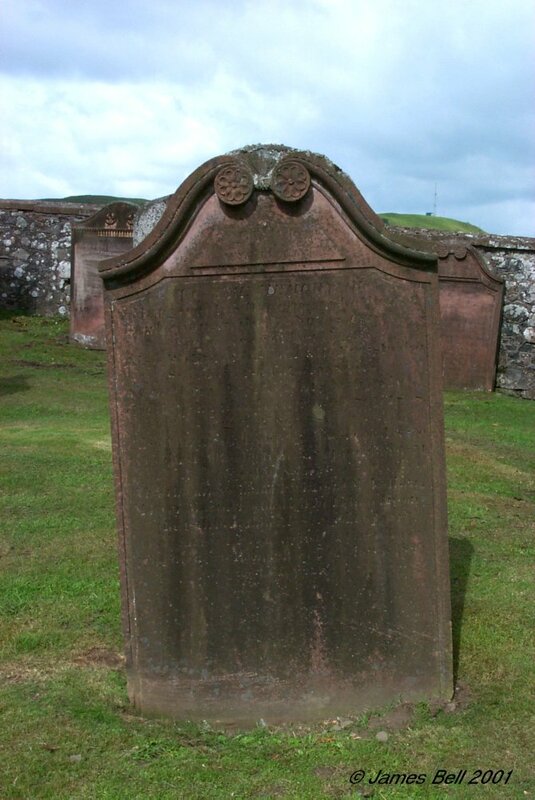 And of Jane Robison, his spouse, who died 5th Dec. 1791, aged 77 years. And of Samuel Watson, their son, who died 17th Oct. 1776, aged 26 years. 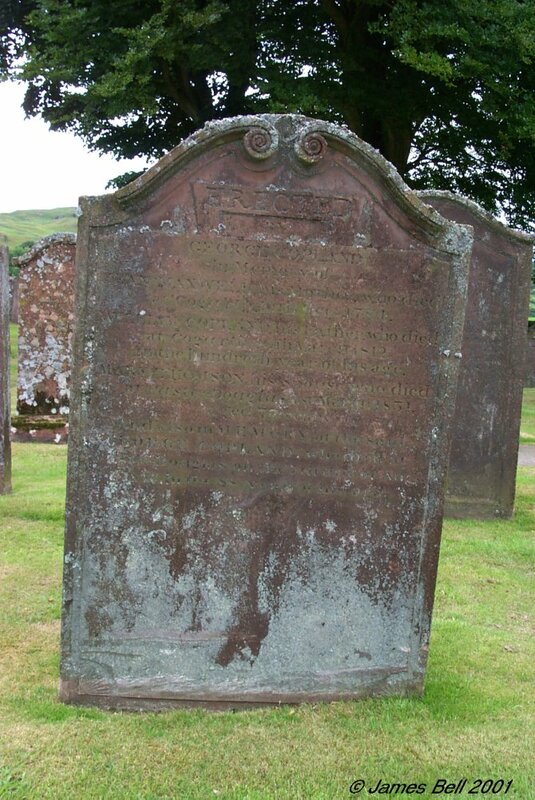 136 Here lyes Nathaniel Veitch, steymaker in Moffat, who died Sept. 30th 1748, aged 47 years. Erected by Elizabeth Veitch, his spouse. 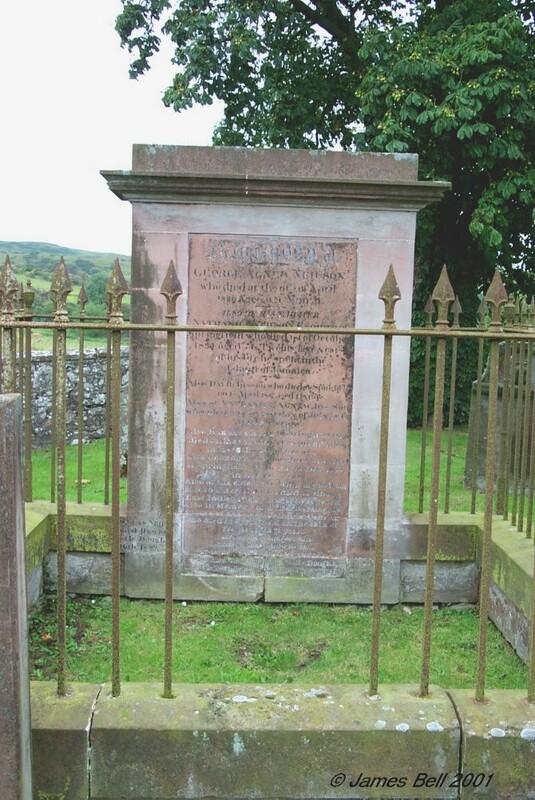 137 In memory of John McKnaught, who died at Kirkstyle of Buittle, March 24th 1793, aged 56 years. 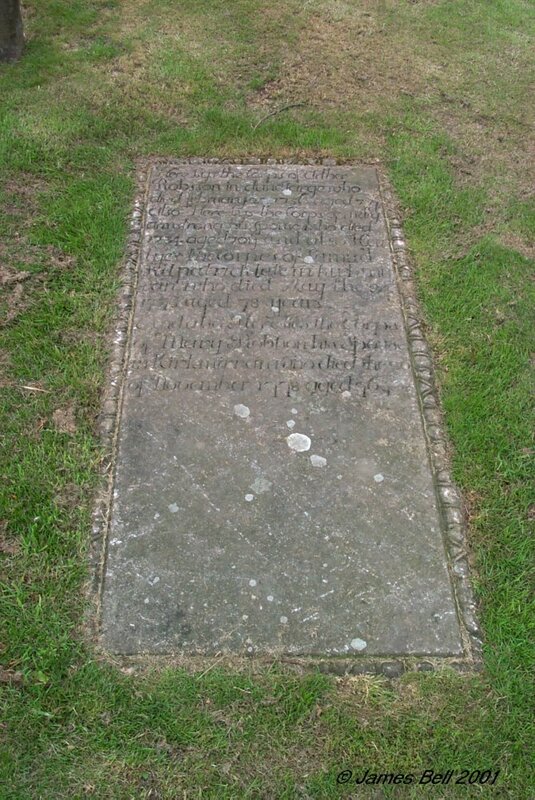 Also George Crosbey, his grandson, who died Jan. 15th 1793, aged 2 years. 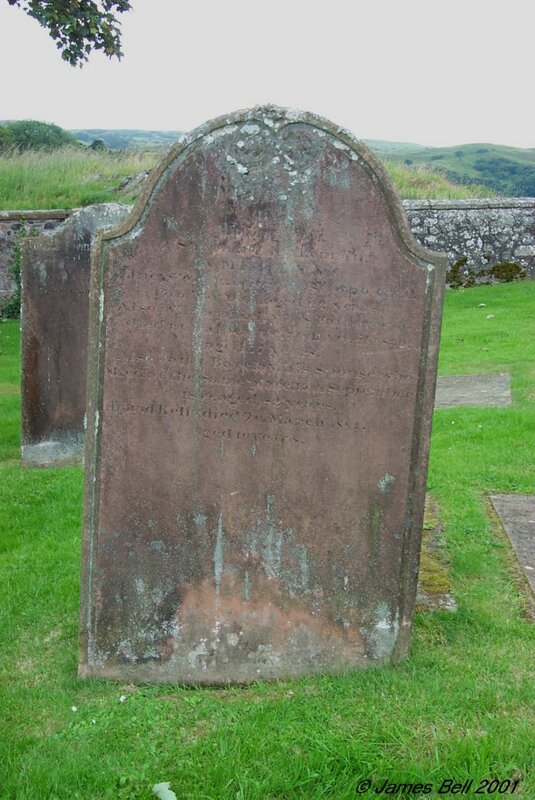 Also of Sarah McEune, his spouse, who died 14th Jan. 1808, aged 74 years. 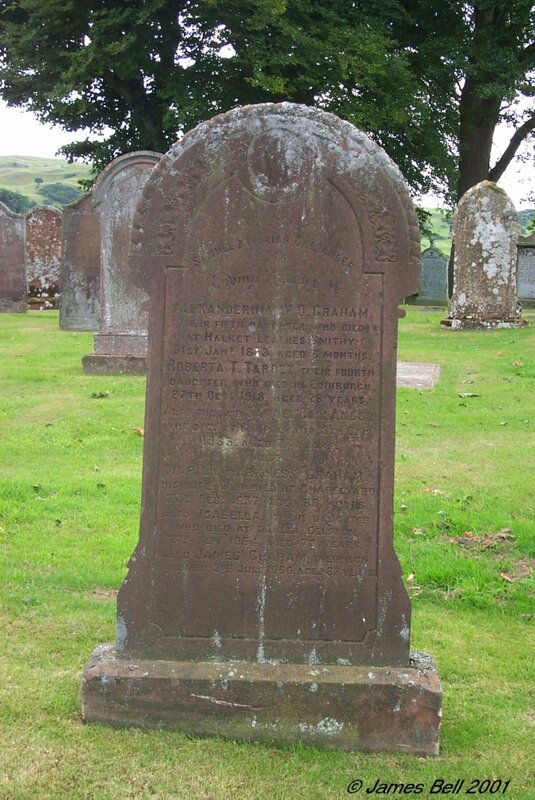 And of Sarah McKnaught, spouse of James Copland, in Castle Douglas, who died there, the 9th Nov. 1810 aged 48 years. 138 Left:- In memory of Margaret, youngest daughter of Robert McKnight, and Jane McLean, who died at Wallington, Surrey, 3rd Feb. 1893, aged 49 years. Alexander, their second son, late of Barlochan, who died at Gothenburg, Nebraska U.S.A., 25th January 1897, aged 67 years. Elizabeth Sarah, their eldest daughter, who died at Portslade, Sussex, 18th February 1905, aged 80 years. Joseph Younghusband, their youngest son, who died at Wallington, Surrey, 17th January 1917, aged 77 years. 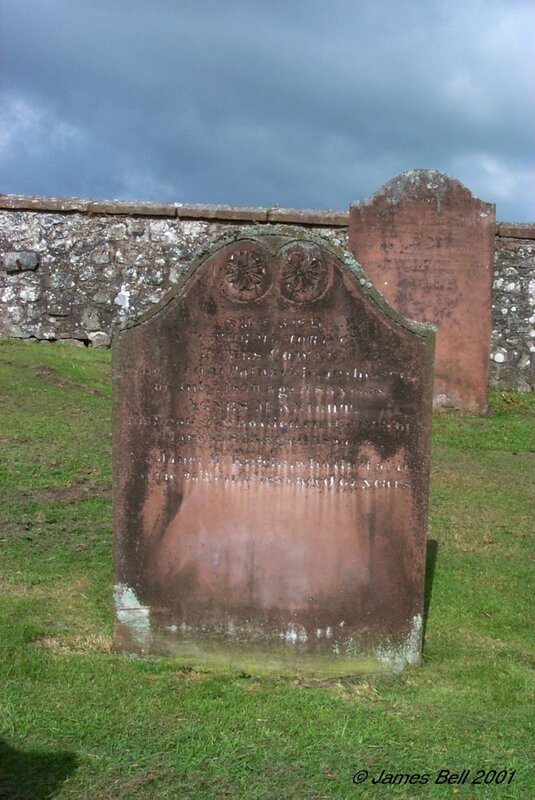 Centre:- In memory of Elizabeth Heron, wife of Robert McKnight of Barlochan, who died 1st July 1822, aged 67 years. 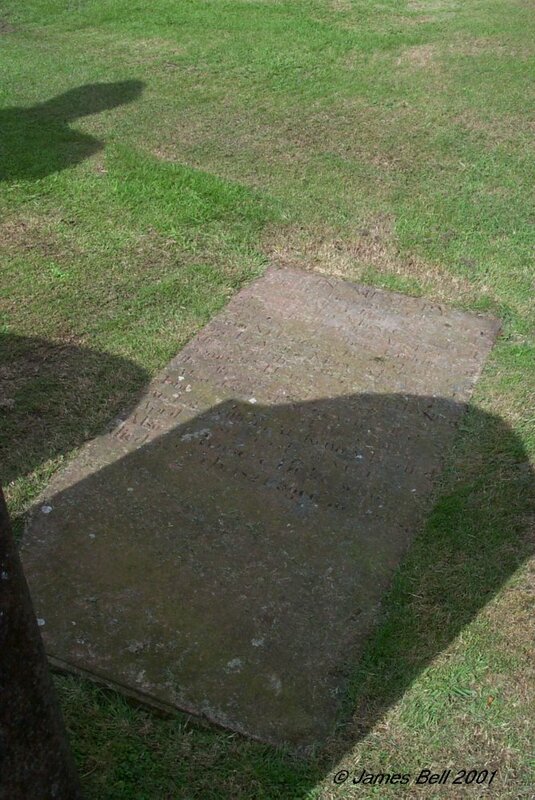 John, their eldest son, who died in Liverpool, 1st May 1806, aged 20 years & is interred in Trinity Churchyard there. 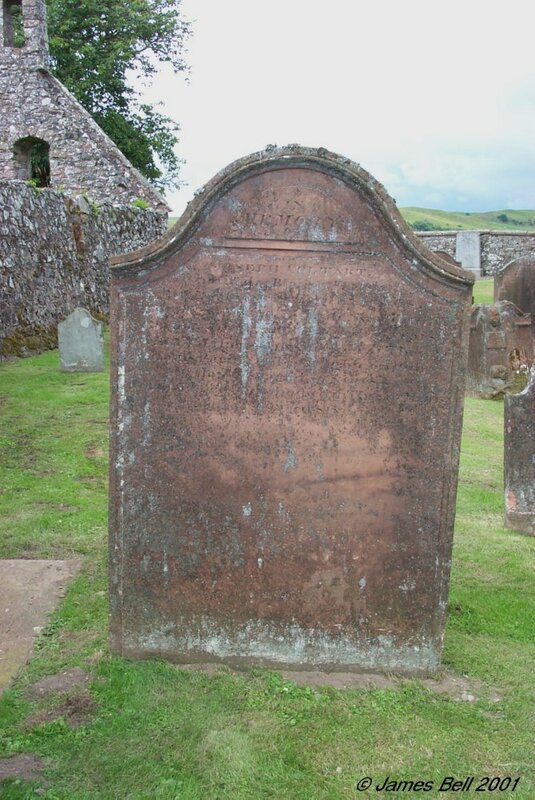 Samuel, their youngest son, who died at Barlochan, 13th Dec. 1839, aged 43 years. 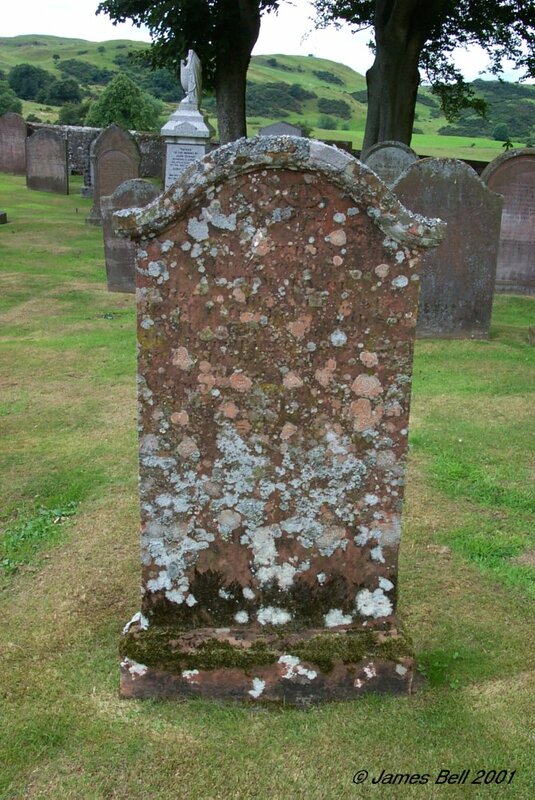 The said Robert McKnight, who died at Barlochan, 2nd September 1844, aged 100 years. Andrew, their third son, who died 22nd Nov. 1844, aged 51 years. Mary Gordon, their eldest daughter, who died at Douglas, Isle of Man, 12th August 1846, aged 56 years. Jane, their youngest daughter, relict of James Martin, who died at Barlochan, 2nd Nov. 1854, aged 57 years. Isabella, their second daughter, wife of William Douglas Kirkpatrick, who died at Newcastle on Tyne, 26th May 1856, aged 62 years. 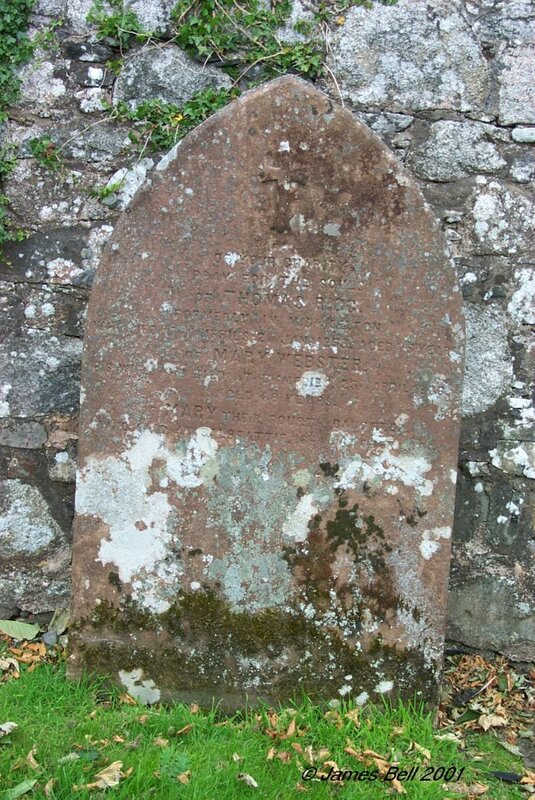 Right:- In memory of Jane McLean, wife of Robert McKnight, of Barlochan, who died at Benrhydding in Yorkshire, 16th June 1856, aged 54 years. Robert their eldest son, who died at Barlochan, 24th Nov. 1844, aged 17 years. The said Robert NcKnight, who died at the Airlower, Wigtonshire, 15th October 1858, aged 70 years. Jane Susan, their second daughter, wife of John Wilson Browne, who died at Birmingham, 14th May 1859, aged 33 years. Also William Douglas, who died at Calcutta, 18th of Sept. 1865, aged 28 years. John Samuel, who died at Longfield, near Birkenhead, 14th Nov'r. 1869, aged 34 years. 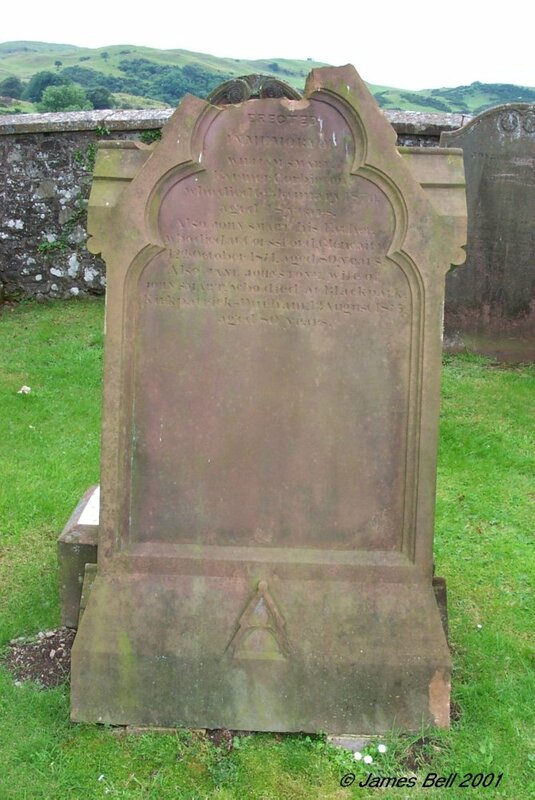 139 In memory of Robert Reid, Mason, Dalbeattie, who died 7th February 1825, aged 66 years. Jane Carson, his spouse, who died 3rd October 1839, aged 75 years. Nathaniel, their son who died 22nd January 1843, aged 32 years. Also John, their son, who died 5th July 1866, aged 69 years. Mary, their daughter, who died 3rd April 1873, aged 72 years. 140 In memory of Helen Dickson, spouse of William Reid, Joiner, Dalbeattie, who died 7th May 1852, aged 34 years. The above William Reid, who died 6th June 1859, aged 51 years. Mary Jane, their daughter, who died 10th January 1861, aged 14 years. Nathaniel, their son, who died 10th September 1866, aged 20 years. Robert, their son, who died 15th March 1908, aged 68 years. 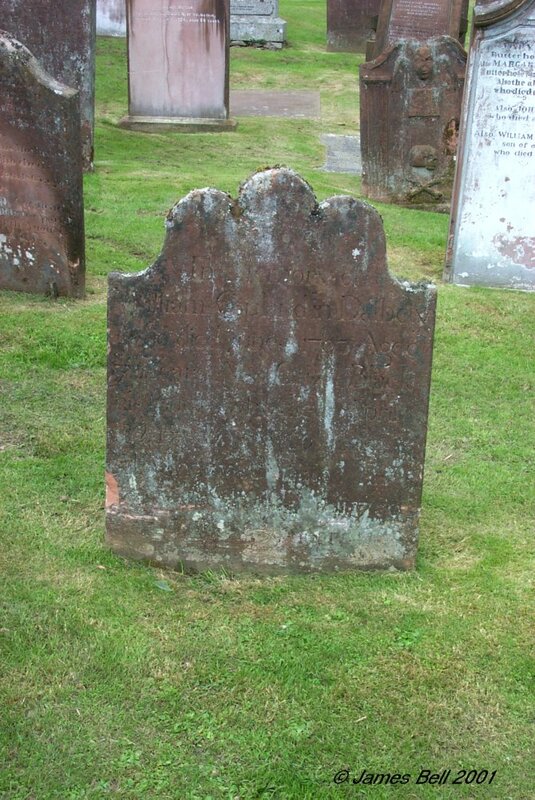 142 Here lyes the corpse of Edward Riddick, in Mains of Kelton, who departed this life April 20th 1749, aged 61 years. 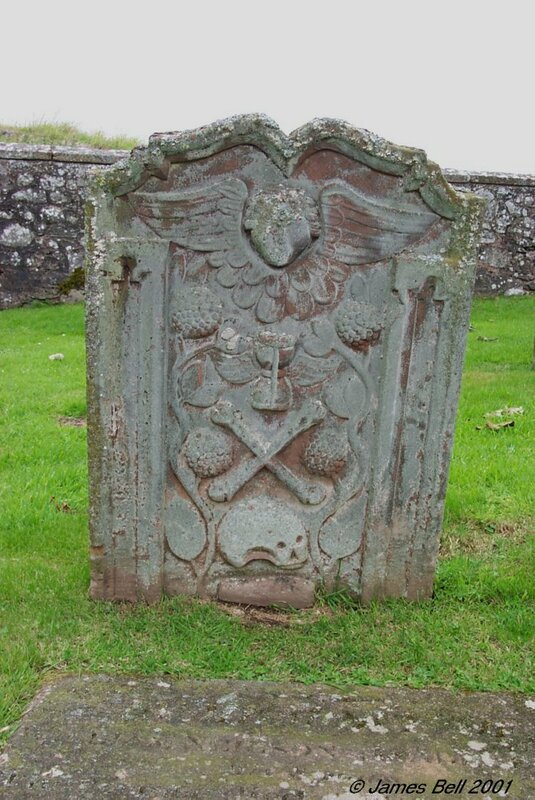 Also Hugh Riddick, his son, who departed this life May 1749, aged 19 years. Also John Riddick, his son, who departed this life May 29th (no year) aged 16 years. As also Margaret -----, spouse to the above Edward Riddick, who died ------- 1799, aged 82 years. Also of Charles Jardine, son of John Jardine in Palnackie, who died 18th Dec'r 1840, aged 33 years, Also David Lowden, grandson to John Jardine who died 7th April 1843, aged 12 years. 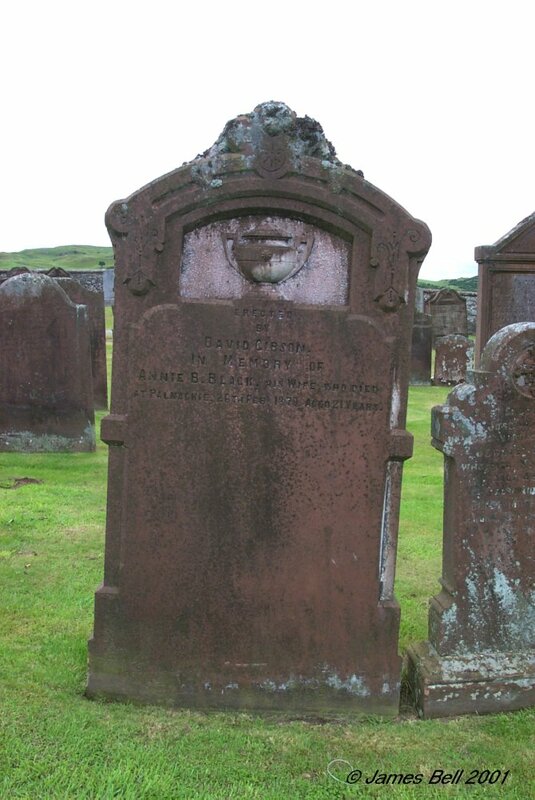 Also Clarke Crosbie, spouse to John Jardine, who died 25th June 1845, aged 63 years. 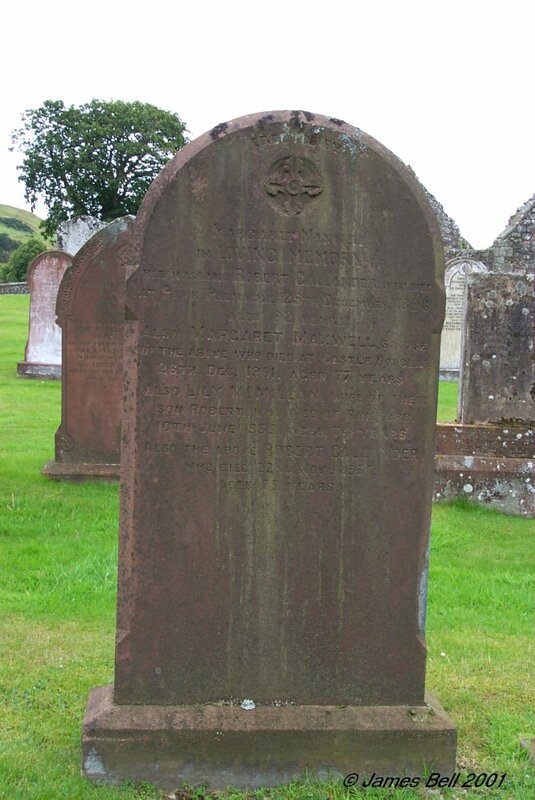 143 In memory of Janet McKnaught, spouse of Francis Maxwell, of Breoch, who died on the 22nd Nov'r. 1852, aged 47. Margaret Maxwell, their daughter, who died at Sion Hill Convent, Blackrock, near Dublin, on the 28th April, 1860, aged 17. Francis Edward Maxwell, their son, who died on the 10th March 1861, aged 23. John Maxwell, their son, who died on the 13th November 1866, aged 21. 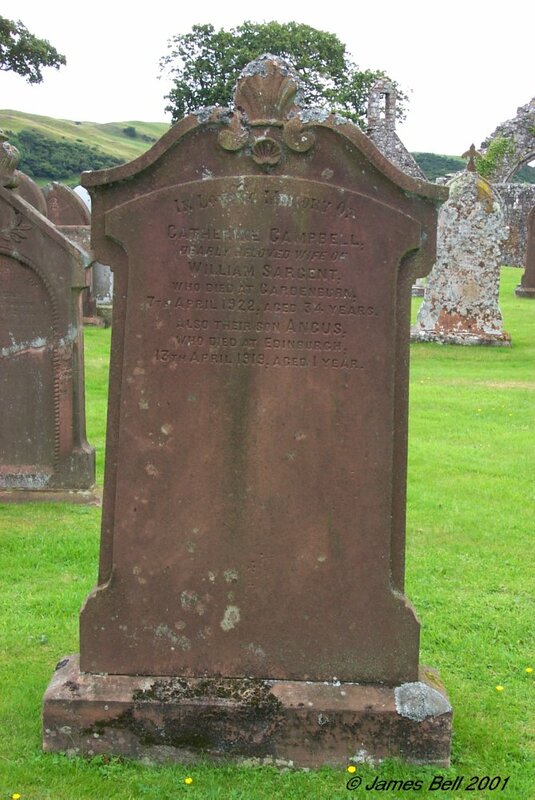 Francis Maxwell, of Breoch, who died on the 15th March 1867, aged 63. 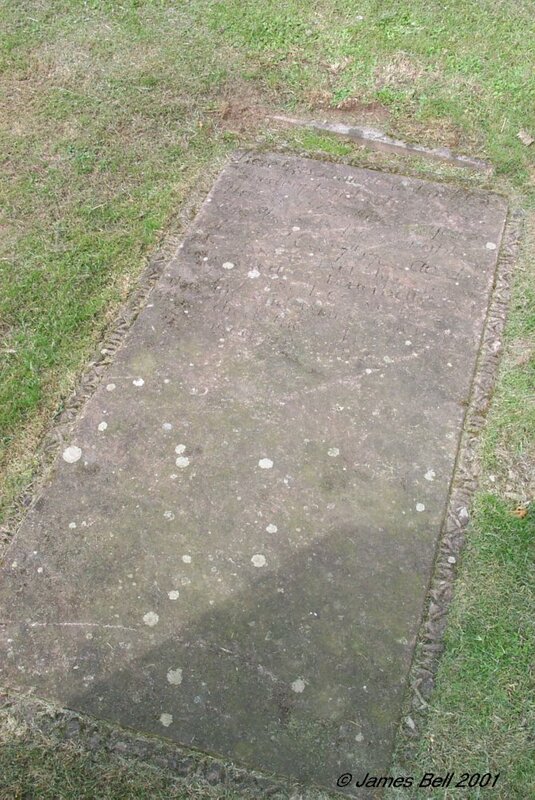 Robert Maxwell of Breoch, died at Bournmouth, 13 March, 1874, aged 38 years. Requiscant in peace. 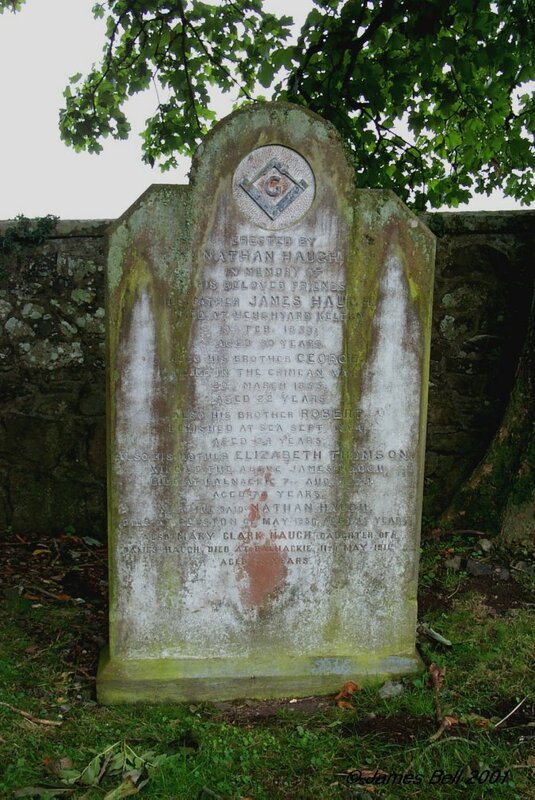 144 Erected in memory of Barbara Maxwell, heiress portioner of Breoch, spouse of Alexander Maxwell, of Balmangan, who died Dec'r 1716, aged 31 years. 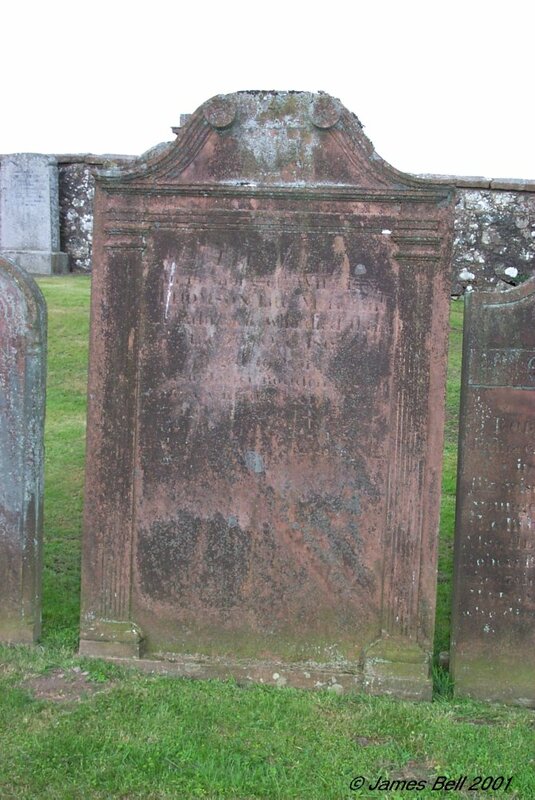 Robert Maxwell of Breoch, their son, who died the 12th of May 1780, aged 71 years. Mary Maxwell, who died the 27th of May 1783, aged 10 years. And Barbara Maxwell, who died 22nd of Nov. 1785, aged 18 years. 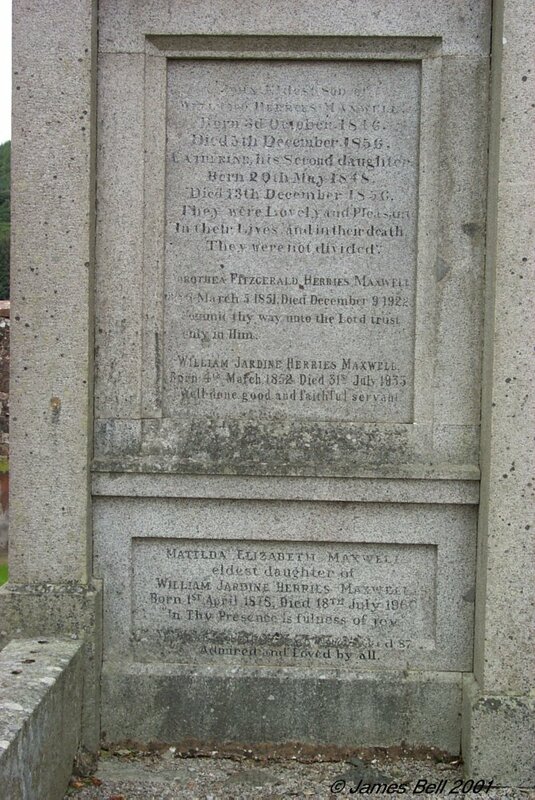 Children of the said Robert Maxwell and Elizabeth McBurnie, his spouse, who died the 31st Dec. 1805, aged 69 years. 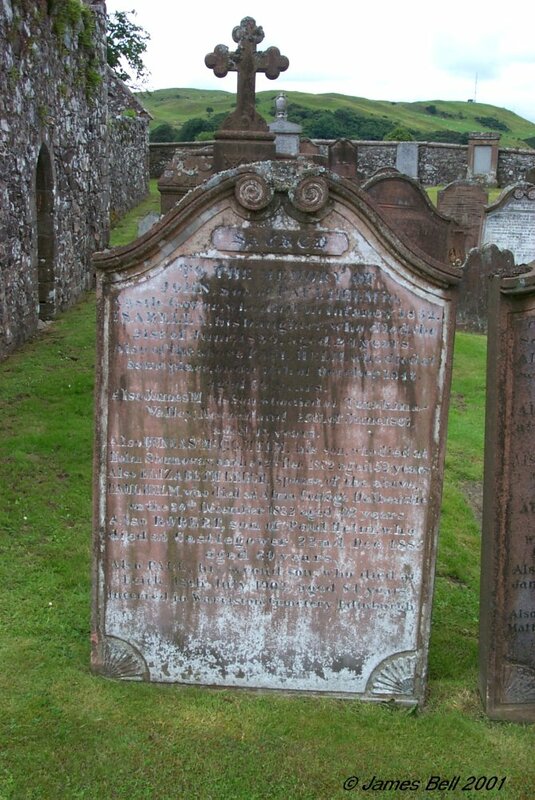 Also of Mary Ann Maxwell, daughter of Robert Maxwell of Breoch, who died 14th of September 1824, aged 17 years. Margaret Maxwell, her sister, who died the 12th of July 1831, aged 22 years. And their mother, Mary Rigg, spouse of the said Robert Maxwell, who died May 1832, aged 55 years. 145 Sacred to the memory of John, son of Paul Helm, in Castle Gower, who died in infancy, 1832. Isabella, his daughter who died the 21st of June 1839, aged 24 years. Also of the above Paul Helm, who died at same place, on the 10th of October 1843, aged 59 years. 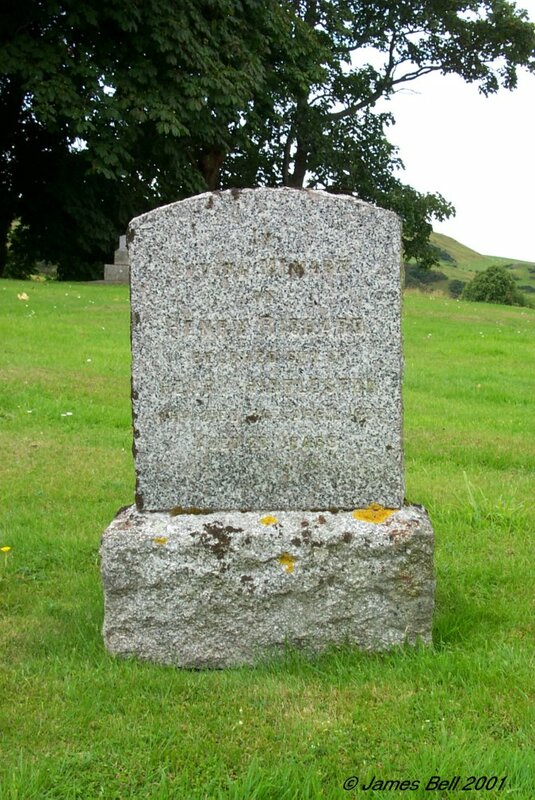 Also James M., his son, who died at Turakima Valley, New Zealand, 25th of June 1867, aged 43 years. Also Dundas McQ. G. Helm, his son who died at Holm Stornoway, on the 12th of Dec. 1882, aged 52 years. Also Elizabeth Leech, spouse of the above Paul Helm, who died at Alma Cottage, Dalbeattie, on the 20th December 1882, aged 92 years. Also Robert, son of Paul Helm, who died at Castlegower, 22nd Dec. 1885, aged 60 years. Also Paul, his second son, who died at Leith, 12th July 1902, aged 84 years. Interred in Warriston Cemetery, Edinburgh. 146 Sacred to the memory of Agnes, youngest daughter of Matthew Marchbank, who died at Screel, 17th July 1913, aged 30 years. Also the above Matthew Marchbank, who died at Screel, 28th September 1913, aged 73 years. 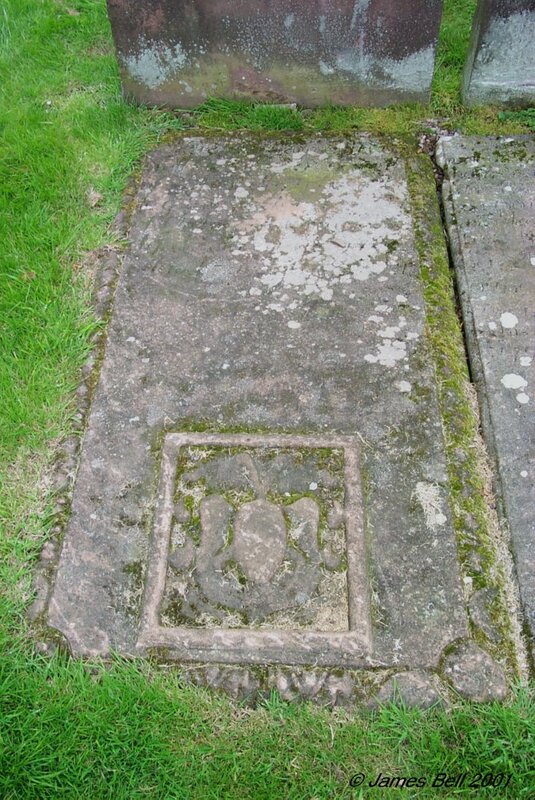 Also Isabella Helm, his wife, who died at St. Ninians Place, Castle Douglas, 4th Jan'y. 1922, aged 74 years. Also James Philip, of 23 Woodvale Avenue, Giffnock, his son-in-law, who died at Little Knox, 26th May 1934. Also Isabella Devorgilla, his third daughter, wife of Alexander Helm, who died at Edinburgh, 13th July 1933. 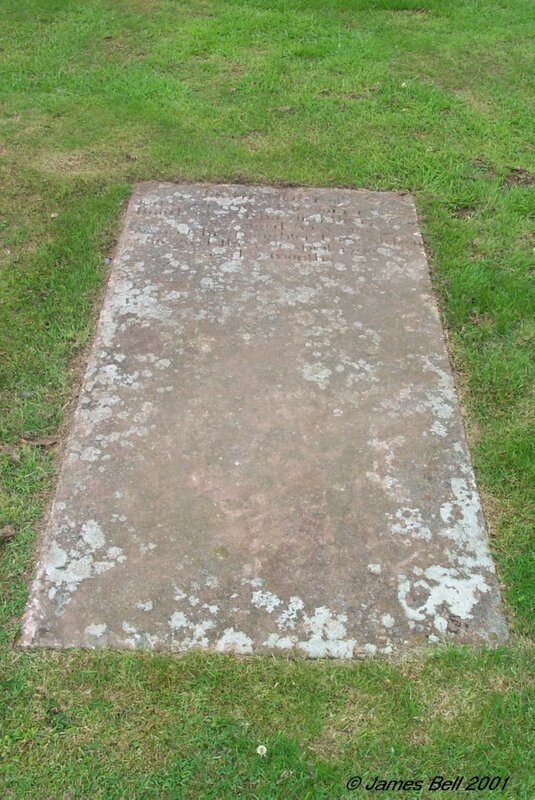 Interred in Castle Douglas Cemetery. Also Jane Marchbank, widow of above James Philip, who died at Glasgow, on the 28th July 1955. Also Janet Helm, eldest daughter of the above Matthew Marchbank, who died at Castle Douglas, on 20th December 1955. 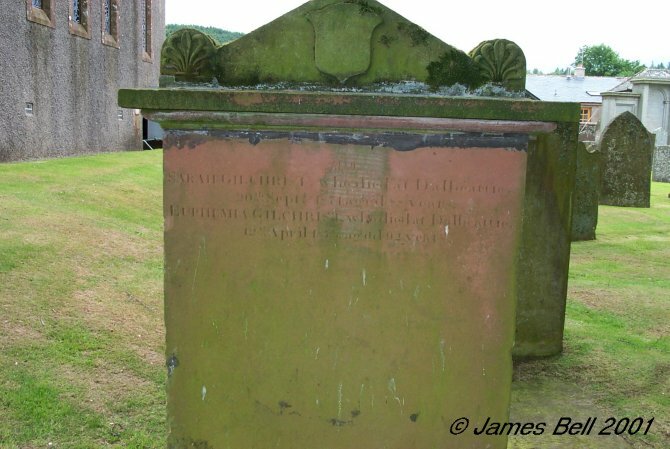 147 Here lyes James Morison in Meikle Knox, who dyed there ---- 18th 1717, aged 61 years. Here also lyes Grissell Paterson, his spouse, who died March 4th 1733, aged --. 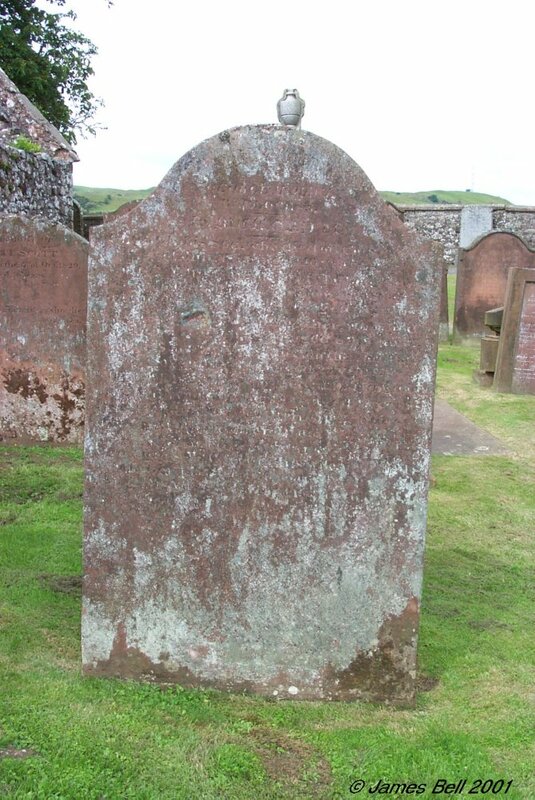 Here also lyes James Morison, their son, in Meikle Knox, who dyed October 4th 1734, aged 30 years. 148 In memory of Mary T. Wilson, wife of Dixon W. Black, who died 17th April 1889, aged 51 years. Also of their children, Lewis, who died 28th April 1878, aged 5 months, Thomas, who was lost at sea, 1883, aged 21 years. John, died 25th March 1889, aged 29 years. Dixon, died at Aden, Arabia, 17th September 1896, aged 32 years. Also the above Dixon Wilson Black, who died at Palnackie, 11th Dec'r. 1897, aged 67 years. 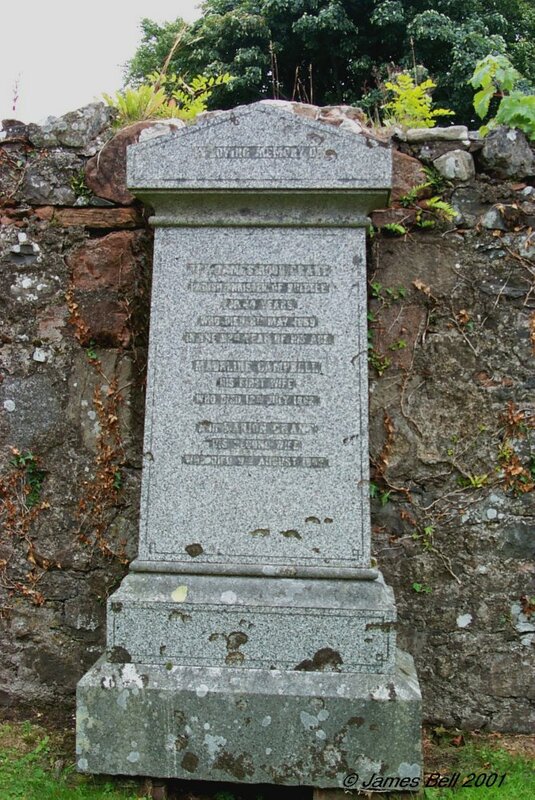 149 Erected in memory of Henry Maclellan, Ernespie, who died there on the 13th May 1851, aged 76 years. 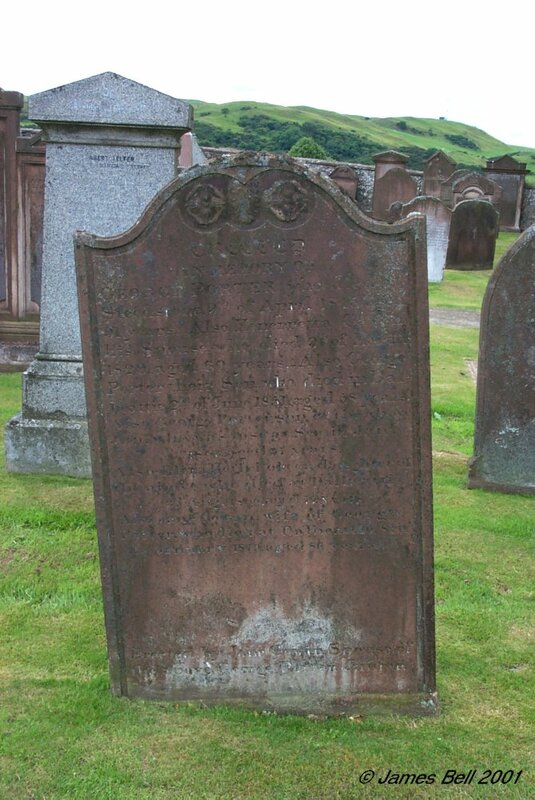 Also Margaret McLellan, his wife who died on 18th June 1843, aged 77 years. 150 In memory of Robert Muir, who died at Loch Hill, Palnackie, 10th February 1903, aged 76 years. 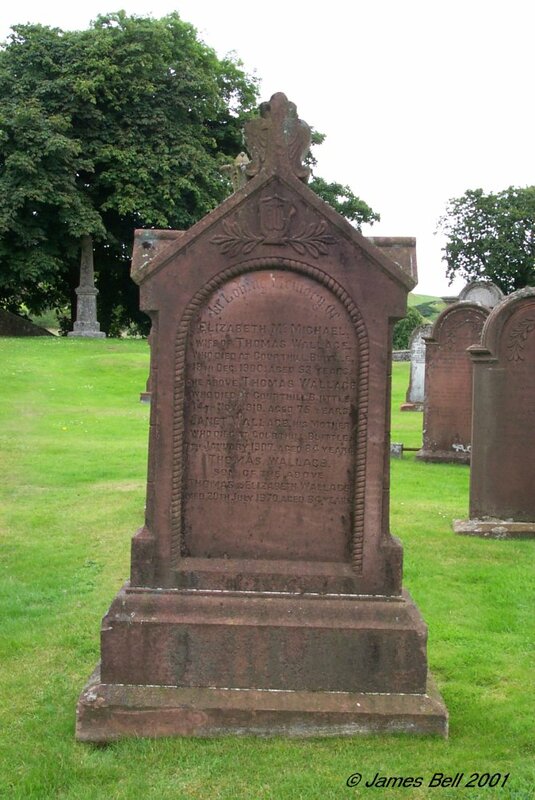 Also Marion Kirkpatrick, his wife, who died at Troon, 23rd May 1911, aged 75 years. 151 In loving memory of Robert Telfer, died at Craignair Cottage, 13th June 1886, aged 80. Elizabeth Duncan, his wife who died same place, 3rd Feb'y. 1887, aged 84. Elizabeth, eldest daughter, died at Hamilton, Canada, 12th Dec'r. 1896, aged 61. Anna, third daughter, died at Manchester, 13th April 1908, aged 68. Georgina, second daughter, died at Craigshall, Auchencairn, 20th March 1916, aged 78. Mary, youngest daughter, died at Craigshall, Auchencairn, 11th March 1918, aged 73. Helen fourth daughter, died at Manchester, 16th Jun 1929, aged 86. "Resting." 152 In memory of Sarah Black, wife of Robert Hunter, who died at Mill of Buittle, on the 4th of June 1881, aged 64 years. The above Robert Hunter, died 10th Nov. 1902, aged 84 years. 153 Erected by John Mein, in memory of his sister Margaret, who died at Palnackie 26st of June 1875, aged 67 years. Also the above John Mein, who died at Palnackie, 15th of October 1884, aged 81 years. 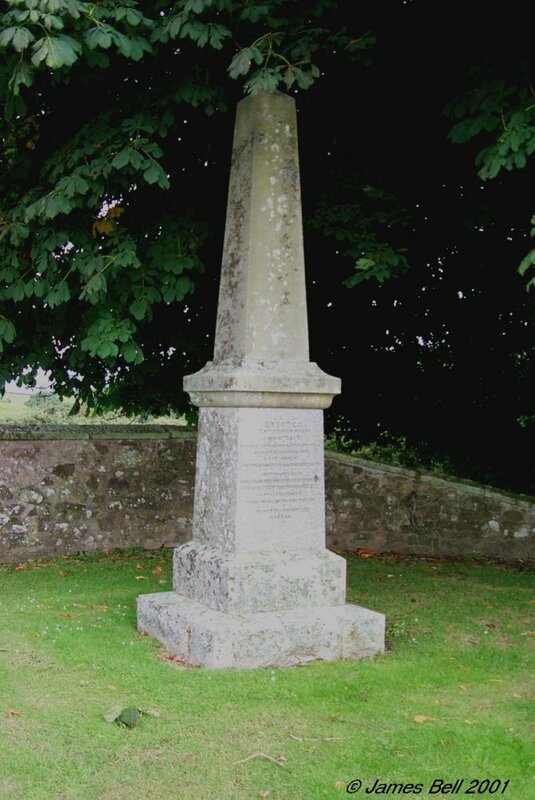 154 Erected by John Heron, of Caigton, to the memory of his son Robert, who died 18th June 1818, aged 26 years. Also of Agnes McCartney, spouse of the above John Heron, who died 4th May 1822, aged 60. And the said John Heron, who died Nether Third, Parish of Kelton, on 23 of June 1823, aged 79 years. And of Nathaniel, their son, who died Castle Douglas, 27 October 1840, aged 50. 155 Erected by Agnes Davidson, in loving memory of John Maben, her husband who died at Buittle Mains, 24th May 1893 aged 42 years. David Maben, her son (Pte., 10th Batt., Australian Infantry) killed in action in France, 21st August 1916, aged 24 years. 'Thy will be done.' Agnes Davidson, the above named, who died on 16th Dec'r. 1928, aged 75 years. "Her end was peace." 157 Erected by William Candlish in memory of his daughter, who died in Palnackie 20 September 18(39), Also the above William McCandlish, who died Palnackie April 1878, aged -- , and of his wife Mary Rigg, who died Palnackie -.-.18- 4, aged 76. 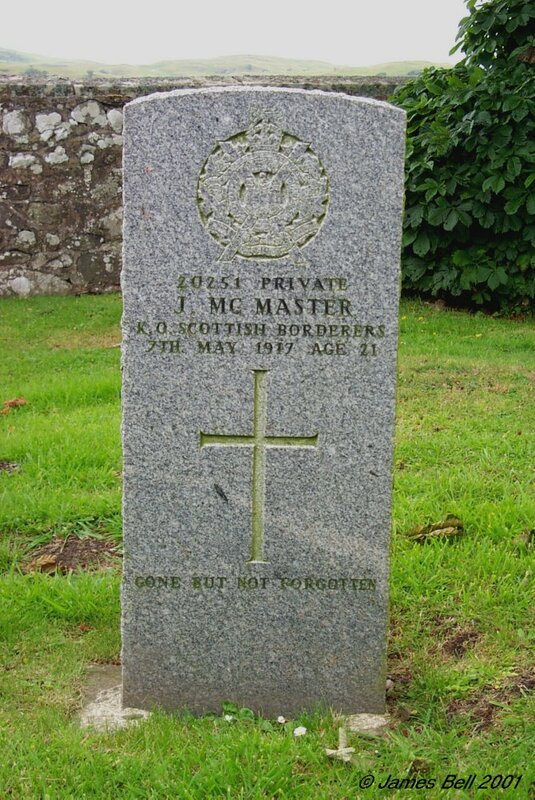 Reverse: In memory of John McMaster, mariner, who died at Palnackie in 1882, aged 54 years. 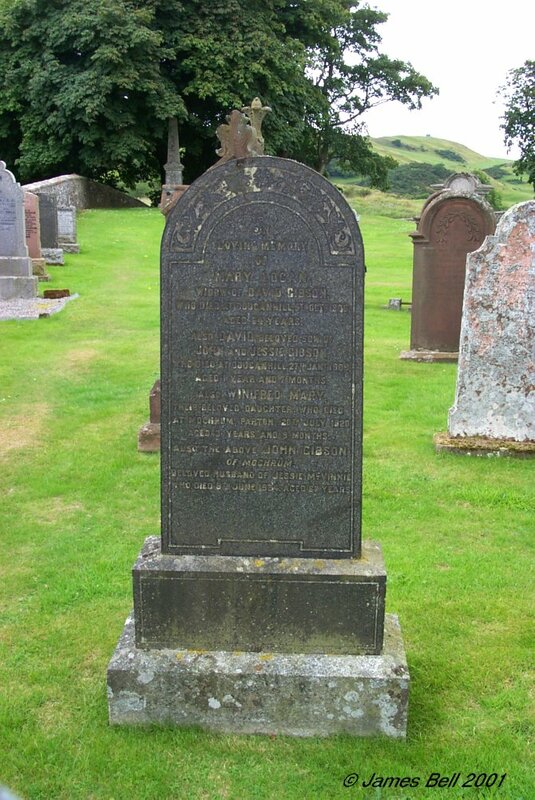 Agnes Candlish, his wife, who died at Dalbeattie 19th Dec. 190(8), aged 81 years. Mary, their daughter, who died at Liverpool in 1867, aged 18 years. James, their son, who was lost at sea in 1883, aged 25 years. Thomas, who died in infancy. 158 Sacred to the memory of John Grierson, student of medicine, son of James Grierson, farmer in Caigton, who died the 7th April 1836, aged 22 years. Also James Grierson, who died at Caigton 29th Nov. 1851, aged 86 years. Also James Grierson, grandson of the above, who died 2d Nov. 1848, aged 4 years and 2 months. Thomas Grierson, died at Caigton 10th May 1856, aged 35 years. 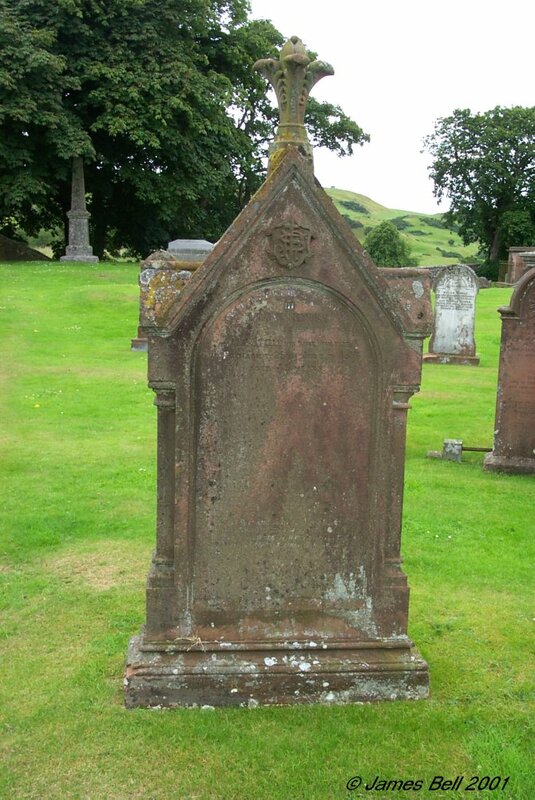 Also Isabella McMillan, wife of James Grierson, who died at Caigton on the 6th September 1857, aged 78 years. Also Ellen Grierson, grand daughter of the above James Grierson, who died at Kirkland, Urr, 30th March 1876, aged 33 years. Also James Clark McMichan Grierson who died at Haugh of Urr, 21st June 1882, aged 33 years. 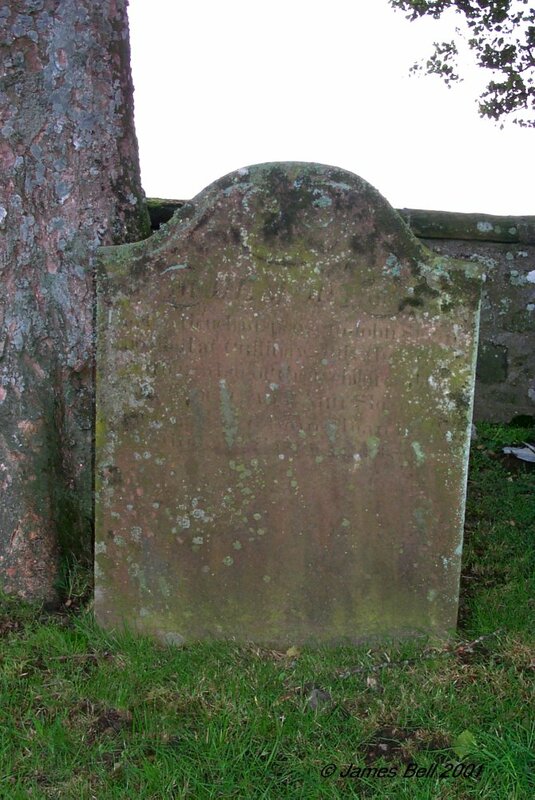 Also Mary Clark, beloved wife of James Grierson, who died at Haugh of Urr 9th Nov. 1887, aged 68 years. Also at Haugh of Urr, 25th March 1890, James Grerson (sic) (late of Caigton), aged 82 years. Also John, son of James Grierson, who died at Carnarvon, W. Australia, 26th September 1901, aged 46 years. Also Joseph, last surviving son of the late James Grierson, Haugh of Urr, who died at 23 Tennyson Street, Nottingham, 18th February 1913, aged 60 years. 159 Jane McRobert, wife of John McLellan, who died at Allanbank, Buittle on 14 June 1903, aged 68. Also the said John McLellan, who died at Castle Douglas, 24 September 1906, aged 72 years. 160 Here lyes the corps of Arthur Robison in Dunejarg, who died February 27 1756, aged 77y. 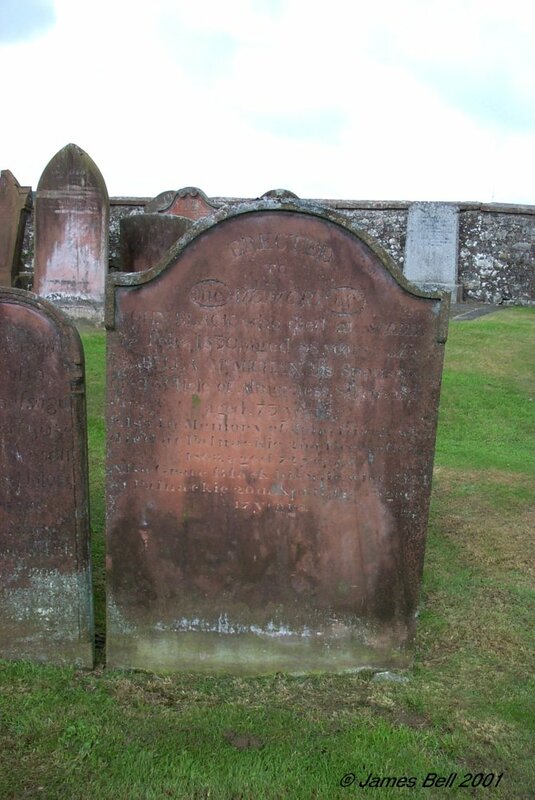 Also here lyes the corps of Margret Armstrong, his spouse, who died 1734, aged 70y and also here lyes the corpes of Samuel Kilpatrick, late of Kirkmirran who died May the 24th 1778, aged 78 years, And also here lies the corps of Mary Robison, his spouse, in Kirkmirran, who died the 20th of November 1778, aged 76 years. 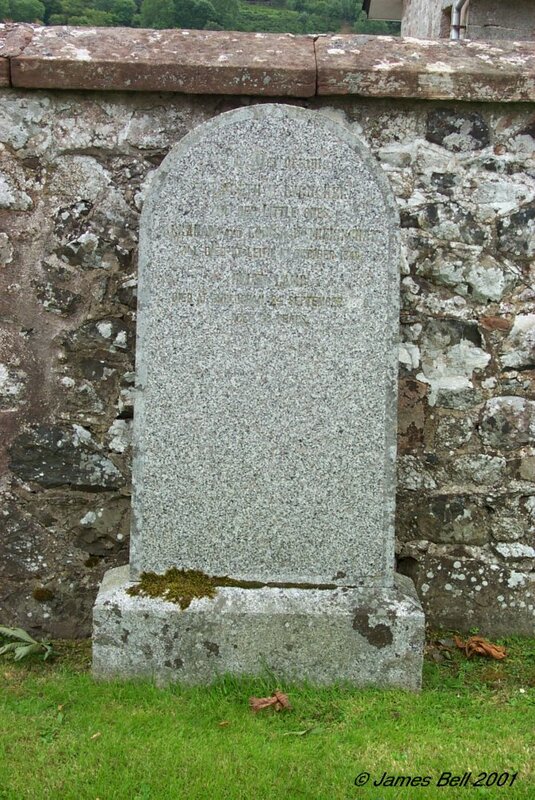 161 In memory of William Grierson, who died in Dalbeattie, February the 1st 1834, aged 72 years. 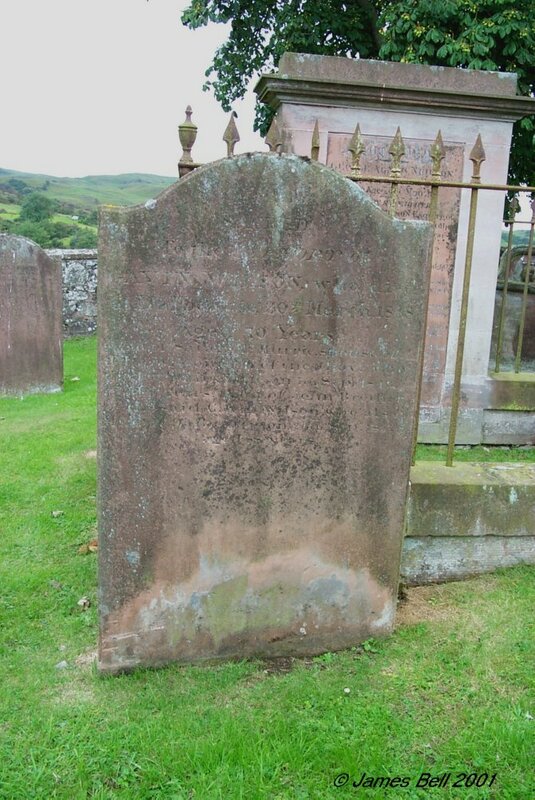 Also of Barbara Kirkpatrick, his spouse who died there October the 16th 1837, aged 64 years. Also Margaret Grierson, their daughter, who died September the 23rd 1821, aged 25 years. Also Mary Grierson, their daughter who died the 14th March 1815 aged 6 years. 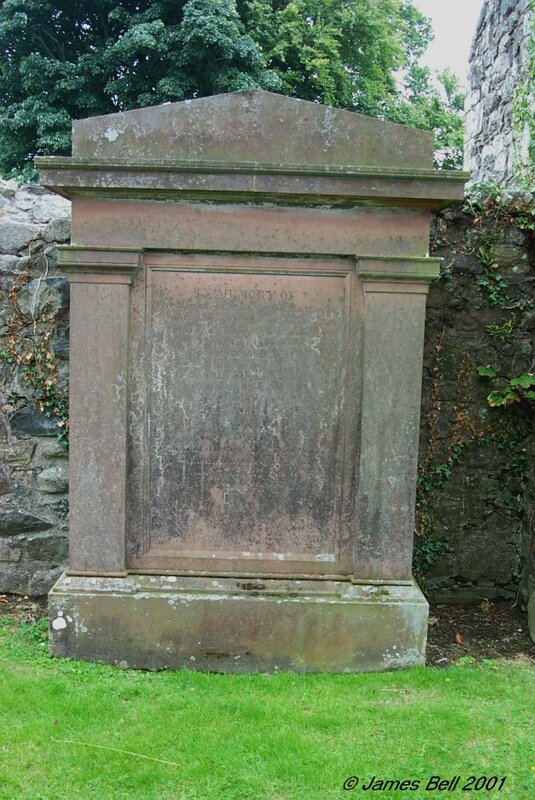 162 Erected by James Kelly, in memory of John Kirkpatrick, who died at Boghall, 11th Feb'y 1801, aged 68 years. 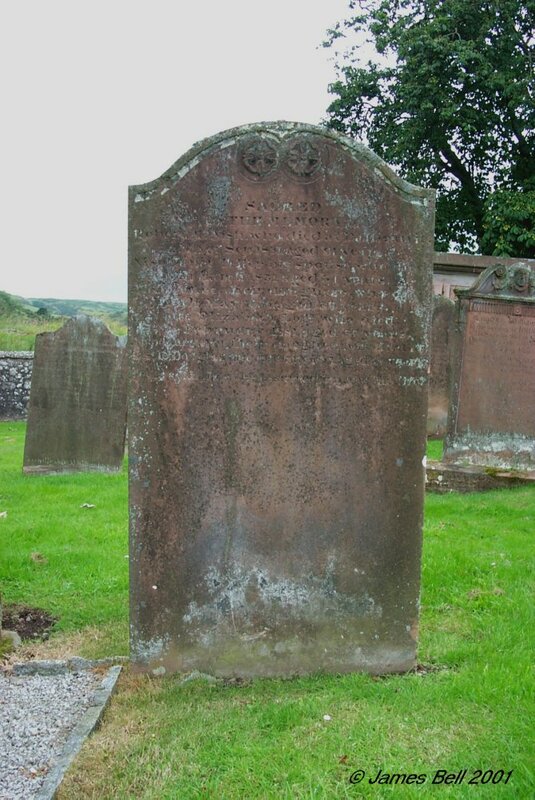 Also of Mary Kirkpatrick his spouse who died 20th Sep. 1812, aged 76 years. And of a daughter who died in infancy. 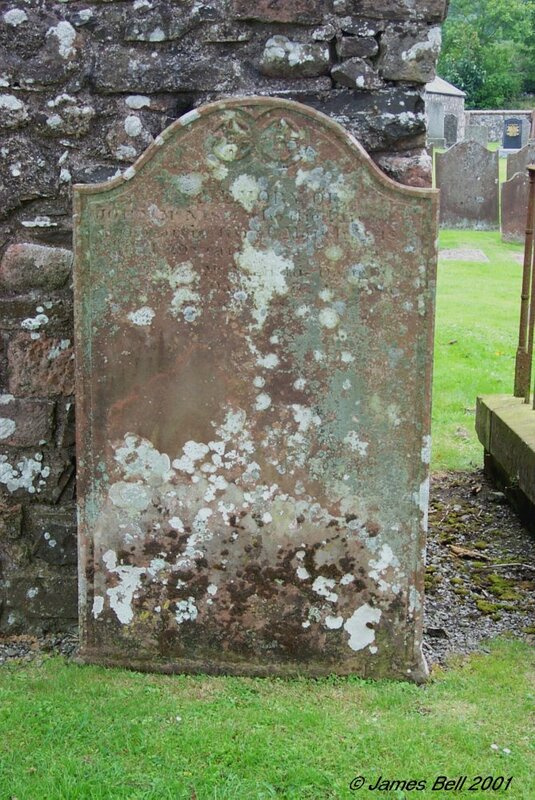 And also of Elizabeth Kirkpatrick, spouse of James Kelly, who died at Laghead (Parish of Girthon) 16th May 1821 aged 52 years. And of the said James Kelly, who died at Lag-head, on the 29th of June 1835, aged 75 years. Also of his grand-daughter, Janet Douglas Kelly, who died at Arkland, Anwoth, 21st June 1846, aged 18 years. 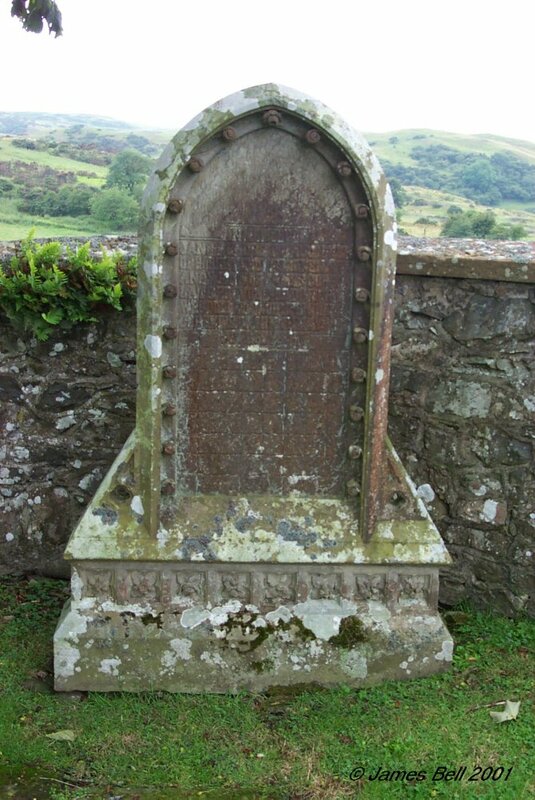 163 Erected to the memory of Mary Kirkpatrick, who died at Boghall, on the 6th day of July 1839, aged 68 years. Also of Peter Brown, her husband who died at same place, on the 12th day of August 1841, aged 58 years. Also of Georgina Brown, their daughter, who died on the 14th day of August 1875, aged 68 years. 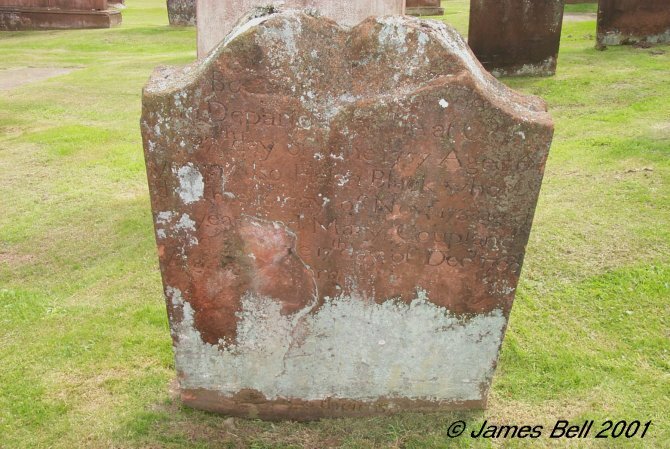 164 To the memory of Janet Bruce, (wife of William Porter, tenant in Meikle Culloch, Urr) who died 13th March 1839, aged 67. And of William Porter her husband, who died 2nd June 1844, aged 73. Also of William Porter, their son, who died 2nd April 1845, aged 30. R.I.P. Also of David Telfer, son-in- law of the above William Porter, who died on the 18th of June 1828, aged 22 years. 165 Erected in memory of George Porter, who died at Steedstane, 9th of April 1845, aged 91 years. Also Henrietta Caven, his spouse, who died 9th of March 1820, aged 60 years. Also George Porter, their son, who died at Dalbeattie, 2nd of June 1851, aged 58 years. Also George Porter, son of the above Jun'r, who was lost at sea in Jan'y. 1863, aged 37 years. 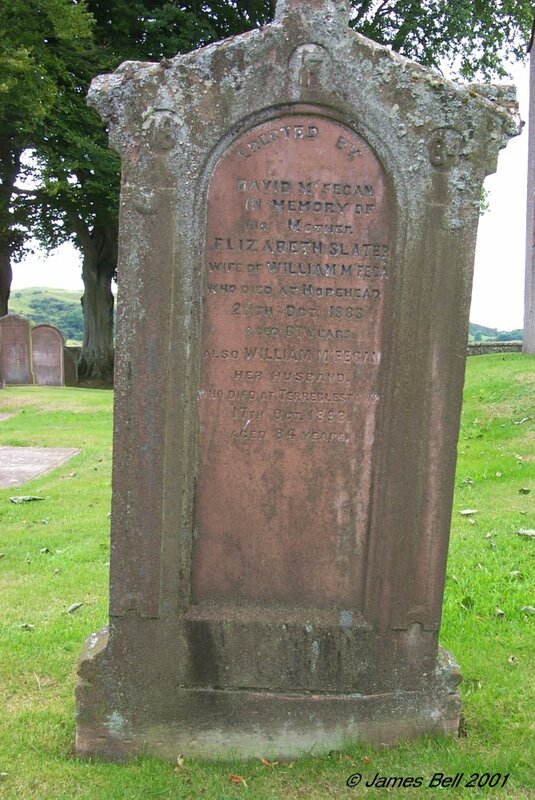 Also Elizabeth Porter, daughter of the above, who died at Dalbeattie, 3rd Aug. 1866, aged 77 years. Also Jane Cowan, wife of George Porter, who died at Dalbeattie, 8th January 1879, aged 86 years, Erected by Jane Cowan, spouse of the above George Porter, Junior. 166 Erected by Joseph Moffat in memory of his blessed wife Jessie C. Black, who died Nov'r. 30th 1899, aged 48 years. Also the above Joseph Moffat, who died at London, 18th September 1903, aged 58 years. 167 Erected by David Gibson, in memory of Annie B. Black, his wife who died at Palnackie, 26th Feb'y 1879, aged 21 years. 168 Sacred to the memory of William McGhie, who died at Toull, on the 4th day of May 1845, aged 55 years. And to that of Francis Alexander, who was born at Toull, Nov'r 20th 1806, and died near Tuscaloosa, in the state of Alabama, U.S., on the 20th of Aug't 1850. Also of George Alexander McGhie, son of the above, who died at Toull, the 13th of December 1851, aged 22 years. 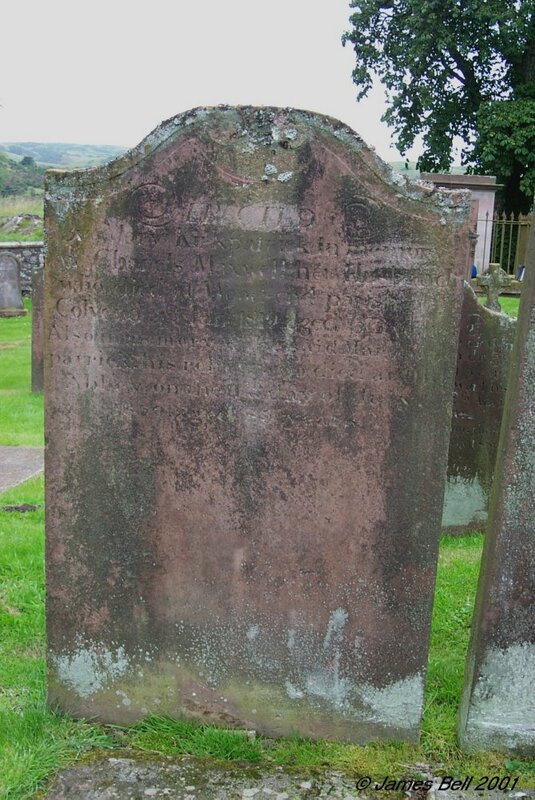 Also Eliza McGhie, his daughter, who died at Dalbeattie, 8th May 1856, aged 47 years. Also John McGhie, his son, who died at Wigan, 22nd Aug't. 1858, aged 47 years. Also Mary McGhie, spouse of the said William McGhie, who died at Bury, Lancashire, 20th January 1861, aged 71 years. Reverse: Also of Jane Lindsay McGhie, daughter of Robert McGhie, who died at Dalbeattie 18th of June 1860, in the third year of her age. Also the said Robert McGhie who died at Dalbeattie 11th June 1861, aged 37 years. Also Wellwood Maxwell McGhie, who died at Bury, Lancashire, 10th March 1872, aged 44 years. 169 In memory of Jean Brydson, wife of Ebenezer Sloan, who died at Parton, on the 8th day of September, 1808 aged 62 years. Also Ebenezer Sloan, their son, who died at Houghton Le Spring, in the Country of Durham, on the 17th day of March 1827, aged 45 years. Also the said Ebenezer Sloan, who died at Maidenholm on the 18th day of April, 1830, aged 80 years. In memory of William Heron, son of James Heron and Agnes Sloan, who died at Maidenholm the 14th day of May 1829, aged 17 years. Williamina, their daughter, who died the 29th day of October 1841, aged 12 years. 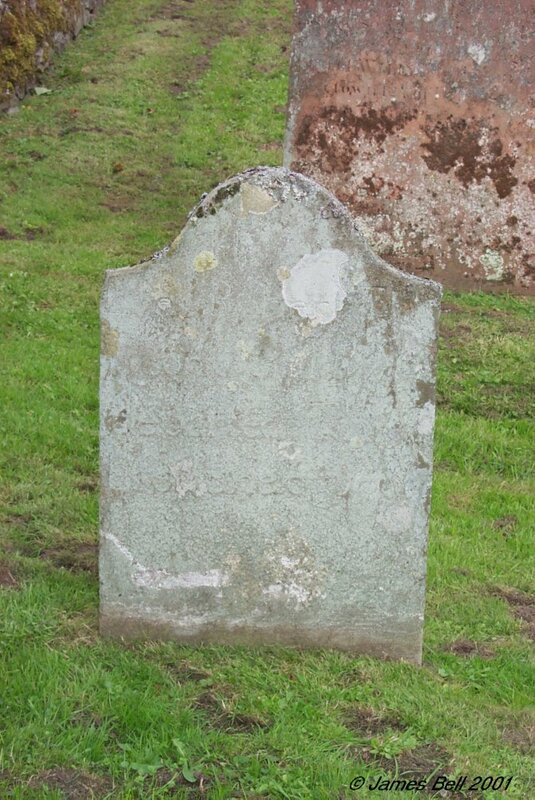 Agnes Sloan, wife of James Heron, who died at Maidenholm, 20th November 1866, aged 80 years. Agnes Carswell, their grand-daughter, who died at Maidenholm 25th June 1869, aged 21 years. Also the said James Heron who died at Maidenholm March 3rd 1873, aged 87 years. 170 Here lyes the corps of Samuel Crosby, son of James Crosby, in Caigton, who died Dec. 21st 1782, aged 28 years. 'Upright he liv'd & much regretted dyed. He languished here & longed to get away unto the regions of the immortal day. 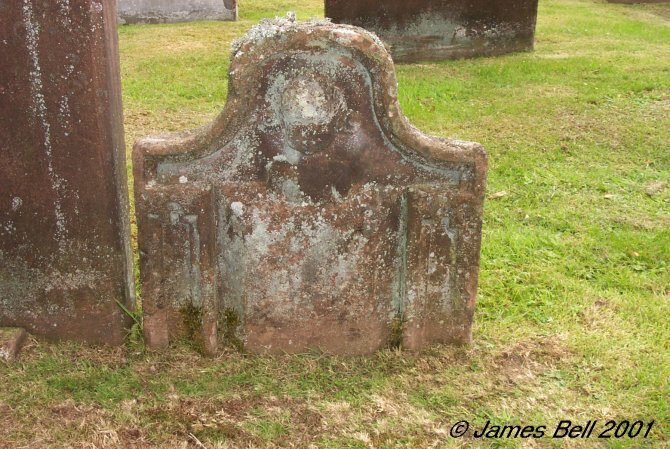 Reverse: Also here lyes Jannet McClellan, spouse to James Crosbie in Caigton, who died March the 7th 1791, aged 82 years. 171 In loving memory of Alister Fraser, who died at Palnackie, 25th March 1910, aged 46 years. 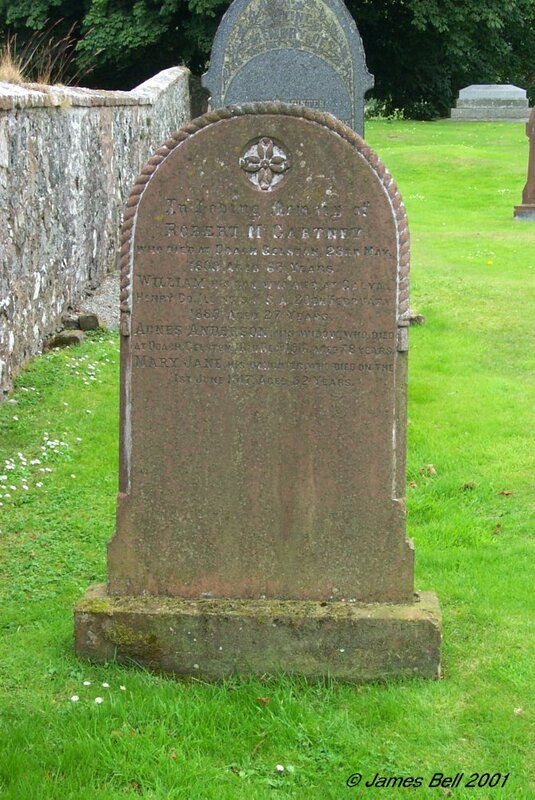 172 Erected in memory of Henrietta Caven, spouse of Michael Gormaly, who died at Castle Douglas, 1st November 1854, aged 60 years. 173 In memory of Janet Scott, daughter of John and Elizabeth Ewart, who died at Palnackie, 24th November 1882, aged 12 years and 9 months. 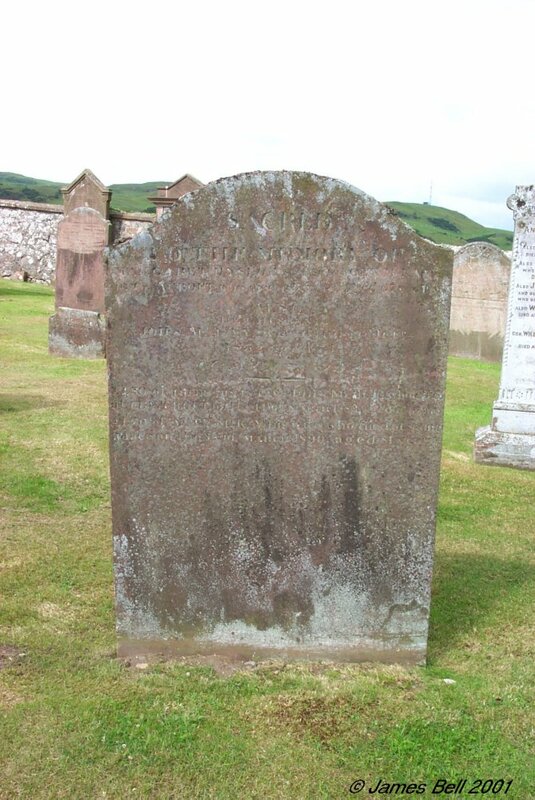 Also the above Elizabeth Ewart, who died at 23 John St., Dalbeattie, 8th January 1886, aged 38 years. 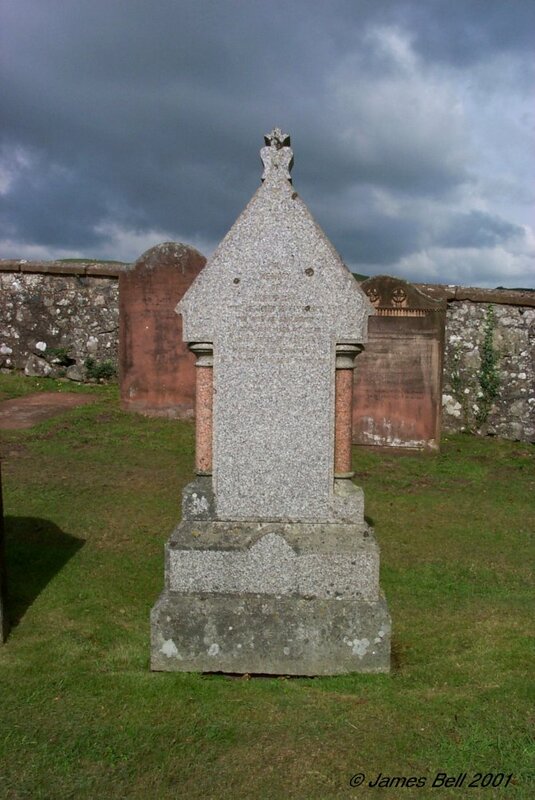 Also the above John Ewart, died at 42 Maxwell St, Dalbeattie, 30th May 1909, aged 69 years. Also John Ewart, their eldest son, who died at Bristol Avenue, Manchester, 24th April 1925, in his 54th year. Also Samuel Ewart, son of above John & Elizabeth Ewart, died at Princeton B.C., in his 76st year. 174 Erected by Christopher Cowden. John Cowden, farmer, Park, died 11th December 1857, aged 80 years. Agnes Cowden his wife died 11th July 1842, aged 72 years. Elizabeth Cowden, died 15 December 1853, aged 40 years. 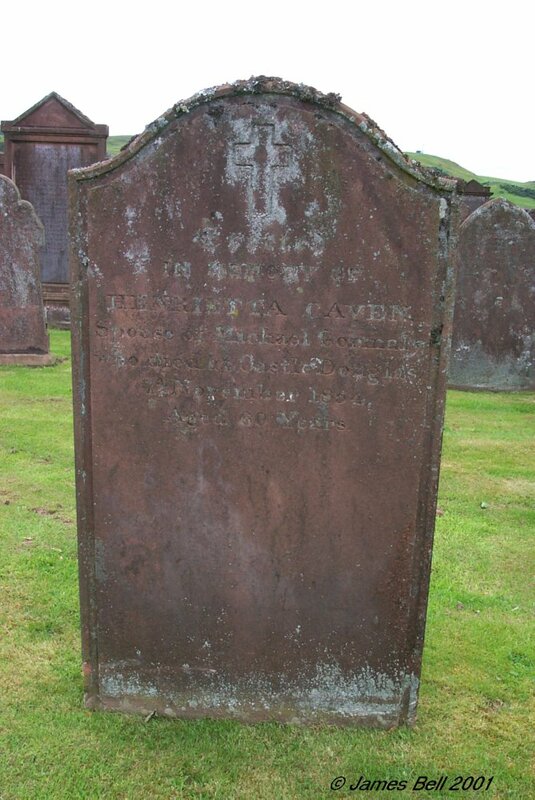 John Cowden, second son, died 14 March 1865, aged 63 years. 175 Erected in loving memory of George son of George Swanston, Cole Hole, Munches, died 26th June 1888, aged 7 years. James, died 11th March 1891, aged 3 months. Walter, died 8th May 1909, aged 23 years. Robert killed at the Dardenelles, 9th Dec'r. 1915, aged 20 years. Lily Isobel, died 31st March 1919, aged 16 years. Elizabeth Dalling, his wife died 21st Oct'r. 1934, aged 74 years. Also the above George Swanston, died 27th Feb'y 1940, aged 80 years. 176 Erected by James Copland in Dike-side of Dalbeaty. 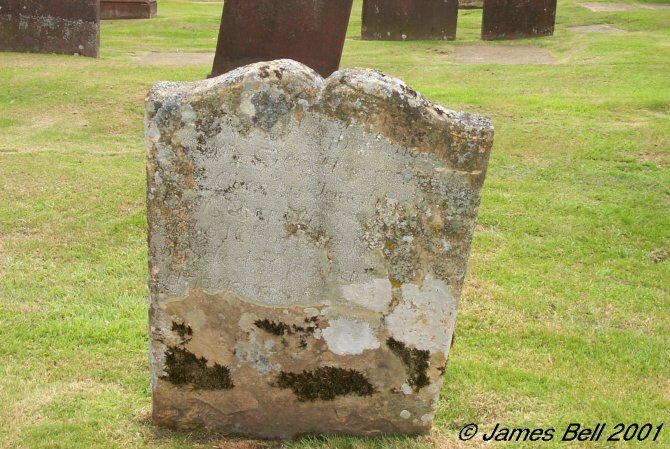 In memory of Janet Lindsay, his spouse, who died 26th Aug. 1756, aged 36 years. And of Agnes Porter, also his spouse, who died 2d Jan. 1797, aged 77 years. 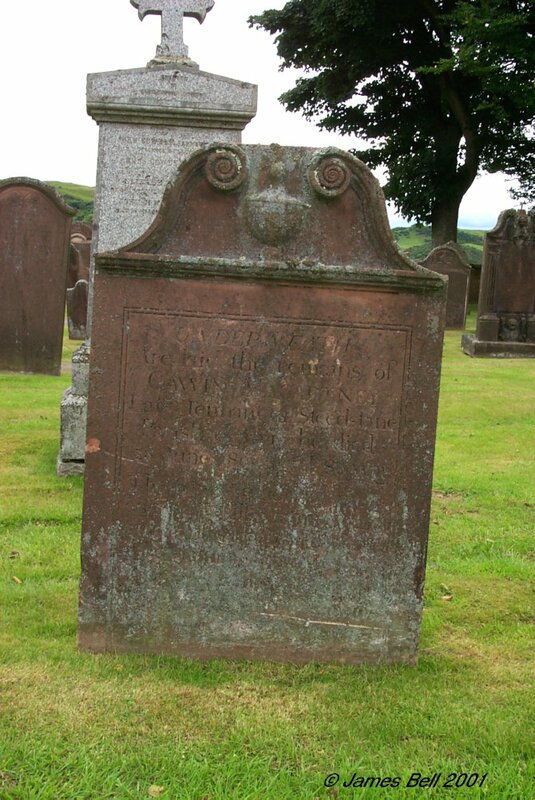 And also of the above James Copland, who died 17th July 1802, aged 86 years. 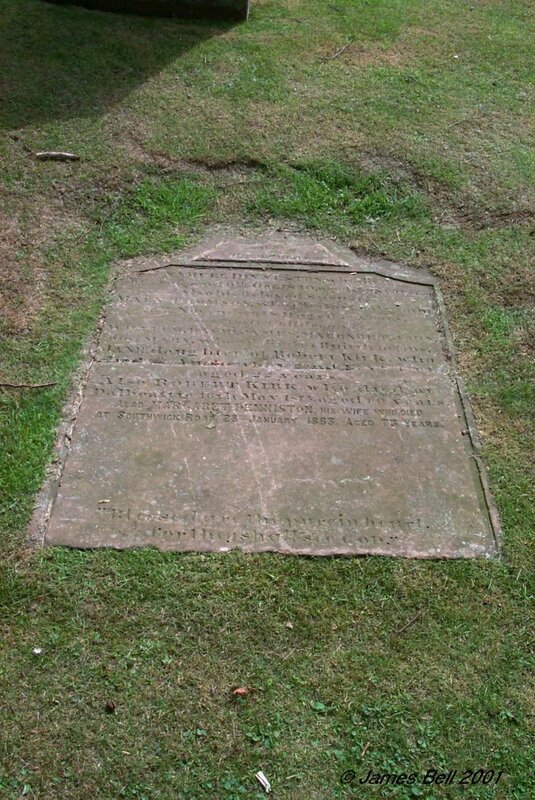 Reverse: Here lies the corps of Jannet Coupland, who died June 24th 1776, aged 22. Her brother John Coupland, who died July 27th 1777, aged 26. Also John, Mary and James Loudon children of Andrew Lowder and Barbara Copland in Breckony Hill. 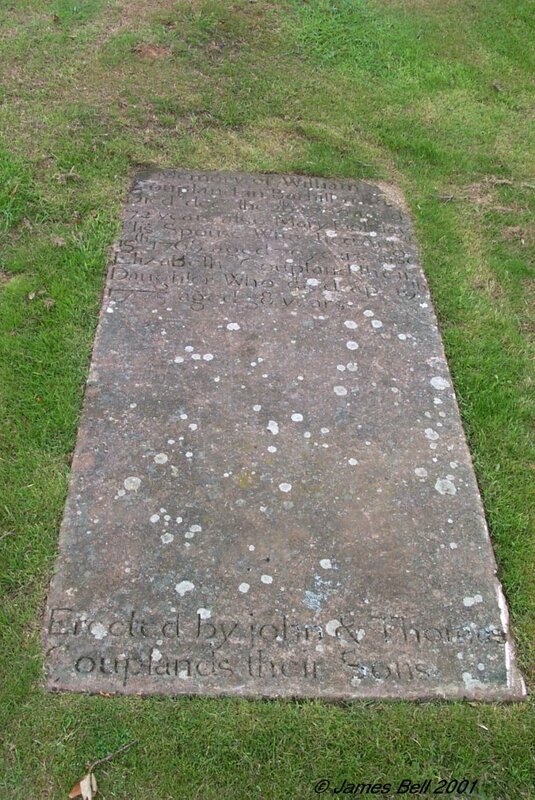 John died April 1783, aged 2 years. 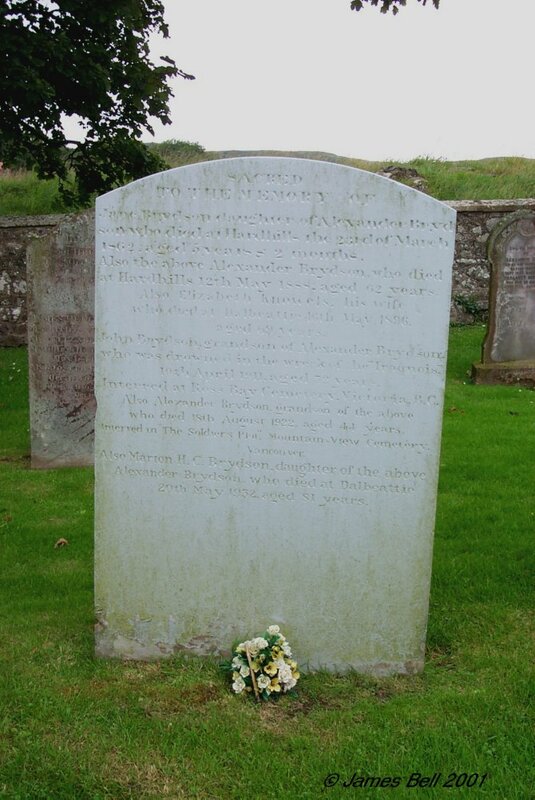 Mary died 7th April 1793, aged 18 years and James died June 1793, aged 17 years. 177 Erected by George Copland, in memory of Jean Maxwell, his mother, who died at Cogarth, 16th Dec'r 1784. William Copland, his father, who died at Cogarth, 29th March 1812, in the hundredth year of his age. 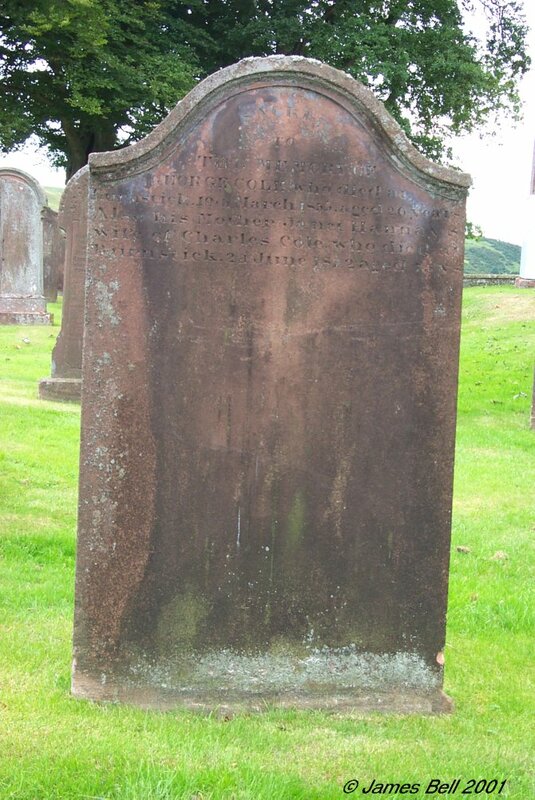 Mary Thompson, his spouse, who died at Castle Douglas, 1st March 1831, aged 77 years. And also in memory of the said George Copland, who died at Castle Douglas, on the 7th day of Aug. 1836, in the 88th year of his age. 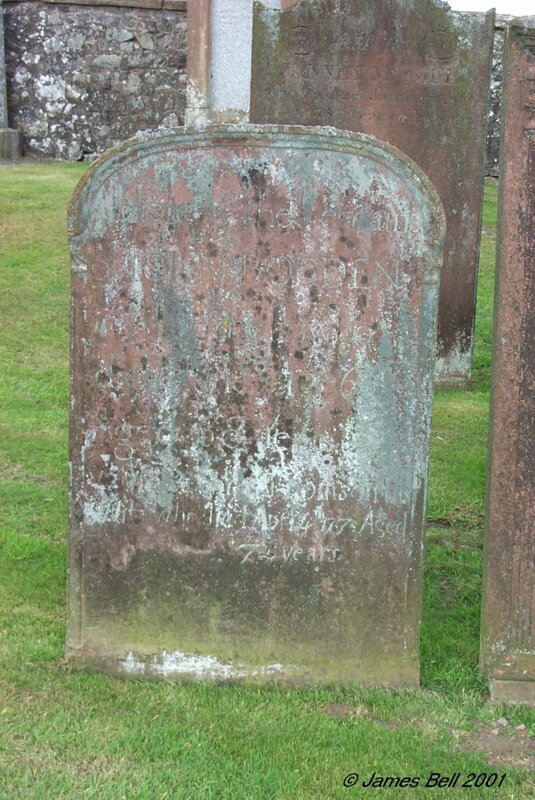 178 Here lyes the body of John Hair in Dalbeaty, who died 27th February 1761, aged 70 years. 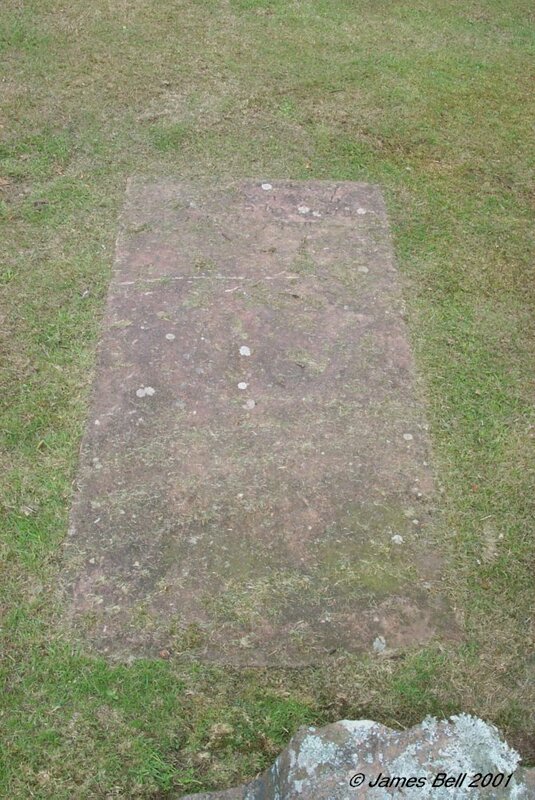 Here also lyes the body of Helene Kirkpatrick, his spouse, who died 18th February 1760, aged 70 years. 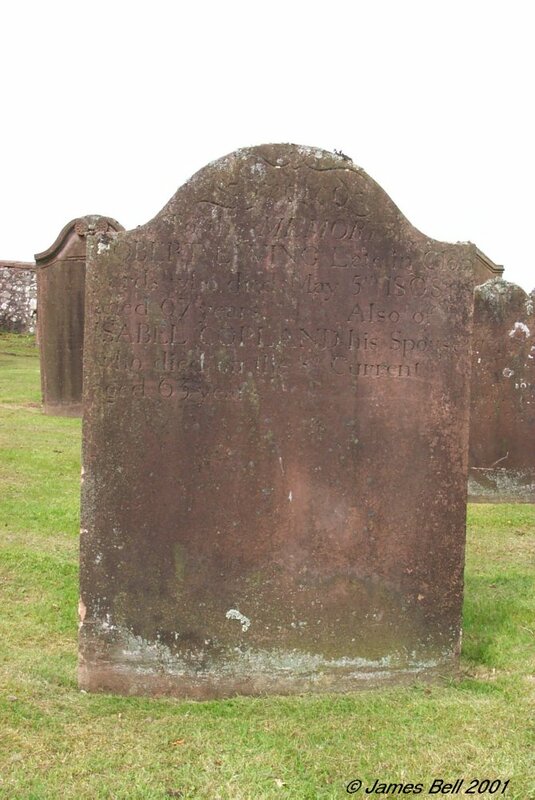 And also here lyes the corpse of John Hair, in Dalbeaty, who died there --th May 1779, aged 68 years. And also Jannet Clark, his spouse, who died Oct'r. 19th 1785, aged 79. Erected by John Hair, in Dalbeaty, their son. 179 Erected by Isabella Crocket, in memory of James Crocket, her father, who died at Palnackie, 28th October 1890, aged 75 years. 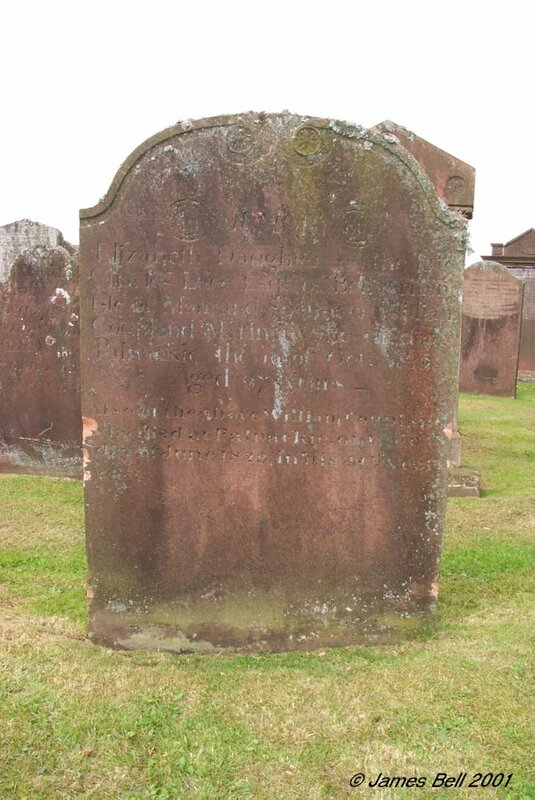 Agnes, his daughter, who died at Dumfries, 26th May 1844, aged 4? years, James his son, who died at same place, 28th Sept. 1846, aged 2? years. Robert, his son, who died at Liverpool, in 1885, aged 35 years. Agnes Kinnon, the beloved wife of the late James Crocket, Palnackie, who died 24th October 1895, aged 83 years. 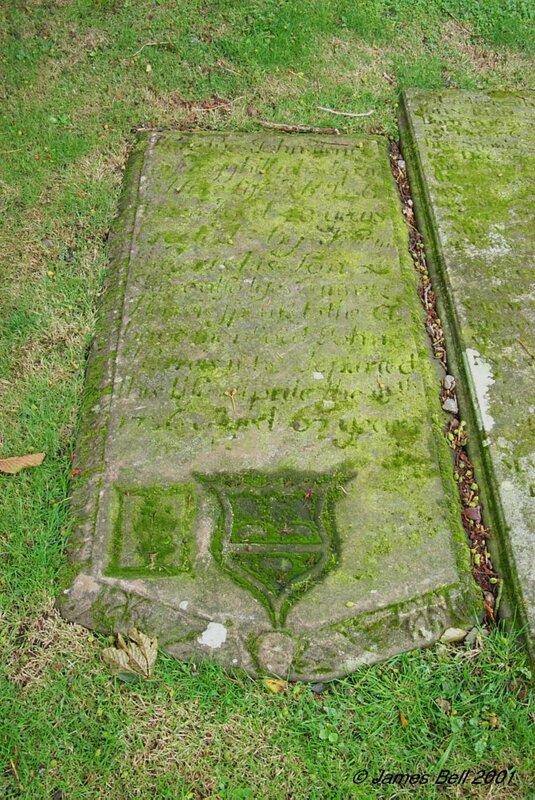 180 In memory of William Coupland in Barhill, who died Dec'r the 29th 1760, aged 72 years. 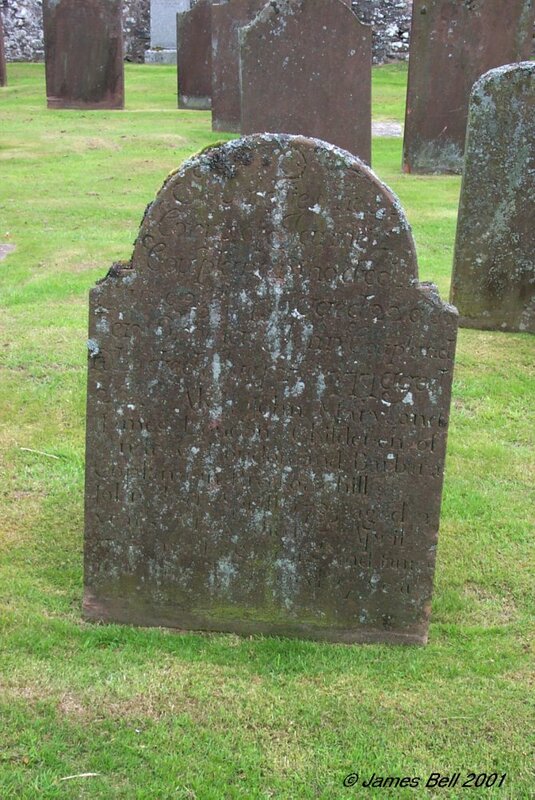 Also Mary Holiday, his spouse, who died Aug. 15th 1768, aged 70 years. Also Elizabeth Coupland, their daughter, who died Apr. 19th 1775, aged 58 years. Erected by John and Thomas Couplands, their sons. 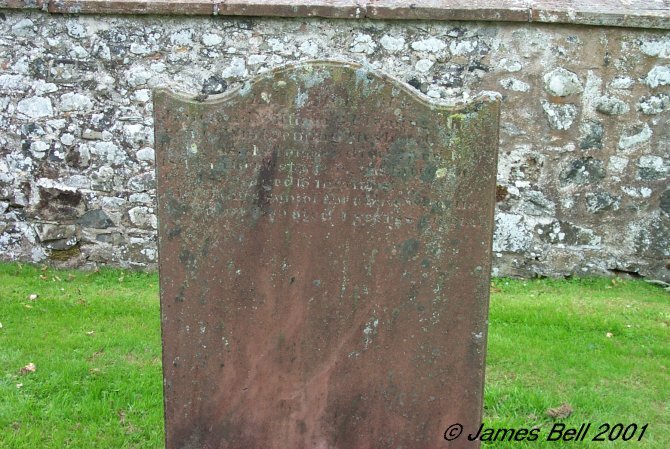 181 In memory of Margaret Murdoch, spouse of John Copland, Joiner, Dalbeattie, who died August 22nd 1848, aged 61 years. 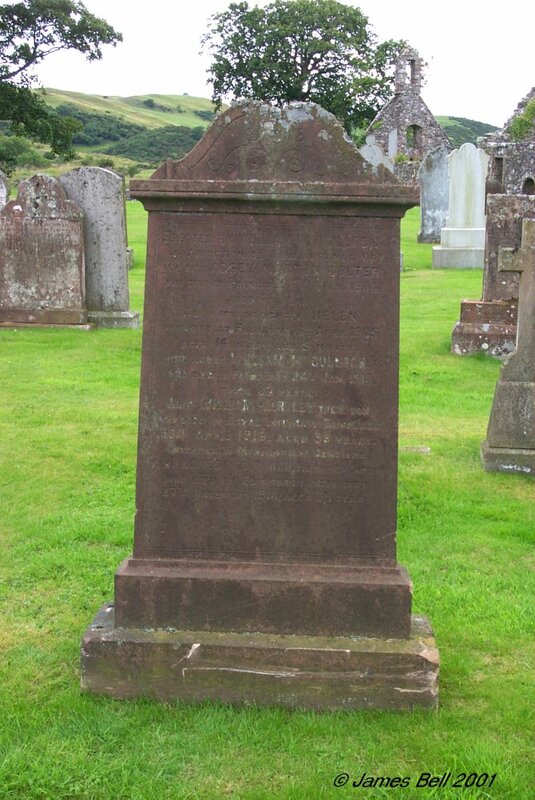 Also the said John Copland, who died at Dalbeattie, August 24th 1870, aged 85 years. 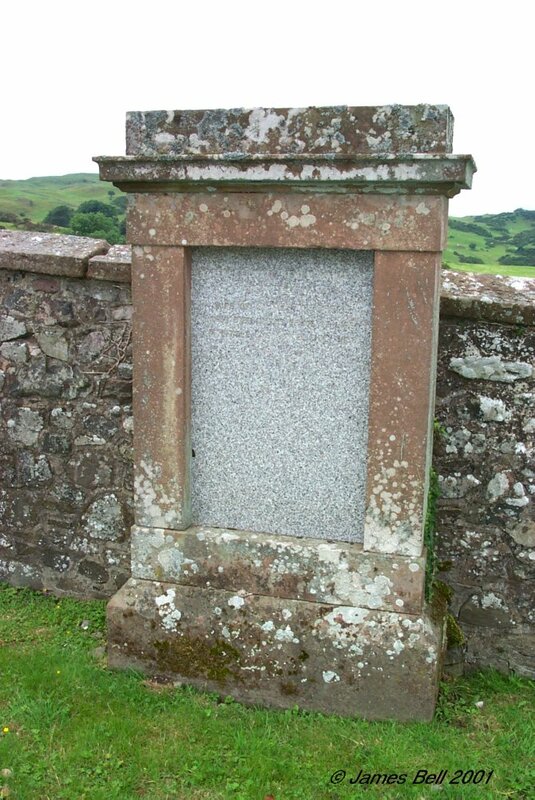 183 Erected by Archibald Campbell, in memory of his son Archibald Campbell, who died at Broomiebrae, 10th August 1878, aged 5 years and 11 months. Also John Campbell, who died at Barsyard, Buittle, 7th Sept. 1887, aged 28 years. Also the said Archibald Campbell, who died at Barsyard, Buittle, on the 10th March 1892, aged 62 years. Catherine Campbell, his daughter, who died at Barsyard, 21st May 1897, aged 30 years. 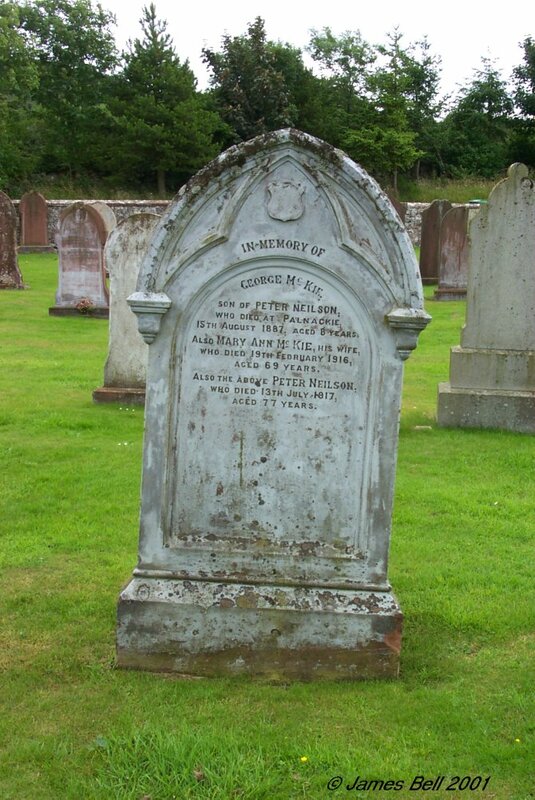 George his son, died Dalbeattie, 27th Nov. 1900, aged 35 years, interred in Dalbeattie Cemetery. Robert, his son, died at Barsyard, 17th Feb. 1901, aged 39 years. Gilbert, his son, died at Barsyard, 3rd March 1903, aged 46 years. Sarah Murray, wife of the above Archibald Campbell, who died at Barsyard, 25th July 1906, aged 77 years. 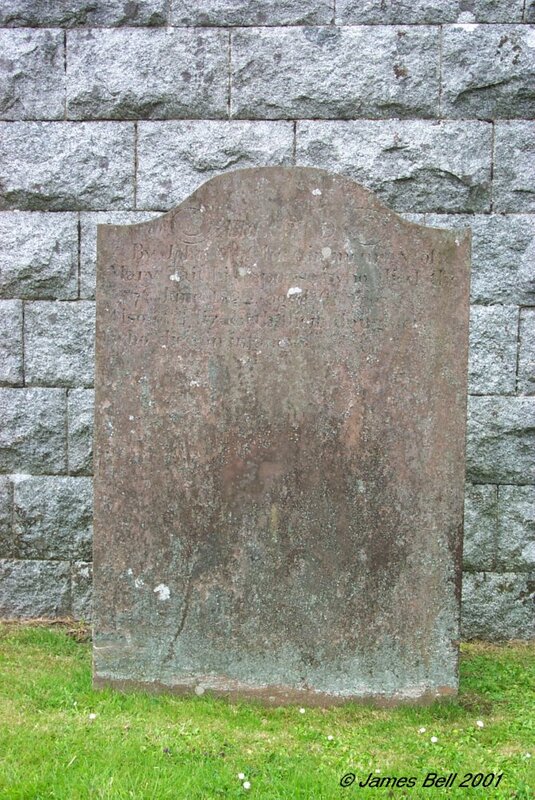 Reverse: Margaret McCartney, relict of Gawin McCartney, departed this life the 17th June 1806, aged 72 years, and is interred in the adjoining grave. 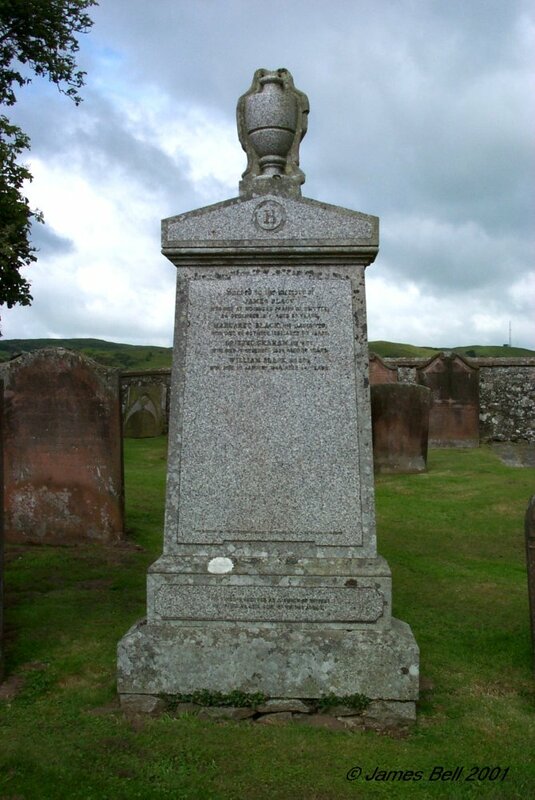 185 In affectionate remembrance of John Moffat, ship carpenter, who died at Palnackie, 16th February 1877, aged 68 years. Also Janet Smith, wife of the above John Moffat, who died at Palnackie, 3rd November 1896, aged 86 years. Also William Moffat, ship carpenter, son of the above, who was lost at sea, on the 13th January 1872, aged 25 years. Also Elizabeth, their daughter, wife of James Carswell, who died 8th March 1924, aged 84 years. 186 Memorial. 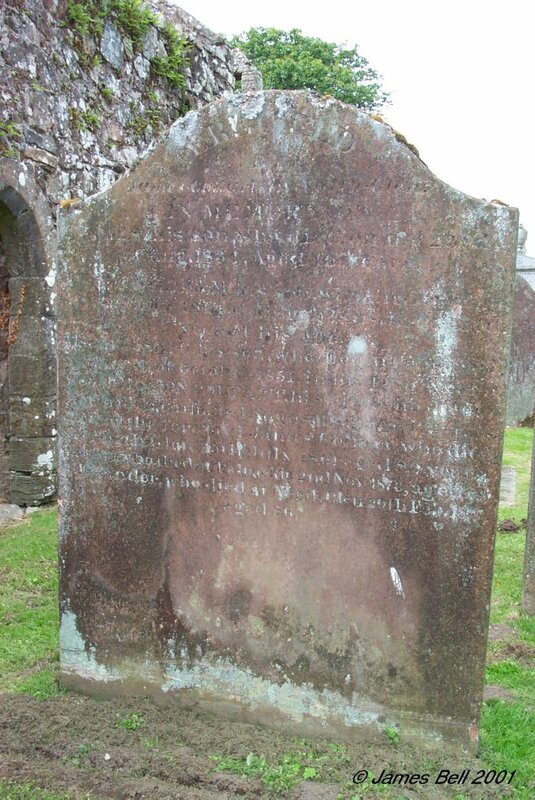 Died at Redweel, Parish of Urr, 10th March 1833, Anna McQuhae spouse of Alex'r. Caven, aged 67 years. On the 13th day of June 1846, the above Alexander Caven, aged 80 years. At Redweel, on the 18th November 1797, John Caven, their son, aged 7 months. Janet Francis Caven, wife of Charles Riddick, mariner, born Oct. 1800, died April 1886. Mary Caven, born May 1802, died at Beerhill, March 1893. Erected by Alexander Caven, husband and father. 187 In memory of Helen Wilson Black, wife of Samuel Ewart, who died at Palnackie, 26th November 1879, aged 36 years. Also Jessie Helen, their daughter, who died 28th March 1879, aged 6 years. William Black, their son, who died 28th April 1885, aged 16 years. Also the said Samuel Ewart, who died at Palnackie, 11th April 1904, aged 67 years. 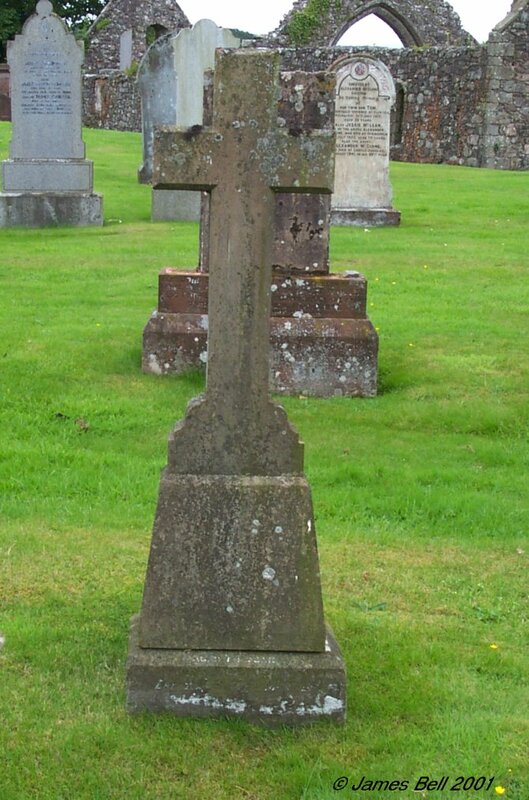 188 In memory of Nathaniel Murray, late mason in Dalbeattie, who died 18th Aug't. 1840, aged 49 years. 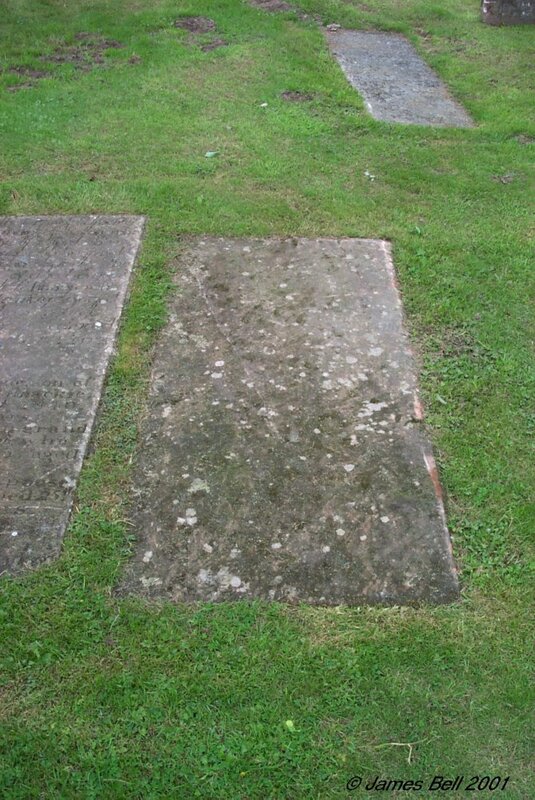 Also his children, John who died 29th April 1815, aged 1 year. William who died 28th April 1823 aged 9 months. William who died 6th May 1827 aged 3 years. 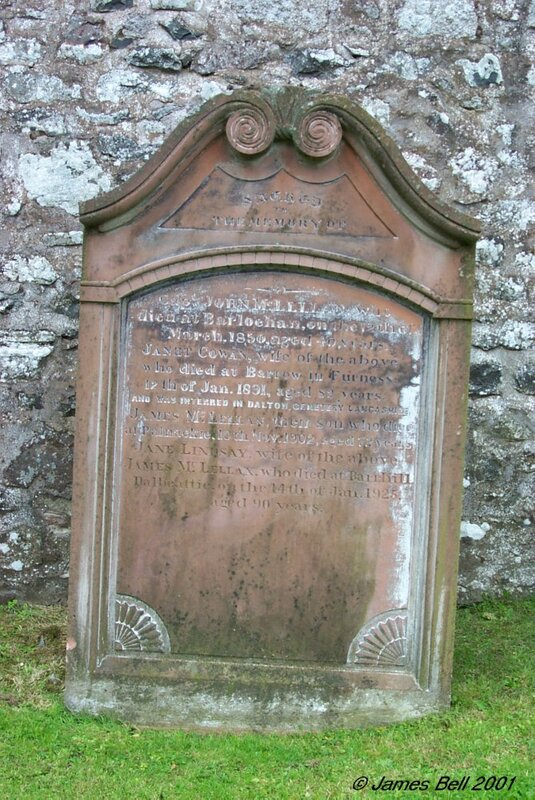 John Ferguson, who died 15th October 1828, aged 13 years. 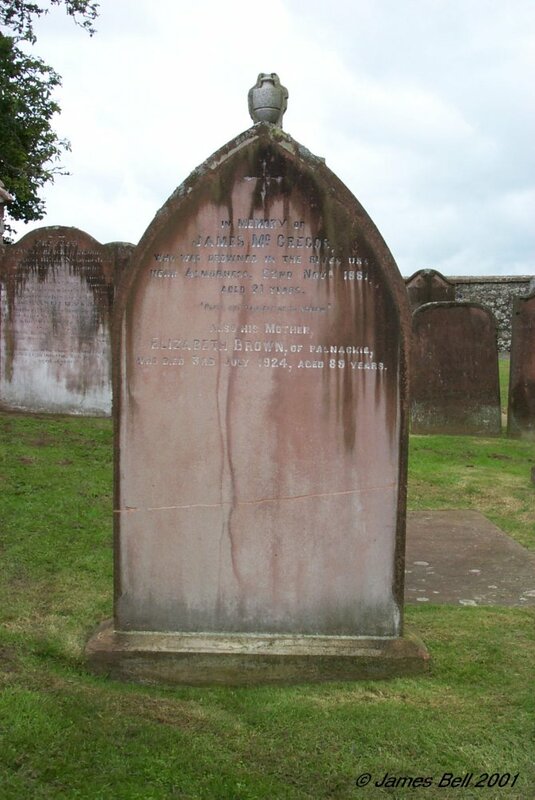 James Crosbie, who died 28th February 1834, aged 8 years. 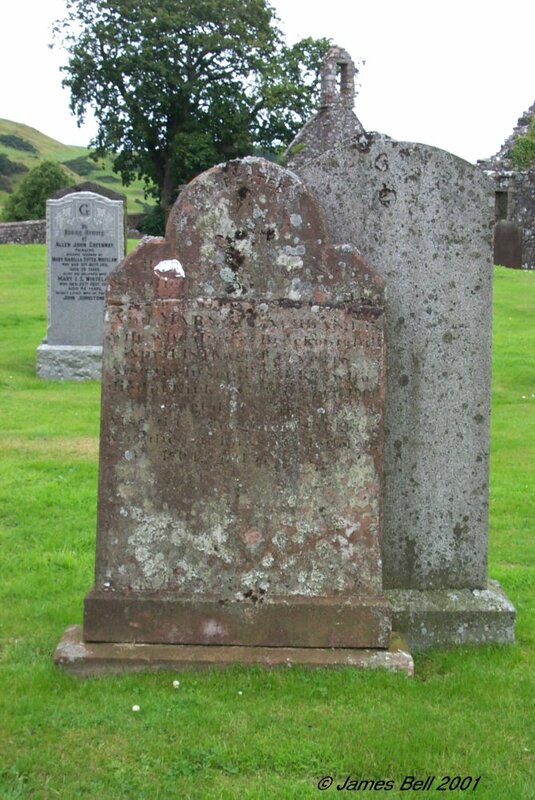 John, who died 3d February 1835, aged 4 years and William Maxwell, who died 27th May 1839, aged 11 years. Also of Janet Maxwell, relict of the above designed Nathaniel Murray, who died 7th June 1850, aged 62 yrs. 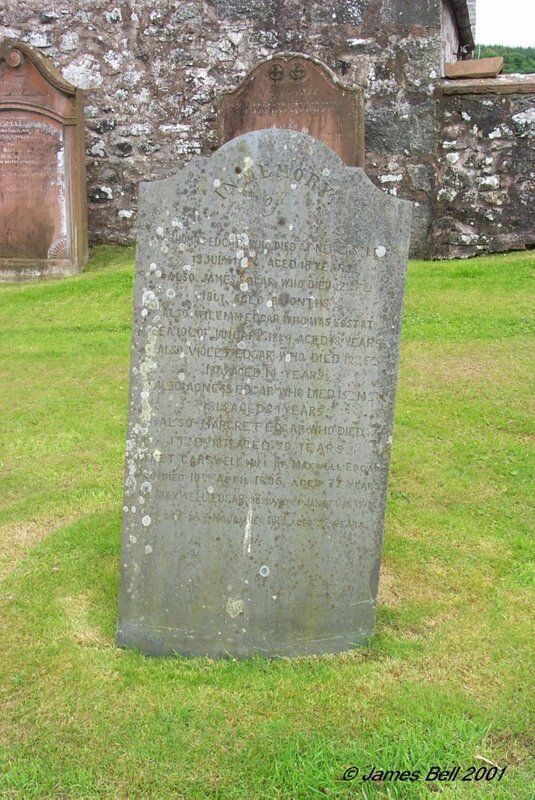 189 In memory of Isabella Ferguson who died at Dalbeattie, 29th April 1831, aged 69 years. Also of John Maxwell, her son, who died at Deal, 6th December 1826, aged 30 years. Also of William, Alexander and James, her children who died in infancy. And of John Maxwell, her husband, who died 22nd Nov'r 1839, aged 82 years. 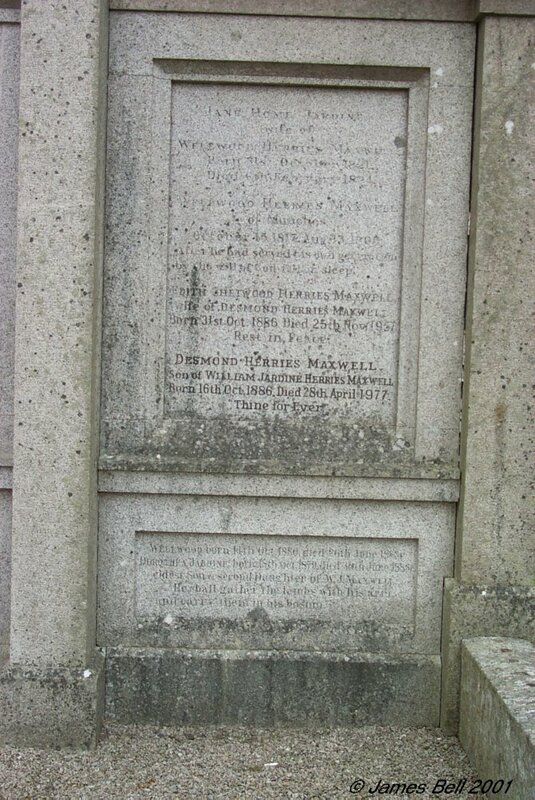 Also of Mary Maxwell, daughter of the above designed parents, who died 24th April 1837, aged 57 years. 190 Sacred to the memory of Thomas Wilson son of William Crosbie, and Lucia L. Wilson, who died at Palnackie, on the 27th June 1861, aged 3 months. Also of Joan Snodgrass, daughter of the above, who died at Palnackie, on the 3rd June 1874, aged 7 months and 26 days. Also the above William Crosbie of the Barque 'North Glen', who was lost at sea while on a voyage from Liverpool to Caldera in the year 1874, aged 44 years. Also the above Lucia L. Wilson, who died at Palnackie, on the 5th May 1908, aged 72 years. Also Elizabeth Crosbie, their daughter, who died at Yettan Terrace, Palnackie, 20th May 1912, aged 47 years. 191 Note: text in brackets a little speculative. 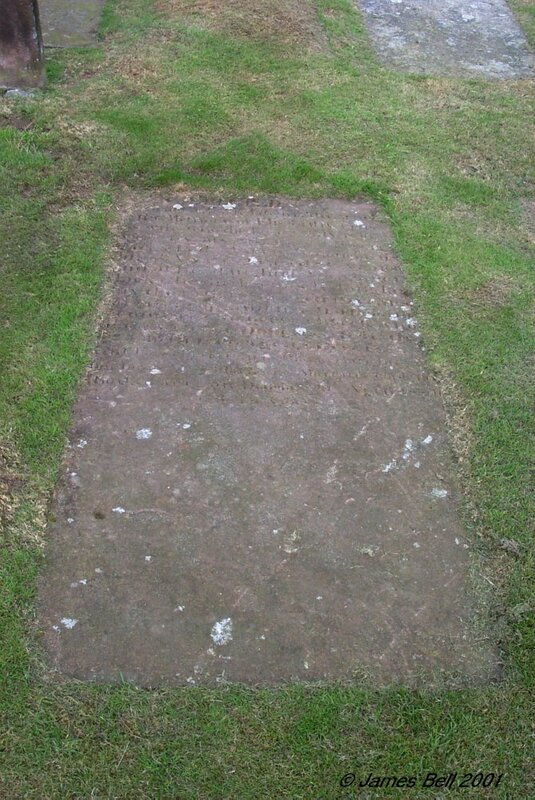 Here lyes the body of John Maxwell, in Orchyeardtoun, who died December 25th 1730, aged 52. Also Jean McMurrie, his spouse, who died Feb'y (8) 17(2)6, aged 53. 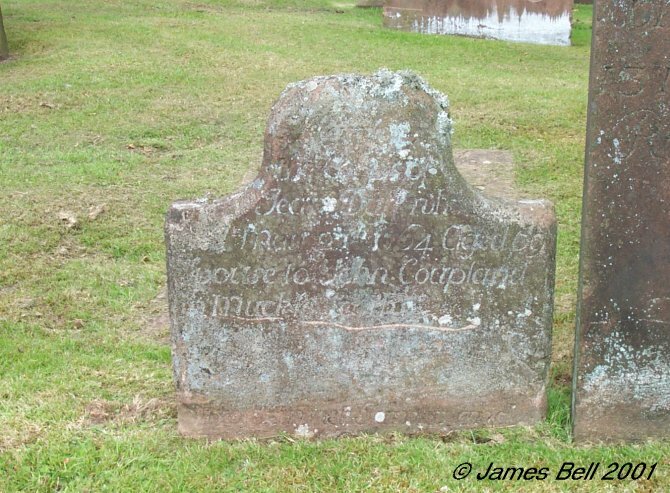 As also (Jane) Maxwell, daughter to John Maxwell in Dalbettie, who died March 2- 1752, aged 1 year 11 months. 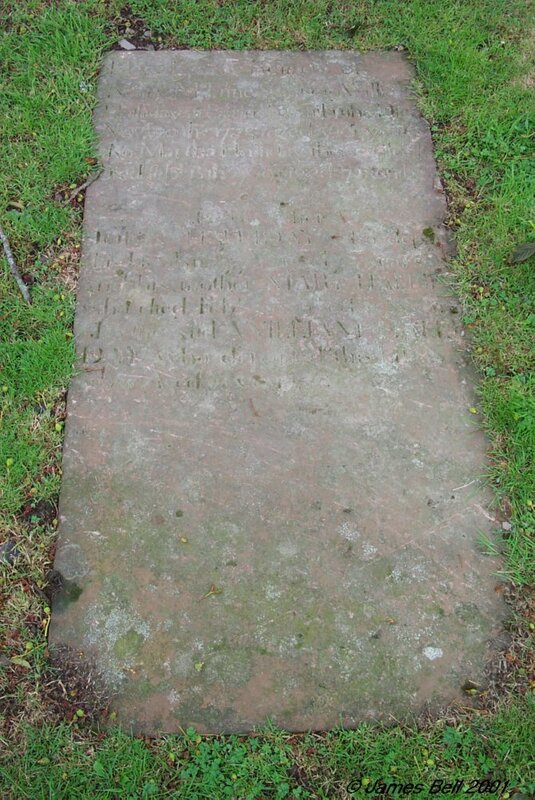 As also here lyes the corpse of (Henrietta McGill) spouse to William Maxwell, who died December 11th 1779, aged -- years. 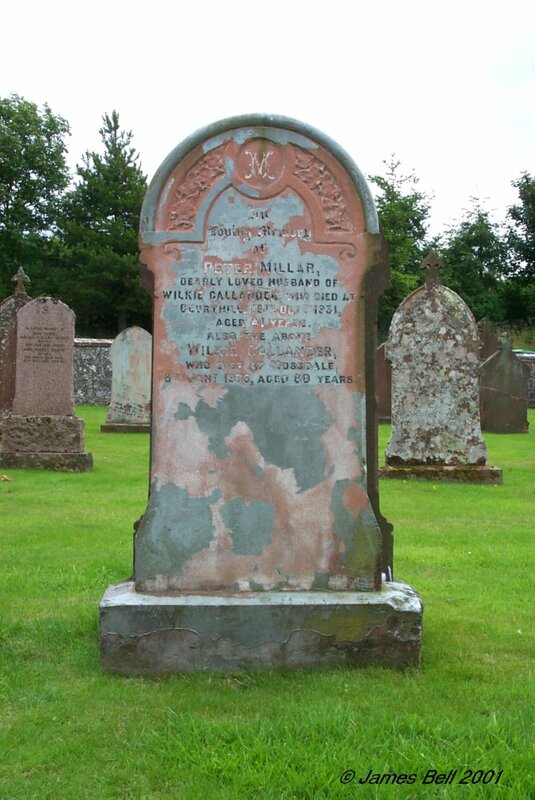 Also in memory of the said William Maxwell, who died at Craig(nair) the 18th June 1796, aged 85 years. And of Jane Charters, spouse of John Maxwell in Kirkland, who died the 24th March 1797, aged 71 years. Also of the said John Maxwell, who died 12th Jan. 1799, aged 77 years. (Final line illegible). 192 In memory of James Maxwell, who died at Almorness Cottage, on the 12th of December 1850, aged 84 years. 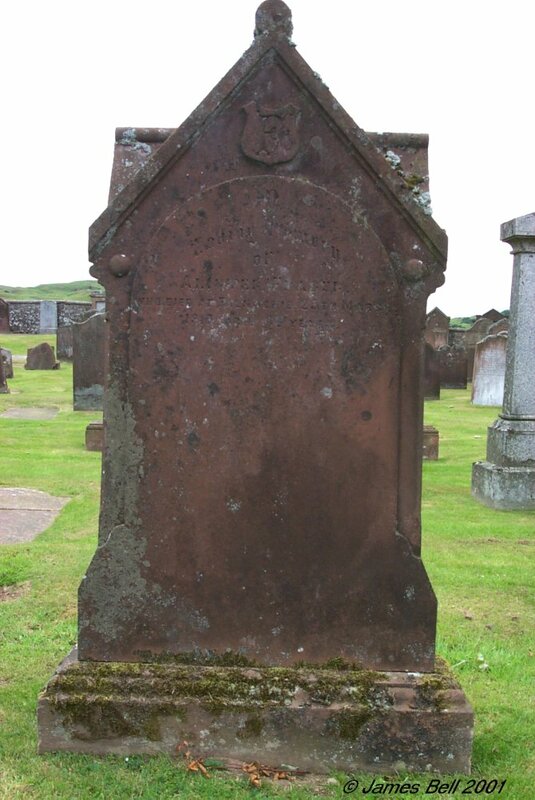 Also of Jean Johnstone, widow of the above who died at same place, on the 20th January 1869, aged 89 years. Also of Ronald Grainger Maxwell, who died at Screel, 28th March 1877, aged 74 years. Also of Mary Anne Hodson, his widow, who died at Screel, 17th Feb'y. 1901, aged 89 years. Also of James Phillips Maxwell, who died at Screel, 3rd April 1908, aged 74 years. Also Jeannie Maxwell, died at Carnwath, October 1908, aged 41 years. Also Ronald Francis Maxwell, died at London, April 1916, aged 50 years. Also James Todd Maxwell, died at Prince Albert, Canada, Dec'r 1918, aged 38 years. Also Janet Todd, wife of James Phillips Maxwell, died at Douganhill, Feb'y. 1921, aged 82 years. 193 Erected by Anne Barron Black, in loving memory of her husband William Black, master mariner, who died at Palnackie, 6th Feb'y. 1900, aged 80 years. The memory of the just is blessed. Prov. 10th & 7th. Anne Barron, wife of the above William Black, who died at Palnackie 11th April 1910, aged 84 years. Williamina, their daughter who died in infancy. Martha Anne Landsborough, grand-daughter of the above, who died at Castle Douglas, 28th July 1891, aged 1 year and 8 months. 195 Sacred to the memory of Thomas Wilson who died at Doon Cottage, Parish of Colvend, on the 4th of February 1846, aged 83 years. And Lucia Lindsay, his spouse who died at Palnackie, 28th of Jan.'y. 1849, aged 91 years. Also of John and John Dixon, sons of John Dixon Wilson and Jane Grey, Palnackie who died in infancy. 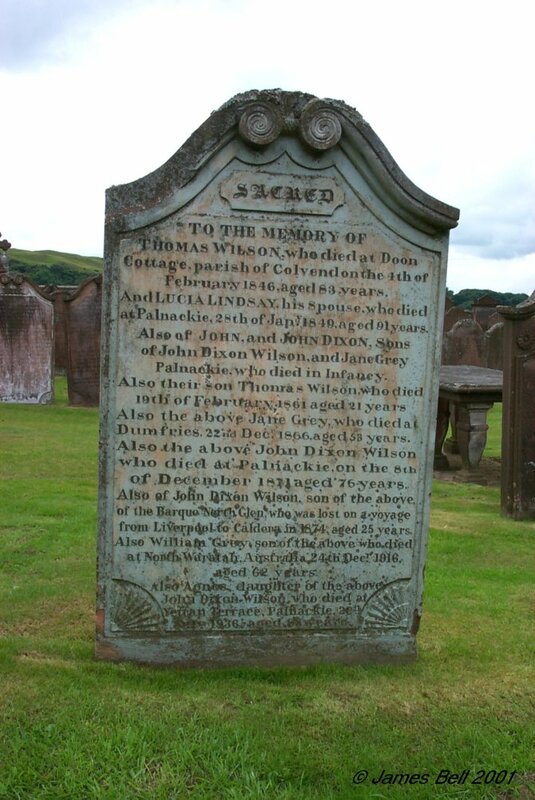 Also their son Thomas Wilson who died 19th Feb. 1861 aged 21 years. 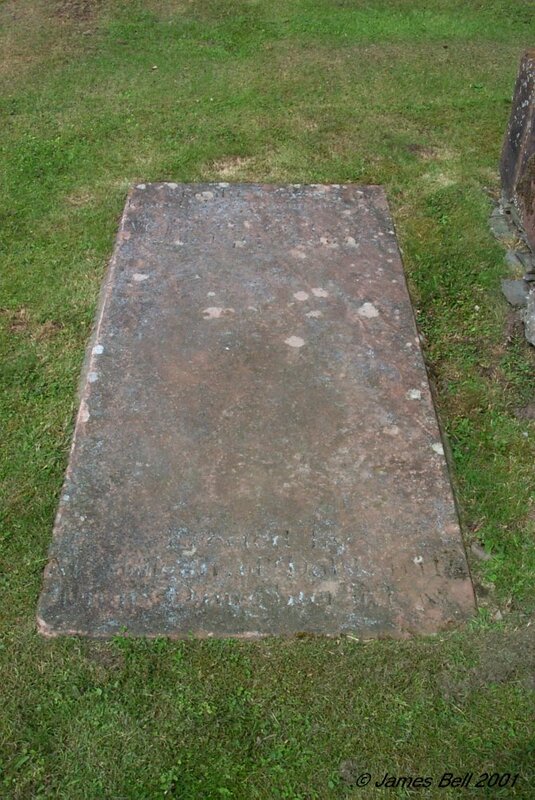 Also the above Jane Grey, who died at Dumfries, 22nd Dec'r. 1866, aged 53 years. Also the above John Dixon Wilson who died at Palnackie, on the 8th of December, 1871, aged 76 years. Also of John Dixon Wilson, son of the above of the Barque 'North Glen', who was lost on a voyage from Liverpool to Caldera, in 1874, aged 25 years. Also William Grey, son of the above who died at North Waratah, Austrailia, 24th Dec'r. 1916, aged 62 years. Also Agnes, daughter of the above John Dixon Wilson who died at Yettan Terrace, Palnackie, 20th July 1936, aged 86 years. 196 In memory of John Hiechell, late of Lock-hill, who died 29th Oct. 1806 aged 73 years. And of Jane Donaldson, his spouse, who died 10th Jan'y. 1800, aged 64 years. 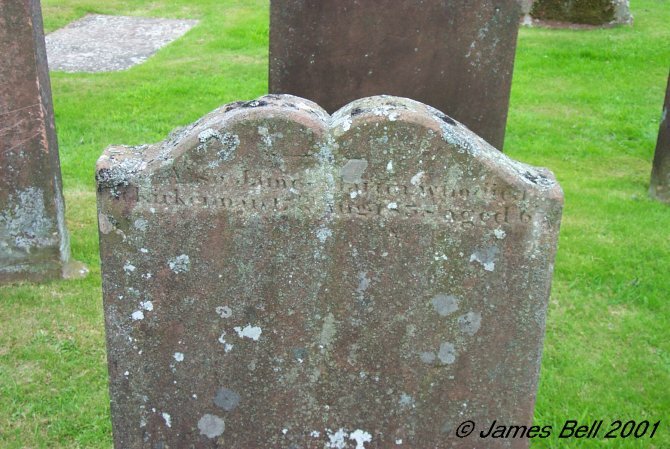 Also of James and Janet Hiechell, their children, James died 26th Nov. 1792, aged -9 years. and Janet died 10th Jan y. 1788 aged 17 years. 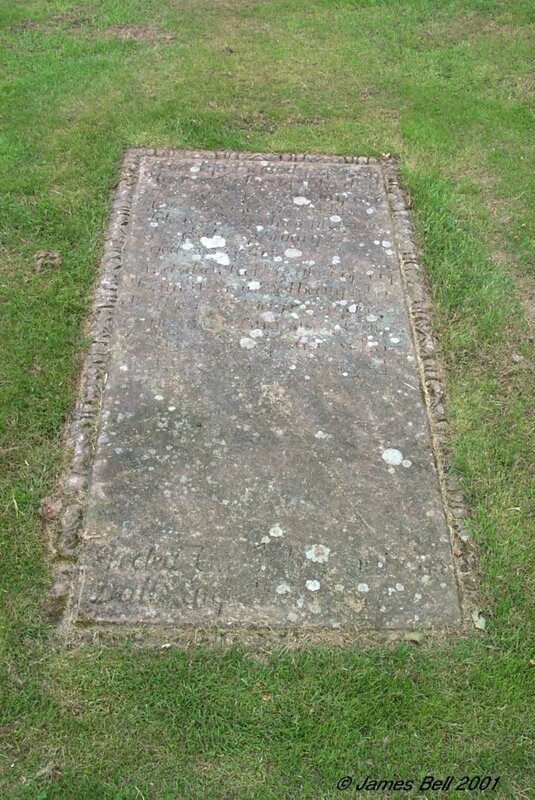 Also William Hitchell, who died the 11th April 1834, aged 72 years. And Helen Hichel, who died on 11th April 1835, aged 32 years. Their grand-children who died at Isle. Also Samuel Hitchel, father of the above who died at Palnackie, 20th March 1845, aged 70 years. Also of Jane Livingstone, his spouse, who died at Palnackie, Nov. 1844, aged 73 years. Also Samuel his son who died at Palnackie, 13th May 1849, aged 28 years. Also James, who died at sea. Also John, who died at Liverpool, Oct'r. 1862, aged 62 years. 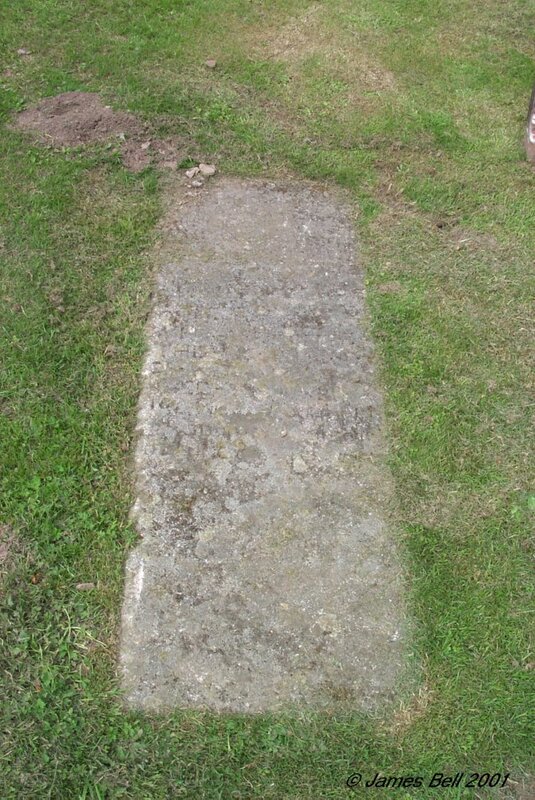 Also Elizabeth, who died at Palnackie, 21st June 1870, aged 54 years. 197 Erected to the memory of Fanny Livingstone, who died at Palnackie, 17th Oct.1911 aged 62 years. Andrew Graham, her husband, who died at Palnackie, 6th Nov, 1911, aged 68 years. For many years tenants of the Bush, Almorness. 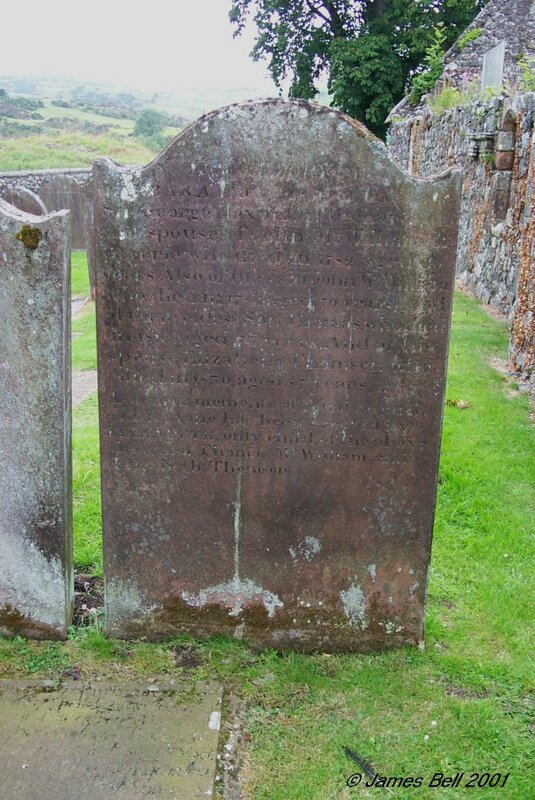 198 In memory of William Chalmers, who died at Merse-head, in the Parish of Kirkbean, 27th Oct. 1810, aged 60 years. 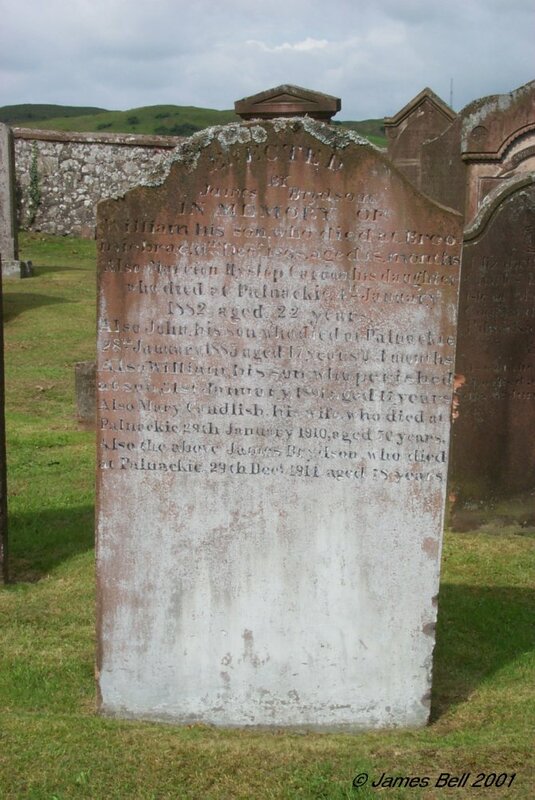 Also Margaret Maxwell, his spouse, who died at Dalbeattie, the 11th July 1817, aged 67 years. 199 In memory of Agnes Little, wife of Adam McMinn, who died at Buittle Bridge, 25th October 1872, aged 54 years. 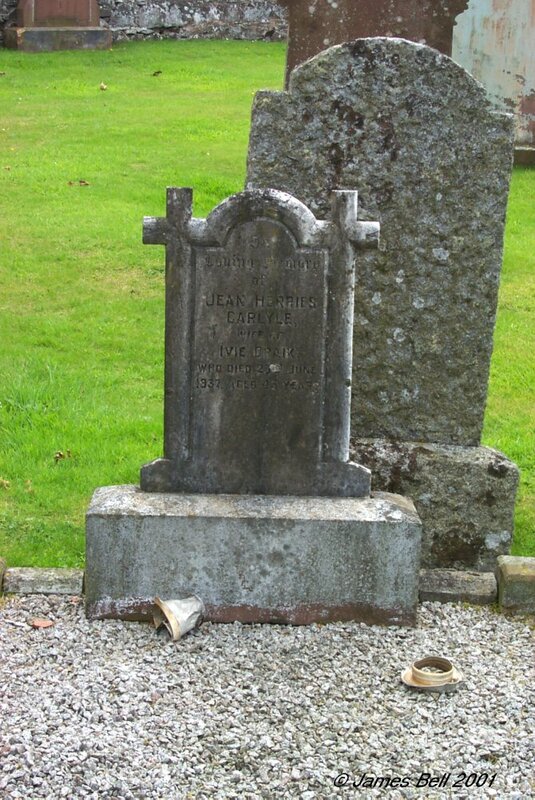 The above Adam McMinn, died at 46 High Street, Dalbeattie, 4th April 1903, in his 84 year. 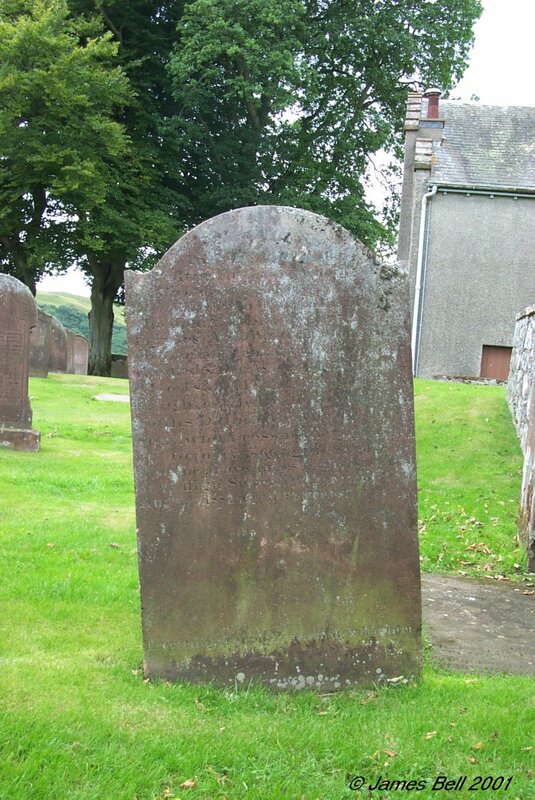 200 In memory of John Neilson, late joiner at Buittle Place, who died the 13th Dec. 1810, aged 65 years. 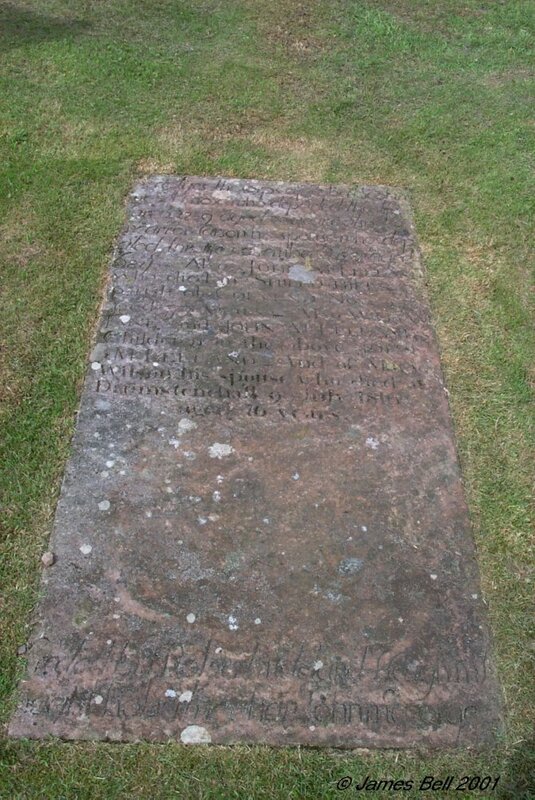 Also of his daughter Lucy Neilson, who died the 18th April 1790 aged 5 months. 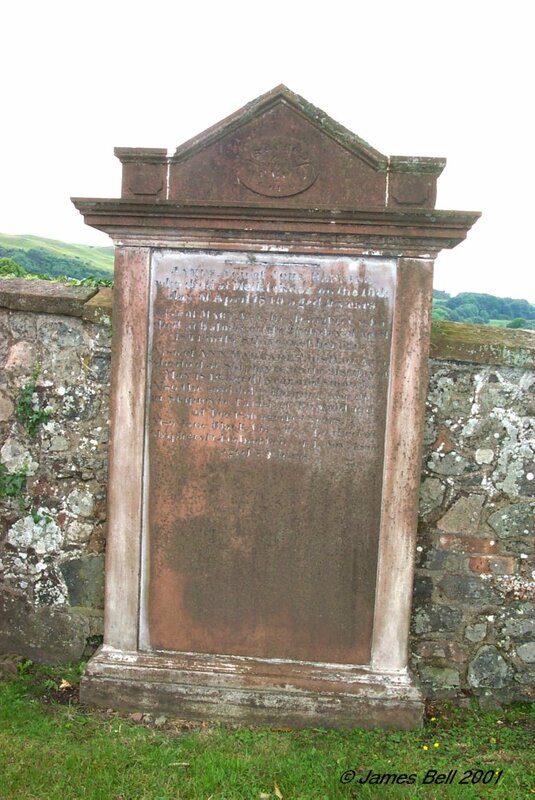 201 Erected by Thomas McTaggart, in memory of John, his son who died at Blackbelly, 22nd January 1854 aged 17 years. David, his son, who died 26th March 1855, aged 3 years and 6 months. Also the said Thomas McTaggert, who died at Gardenburn, 8th April 1877, aged 64 years. Thomas, his son, died at Dunedin, New Zealand, 7th July 1897, aged 53 years. 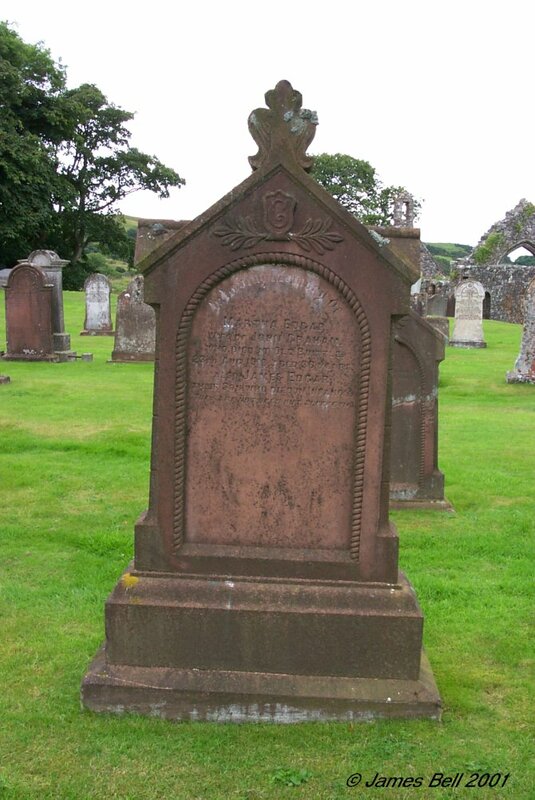 Margaret Morrison, his wife, died at Broomiebrae, 19th Dec. 1897, aged 84 years. 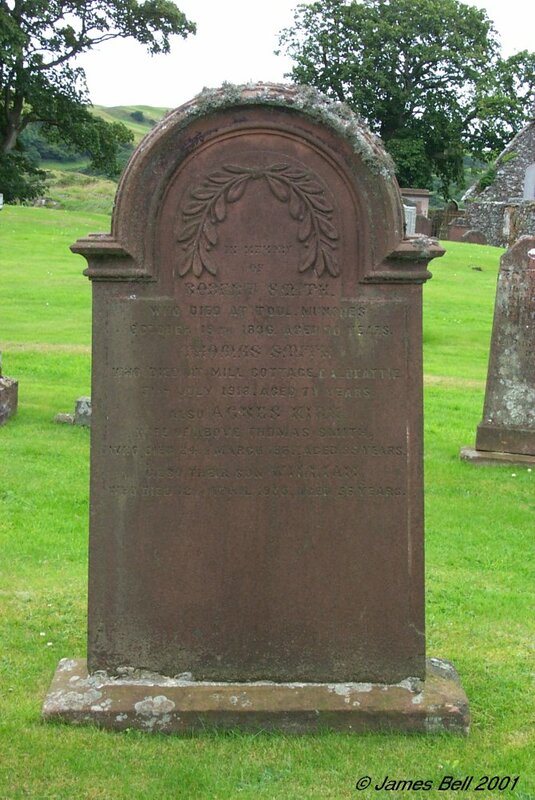 Harriet, second daughter of the above who died at Dumfries, 8th April 1925, aged 78 years. 202 In memory of Maxwell Crosbie, who died the 3rd of April 1821, aged 5 years. Also John Crosbie, who died in Maxwelltown, the 19th of March 1826, aged 36 years. Also Alexander Crosbie, who died at Mounches, the 4th of August 1828, aged 23 years. Also Grace Crosbie, who died in infancy. Grizel Shennon, mother of the above who died 10th April 1847, aged 85 years. Mary Crosbie, another member of the family, who died 27th July 1852, aged 59 years. And John Crosbie, the father, who died 20th October 1854, aged 88 years. 'In the midst of life we are in death.' Erected by William Crosbie their brother. 203 Sacred to the memory of Thomas Crawshaw Black, master mariner, beloved husband of Mary L. Black, who died at Palnackie, 24th Dec. 1923, aged 63 years. Their daughter Anne Barron Black, who died 6th June 1882, aged 4? years. Their grand-daughter Mary McCulloch who died in infancy. Also the above Mary Louden Black who died at Palnackie, 15th Jan'y 1940, aged 80 years. Also their daughter Mary Aitken Black, who died at Palnackie 13th Oct'r 1974, in her 90th year. 204 Erected by James Neilson, in loving memory of Henrietta, his daughter who died at Palnackie, 18th Aug. 1887, aged 3 years. James Alexander, his son, who died 23rd Aug. 1887, aged 6 years. Helen Candlish, his wife, who died 16th Feb. 1889, aged 36 years. Nellie, his daughter, who died 30th Sept. 1889, aged 7 months. Also the above James Neilson, who died in the Western Infirmary, Glasgow, 29th Sept. 1910, aged 56 years and was interred here. Also their youngest son, Corporal Thomas Neilson, Motor Transport Corps, killed in France, 3rd Sept. 1918, aged 33 years. 205 In memory of Thomas Edgar, who died at Newcastle, 13th July 1860, aged 18 years. Also James Edgar, who died 12th Feb'y. 1861, aged 8 months. Also William Edgar, who was lost at sea, 10th of January 1864, aged 18 years. Also Violet Edgar, who died 12th Feb'y. 1865, aged 14 years. Also Agnes Edgar, who died 15th May 1865, aged 24 years. Margaret Edgar who died 17th Dec. 1873, aged 29 years. Janet Carswell, wife of Maxwell Edgar, who died 10th April 1895, aged 77 years. Also Maxwell Edgar, husband of Janet Carswell, who died 29th November 1901, aged 92 years. Centre Bottom:- Clementina Herries Maxwell of Munches, born 1782, died 1858. Bottom Left :- Matilda Elizabeth Maxwell, eldest daughter of William Jardine Herries Maxwell, born 1st April 1878, died 18th July 1960. 'In thy presence in fullness of joy.' And John, died 27th Aug. 1972, aged 87. Admired and loved by all. 208 In loving menory of Hannah Augusta Ross Johnston, beloved wife of Alexander Kirk, who died at Palnackie January 15th 1908, aged 41 years. Also the above Alexander Kirk, died at Palnackie March 19th 1935, aged 72 years. Also his son-in-law, Louis McCubbin, master mariner, husband of Mary G. Kirk, died at Palnackie, March 26th 1926, aged 49 years. Also Mary G. Kirk, wife of Louis McCubbin, died Palnackie, March 7th 1961, aged 73 years. 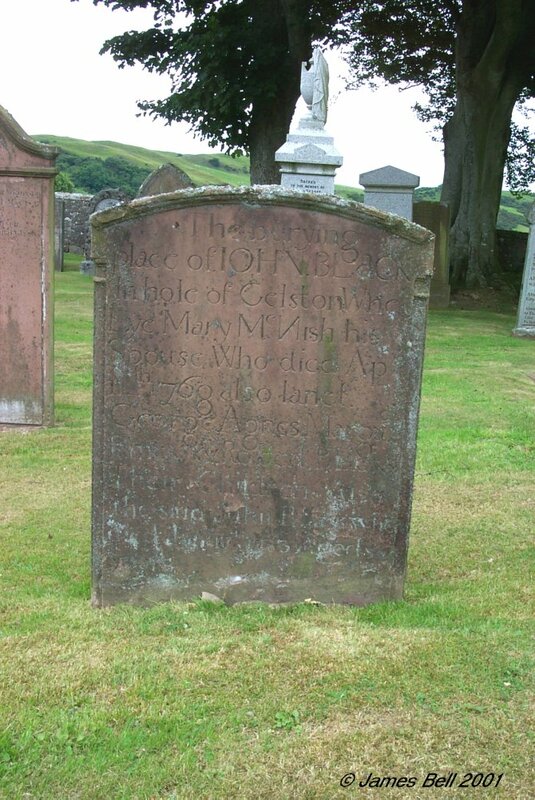 209 In memory of Mary Martin, daughter to William Martin & Elisabeth Atkin, in Kirkennan, she died August 12 1786, aged 16 years. Also of Thomas Martin, their son who died Sept'r. 6 1792, aged 25 years. And of the said Elisabeth Aitken, who died the 3rd Dec. 1809, aged 79 years. And also of the said William Martin, who died 5th April 1814, aged 71 years. 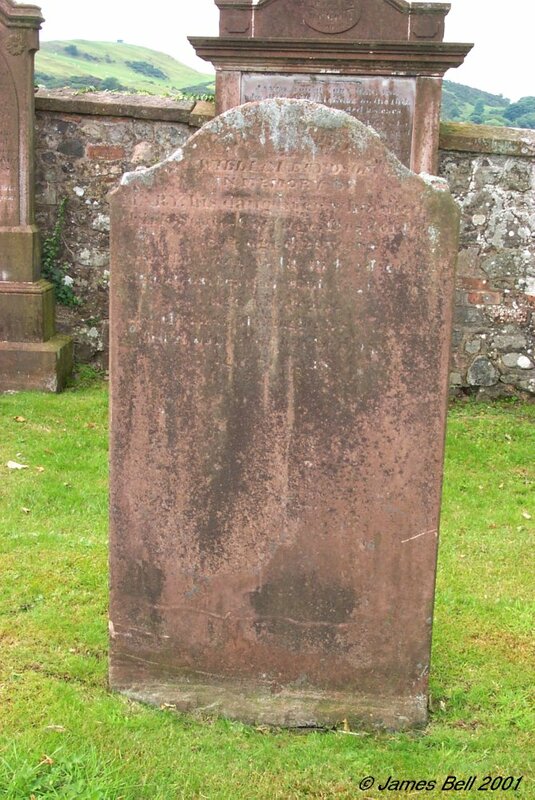 Reverse: Also James Martin, who died at Kirkennan, 17th Aug't 1838, aged 67. 210 Erected by D. Kingstree, shoemaker, Gelston. 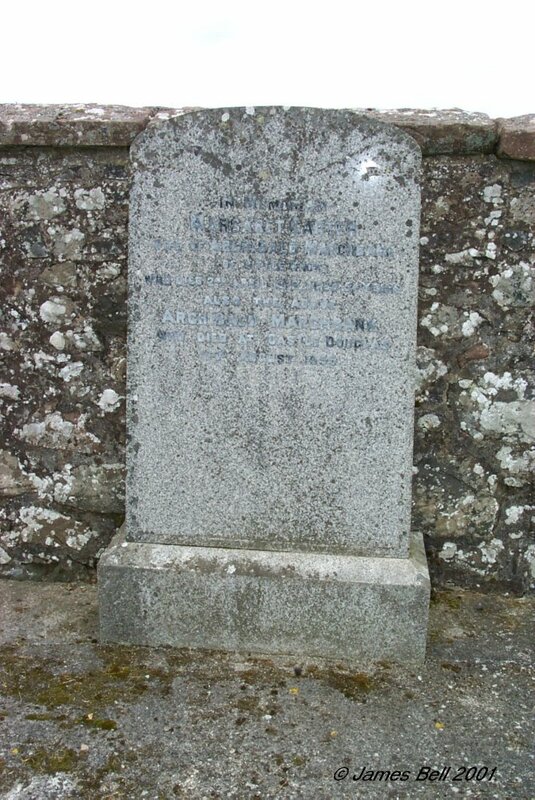 In memory of his father Joseph Kingstree, who died at Dalbeattie, 19th March 1865, aged 102 years. Also Lucia Porter, his spouse, who died 19th April 1865, aged 90 years. Also Lucia Kingstree, his daughter, who died 23rd Feb. 1852, aged 1 years. Also Janet Currie, his wife who died at Dalbeattie, 10th Jan'y. 1892, aged 72 years. 211 Erected by David McFegan, in memory of his mother Elizabeth Slater, wife of William McFegan, who died at Hopehead, 25th Oct. 1883, aged 67 years. Also William McFegan, her husband, who died at Terreglestown, 17th Oct. 1893, aged 84 years. 212 Sacred to the memory of Robert Strachan, who died at Gelston Lodge, Parish of Kelton, on the 19th of March 1847, aged 62 years. 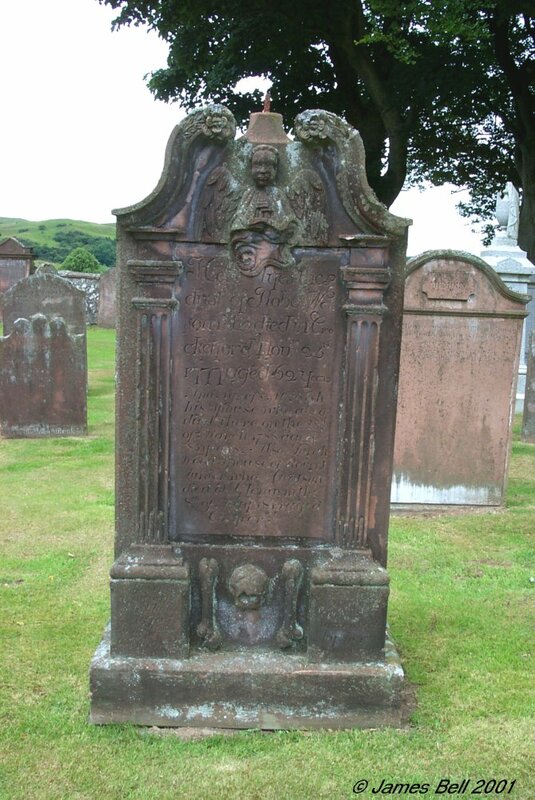 Robert, his son, who died at Dalbeattie, 13th June 1808, aged 8 months. 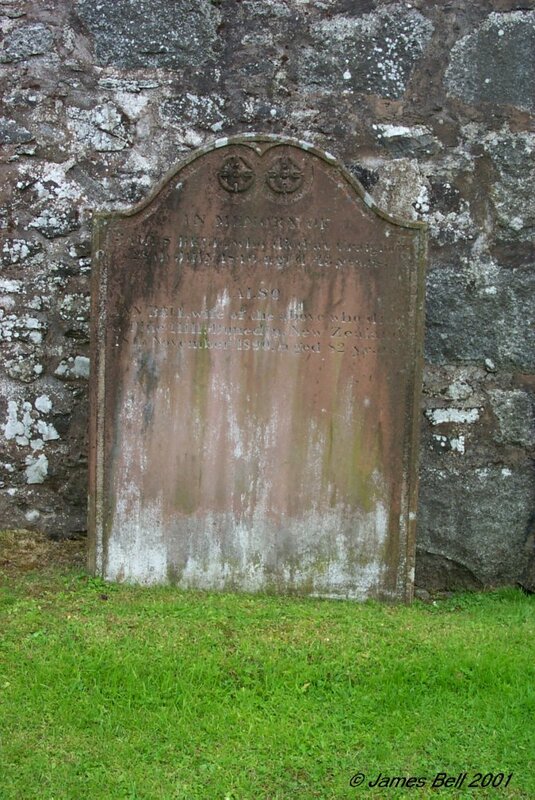 Isabella, his daughter, who died at Dalbeattie, 4th of October 1828, aged 11 years. 213 Erected by William Laurie, in memory of his wife, Mary McKenzie, who died at Craignair Bridge, 20th of December 1881, aged 28 years. 214 Erected by Samuel & Marion Callander, in loving memory of Alexandrina W.D. Graham, their fifth daughter, who died at Halket Leaths Smithy, 31st Jan'y. 1893, aged 6 months. Roberta T. Tarbet, their fourth daughter, who died in Edinburgh, 27th Oct'r. 1918, aged 28 years. Also the said Samuel Callander, who died at Chapelyard, 8th Dec'r. 1933, aged 77 years. Also Marion Harkness Graham, his wife, who died at Chapelyard, 27th Feb'y. 1937, aged 80 years. Also Isabella, their daughter, who died at Oaklea, Gelston, 8th Sept. 1964, aged 78 years. Also James Graham, their son who died 2nd July 1966, aged 87 years. 215 Sacred to the memory of Thomas Helm, who died at Castlegower, 16th May 1881, aged 2 years and nine months. 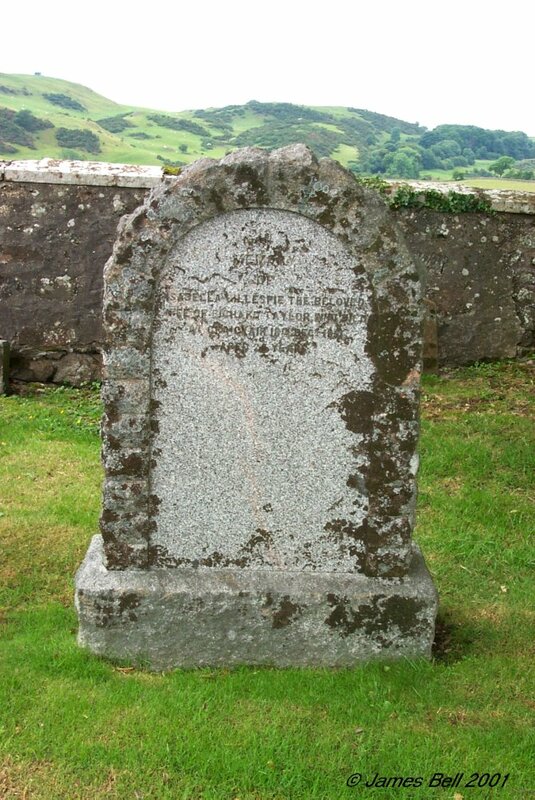 William, son of Thomas Helm, Castle gower, who died at Breoch Cottage, 13th Mar. 1886, aged 26 years. Died at Jagers Fontein Orange Free State, South Africa, on 13th October 1889, Robert, third son of Thomas Helm, Castlegower, in his 26th year, Thomas Helm, their father, who died at Eskbank, 20th April 1905, in his 82nd year. Also Euphemia Hunter, wife of the above Thomas Helm, who died at Eskbank, on the 14th March 1907, aged 71 years. Also Elizabeth Leitch Helm, daughter of the above Thomas Helm, who died at Blackhall, Midlothian, 21st January 1911, aged 52 years. Also Isabella Hunter Helm, their daughter, who died in London, 31st December 1946, aged 65 years. 216 Memorial. 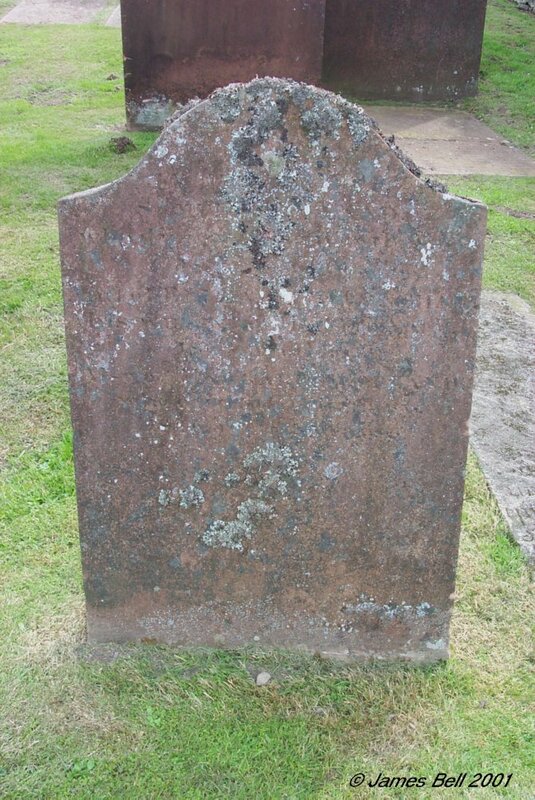 Died at Halmyer of Kelton, on the 20th Sept. 1834, Nathan Kinstray, aged 70 years. At Little Forrest of Rerwick, 27th July 1837., Jane Gracie, his wife, aged 71 years. At same place, 5th Dec. 1834, William Kinstray, their grandson, aged 26 years. Erected by Mary Kinstray, their daughter. 217 In memory of Margaret Raffle, spouse of Robert Kinstray, who died at Clone, Buittle, on the 19th of Nov'r. 1820, aged 50 years. 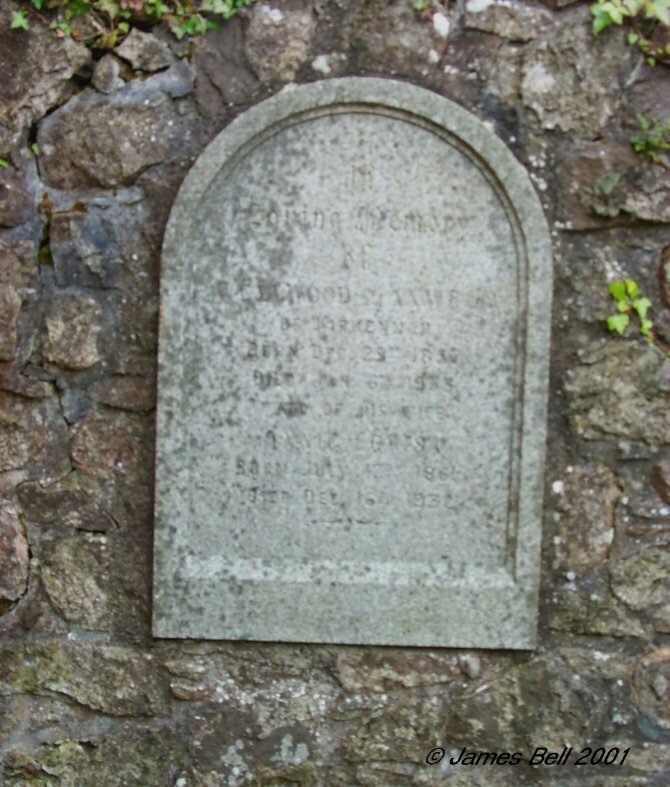 James Kinstray, their son, who died on the 21st of April 1824, aged 15 years. 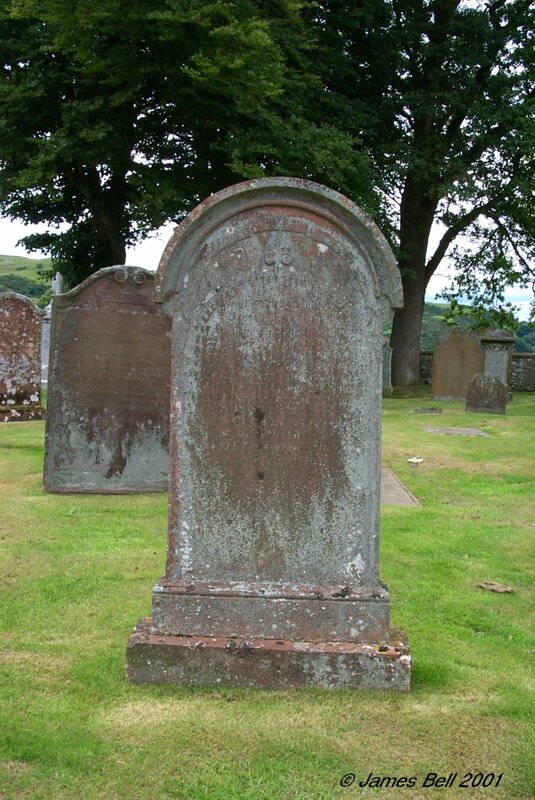 Also the above Robert Kinstray, who died on the 24th of May 1845, aged 78 years. 218 Erected by Agnes Christie, in memory of Robert, her brother, who died at Akieslack, 16th Nov'r. 1795, aged 9 months. 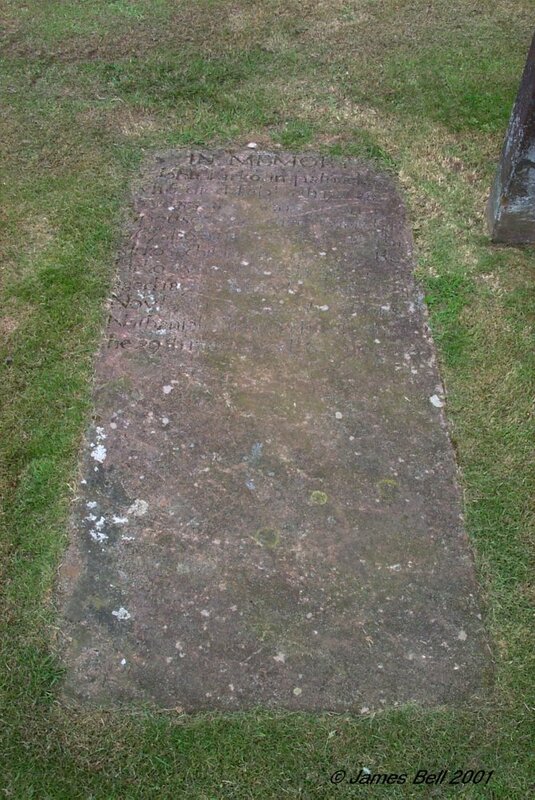 Elizabeth, her sister, died 12th May 1797, aged 9 years. 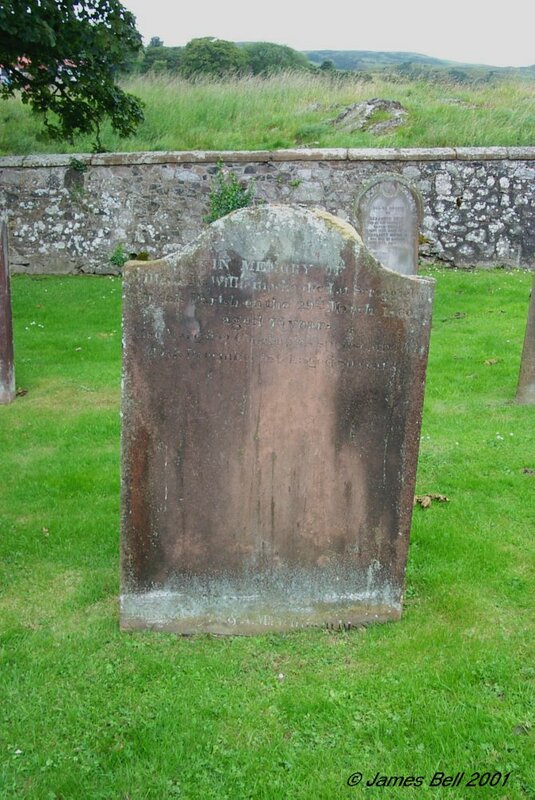 James, her brother, died 21st June 1824, aged 17 years. Robert, her brother, died 26th Nov'r. 1825, aged 25 years. 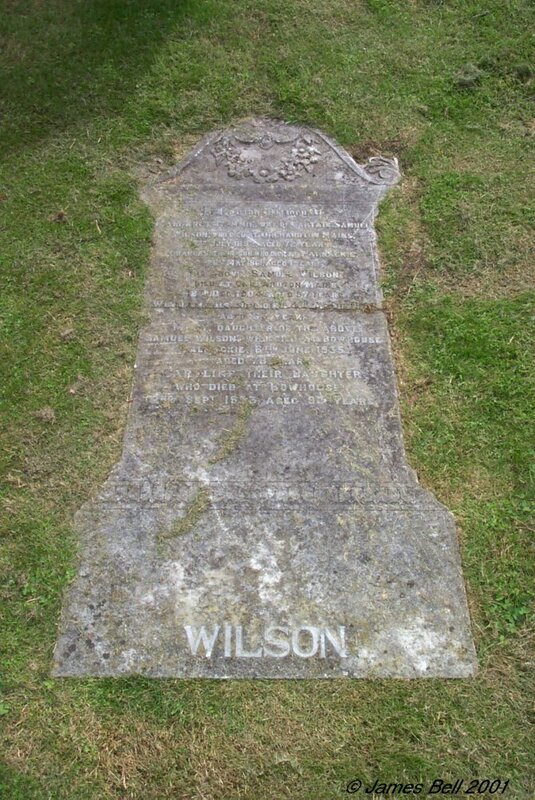 Hellen Wilson, her mother, died 10th Nov'r 1826, aged 63 years. John, her brother, died 26th June 1842, aged 42 years. 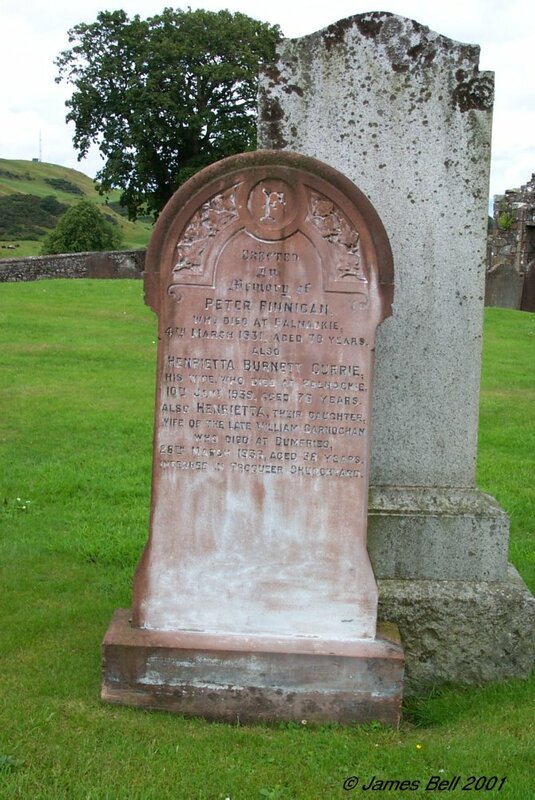 Peter, her brother, died 13th Nov'r 1846, aged 38 years. 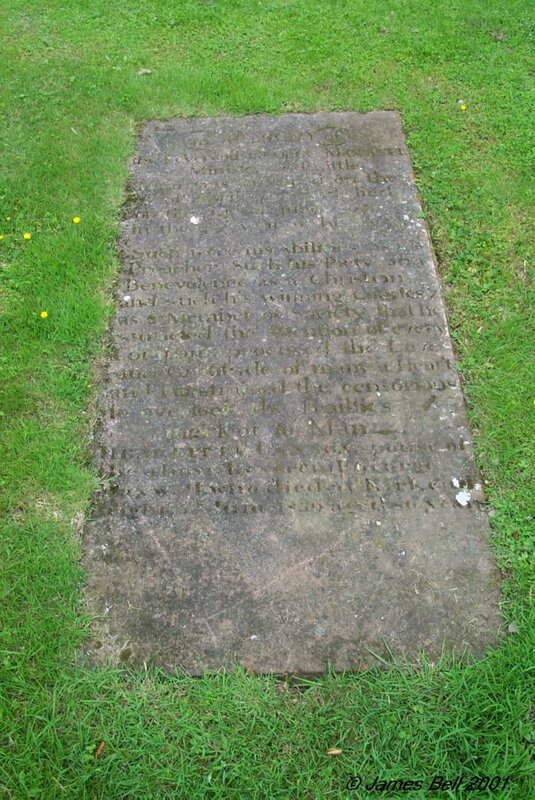 John Christie, her father, died 20th April 1847, aged 74 years. Also my son Peter Christie, who died at Akieslack, 18th Jan'y. 1848, aged 9 years. 219 Erected by James and Nathaniel Hastie in memory of William Hastie, their father, late in Whitehill, Parish of Kelton, who died in Dalbeattie 5th Feb. 1815, aged 85 years. 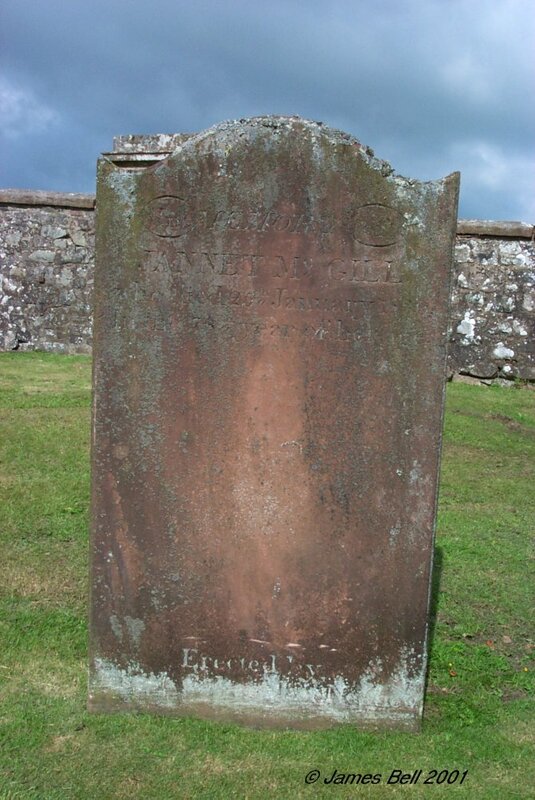 220 In memory of James Tait, who died at Barlochan Miln, 23rd March 1814, aged 69 years. Also of Alexander and James his sons who died in infancy. Mary Robertson, his spouse, who died at Dalbeattie, on the 19th of Dec'r. 1831, aged 86 years. 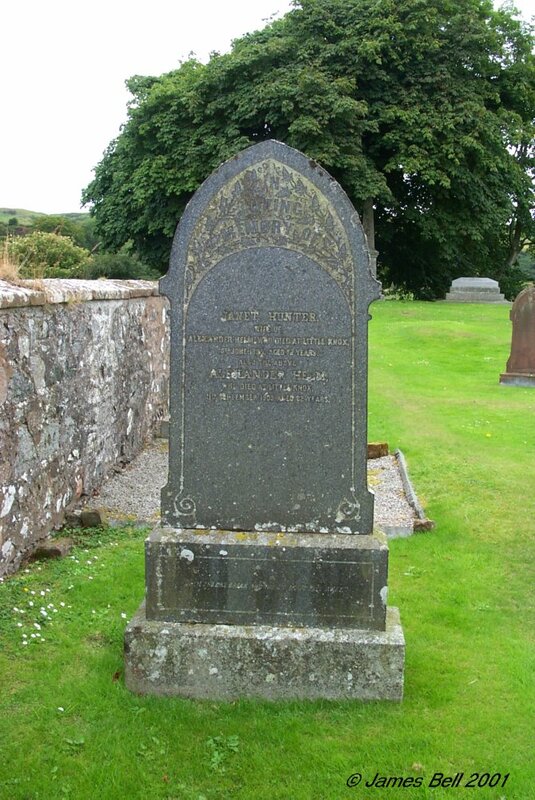 Gordon Tait, his son, who died also at Dalbeattie, 4th Feb. 1844, aged 77. 221 In memory of John Foster, who died 19th Nov. 1811, aged 11 years. And of Isabella Foster, who died 28th Dec'r. 1811 aged 15 years. 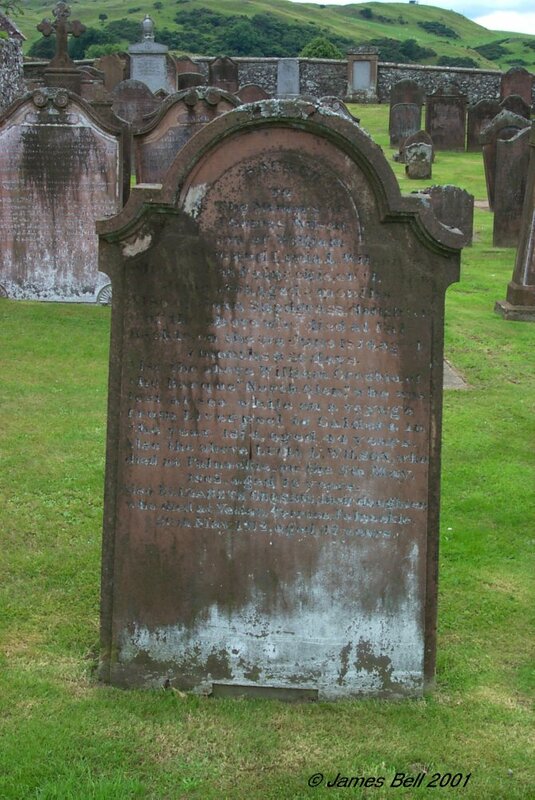 222 Of your charity, pray for the souls of Thomas Rigg, formerly of Mid Kelton, who died at Dumfries, 2 Jan. 1853, aged 75 years. 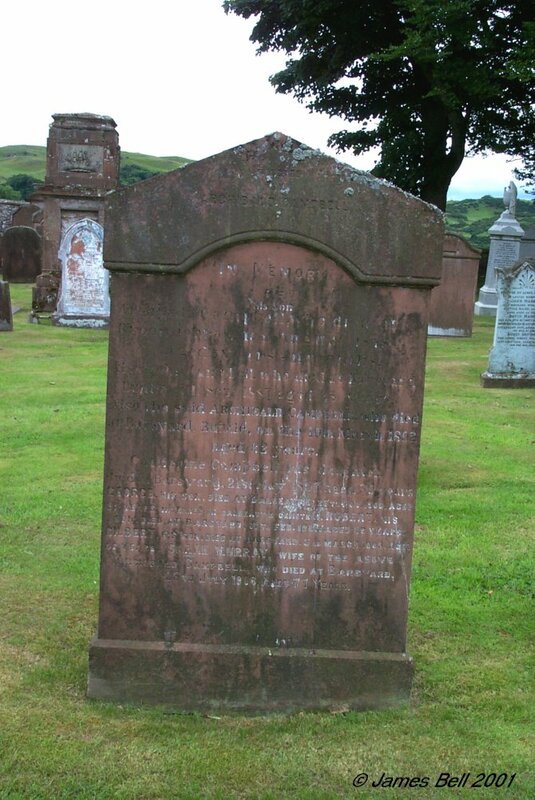 Of Mary Webster, his wife, who died at Dumfries, 25 April 1866, aged 68 years. 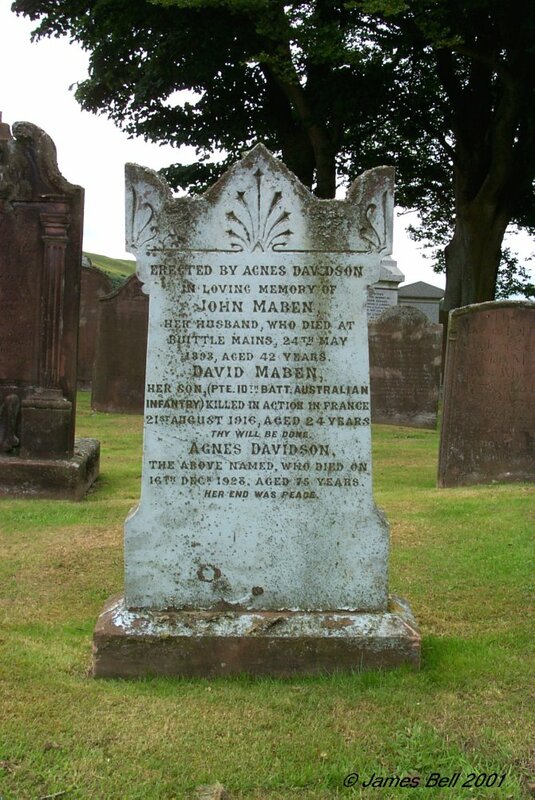 Of Mary, their fourth daughter, who died at Dalbeattie, 16th October 1894, aged 68 years. 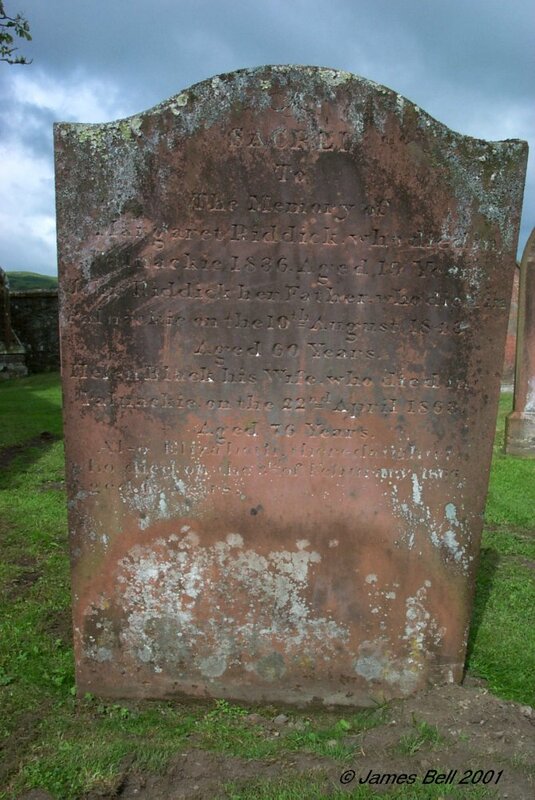 223 In memory of John Rigg who died at Meikle Knox the 5th of March 1811, aged 79 years. 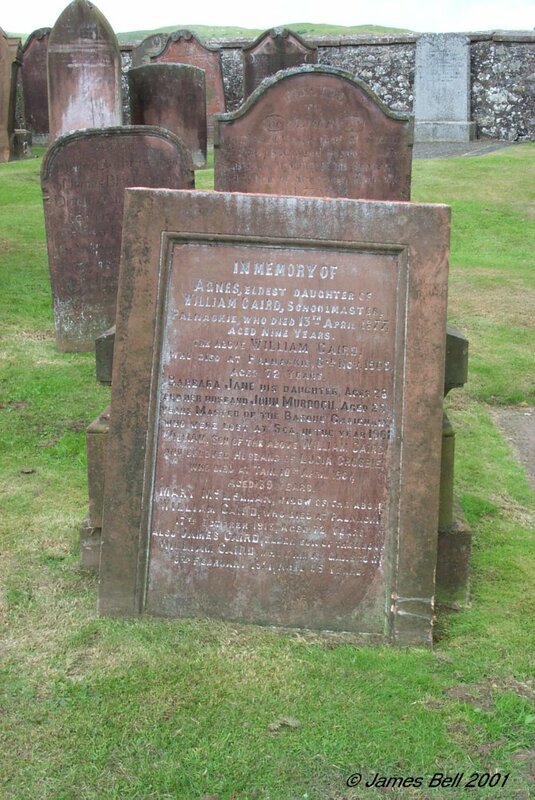 And also of Ann Rigg, his spouse, who died on the 4th May 1821, aged 89 years. 224 In memory of Walter Patterson, who died at Jamaica, in 1826, aged 28 years. Also Elizabeth Hannah, his mother, who died 1st February 1837, aged 75 years. Also Walter Patterson, father, late tenant in .Allanbank, who died 5th Dec'r. 1840, aged 78 years. Also Isabella Patterson, his daughter and wife to James Foulis, Dalbeattie, who died at Southend, Crossmichael, 13th of October 1866, aged 69 years. 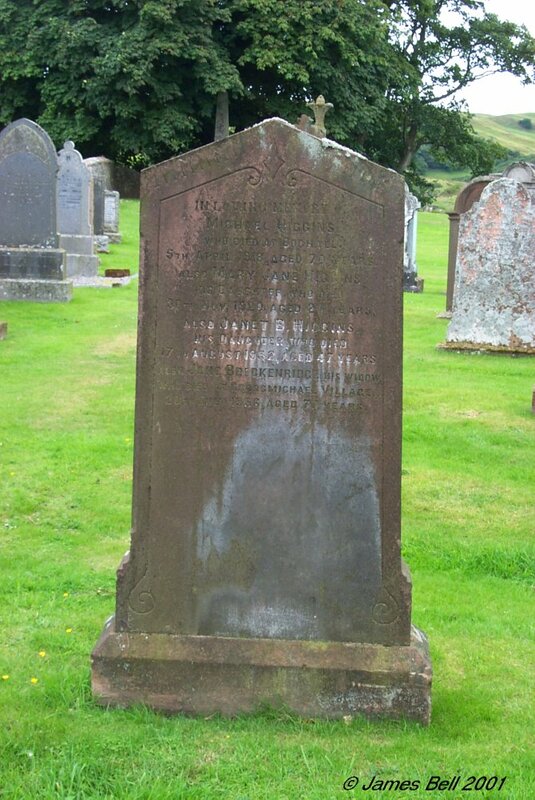 Also the above James Foulis, who died at 65 High Street, Dalbeattie, 30th August 1882, aged 86 years. Erected by Isabella Patterson, their daughter. 225 Sacred to the memory of George Cole, who died at Burnstick 19th March 1855, aged 26 years. Also his mother Janet Hannay, wife of Charles Cole, who died at Burnstick, 2nd June 1872, aged 73 yrs. 226 Erected by James Webster, in memory of Elizabeth Webster, his daughter, who died at Breckanhill, 19th Dec. 1817, aged 14 years. 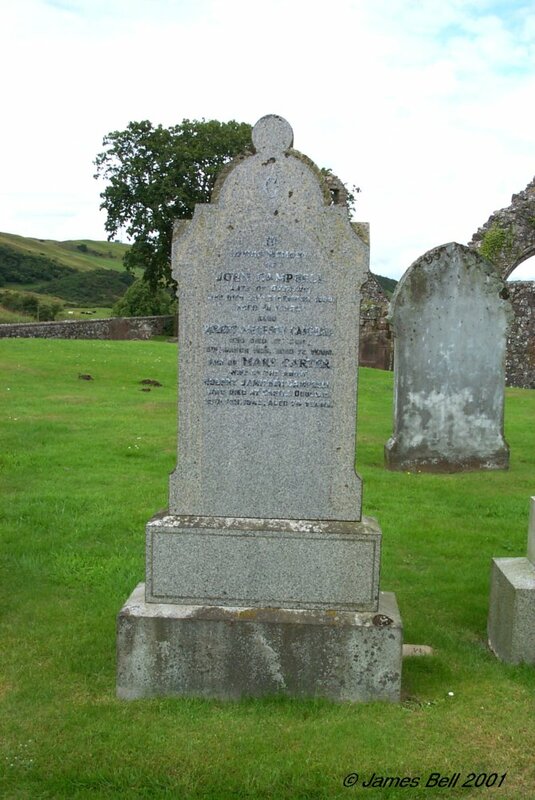 Also Andrew Loudan, his father-in-law, who died at Dalbeattie, 3d November 1828, aged 79 years. 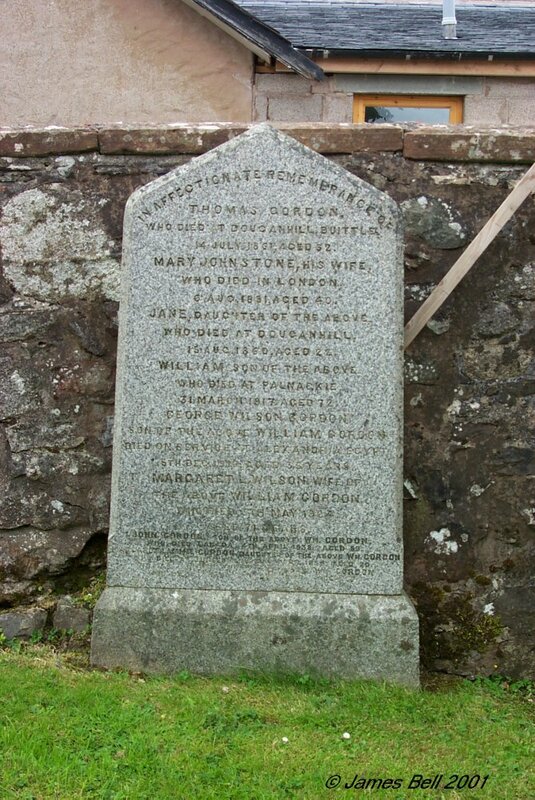 Also Barbara Copland, his spouse, who died at Dalbeattie, 10th October 1835, aged 90 years. And Elizabeth Loudan, spouse of James Webster, who died at Munches, 7th February 1836, aged 57 years. Also of Margaret Webster, their daughter, who died at Munches, 10th of May 1842, aged 28 years. Also Jessie Webster, wife of Thomas Chalmers, who died 22nd July 1848, aged 39. Reverse: In memory of James Webster, for fifty six years gardener and overseer at Munches, trusted and esteemed for his ------ and integrity by successive heads of family to which he was attached. He has left his relatives a respected name, and to all an example of the good and faithful servant. Departed this life on the 16th March 1850, aged 82. Also William Webster, his son, who died at Craignair Cottage on the 6th of May 1860, aged 52 years. 227 Erected by Samuel Porter, in Barrhill, in memory of his son John, who died there, the 9th June 1817, aged 24 years. 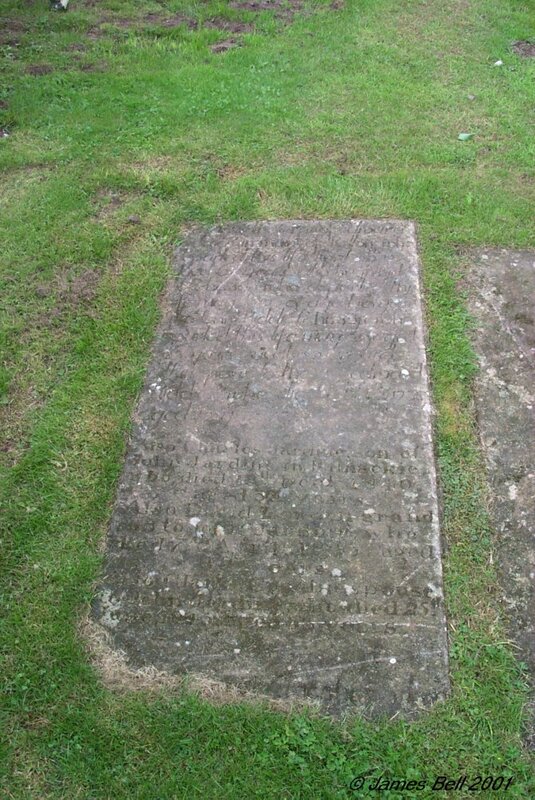 Likewise of Mary Johnston, his wife, who died the 8th of April 1823, aged 59 years. 228 Erected in memory of Mark Simpson, died at Walltrees, Southwick, 13th Dec. 1906, aged 74 years. 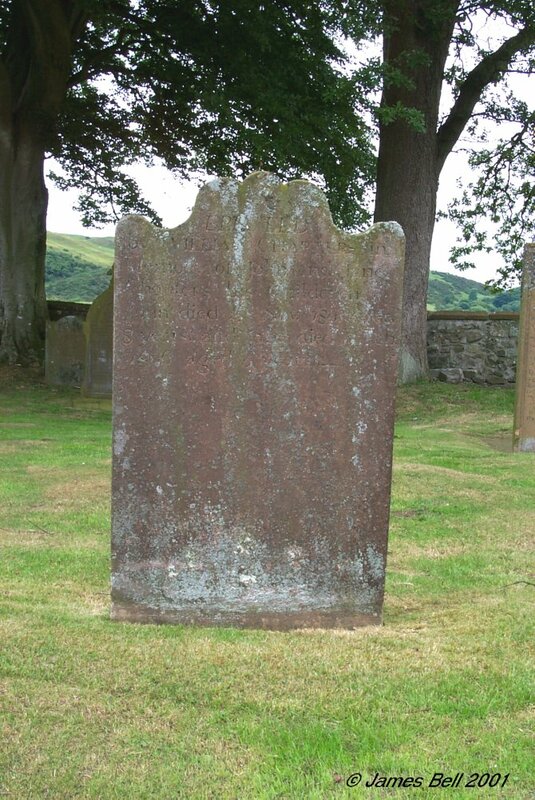 James Simpson, died at Corra, 8th June 18--, aged 3 years. Thomas Simpson, died at Corra, 10th June 1875, aged 8 years. Mary Simpson, died at Corra, 17th June 1875, aged 22 years. Jane Simpson, died at Corra, 20th June 1875, aged 1 1/2 years. Isabella Simpson, died at Corra, 20th July 1875, aged 5 months. Rachel Hannah, wife of the above Mark Simpson, died 17th Dec. 1923, aged 91 years. Mark, grandson of the above, aged 7 years. Mark Simpson Jun'r, died 8th Aug. 1945, aged 83 years. 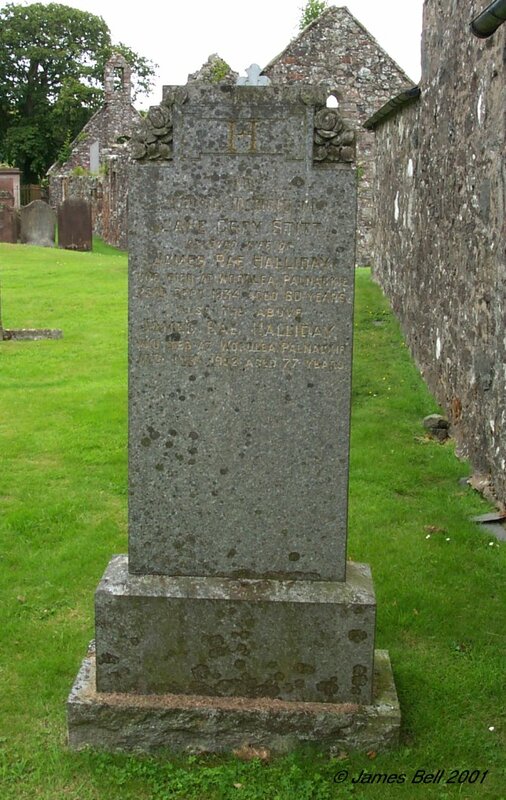 Robert Simpson, late of Auchenlosh, Southwick died 7th March 1949, aged 83 years. 229 Although set almost against the wall, this stone has an inscription on rear. It was not possible to photograph this inscription. In memory of John Robson, who died at Palnackie, on the 8th of August 1850, aged 65 years. Also Mary Black, his spouse, who died the 28th July 1850, aged 65 years. 'It has pleased the Lord to separate them from us and called them by his grace.' Also his son John Robson, who died in Liverpool, on the 9th October 1843, aged 34 years. Also his son James Robson, who died at Buenos Ayres, South America, the 22nd of April 1845, aged 39 years. Also Capt. Robert Robson, their son who died at Hong Kong, 11th October 1864, aged 39 years. 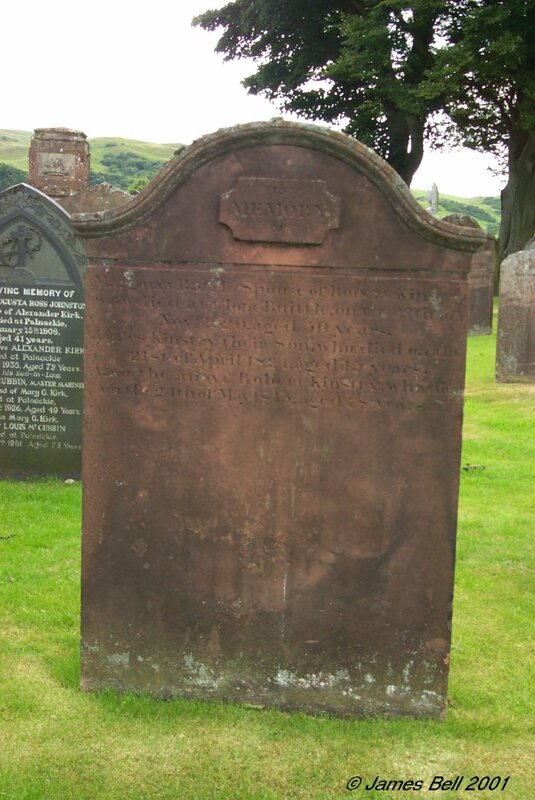 Reverse: In memory of Mary Robson, daughter of John Robson, Barlochan, who died 20th March 1822, aged 5 months. Also Jane McNaught Robson, who died 21st Sept'r 1827, aged 9 years. Also Maxwell Robson, who died 24th Nov'r 1829, aged 15 years. Also William Robson, who was lost at sea 9th Feb'y 1881, aged 22 years. 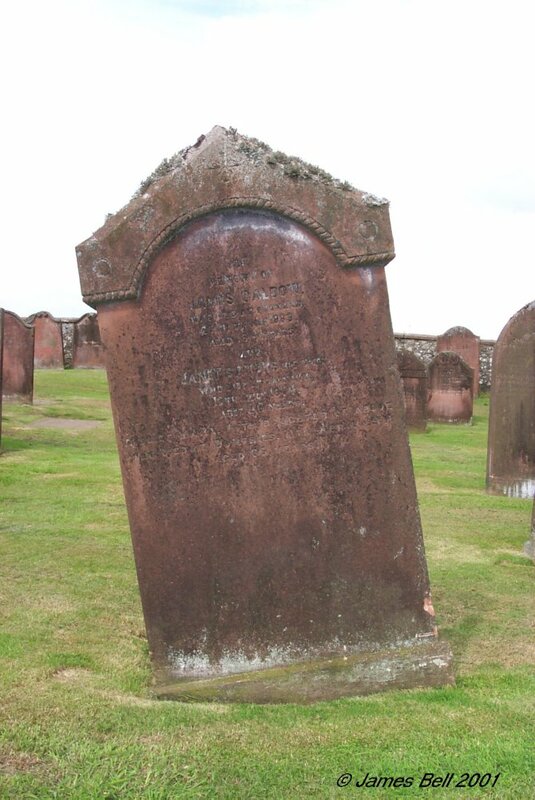 230 Erected by John McClure, in memory of Mary Tait, his spouse, who died the 7th June 1822, aged 61 years. Also of Elizabeth, their daughter, who died in infancy. 231 Erected in memory of John Gordon, who died at Barsyard, the 3rd February 1848, aged 67 years. Also his son Samuel Gordon, aged 39 years. Also of Samuel, eldest son of James Gordon, who died at same place, the 22nd of Feb'y. 1852, aged 21 years. And Jessie, daughter to the said James Gordon, who died 28th Nov. 1856, aged 23 yr. Also of Margaret, eldest daughter of James Gordon, Cullinaw, who died 27th August 1873, aged 1 year and 5 months. 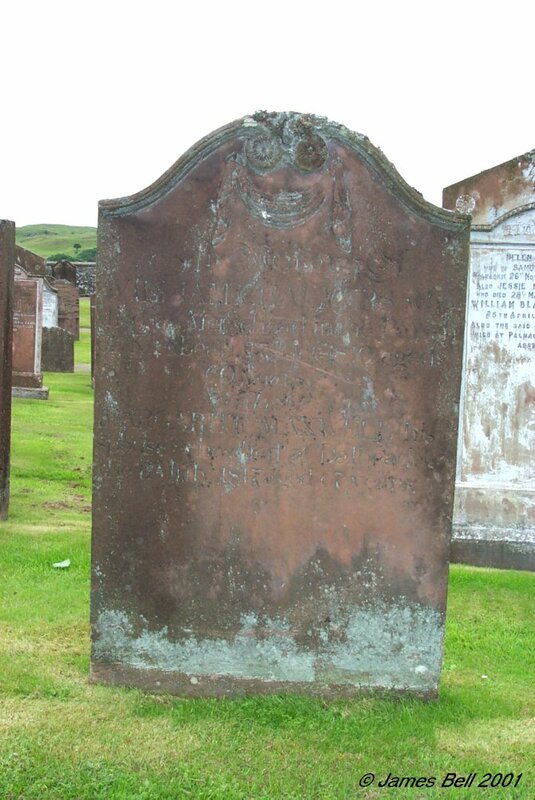 Also Margaret McCaig, wife of James Gordon, Barsyard, who died 29th July 1832, aged 73 years. 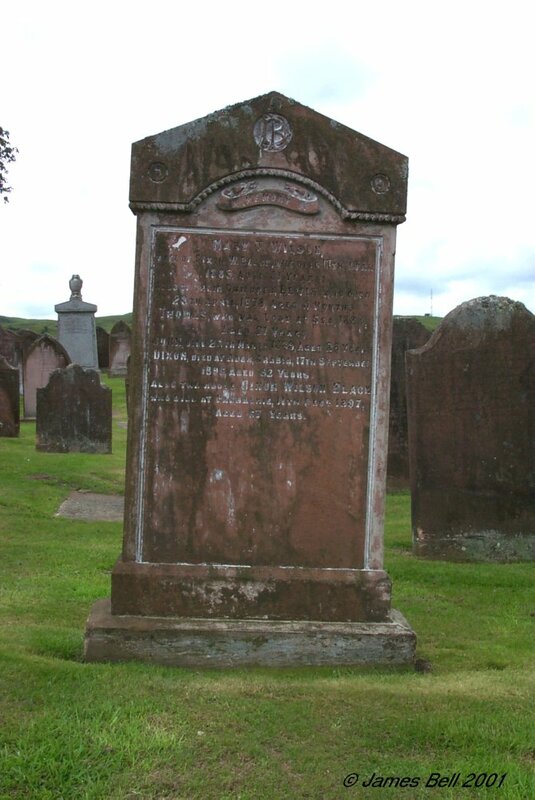 Also Jessie, third daughter, of James Gordon, -------- Buittle Mains, died 21st March 1886, aged 9 years & Also Agnes, fourth daughter, of the above, who died at Larbert, 25th Oct'r. 1889, in her 12th year. Also James Gordon (Late of Barsyard) who died at Gullinaw, 5th Nov'r. 1890, aged 82 years. Also John Gordon, his youngest son, who died at Tynemouth, 18th January 1915, aged 53 years. 232 In memory of James Hair Fleming, who died 29th Dec'r. 1821, aged 4 months. Also Agnes Fleming, who died 28th October 1822, in infancy. Children of Ebinazer Fleming & Jean Smith in Clone. 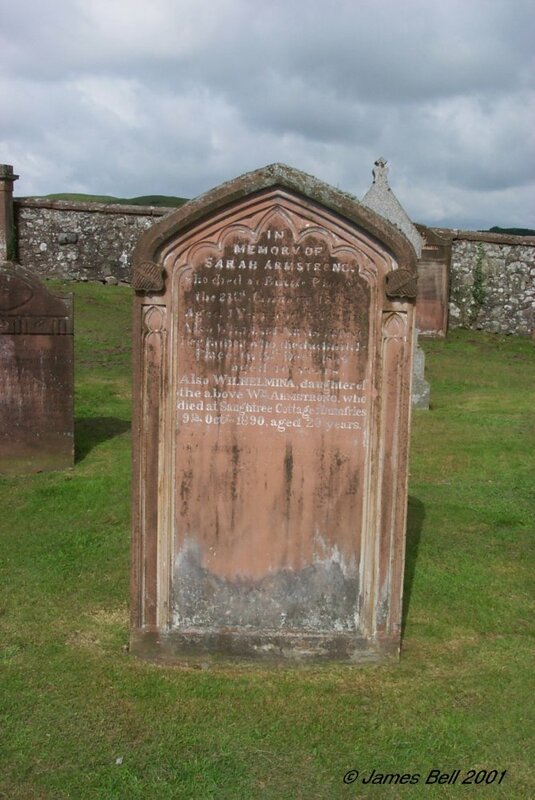 Also of the said Ebinazer Fleming, who died at Midtown of Kelton, on the 31st October 1834, aged 47 years. 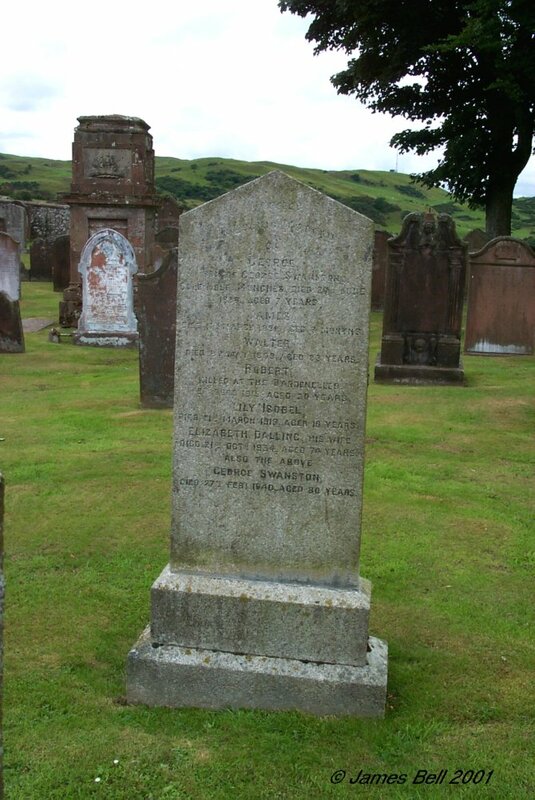 Also Janet Thomson, his mother, who died at same place 24th July 1836, aged 91 years. Also Ebinazer, his grandson, and son of T. S. Fleming, painter, C.D., who died 20th Dec'r 1841, aged 18 months. The said T. S. Fleming, died at Nashville, U.S.N.A., 15th June 1849, aged 33 years. Also Jane Smith, spouse of the above Ebenezer Fleming, who died 7th Nov. 1866, aged 85 years. 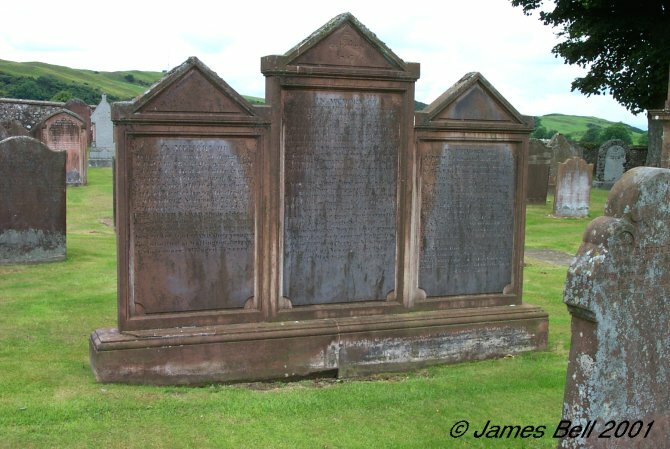 Reverse: In memory of Jane & William G. Fleming, children of William Fleming, flesher, Castle Douglas, the former, died 23rd Dec'r. 1849, aged 6st year. The latter Jan'y 6st 1850, aged 16 months. Also James, son of the above, who died 1st Dec'r 1859, aged 4 years and 4 months. 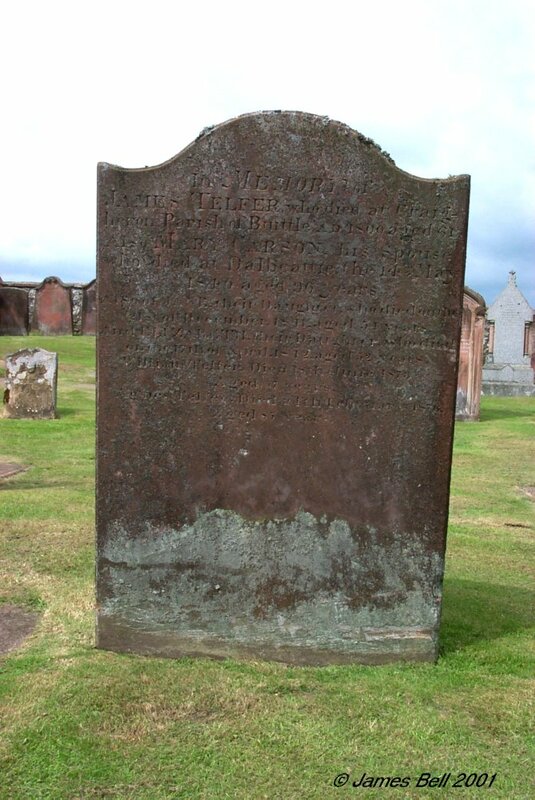 233 Elizabeth G. Lybucker, and her little ones, Abraham and Louisa Fotheringham, all died at Leith, in October 1840. 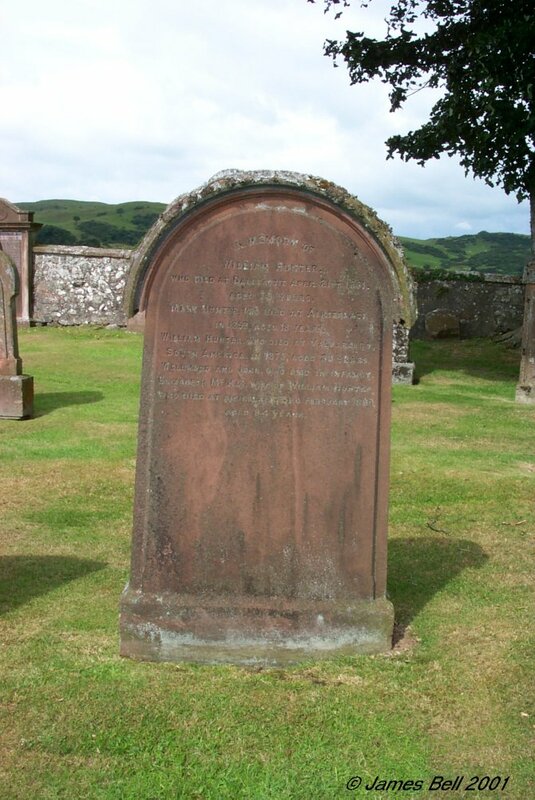 Helen Lamb, died at Barlochan, 24th Sept 1870, aged 68 years. 234 In memory of David Richardson, died at Breckoniehill, 18th June 1887, aged 45 years. 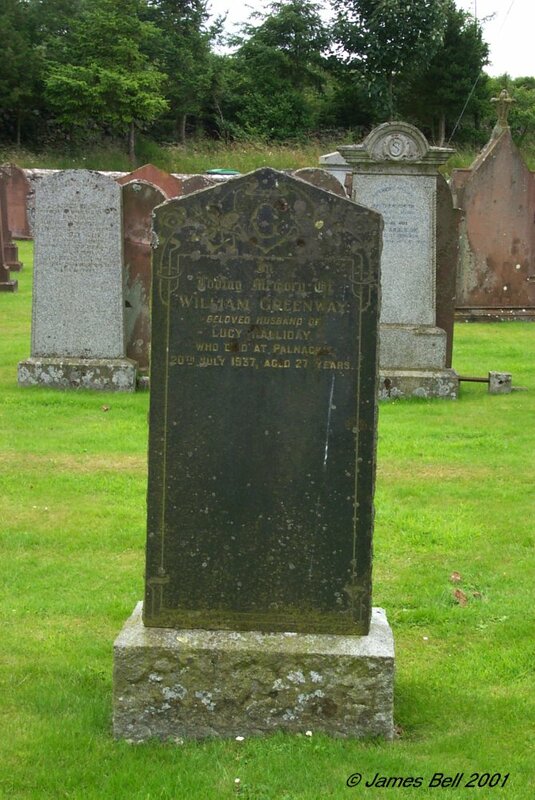 William, his son, died at Barrhill, Dalbeattie, 16th Aug. 1895, aged 26 years. Ellen, his daughter, died at Thornhill, aged 21 years. Margaret Shaw, wife of the above David Richardson, died at 1 Woodvale Terrace, Maxwellton, 13th November 1912, aged 66 years. Erected by his widow. 235 In affectionate remembrance of Thomas Gordon, who died at Douganhill, Buittle, 14 July 1861, aged 52. Mary Johnstone, his wife, who died in London, 6 Aug, 1851, aged 40. Jane, daughter of the above, who died at Douganhill, 15 Aug. 1860, aged 22. William, son of the above, who died at Palnackie, 31 March 1917, aged 72. George Wilson Gordon, son of the above William Gordon, died on service at Alexandria, Egypt, 5th Dec. 1916, aged 35 years. Margaret L. Wilson, wife of the above William Gordon, who died 5 May 1924, aged 71 years. John Gordon, son of the above, Wm. Gordon, who died at Canada, 4th April 1938, aged 59. Margaret Lammie Gordon, daughter of the above Wm. Gordon, who died at Dunfermline, 2nd April 1659, aged 70. Thomas Gordon, son of the above Wm. Gordon, who died Canada, 8th Dec. 1960, aged 67. 236 Erected by John Black, in memory of his wife Marion Jamieson, who died at Chapelcroft, 1st July 1889, aged 67 years. Also John his son, who died at Manchester, 3rd May 1891, aged 40 years. Also his daughter Alice Jane, who died at Potterland, 25th Dec. 1904, aged 44 years. Also the said John Black, who died at Potterland, 28th December 1906, aged 80 years. Also Robert Forteath, Potterland, his son-in-law, who died on the 29th October 1908, aged 38 years. Also Mary Black (Forteath), his daughter, who died at Farhills, Rerrick, 29th June 1913, aged 50 years. 237 Erected to the memory of Thomas Wilson, who died at Palnackie, 23rd March 1859, aged 82 years. Agness Coskery, his daughter, who died 9th Dec'r. 1836, aged 18 years. 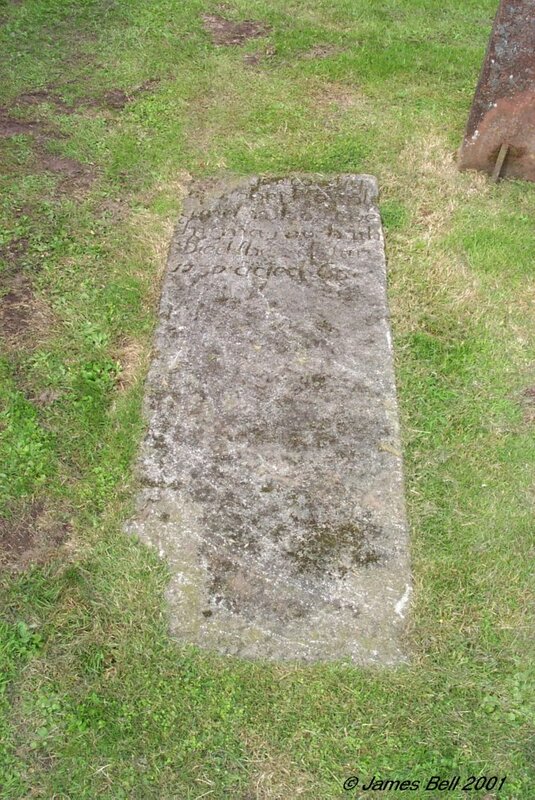 Also Jane McWilliam, his daughter, who died 15th June 1854, aged 23 years. Also William & Samuel Wilson, his sons, who died in Australia, aged 38 & 34 years. Also Jane Miller, wife of the above Thomas Wilson, who died at Palnackie, 19th November 1882, aged 93 years. 238 Sacred to the memory of Capt. 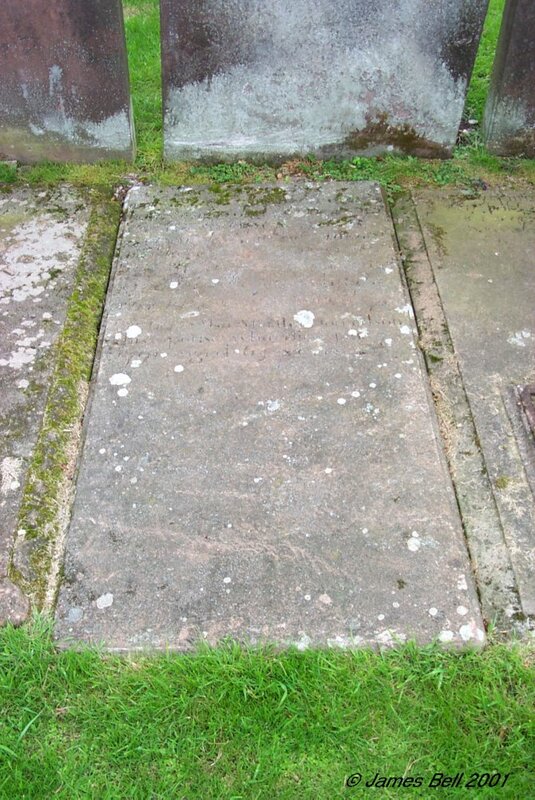 John McLellan, who died at Barlochan, on the 12th of March 1850, aged 40 years. 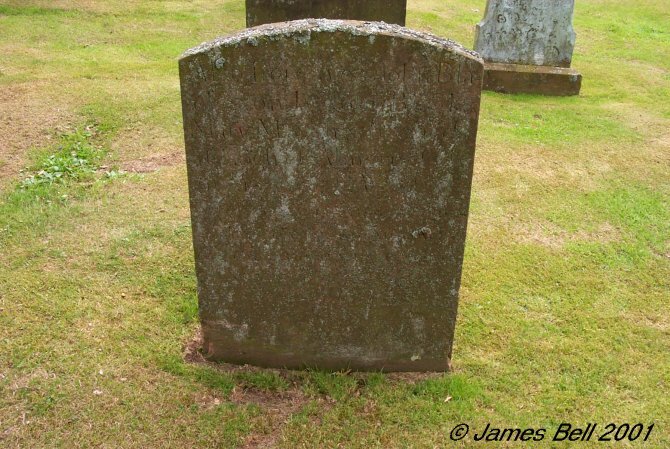 Janet Cowan, wife of the above, who died at Barrow in Furness, 12th of Jan. 1891, aged 82 years, and was interred in Dalton Cemetery, Lancashire, James McLellan, their son, who died at Palnackie, 10th Nov. 1902, aged 72 years. Jane Lindsay, wife of the above James McLellan, who died at Barrhill, Dalbeattie, on the 14th of Jan. 1925, aged 90 years. 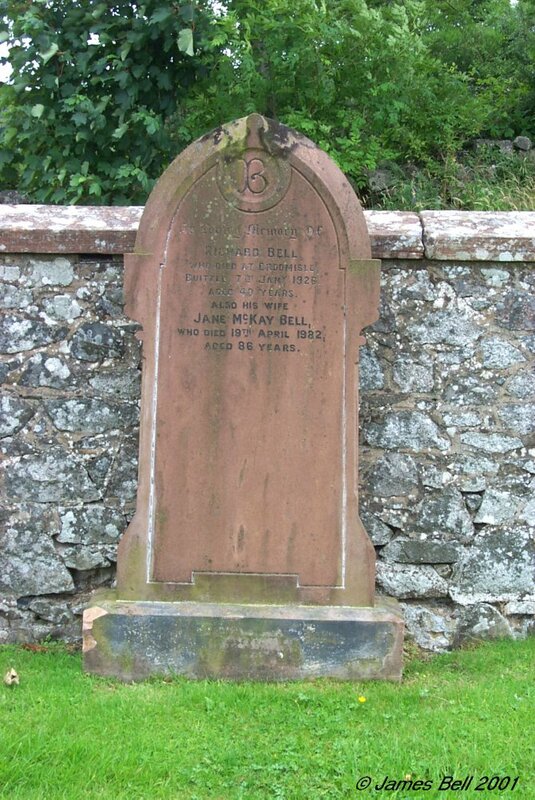 239 In memory of James Bell, who died at Craignair, 26th July 1849, aged 43 years. Also Ann Bell, wife of the above who died at Pine Hill, Dunedin, New Zealand, 18th November 1890, aged 82 years. 240 This stone is quite worn. Sections in brackets are my interpretation of what I think they contain. 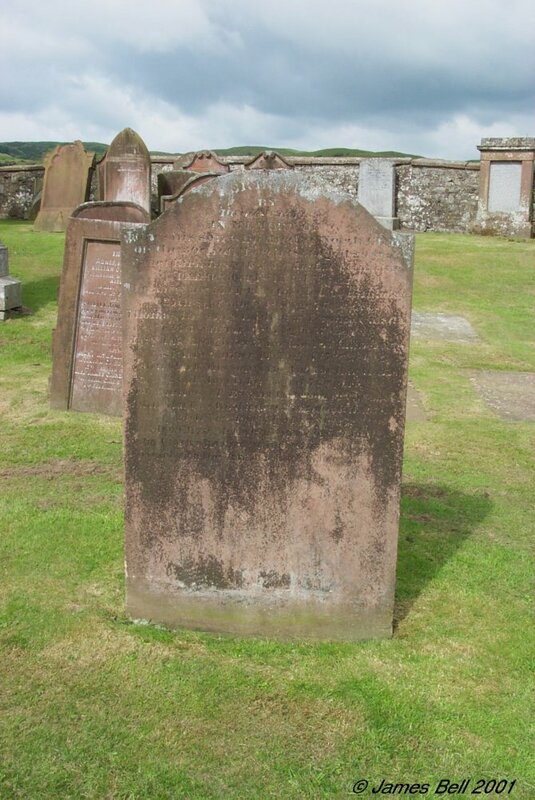 Here lyes the corpse of (Mary Wilson), spouse to (John) Heughan in Logan who died (blank) 1761, aged 6- years. 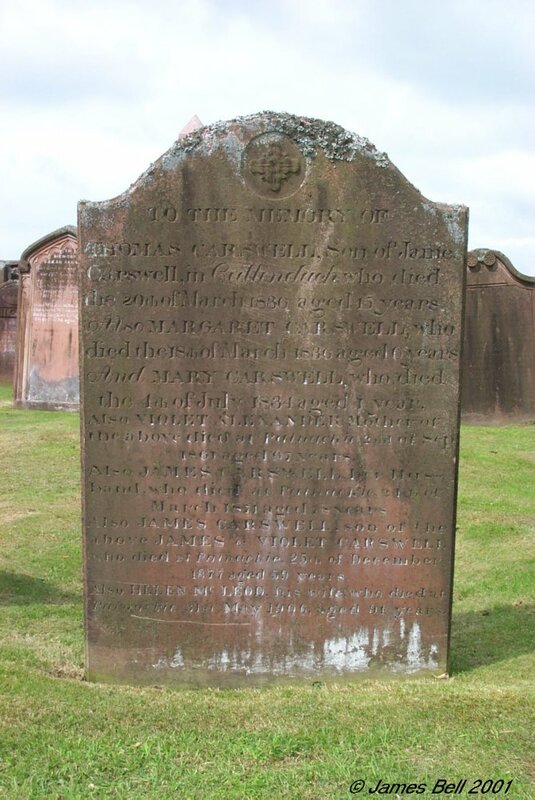 And in memory of Thomas, son of James Heughan, who died at Buittle Miln the 1st March ----, aged 20 years. 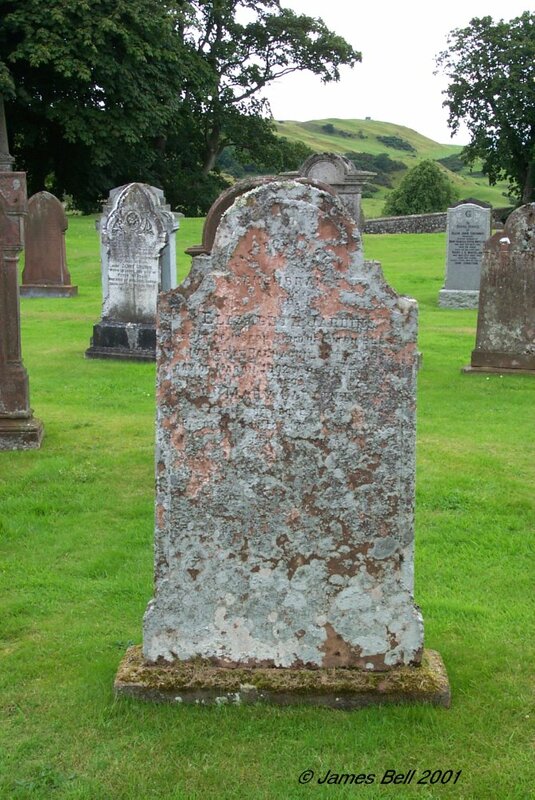 Also the said James Heughan who died (9th) of Dec. 1802, aged (6-). And of Janet Duff, his spouse, who died the 18th Dec. 1807, aged 67 years. 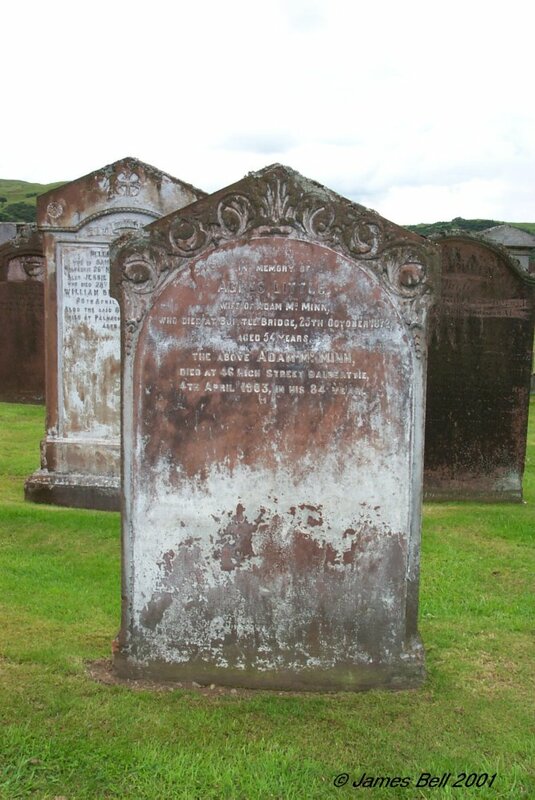 Likewise of John Heughan, their son, who died the (20th) Aug. 1811, aged -- years. 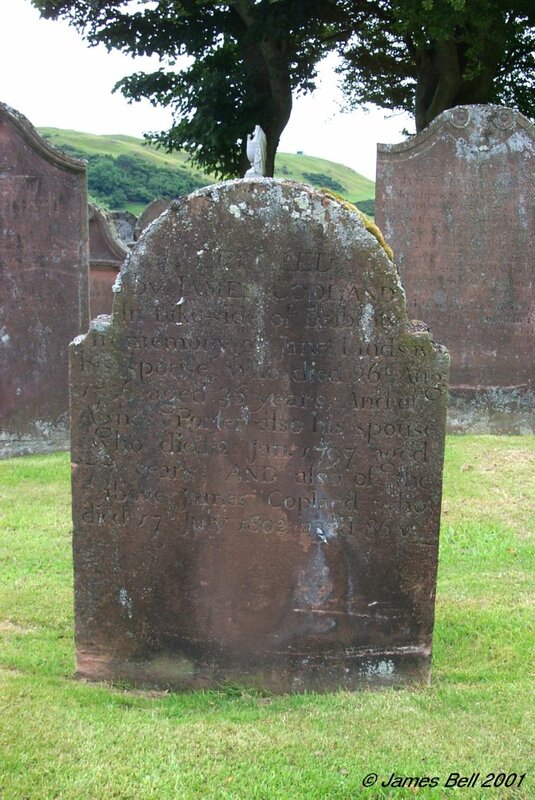 Also William Heughan, their son, who died at Barlochan on the 4th December 1839 (or 59) aged 81 years. And William, son of the above William Heughan, who died at New York 25th of ------. 18--. aged 36 years. Also Charles, his son, who died at St. John, N. B., (10th) Jan. 18--, aged --. Isabella Donaldson, spouse of the above William Heughan, who died at Palnackie 11th March 1868, aged 8- years. 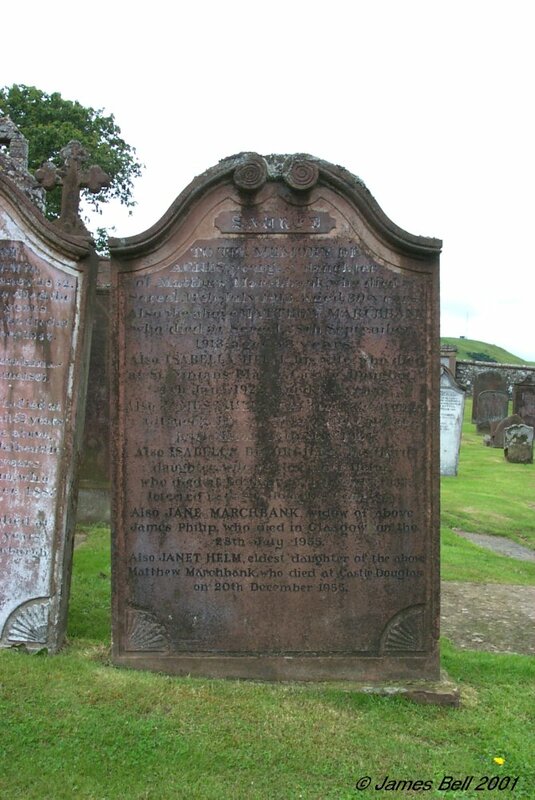 Janet Heughan, died Palnackie, Dec'r 2nd 1899, aged 80 years. 240a In memory of Wellwood Maxwell, of Kirkennan, born Dec 29th 1857, died Jan. 6th 1933. And of his wife Annie Louisa, born July 17th 1861, died Dec. 16th 1932. 241 In memory of Alice, infant daughter of Wellwood Maxwell of Kirkennan, born April 10th 1893, died April 26th 1893. And Margaret her sister, born May 28th 1694, died June 3rd 1894. 242 In memory of Ann Rigg, spouse to Alexander Broadfoot, who died at Bridge of Urr, the 16th of October 1832, aged 52 years. 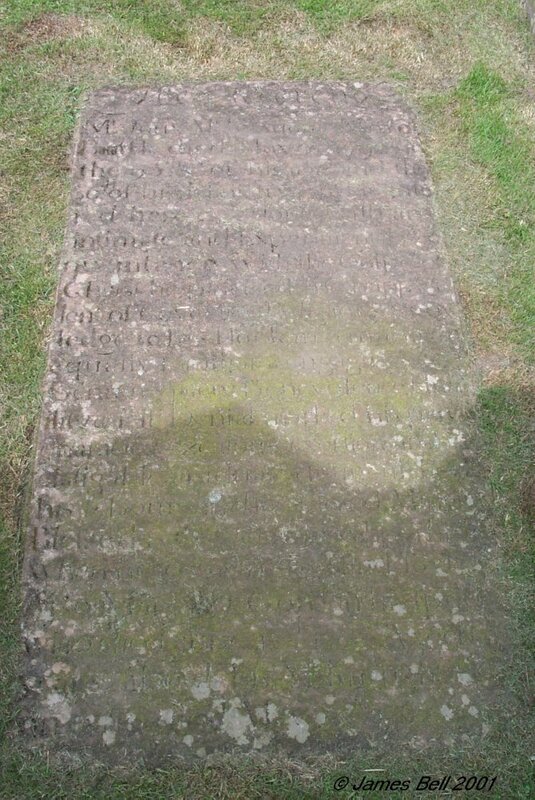 Also of their children viz:- John, who died 24th June 1808, aged 3 years and eight months. Mary, who died 9th June 1815 aged 9 days. John, who died 20th Nov'r 1826, aged 3 years and ten months. Alexander, who died 10th June 1830, aged 10 years. John, who died 15th Dec. 1831, aged 6 years and five months. Alexander, his son, who died 5th May 1847, aged 10 years. Also the above Alexander Broadfoot who died at Castle Douglas, on the 10th of April 1856 in his 76st year. Also Helen Broadfoot, who died at Castle Douglas, 31st March 1865, aged 25 years. Also Jane Smith, widow of the above Alex'r Broadfoot, who died at C. Douglas, 22nd February 1870, aged 70 years. 243 Sacred to the memory of Thomas, third son of Thomas McClymont, who died at Cuile, 2nd of Feb'y. 1846, aged 3 years. Also of the above Thomas McClymont, who died at Overlaw, 26st Nov. 1852, aged 52 years. Also George McTaggart, son of the above Thomas McClymont, who died in London, 11th March 1876, aged 27 years. Also Ann Cunningham, widow of the above Thomas McClymont, who died 10th Oct. 1887, aged 77 years. 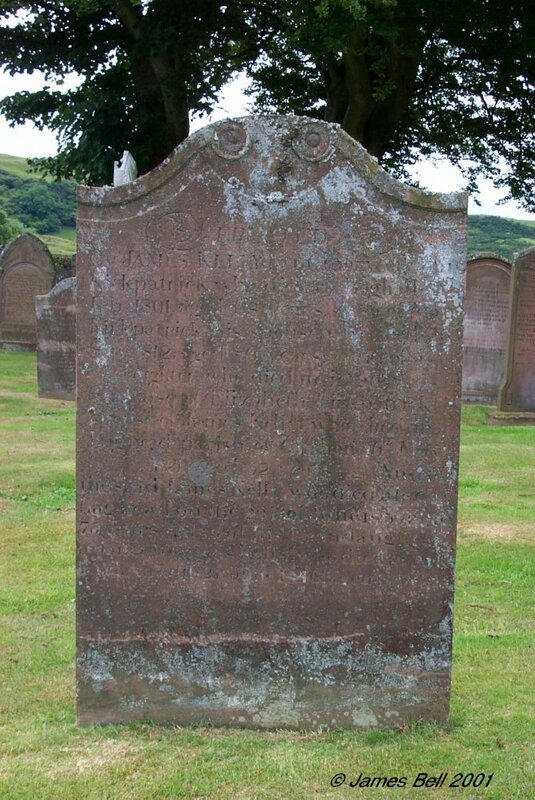 Also Agnes Jane, only daughter of the above, Thomas McClymont, who died in Edinburgh, 21st Dec'r. 1921. 244 The plaque from this has fallen and is broken. Memorie Sacrum Michaelis Josephi Strain M.D. Qui Natus, Edinburgh XIV Juni, MDCCCIX obut aedibus s petri VI Febr MDCCCXLI. R.I.P. 245 In memory of The Reverend Alexander Crosbie, born 10th December 1776, ordained minister of Buittle 12th May 1808, died 3d December 1847. And James Crosbie, his son who died in Jamaica, on 28th October 1843, aged 22 years. And of Agnes McClellan, spouse of the Rev'd. 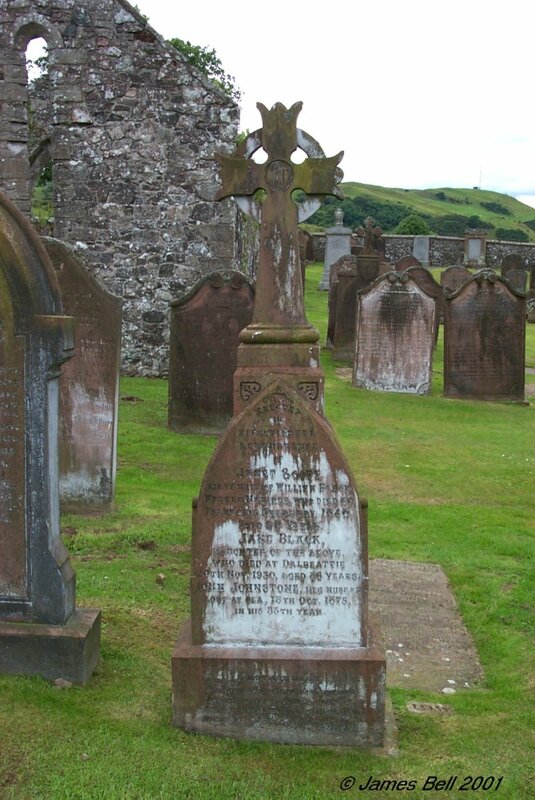 Alexander Crosbie, who died in Castle Douglas, on 8th January 1859, aged 69 years. 246 To the memory of Elizabeth Sarah, wife of the Rev. 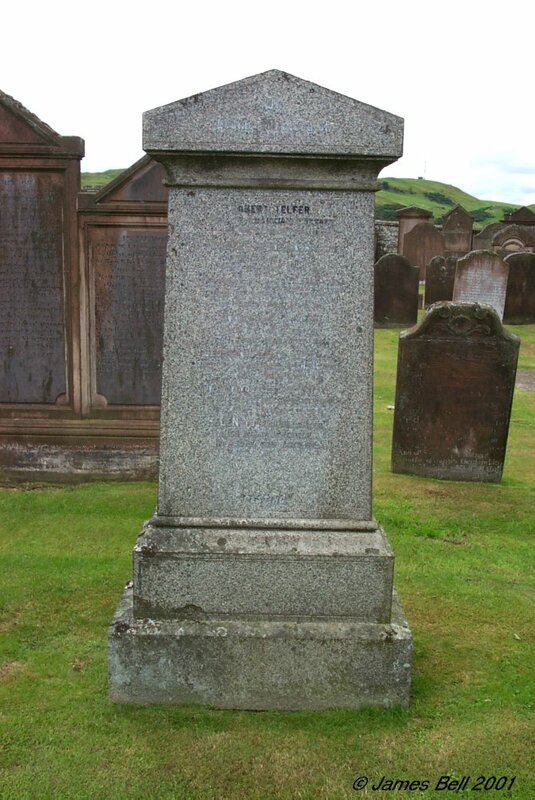 R. T. Tarbet, Buittle, who died 22nd July 1904, Also the Rev. R.T. Tarbet, who died at Leicester, Feb. 20th 1913. Minister of Buittle from 1889 - 1913. 247 W. D. Robinson-Douglas, born Sept. 3rd 1851, with Christ Oct. 3rd 1921. He could not be found because God had removed him. He was renowned as having pleased God. Heb. 11.5. And Constance, his wife, later widow of William H. Maxwell, born Nov. 15th 1858, died June 4th 1941. Jesus said come and share your master's joy. Matt. 25.21. 248 James Hubert Francis, son of William and Frances Robinson-Douglas, born 7th June 1881, died 1st October 1883. Frances Mary, widow of W. D. Robinson-Douglas of Orchardton, born 29th May 1855, died 13th June 1881. 249 In loving memory of Rev. James Robb Grant, Parish minister of Buittle for 44 years, who died 8th May 1889 in the 82nd year of his age. Madeline Campbell, his first wife who died 12th July 1862, and Marion Grant, his second wife, who died 9th August 1907. 250 Here lye ye remains of Maria Anne Weems, born at Kirkennan, 28 Aug. 1850, died in London 27 May 1854. 251 Sacred to the memory of Robert Weems Esq., of Kirkennan, who departed this life on the 18th day of February 1862, aged 49. Also Mary Wright Platt, widow of the said Robert Weems Esq., who departed this life on the 28th day of December 1864, aged 34 years. Also to the memory of William Wright Platt Esq., of Kirkennan, who departed this life, on the 14th day of February 1889, aged 37. 251a In memoriam. Rev. 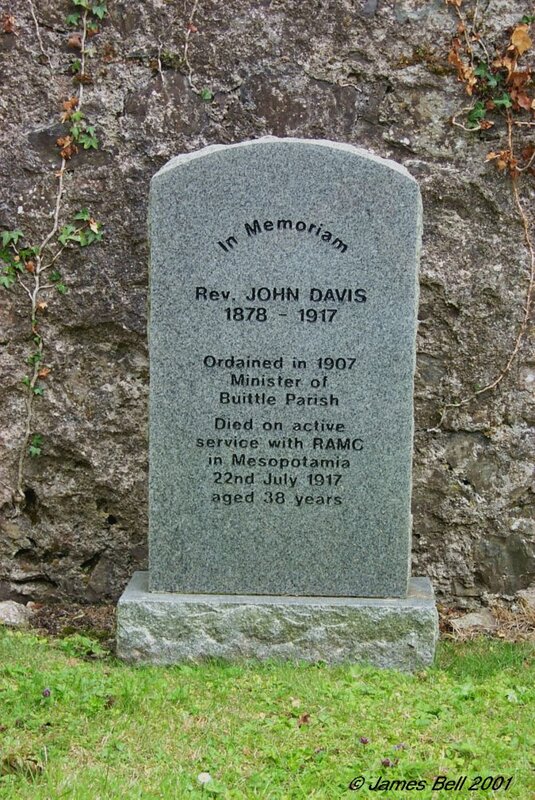 John Davis, 1878 - 1917. Ordained in 1907, Minister of Buittle Parish. Died on active service with R.A.M.C., in Mesopotamia, 22nd July 1917, aged 38 years. 252 Sacred to the memory of Lizzie J. Mitchell, daughter of William Mitchell, who died at East Logan, 26th July 1877, aged 1 year & 8 months. Also John Mitchell, his son who died at Rosebank, Dalbeattie, 21st Febr. 1882, aged 4 years. 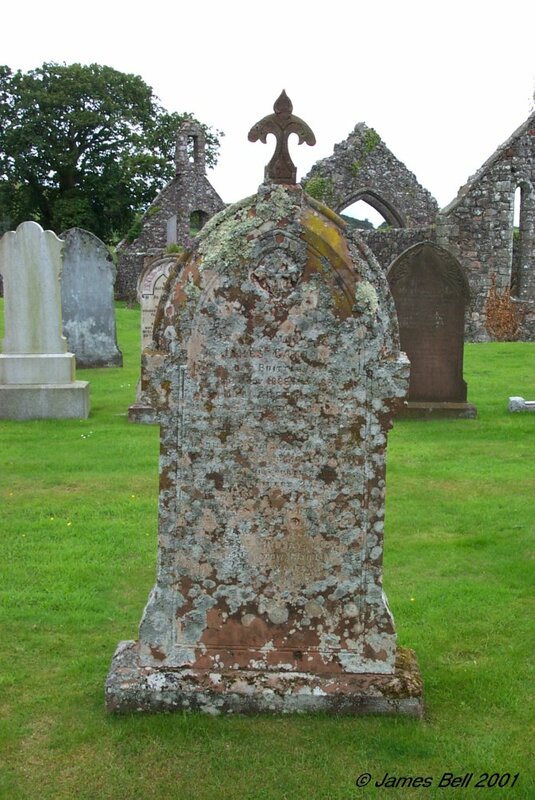 Also Nanny Gilroy Mitchell, his daughter, who died at Kirkcudbright, 25th December 1895, aged 15 years. 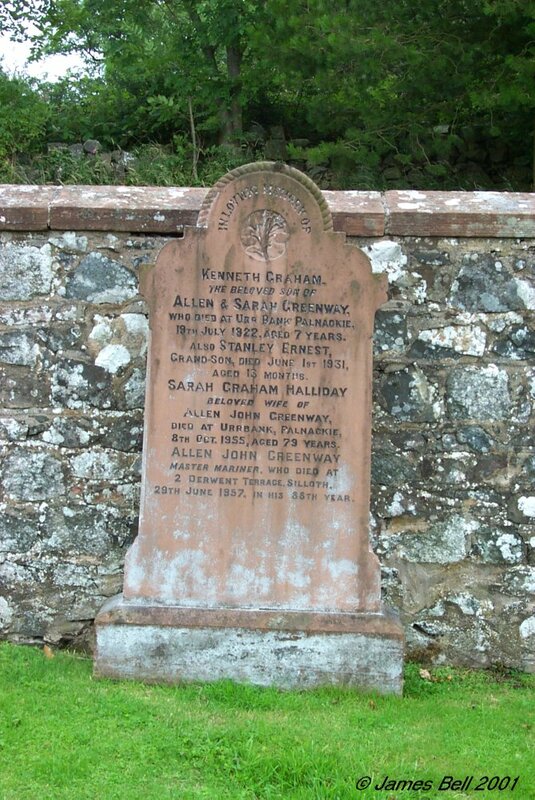 Also Elizabeth Craik, his wife, who died at Kirkcudbright, 26th Nov. 1900, aged 51 years. 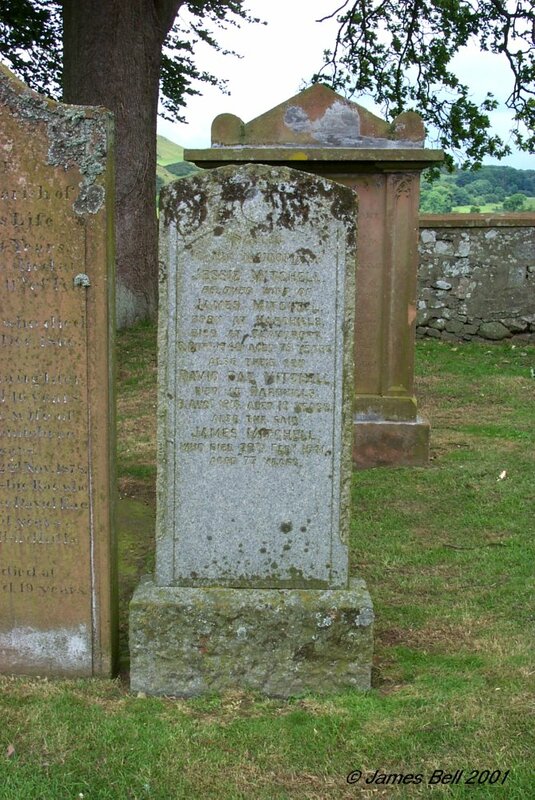 Also the above William Mitchell, who died at Kirkcudbright, May 6th 1907, aged 67 years. Also James Craik Mitchell, his son who died at Kirkcudbright, 23rd April 1911, aged 28 years. 253 In memory of Janet, eldest daughter of Robert Reid of Kirkennan and widow of James Corson, late provost of Dumfries, who died at Chorlton Lodge, Cheshire, on ninth May 1862, aged 69 years. 254 Here lyes the body of William Reid, who departed this life the 24 day of October 1724, aged 77. He lived N. Glen of Almerness. 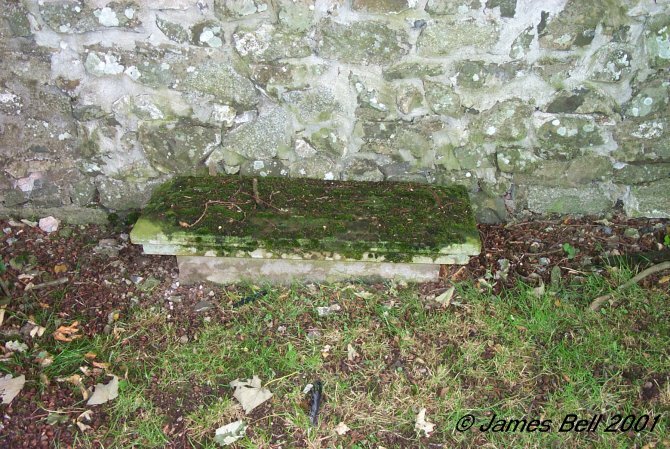 255 Underneath lie the remains of John Reid of Kirkennan, born in 1691 and departed this life 25th Dec'r 1762. 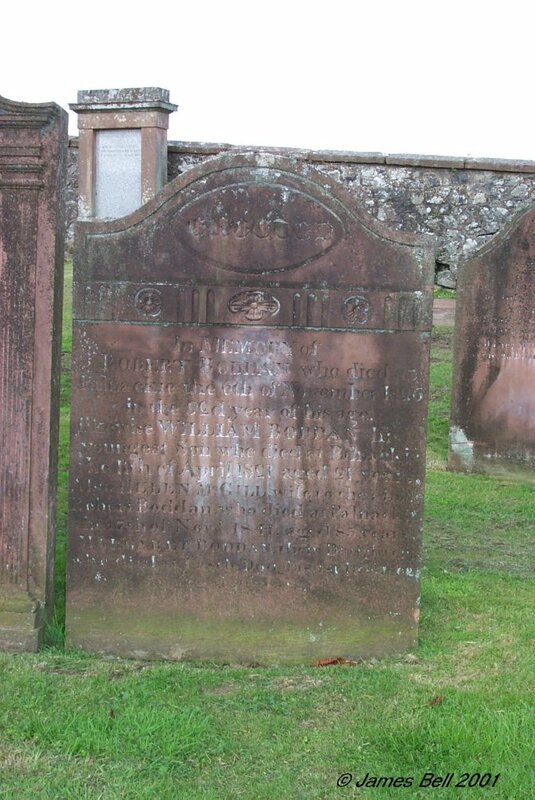 Also Janet McKill, his spouse, born 1713 and died 14th Dec'r 1793 years. 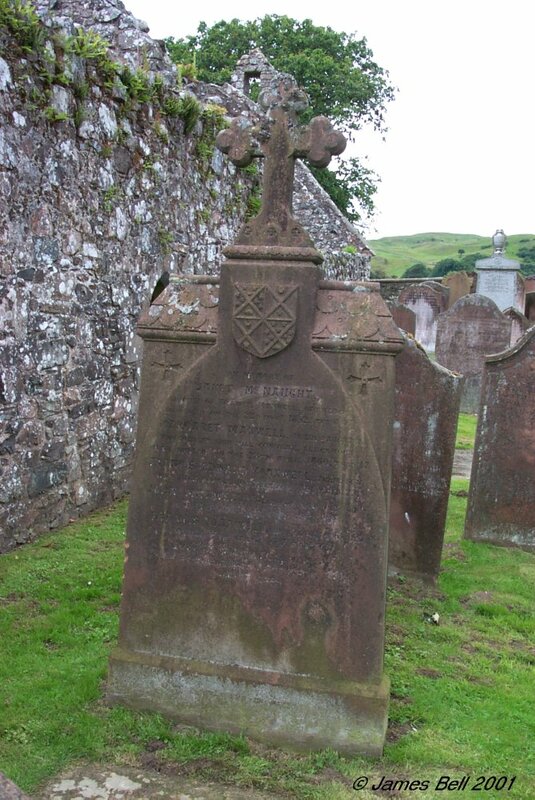 And of William Reid of Kirkennan, their son, who died 21st February 1804, aged --. 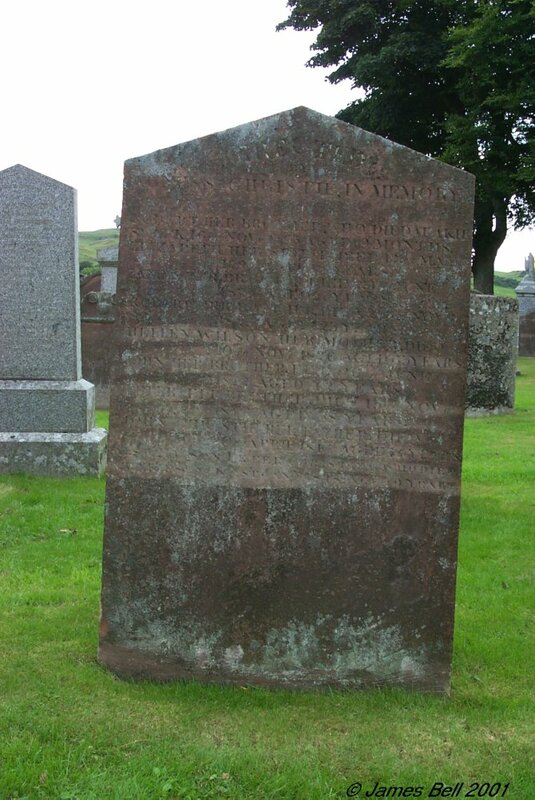 Likewise Alexander Reid of Kirkennan, who died 26th Dec. 1823, aged 76. And Margeret Reid, his sister, who died 5th March 1824, aged 83 years. 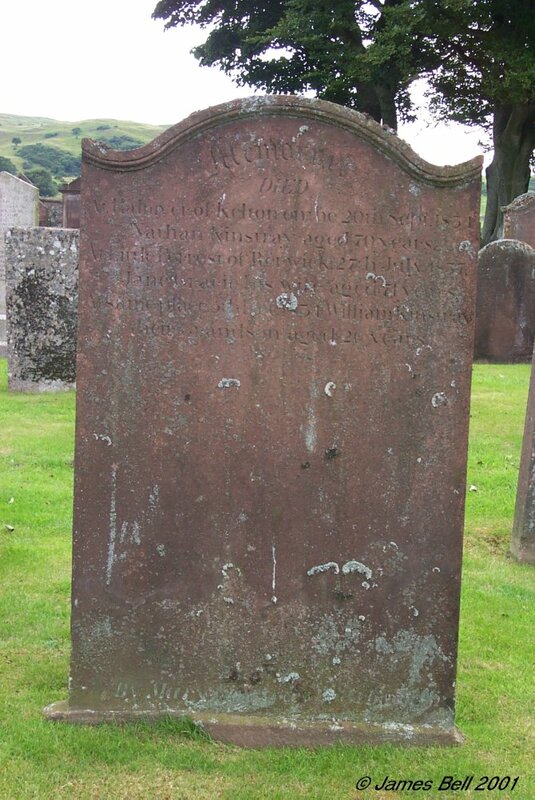 Also Jane Reid, daughter of Robert Reid, Kirkennan, who died 8th Jan. 1823 (or 1825) aged 20 years. And William Reid, his son, who died 5th Oct. 1828, in the 28th year of his age. Also the said Robert Reid of Kirkennan, who died 3rd Oct. 1831, aged 79. Euphemia Lindsay, his relict, who died at Maxwelltown on the (blank)th July 1842, aged (blank) years. Also Margaret Reid, their daughter, born April 1797, died Feb. 1876. 256 Here lyes John Herries, Scrogyhill, who departed this life Feb'y 26th 1725 aged 48 years. Erected by William Herries his son. Here also lyes Jannet Herries, spouse of the abovementioned John Herries, who departed this life April the 18th 1756, aged 67 years. 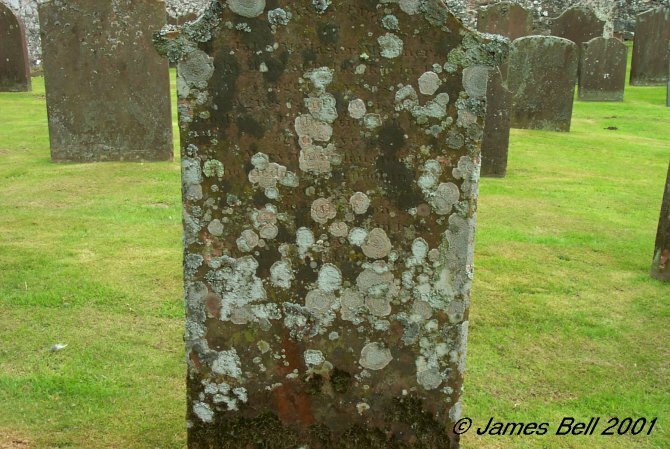 257 Here lyes the remains of Mary McLune, spouse to William Halliday in Barlochan Miln, who died Nov'r. 20th 1775, aged 43 years. Also Martha Halliday, their daughter, who died Feb'y 13th 1769, aged 7 months. Also his father John Halliday, who died the 4th Jan'y. 1773, aged 73 years. And his mother, Mary Halliday, who died Feb'y 1789, aged 84 years. Also the said William Halliday, who departed this life, Nov.. 2nd ----, aged 81 years. 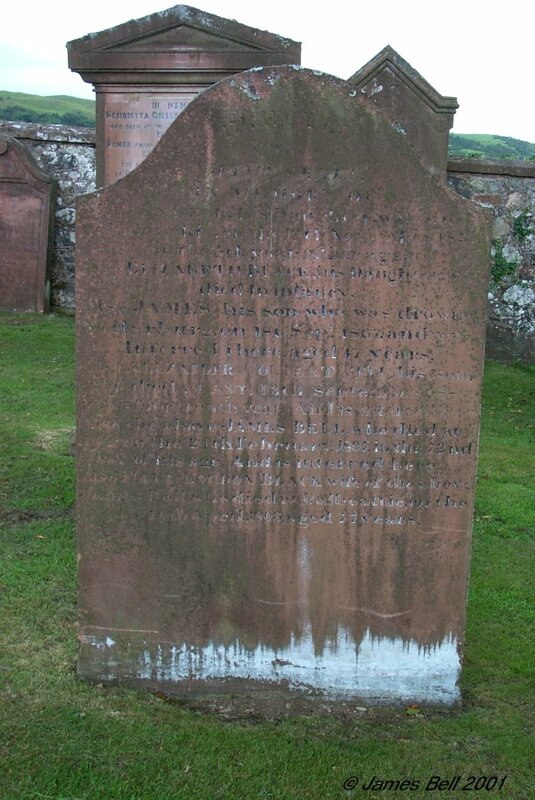 258 Erected by John McKeachie, mason, Kirkcudbright, in memory of Janet Murdoch, his aunt, who died in Corsencairn, 1777 aged 72 years. 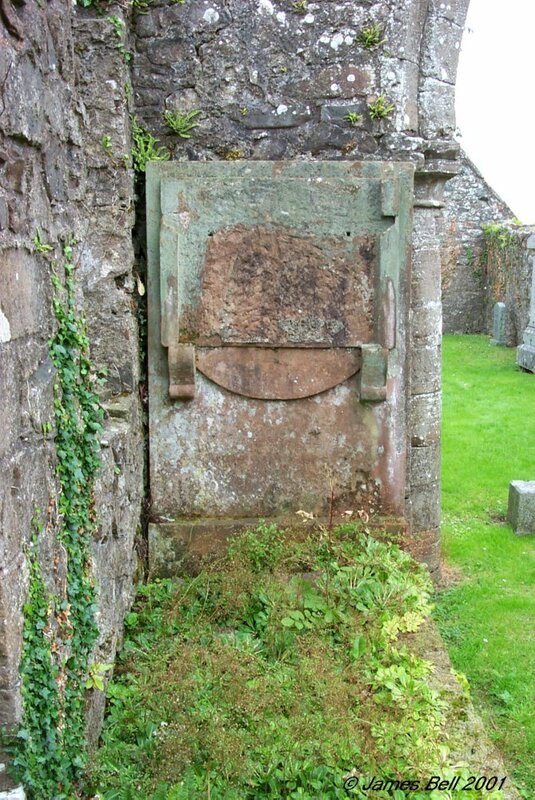 259 Here lyes George Cammill in Dungarg who died Nov. 23rd 1706, aged 53. 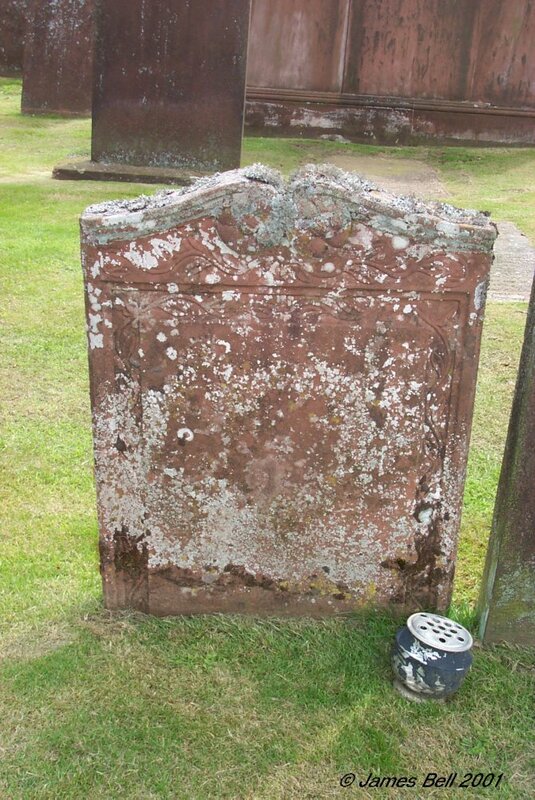 Also here lyes the corpse of James Campbell, late in Dalbeaty, who died April 30th 1773, aged 88 years. 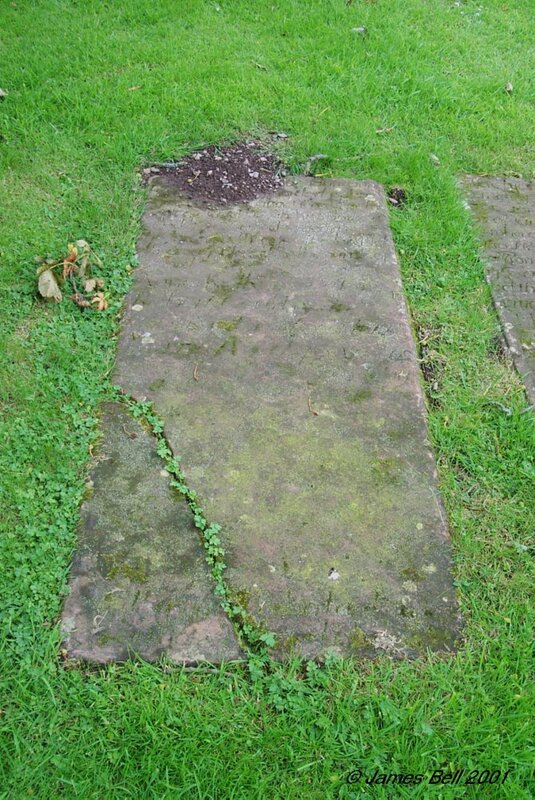 Also here lyes the corpse of Elizabeth Nillson, his spouse, who died Nov'r 28th 1768, aged 87. 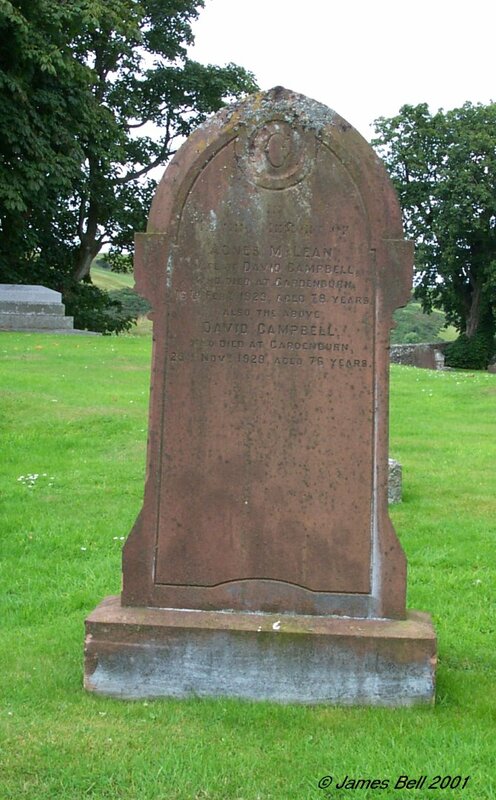 And also of Samuel Campbell, their son, who died Dec. 11th 1772, aged 47 years. 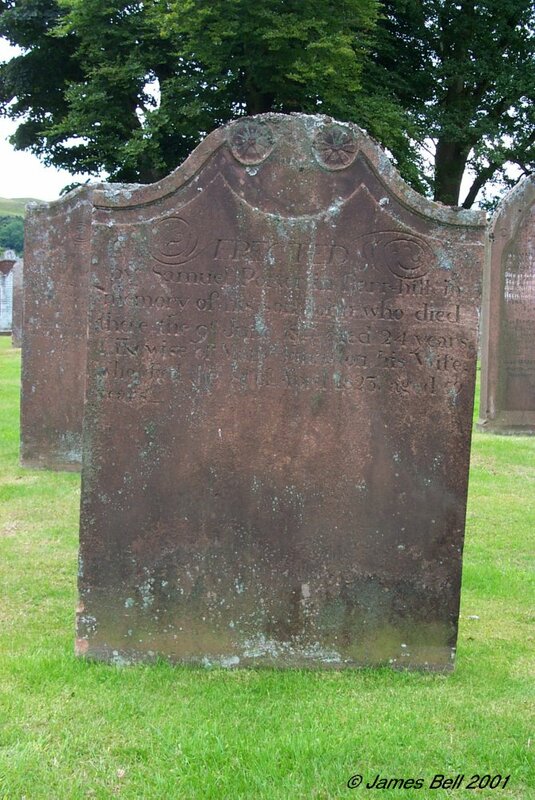 Here lys also John Campbell, son of the above James Campbell and Elizabeth Neilson who died in Little Cloak July 11th 1790, aged 70 years. Erected by James Cammill in Mukle Dalbaty, 1752. 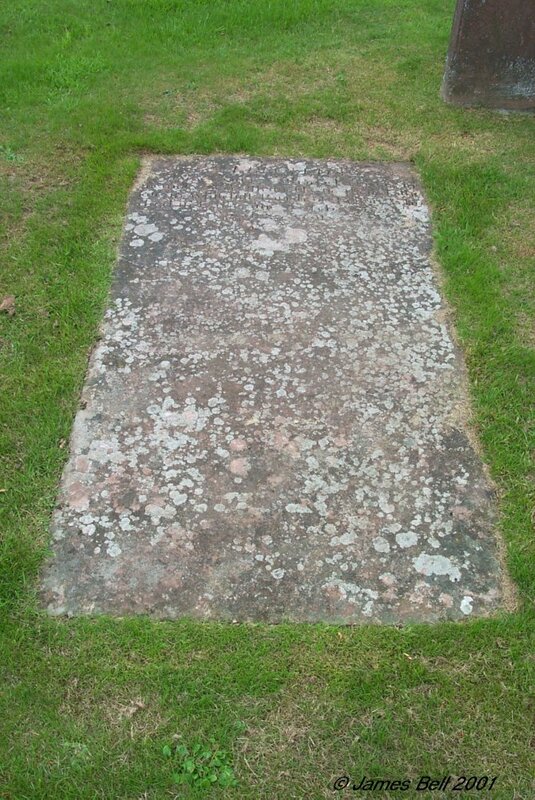 260 Here lyes the corpse of John Young in Breoch, who died Sep. 17--, aged 56 years. 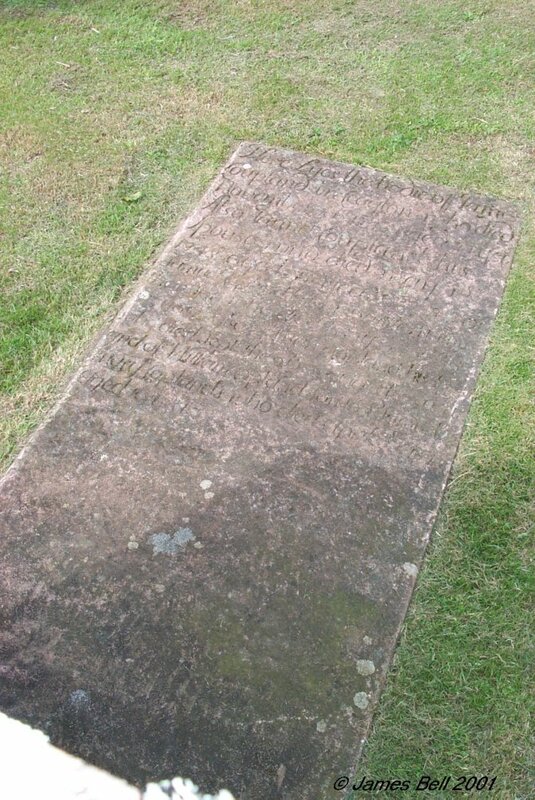 Also here lyes the corpse of Janet -----, his spouse, who died (blank) aged 4- years. The Lord giveth, and the Lord taketh away. Blessed be the name of the Lord. There is a further inscription which is illegible. 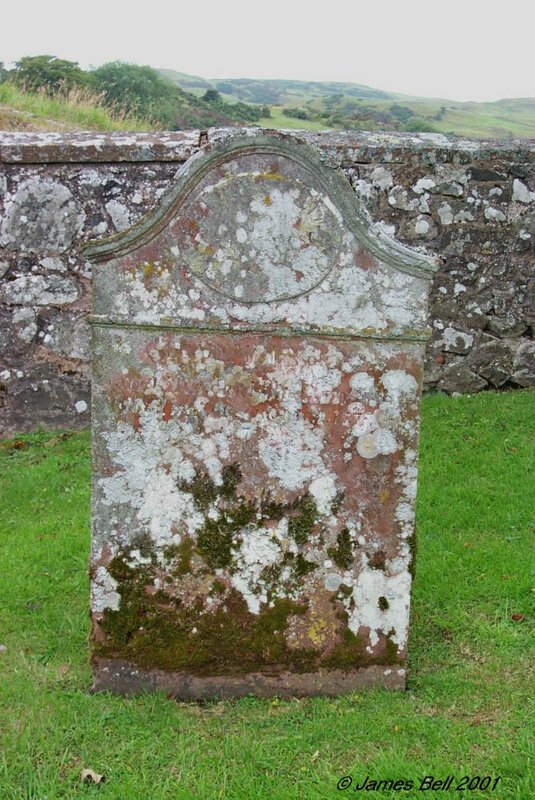 261 Here lies Mary Coupland, spouse to John McNish in Flats of Dalbeaty, who died 18th May 1791, aged 87 years. 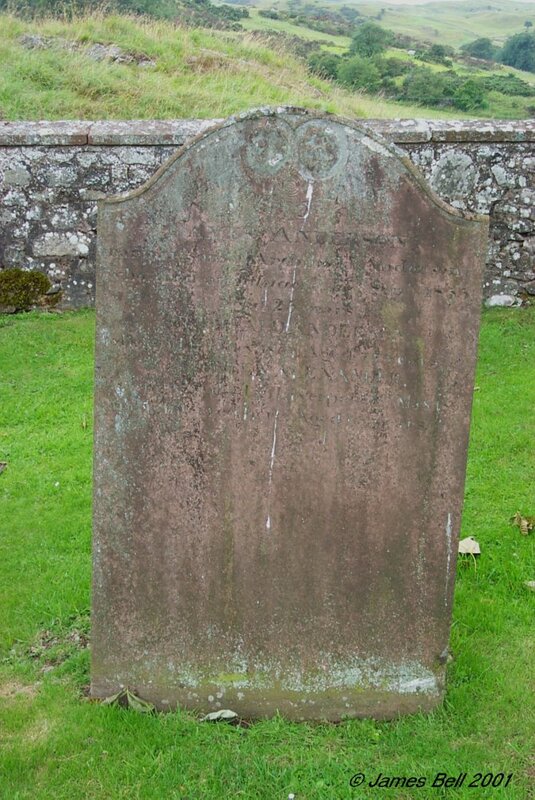 Also the said John McNish, Mason, who died 3d Dec. 1797, aged 95 years. 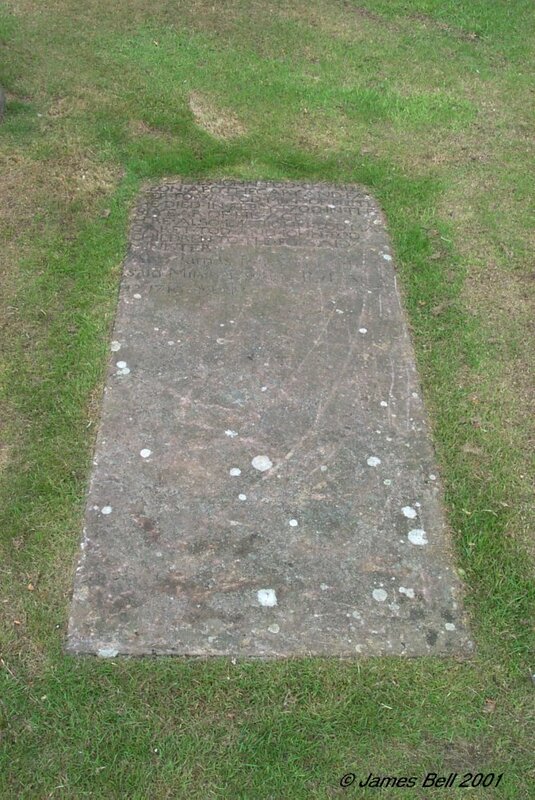 Reverse: Here lyes the corpse of Jean McNish who died Apr. 6th 1762 aged 21. 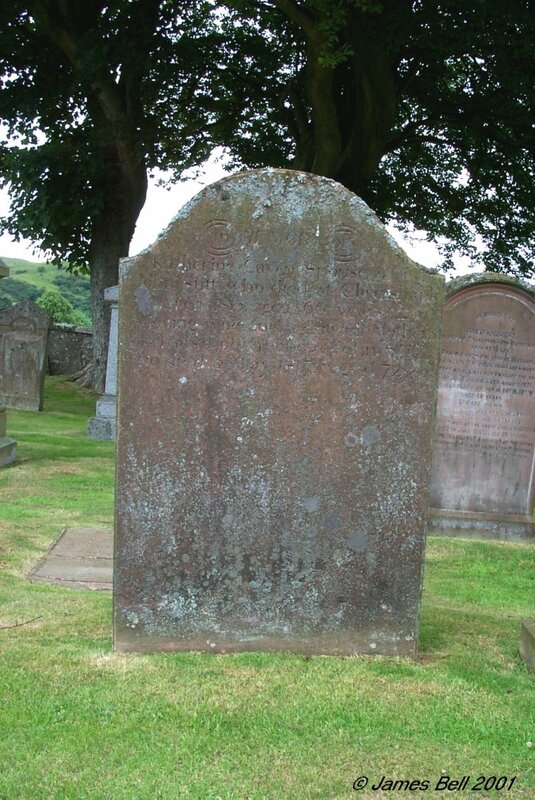 Also George McNish, her brother, who died in Flats of Dalbeaty, 2nd Feb'y 1791, aged 41 years. 263 In memory of James Anderson, farmer, son of Archibald Anderson, who died at Palnackie, 7th Sept. 1855, aged 25 years. 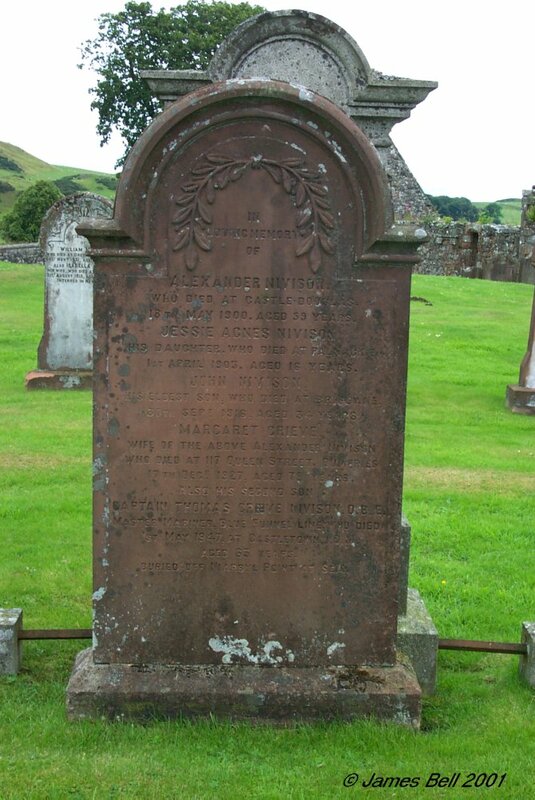 Archibald Anderson, who died 11th May 1864, aged 77 years. Hellen Alexander, his wife who died in Liverpool, 16th May 1865, and is interred here, aged 65 years. 264 Erected by Col and Mrs. Maxwell, to the memory of Jannet Graham, who died 13th October 1852, aged 99 years. 265 In loving memory of Alexander Gordon, who died at the Cottage Hospital, Castle Douglas, 17th Oct'r 1929, aged 70 years. Also Margaret Irving, his wife, who died at Caigton, 15th Jan'y 1923, aged 62 years. 266 Erected by John and David Hannah, Blackburn. 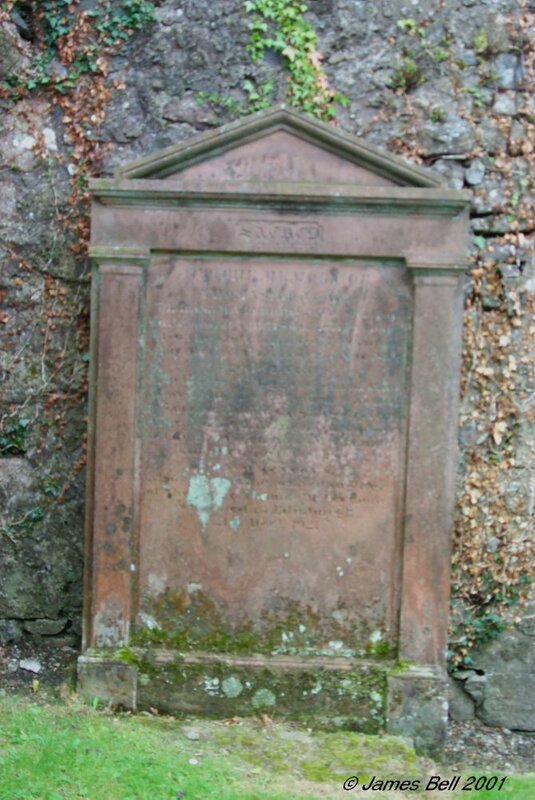 Sacred in the memory of the late William Hannah, Plasterer, Dalbeattie, who died July 21st 1827, aged 56 years. Also Margaret Dickson, his spouse, who died April 6th 1845, aged 70 years. Also William, Alexander, Thomas, Robert and James, their sons who all died in infancy. Also Elizabeth, their daughter, who died 20th August 1828, aged 20 years. 267 Erected by Nathan Haugh, in memory of his beloved friends, his father James Haugh, died at Heuchyard, Kelton, 19th Feb'y. 1855, aged 89 years. Also his brother George, died in Crimean War, 20th March 1855, aged 22 years. Also his brother Robert, perished at sea, Sept. 1864, aged 24 years. Also his mother, Elizabeth Thomson, wife of the above James Haugh, died at Palnackie, 7th Aug't. 1874, aged 73 years. Also the said Nathan Haugh, died at Gelston, 6th May 1886, aged 45 years. Also Mary Clark Haugh, daughter of James Haugh, died at Palnackie, 11th May 1911, aged 78 years. 268 Sacred to the memory of Elizabeth Janet Moffat, who died at Gardenburn, 8th Oct. 1874, aged 2 years & 3 months. Also John Palmer Moffat who died at Palnackie, 24th May 1875, aged 4 months. & 23 days. Beloved children of John and Margaret Moffat. 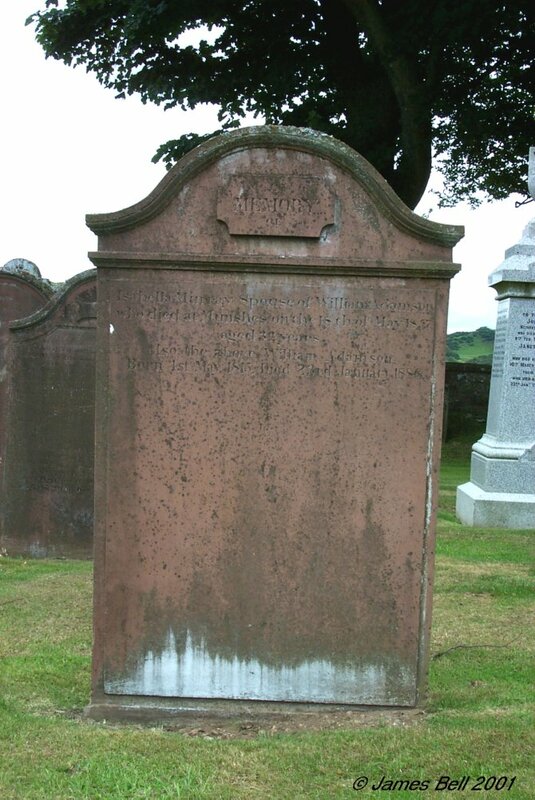 Also Margaret Irving, wife of John Moffat, who died at Yettan Terrace, Palnackie, 16th July 1889, aged 40 years. 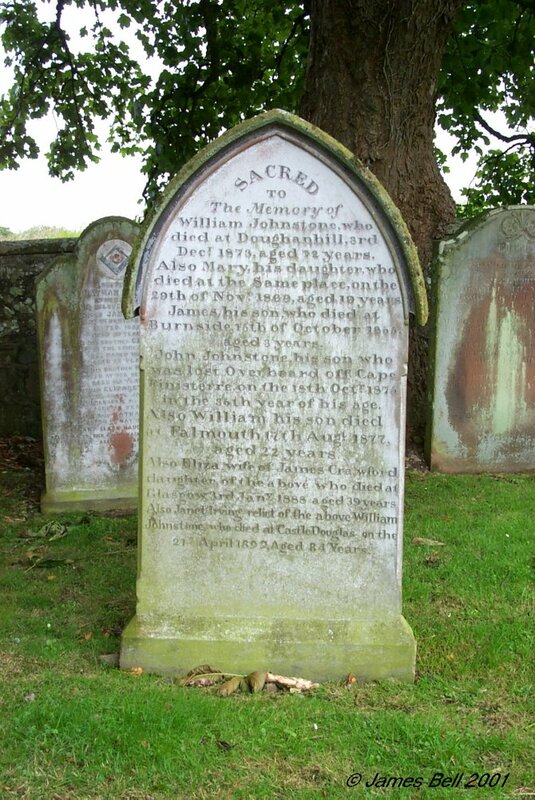 269 Sacred to the memory of William Johnstone, who died at Douganhill, 3rd Dec'r 1873, aged 72 years. Also Mary, his daughter who died at the same place, on the 29th of Nov'r 1869, aged 19 years. James, his son who died at Burnside 15th of October 1855, aged 3 years. John Johnstone, his son, who was lost overboard, off Cape Finisterre, on the 18th of Oct'r. 1875, in the 35th year of his age. 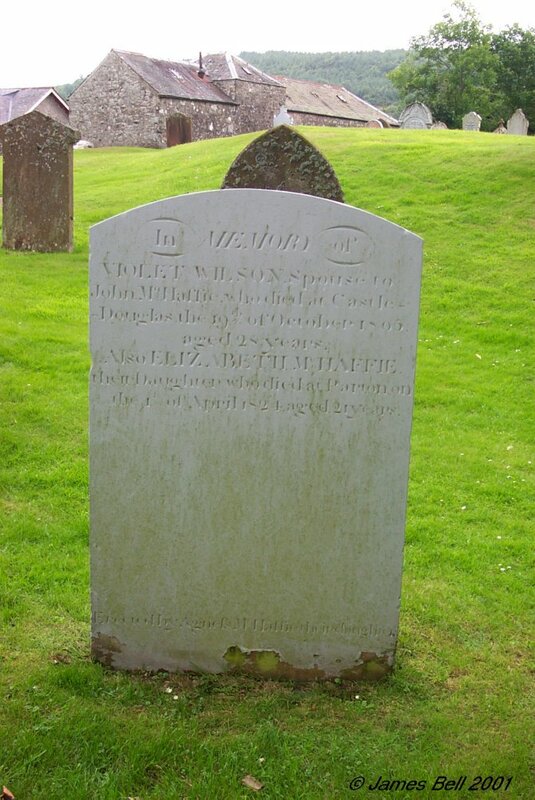 Also William, his son, died at Falmouth, 17th Aug' t 1877, aged 22 years. Also Eliza wife of James Crawford, daughter of the above, who died at Glasgow, 3rd Jan'y 1888, aged 39 years. Also Janet Irving, relict of the above William Johnstone, who died at Castle Douglas, on the 21st April 1899, aged 84 years. 270 In memory of Joseph Heughan, who died at Bush, 3rd Oct. 1835, aged 59 years. Also Jannet Telford, his spouse, who died 2nd Feb. 1863, aged 86 years. 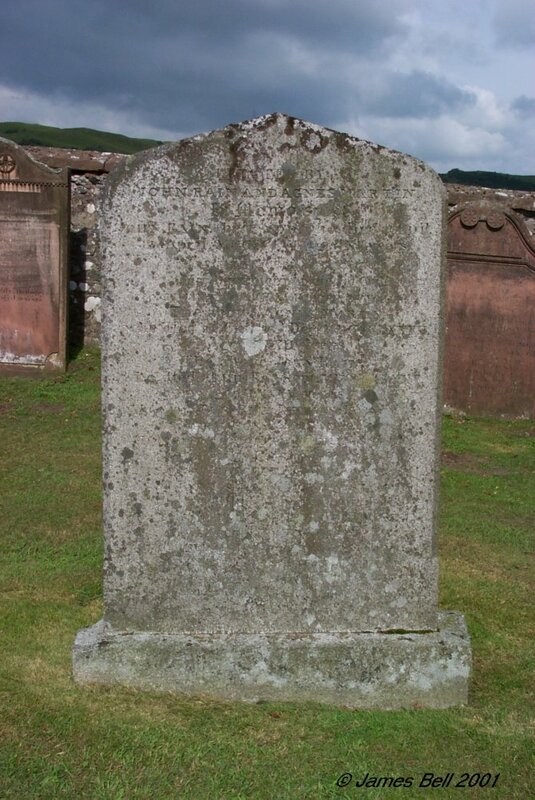 James Heughan, who died the 5th of March 1829, aged 25 years. 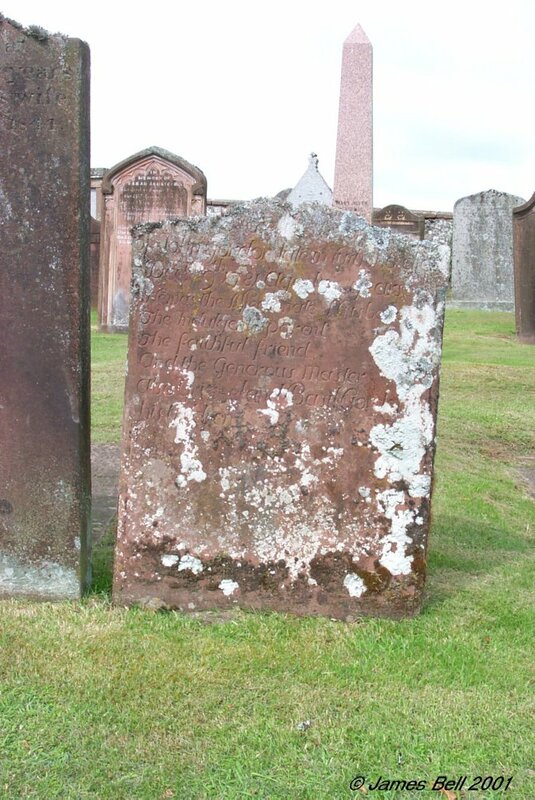 Also Elizabeth Muir, daughter of William Heughan, who died the 5th May 1844, aged 8 months. Also Joseph, his son, who died on 2d Oct. 1846, aged 9 months. 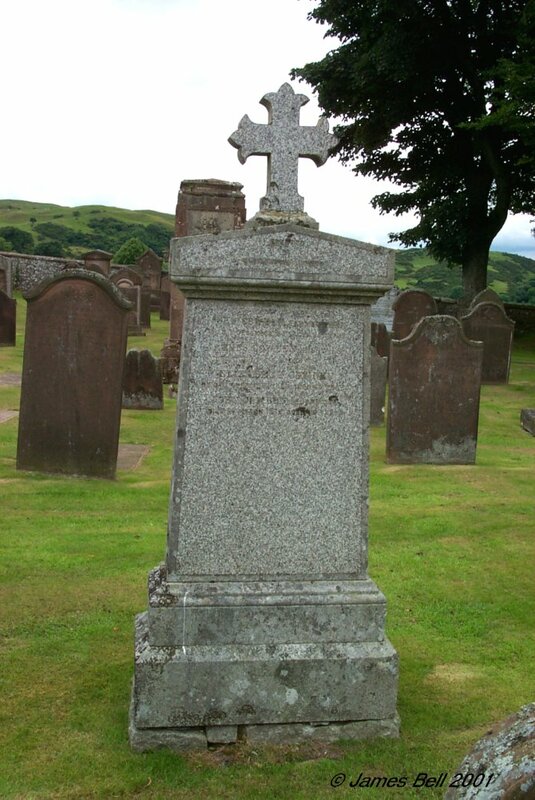 Also Joseph Heughan, his son, who died 22nd Oct. 1862, aged 5 years. 271 Erected by Andrew Campbell, in memory of David Campbell, his father, who died at Back-Borland, Kelton, on the 7th of October 1845, aged 60 years. Also of the above Andrew Campbell, who died on his passage from Chagres to New Orleans, on the 15th of June 1850, aged 36 years. Also Mary Porter, spouse of David Campbell who died 3rd August 1868, aged 83 years. Elizabeth, his sister, who died the 22nd of July 1831, aged 16 years. John, his brither, who died at New Orleans, 1st Sep. 1858, aged 28 years. Jane, his sister, who died in infancy. Also Peter Campbell, who died at Clone Shank, Buittle, on the 25th Feb. 1889, aged 69 years. Reverse: In memory of Mary, daughter of David Campbell, who died at Station Cottage, Wemyss Bay, 24th July 1910, aged 86 years. 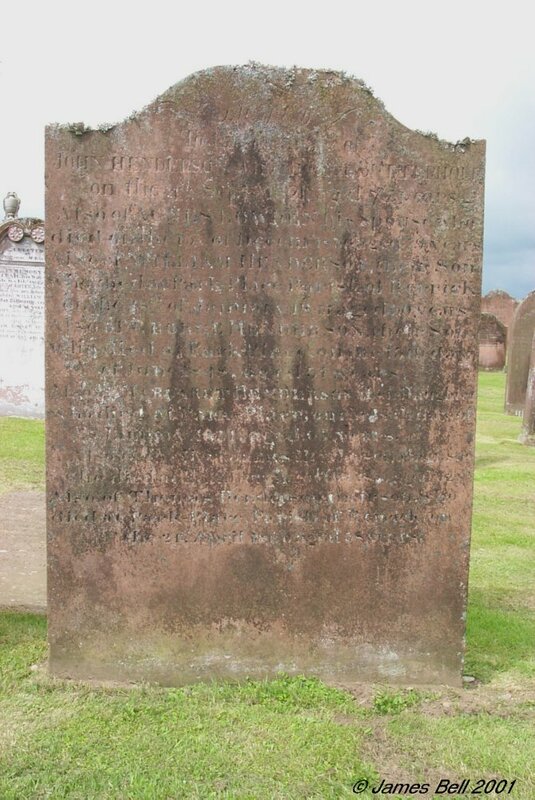 272 In memory of Janet Neilson, lawfull daughter to Robert Neilson and Mary Rigg in Mains of Southwick, who died the 27th Oct. 1784, aged 25 years. 273 In memory of William Neilson & Isabel Brown, his spouse. 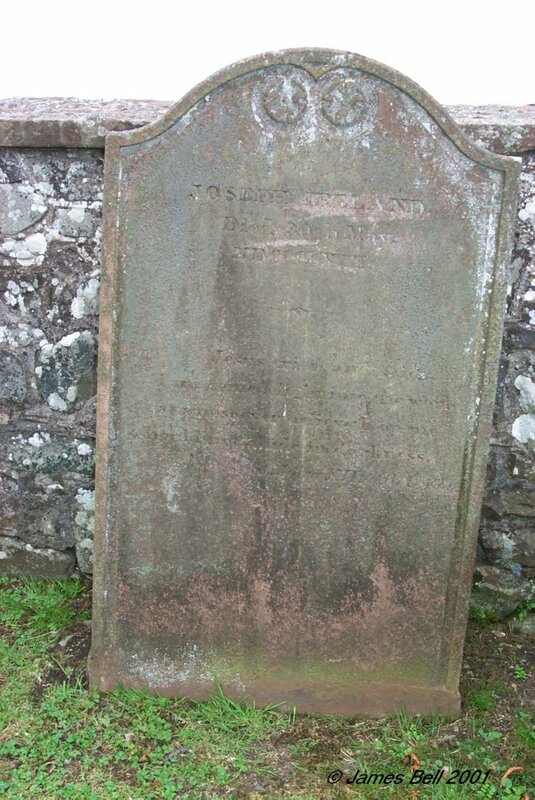 The former died at Ernespie the 19th January 1780 aged 54 years. The latter at Gatehouse of Fleet 7th October 1822, aged 80 years. They were eminently distinguished for piety and virtue, much and highly esteemed by their friends and neighbours. Sis memor ipse mori. Reverse: Here lyes the body of Mary Laury, spouse to James Neillson in Woodhead of Almerness, who died -- March 1742, aged 52. Also the said James Neillson, June 48, aged 66 years. 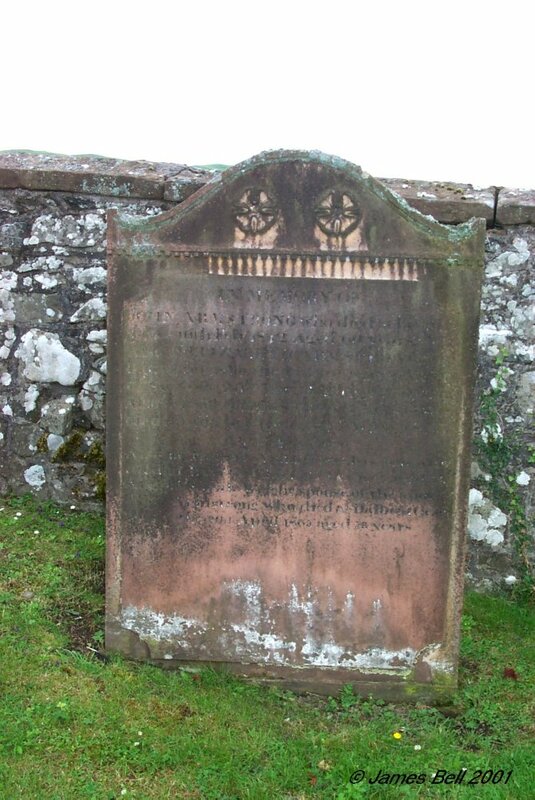 Also here lyes the corpse of William Neilson, who died in Ernespie January -- 1780, aged 54 years. This done by Isabel Broun, his spouse. 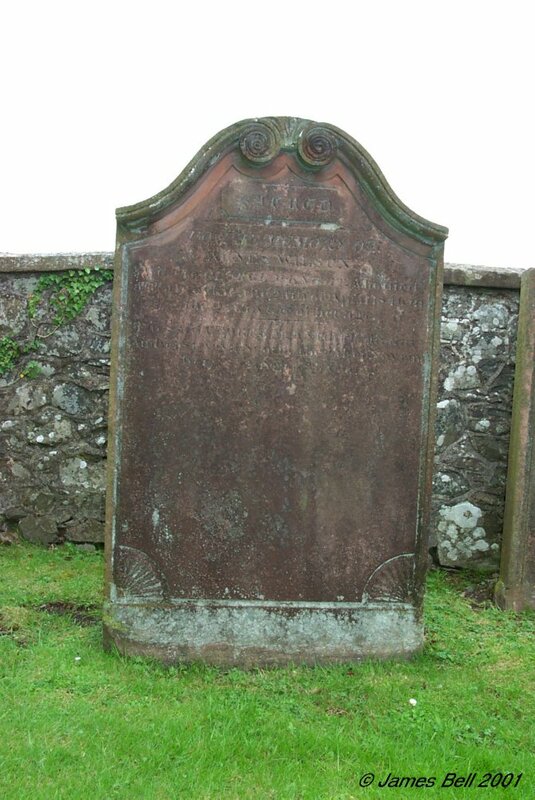 275 Sacred to the memory of Gavin Wilson, who died at Dalbeattie, 30th March 1838, aged 70 years. Also of Sarah McMurrie, spouse of John Wilson, son of the above, who died at Dalbeattie, on 7th Sept. 1843, aged (blank) years. 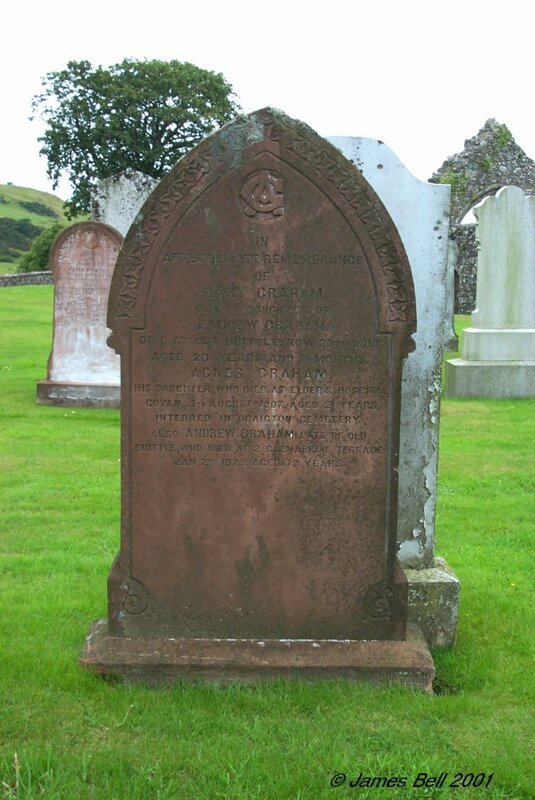 And of John, brother of the said Gavin Wilson, who also died at Dalbeattie, on 26th Sep'r 1857, aged 88 years. 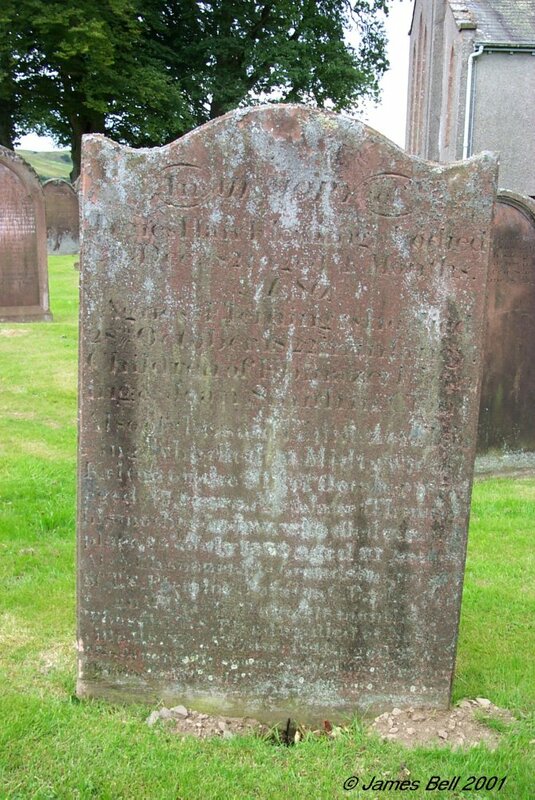 276 In memory of George Agnew Neilson, who died on the 6th of April 1820, aged one month. Also of his father Nathaniel Neilson Esquire, of Springfield, who died 1st of October 1834, aged 74. Twenty-five years of his life he spent in the Island of Jamaica. Also David his son, who died at Springfield, on 1st April 1837, aged 14 years. Also of Nathaniel Agnew, his son, who died on the 21st day of July 1847, aged 29 years. Also Barbara Rome, his daughter who died on the 25th day of Septem'r. 1855, in the 27th year of her age. Also Georgina, his daughter, who died at Springfield, on the 24th of Dec'r. 1858, in her 31st year. Also of his eldest son William C. Neilson, M.D., 20th Regit, N.J., who died at Mjhow, East Indies, 1st May 1862, aged 49 years, Also in memory of Mrs Barbara Agnew, spouse of the above Nathaniel Neilson, who died at Springfield, on the 28th of Feb. 1865, aged 72 years. Also of his youngest son Andrew Rome Agnew Neilson, of Uardry, New South Wales, Australia, who died at Rosebank, Castle Douglas, on the 28th September 1895, aged 65 years. Also Euphemia Douglas Neilson, widow of Richard Hewat, who died at Castle Douglas, on October 16th 1899. 278 In memory of Jean Murphy, spouse of Robert Ewart, who died at Potterland, 19th November 1812, aged 30 years. Also the said Robert Ewart, who died at Potterland, 16th March 1815, aged 33 years. Also Marion and Jane Ewart, their daughters, who died in infancy. Also Janet Ewart, their daughter, who died 1st May 1815, aged 12 years. Also John Ewart, their son, who died 8th February 1823, aged 16 years. Also Mary daughter of Will'm Ewart, who died at Potterland, 15th of March 1825, aged 25 years. Also Janet Ewart, his daughter, who died at Castle Douglas, 4th Jan'y. 1867, aged 42 years. 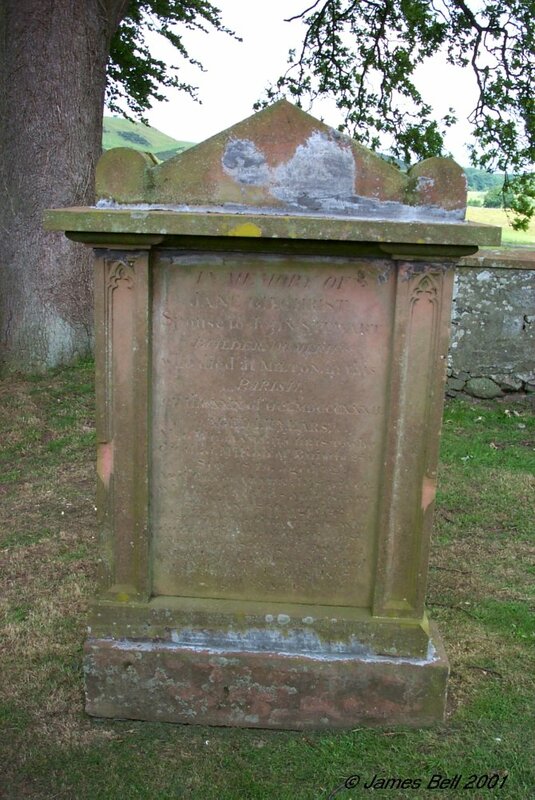 Reverse: Erected by William Ewart, to the memory of John Ewart, his son, who died at Newmill, Orchardtown, the 15th October 1778, aged 14 years. 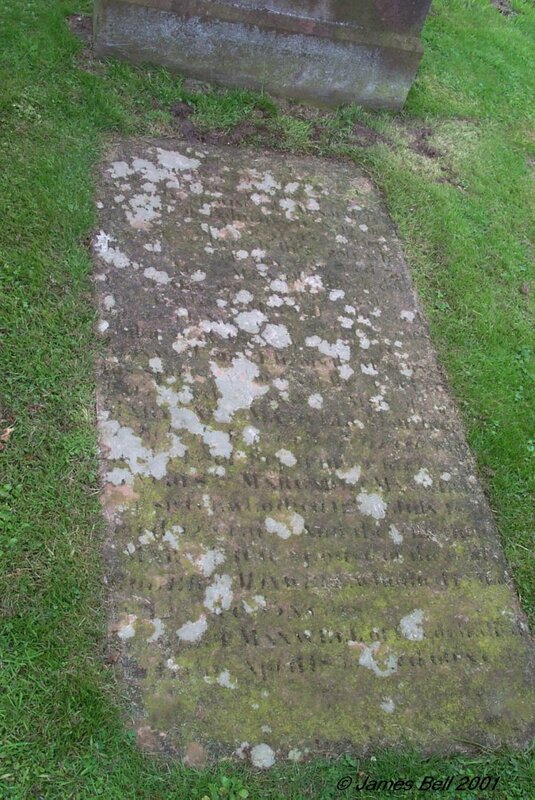 Also Jannet Walker, his spouse, who died at Potterland, the 8th August 1801, aged 61 years. Also here lyes the said William Ewart, who died in Potterland, the 5th of March 1809, aged 70 years. Also Jannet Ewart, his grand-daughter, who died at Gatehouse-of-Fleet, 1st June 1810, aged 17 years. Also Marion McKnight, spouse of William Ewart junior, who died at Glenyarrock, 10th April 1821, aged 56 years. Also the said William Ewart, who died at Halketleaths Miln, 5th March 1847, aged 77 years. Margaret, his daughter, who died the 4th of January 1836, aged 14 years. 279 In memory of Thomas McNaught, who died at Palnackie, 21st July 1815, aged 44 years. Also Mary Creath, his spouse, who died 24th Dec'r 1812, aged 40. Margaret, their daughter, died in infancy. 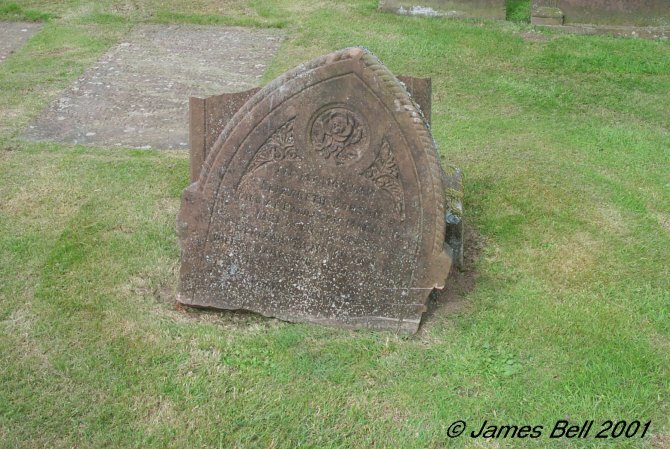 And of Jane Rae, his second spouse, who died at Broomisle of Munches, 20th February 1866, aged 85. 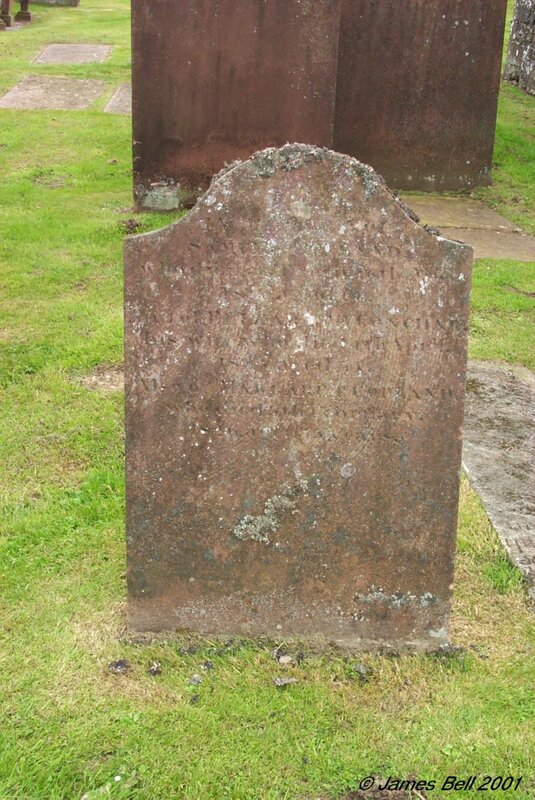 Also Janet McKnight, spouse to John Johnston, who died at Richardcarne, Rerwick, 23rd of April 1868, aged 70 years. Also Barbara McKnight, died at Barnbarroch, the 3rd May 1874, aged 75 years. Also Thomasina McKnight, died at Cooperknow, 2nd April 1896, aged 78 years. 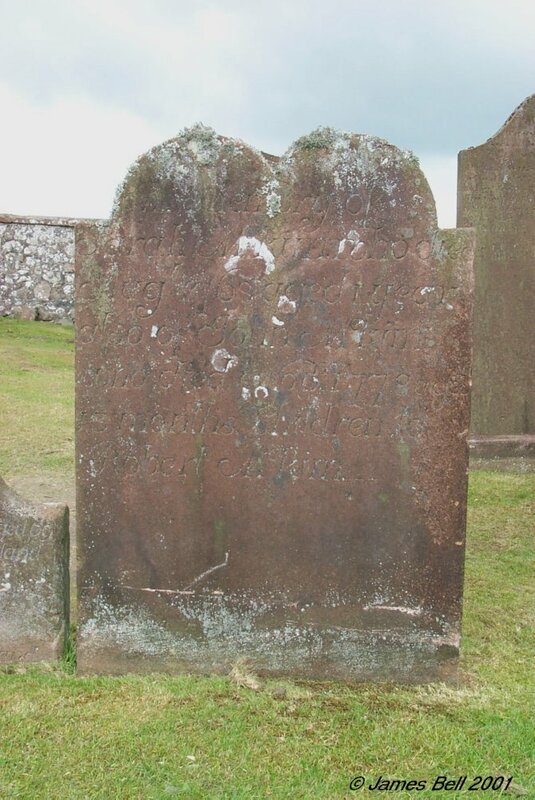 280 In memory of Thomas McWilliam, who died at Collin, in the Parish of Rerwick, on the 25th of July 1817, aged 56 years. Also of Janet McGowan, his spouse, on the 24th of Nov'r 1848, aged 80 years. James McWilliam, died 23rd Jan'y 1845, aged 17 years, on his passage to Bombay. 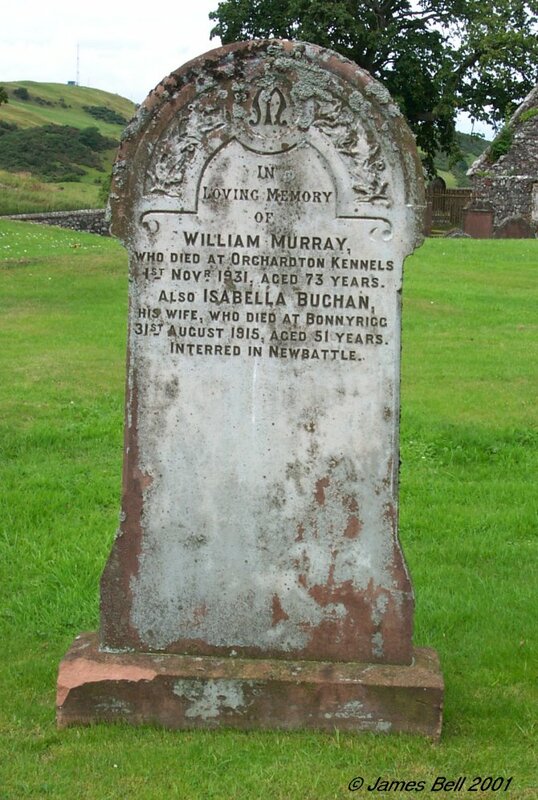 Also John McWilliam, their son, mariner, who died at Palnackie, 29th of March 1859, aged 61 years. Erected by John McWilliam, his son. 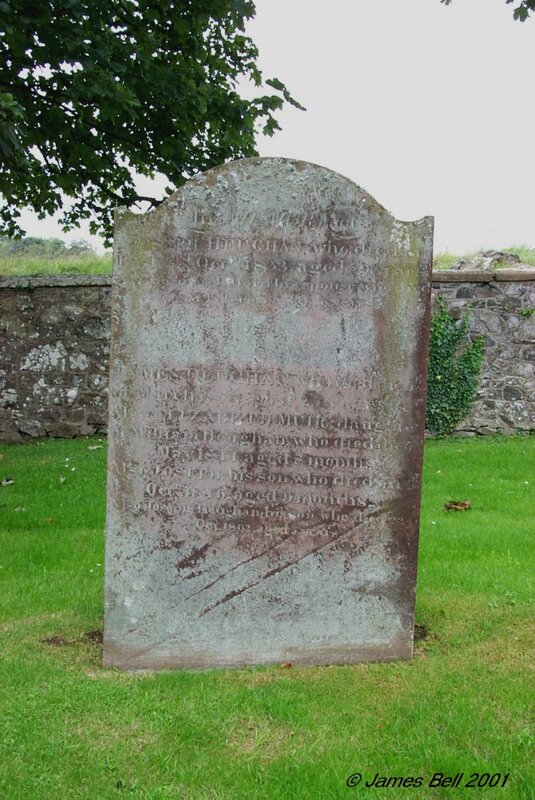 281 Here lies the corps of Archibald Cairns, in Holm of Almerness, who died August 23 1754, aged 69 & John Cairns, his son. Erected by Robert Cairns, his son. 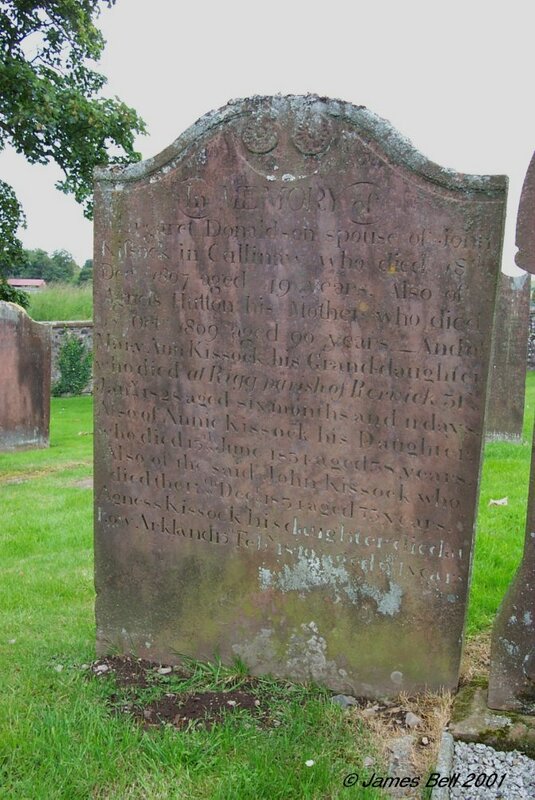 Also Jannet McClune, spouse to Archibald Cairns, who died July 26th 1769, aged 72 years. Also Jain Cairns, their daughter, who died July ---. 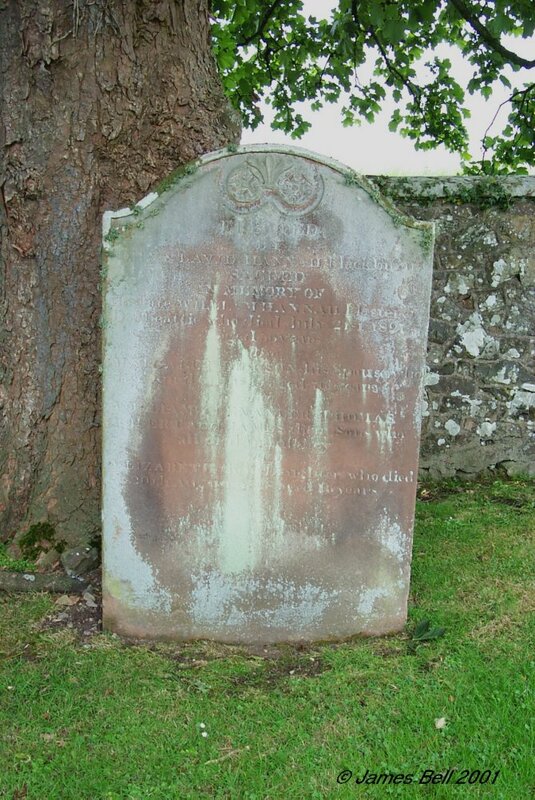 And Robert Cairns, their son, who died July 8th 1796, aged (42) years. 282 Turf covered, blank underneath. 283 In memory of William McWilliam, who died at Scroggiehill, in this Parish, on the 29th March 1860, aged 75 years. Also Margaret Conchar, his spouse, who died 19th December 1864, aged 80 years. Erected by R & A. McWilliam, his sons. 284 Sacred to the memory of Jane Brydson, daughter of Alexander Brydson, who died at Hardhills, the 23rd of March 1862, aged 5 years & 2 months. Also the above Alexander Brydson, who died at Hardhills, 12th May 1888, aged 62 years. Also Elizabeth Knowels, his wife who died at Dalbeattie, 16th May 1896, aged 69 years, John Brydson, grandson of Alexander Brydson: who was drowned in the wreck of the 'Iroquois', 10th April 1911, aged 32 years. Interred at Ross Bay Cemetery, Victoria, B.C. Also Alexander Brydson, grandson of the above who died 18th August 1922, aged 44 years. 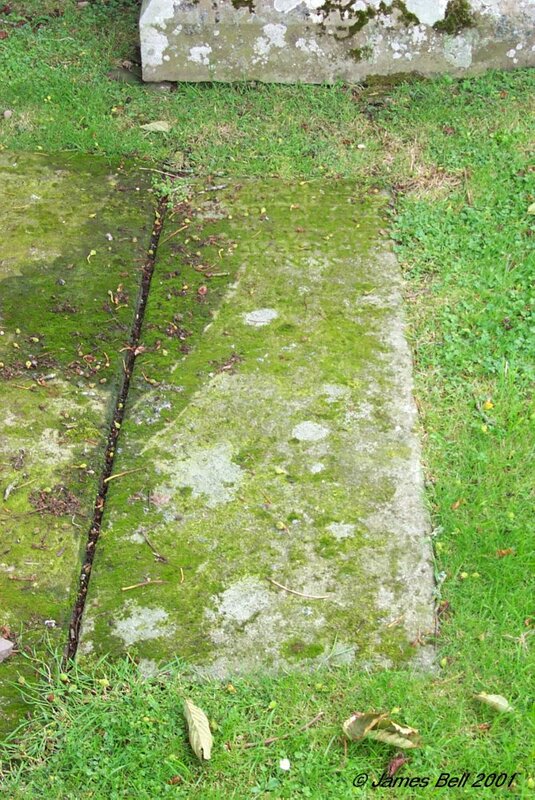 Interred in 'The Soldier's Plot. ', Mountain View Cemetery, Vancouver. Also Marion H.C. Brydson, daughter of the above Alexander Brydson, who died at Dalbeattie, 20th May 1932, aged 81 years. 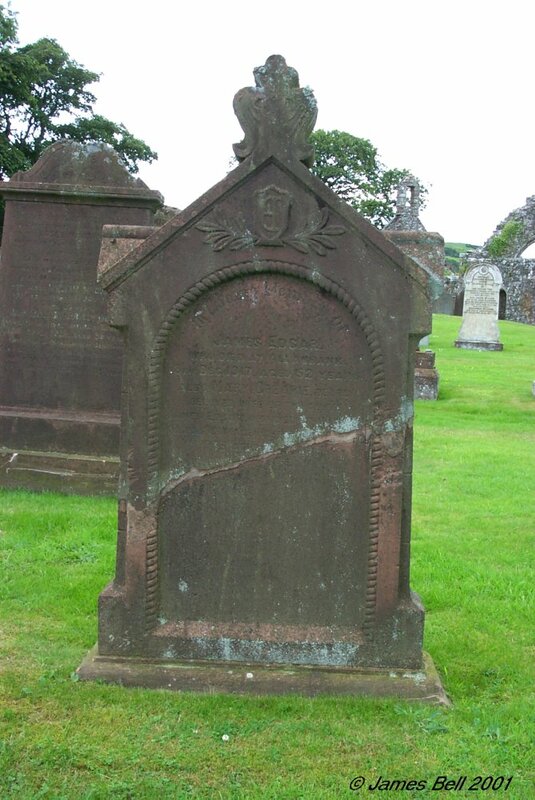 Reverse: In memory of Violet Wilson, spouse to John McHaffie, who died at Castle Douglas, the 19th of October 1805, aged 28 years. 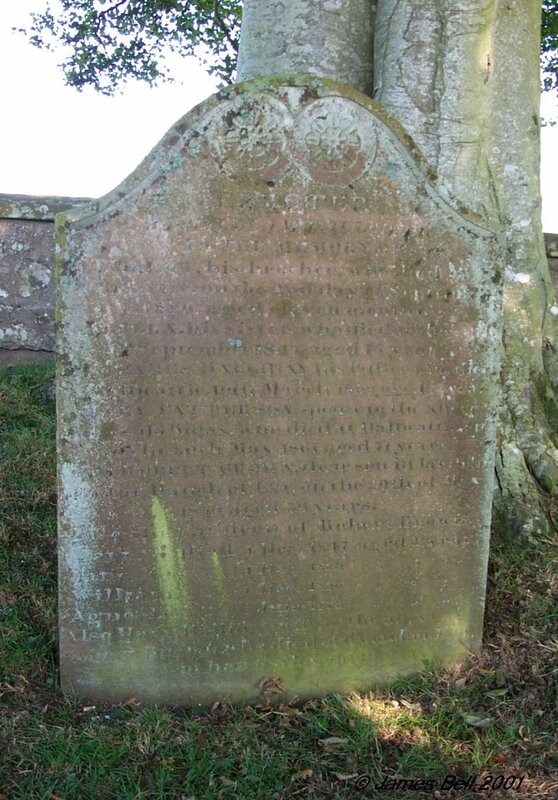 Also Elizabeth McHaffie, their daughter, who died at Parton, on the 1st of April 1824, aged 21 years. Erected by Agness McHaffie their daughter. 285 Erected by Mungo Kelly, shepherd, Kirkennan, in memory of Jane Porter, his spouse, who died 17th Nov. 1861, aged 42 years. 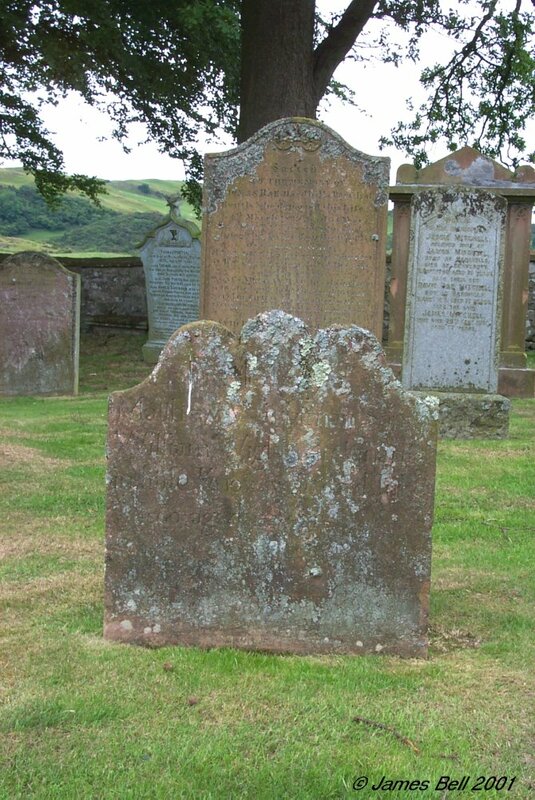 Also William Kelly, his father, who died at Dalbeattie, 30th April 1830, aged 77 years. Also Janet Barclay, his spouse who died at the same place, 15th September 1859, aged 82 years. David Kelly, died 9th March 1881, aged 10 years. 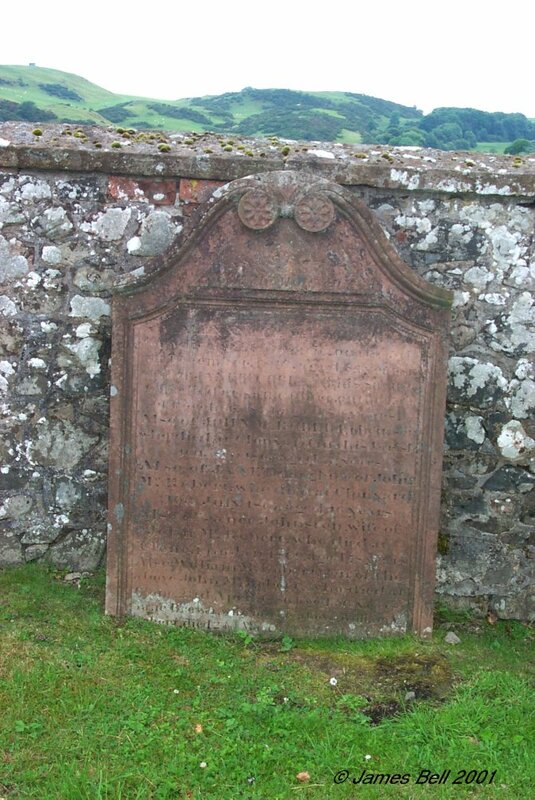 286 Erected by Mary Dickson, in memory of George McWilliam, her husband, who died at Loch Hill the 11th of June 1822, aged 49 years. Also of the above Mary Dickson, who died at Palnackie, on the 14th of June 1837, aged 69 years. 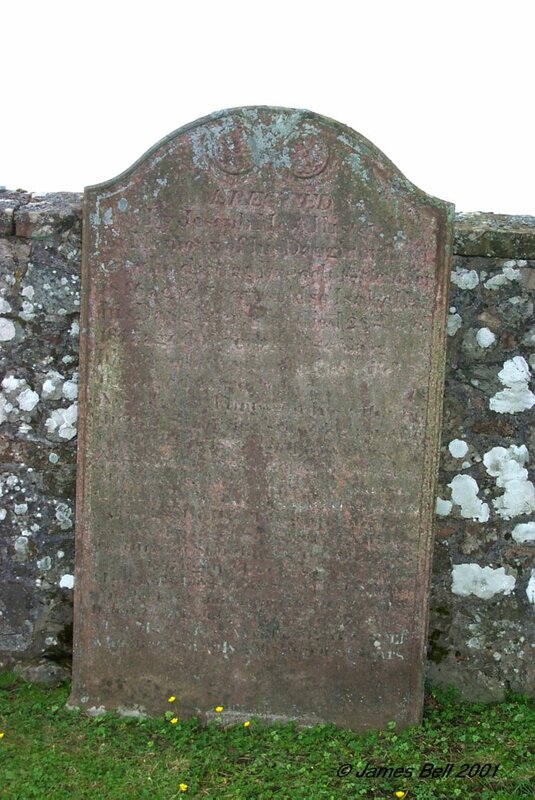 Reverse: Erected by Mary Dickson, his spouse, in memory of George McWilliam who dyed at Lochill, June the 11 1822, aged 47 years. 287 In memory of James McKie, who died at Palnackie, May 26th 1882, aged 74 years. Also Margaret Henry, widow of the above James McKie, who died at Palnackie, May 10th 1904, aged 84 years. James, his son, who was lost at sea, 6th Dec. 1869, aged 16 years. George, who died at Palnackie, 3rd Aug. 1871, aged 16 years. 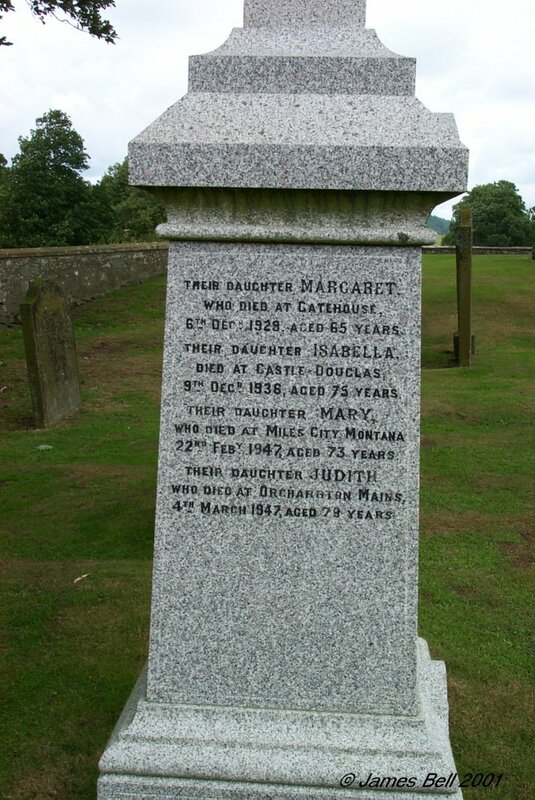 Margaret, his daughter, who died at Castle Douglas, 3rd May 1902, aged 41 years. 289 In loving memory of Robert Brown, who died at Barchain, 18th Nov'r. 1889, aged 42 years. Jane Brown, his wife, who died at Barchain, 27th Nov'r. 1913, aged 59 years. William Calderwood Brown, their son, Pte. 1/4 K.O.S.B., who died of wounds at 53rd casualty clearing station, Palestine, 20th April 1917, aged 32 years. Alexander Brown , their son, who died at Lincoln Villa, Castle Douglas, 11th Feb'y 1957, in his 81st year. Mary Jane Brown, their daughter, who died at Lincoln Villa, Castle Douglas, 9th Nov'r 1958, aged 72 years. 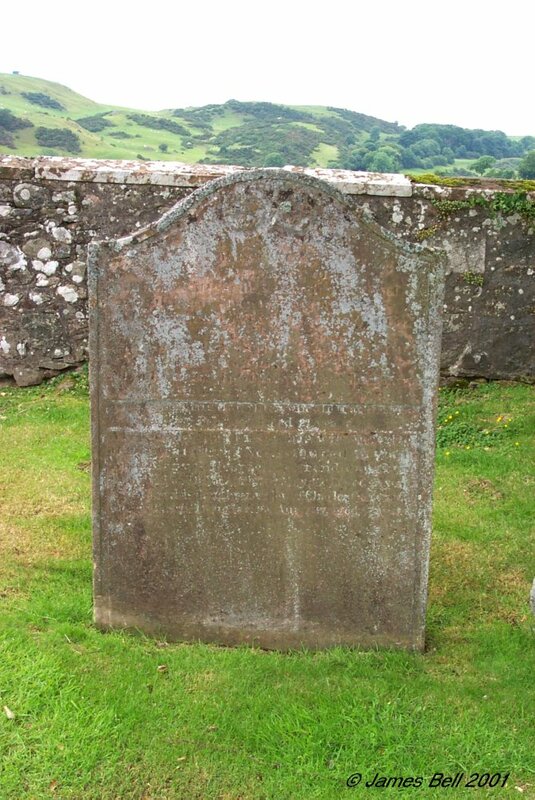 290 In memory of Margaret Donaldson, spouse of John Kissock in Cullinaw, who died 18th Dec. 1807, aged 49 years. 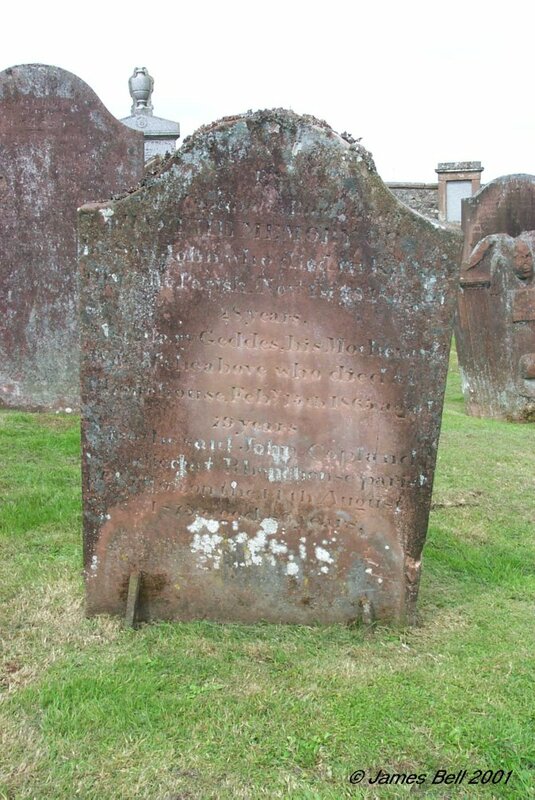 Also of Agness Hutton, his mother, who died 15th Oct. 1809, aged 90 years. And of Mary Ann Kissock, his grand-daughter, who died at Rigg, Parish of Rerrick, 3rd Jan. 1828, aged six months and 11 days. Also of Annie Kissock, his daughter, who died 13th June 1834, aged 38 years. Also of the said John Kissock, who died the 14th Dec. 1834, aged 73 years. 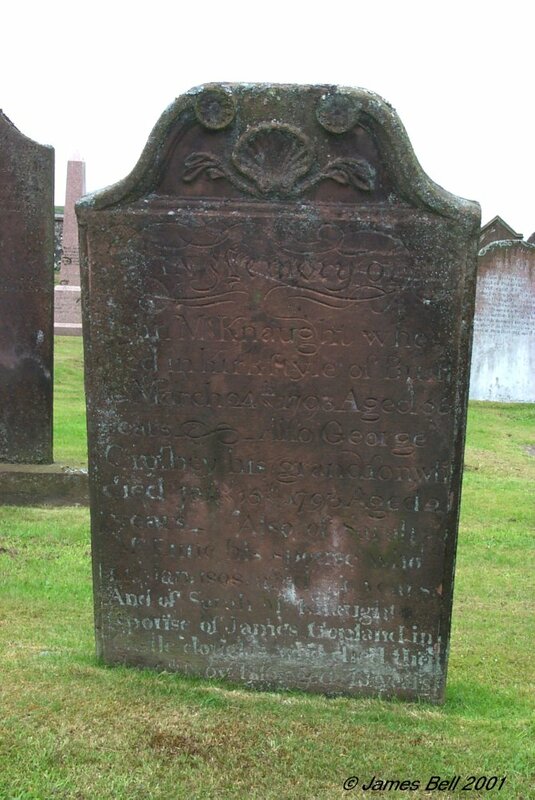 Agnes Kissock, his daughter, died at Low Arkland, 15th Feb'y 1849, aged 54 years. 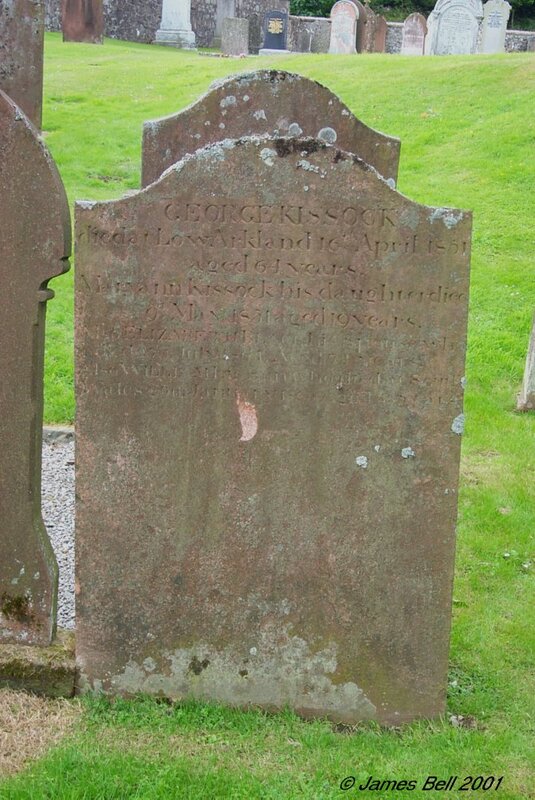 Reverse: George Kissock, died at Low Arkland, 16th April 1851, aged 64 years. Mary Ann Kissock, his daughter, died 9th May 1851, aged 19 years. Also Elizabeth Black, his spouse, who died 27th July 1864, aged 74 years. 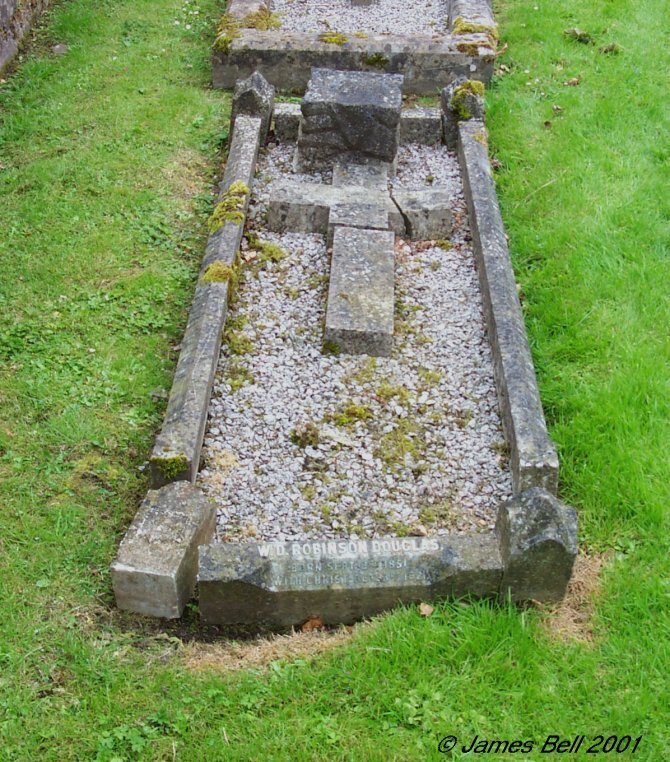 Also William, his son, who died at South Wales, 29th January 1865, aged 35 years. 291 Erected in memory of Mary Murphy, who died at Palnackie on the 12th day of May 1866, aged 41 years. 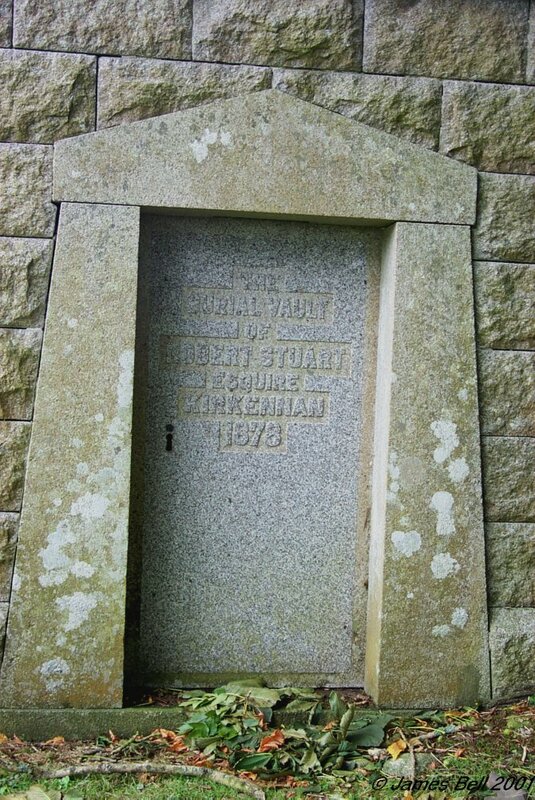 292 The Burial Vault of Robert Stuart Esquire, Kirkennan, 1878. In memory of Robert Stuart, born in Manchester, 1st April 1791, died 13th April 1879. 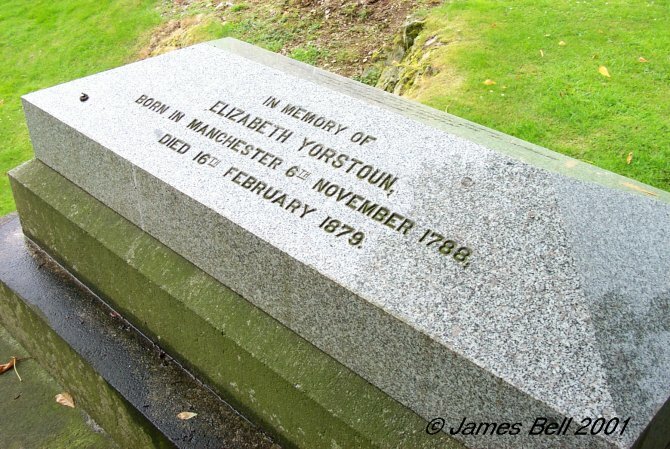 In memory of Elizabeth Yorstoun, born in Manchester, 6th November 1788, died 16th February 1879. 293 Erected to the memory of John Tait, 43 years Parish School Master of Buittle, by old pupils and friends in testimony of his public usefulness and private worth; during a period of unexampled progress in the art of teaching he steadily kept pace with improvement in the profession which, to his last hour, he adored. He died 27th January 1857, aged 66. 294 In memory of Thomas Wright, who died at Toull, Munches, 9th Sept'r 1881, aged 8 years and 11 months. Also William Wright, his brother, who died at Steedstone, Dalbeattie, 10th Oct. 1897, aged 22 years. Also David Wright, their father, who died at Steedstone, 12th June 1905, aged 61 years. 295 Erected by John McMichan, in memory of Elizabeth Foulis, his wife, who died at Breoch, 9th February 1859, aged 40 years. 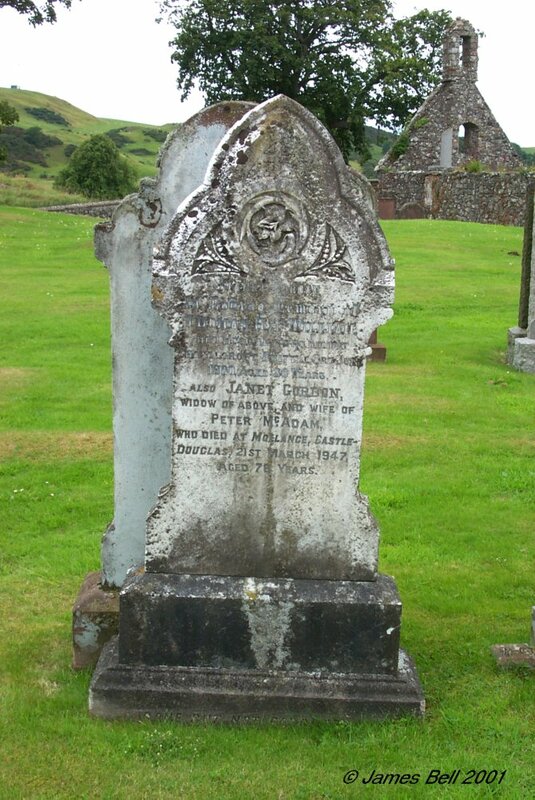 Also of John McMichan, their son, who died at Breoch, 3rd Aug. 1860, aged 19 years. Also of the said John McMichan, who died at Union Street, Dalbeattle, 4th Dec. 1869, aged 55 years. 296 This stone has references to Gordon of Kirkland and Little Knox. Dates, ages and given names cannot be read. In the right light, it may be legible. 297 Has unreadable lettering around the outer border. Rough in centre. 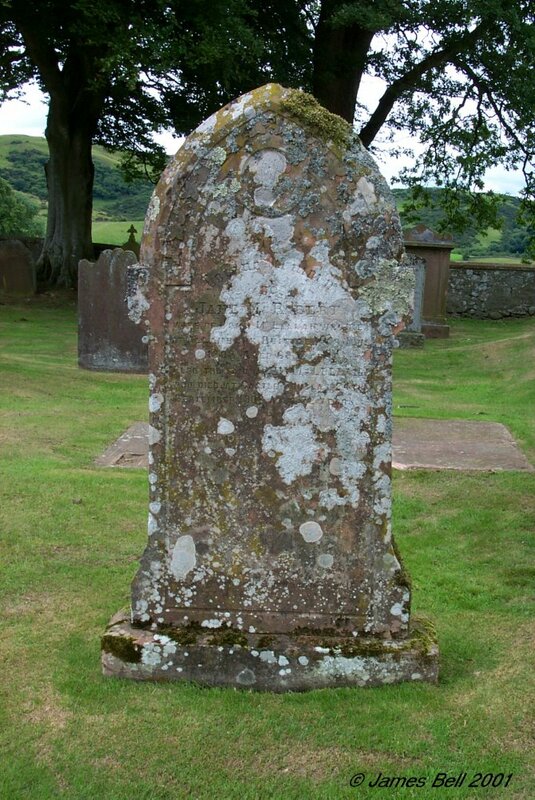 298 In memory of John Cannon, who died in Park of Barlochan, the 3rd Feb. 1776, aged 44 years. 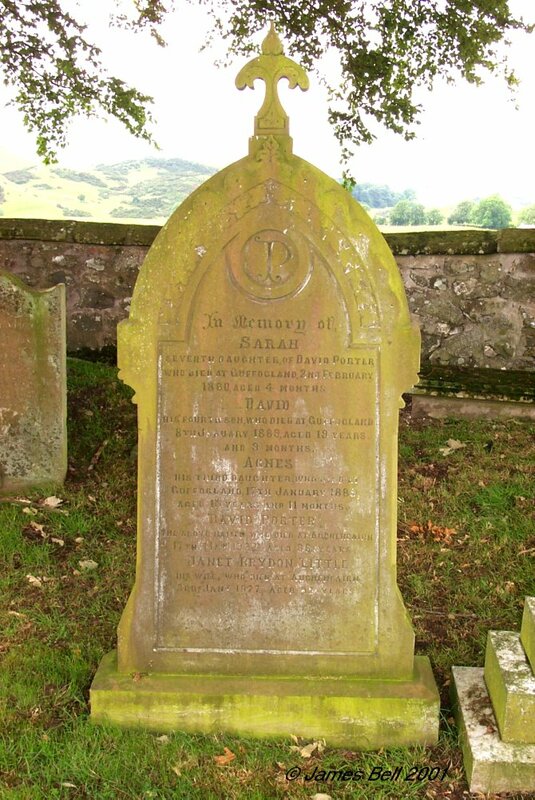 Also of Sarah Ewart, his spouse, who died 8th of April 1807, aged 74 years. And of James Cannon, their son, who died 15th of July 1836, aged 75 years. He was church officer in this parish, fifty years and five months. 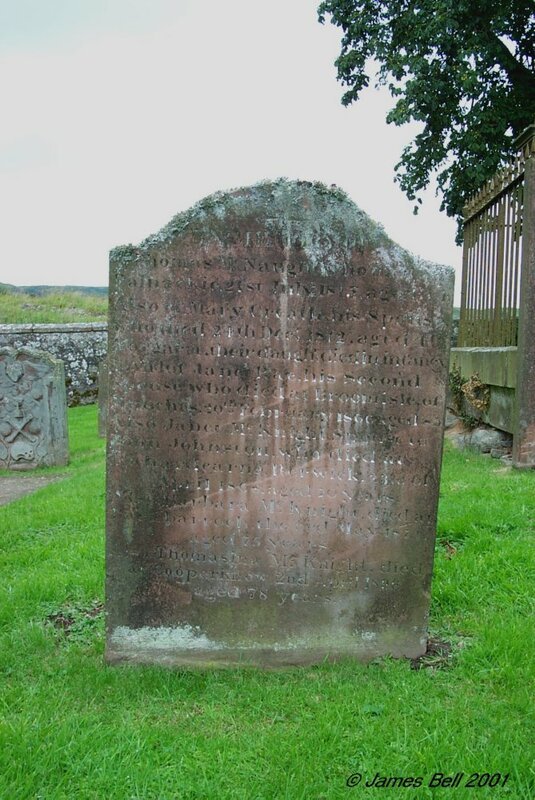 299 In memory of John Cannon of Barlochan, who died 21st Oct. 1751, aged 52 years. Henrietta Maxwell, his spouse, who died 24th Nov. 1790, aged 87 years. Francis, who died in infancy, in 1743. 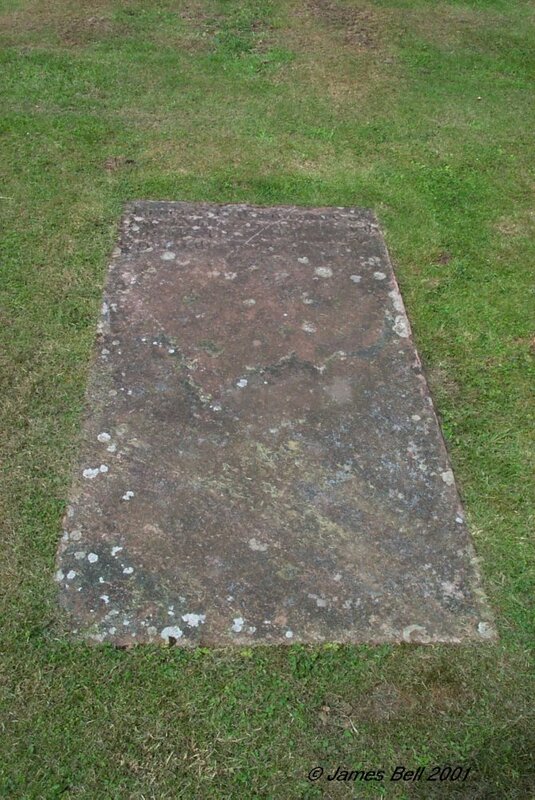 Jane, who died 10th March 1756, aged 21 years. Robert, who died 6st June 1756, aged 19 yrs. 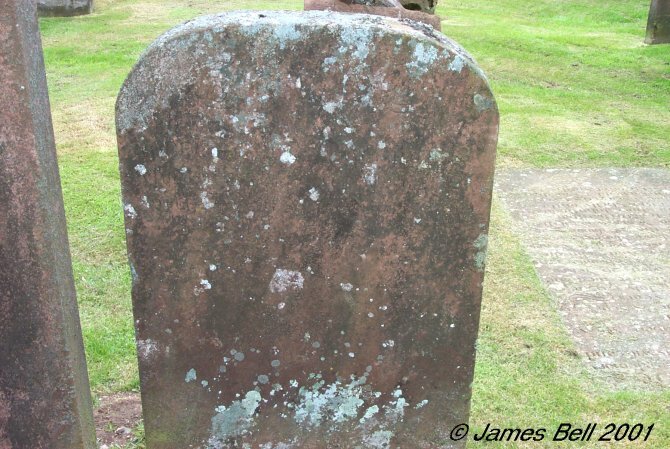 James, who died 19th Dec. 1760, aged 21 years. Nathaniel, who died in Jamaica, 7th May 1768, aged 23 years. 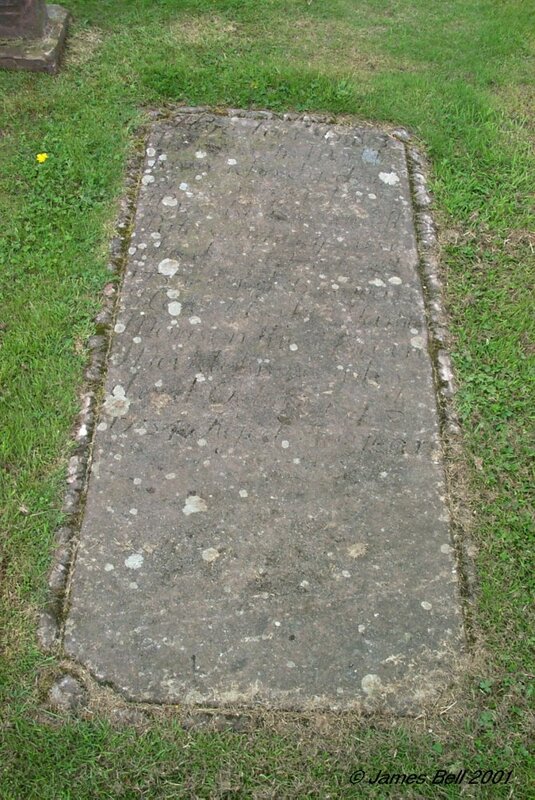 John, who died 7th June 1791, aged 49 years. And Francis, who died 20th of June 1818, aged 72 years. 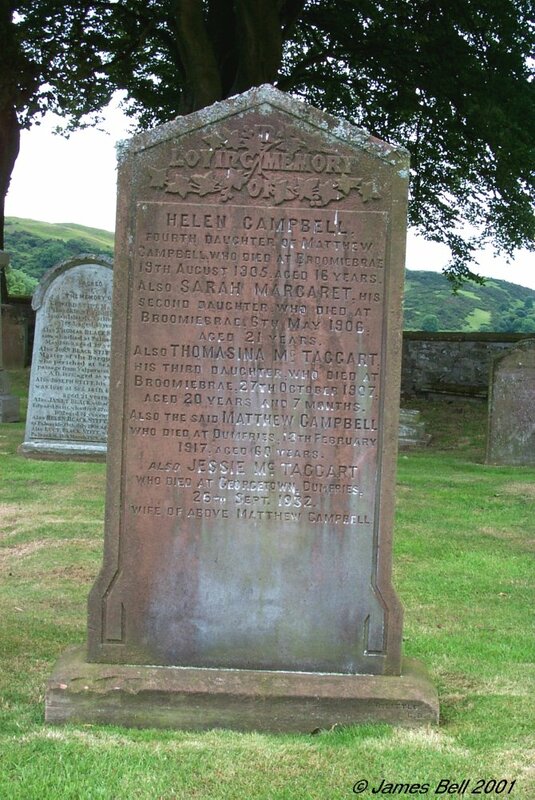 Margaret Carmont, spouse of the last named John Cannon, who died at Kirkcudbright, 12th Dec. 1818, aged 71 yrs. 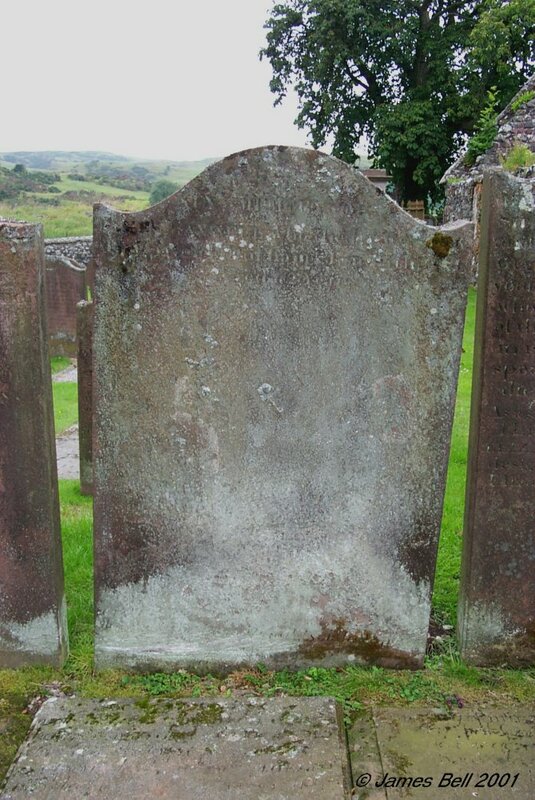 John Cannon, son of the said John Cannon, and Margaret Carmont, who died at Kirkcudbright, 18th April 1829, aged 59 years. His spouse Agnes Gordon, who died at Little Knox, 3rd Feb. 1803, aged 29. 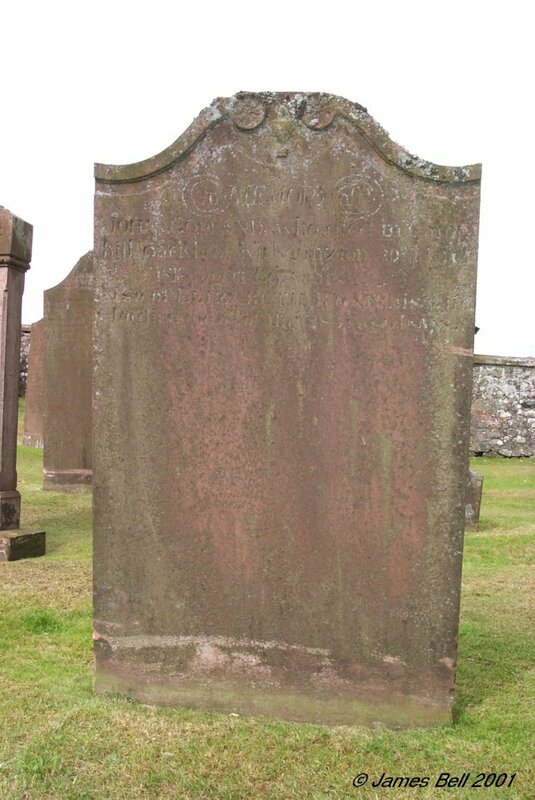 His sister Margaret Cannon, who died at Kirkcudbright, 6st of March 1831, aged 55 years. 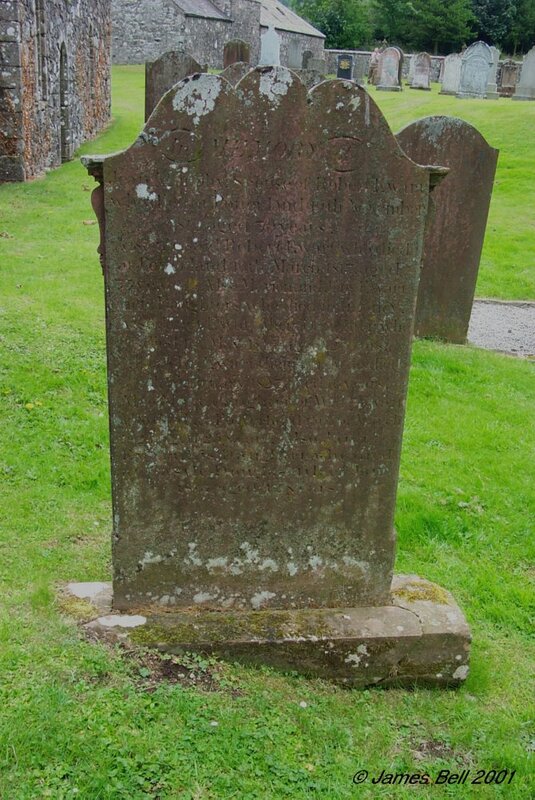 His brother Robert, who died at Kirkcudbright, 28th Feb., 1849, aged 79 years. His daughter Margaret, who died 3rd Dec. 1855, aged 56 years. 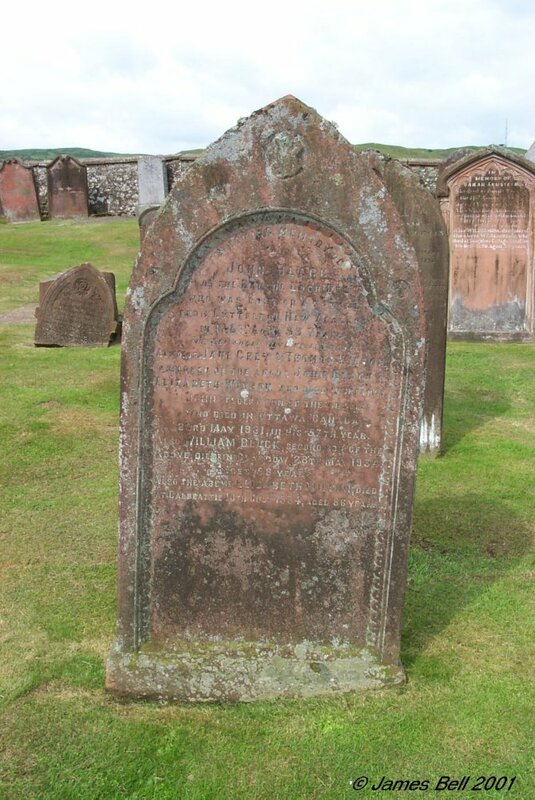 Also John Cannon, who died at Kirkcudbright, 15th July 1866, aged 68 years. 300 Here lyes the body of Margrat Cannan, spouse to William Riddick of Corbiton, who departed this life the 27th day of October 1727, aged --. 301 In memory of the Reverend George Maxwell, Minister of Buittle, who was ordained on the 7th April 1785, and died on the 24th June 1807, in the 45th year of his age. 'Such were his abilities as a Christian, and such piety and benevolence as a Christian, and such his winning courtesy as a member of society, that he attracted the attention of every company, procured the love and gratitude of many a heart, and constrained the censorious to overlook the frailties incident to man.' Henrietta Cannon, spouse of the above Reverend George Maxwell, who died at Kirkcudbright, 5th June 1839, aged 80 years. 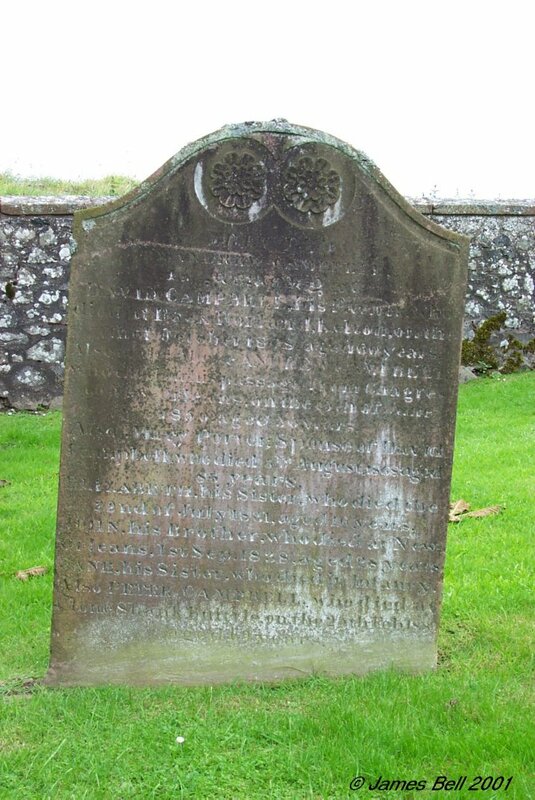 302 Erected by Mary Kirkpatrick, in memory of Charels Maxwell, her husband who died at Woodend, Parish of Colvend, 4th Jan. 1819, aged 63 years. Also in memory of the said Mary Kirkpatrick, his relict, who died at Old Abbey, on the 11th day of July 1850, aged 85 years. 303 Here lyes George Maxwell, son to Robert Maxwell of Blackbelly and G'son to ye late Sir Robert Maxwell of Orchardtoun, who dyed March ye 3rd 1755, aged 3 months. 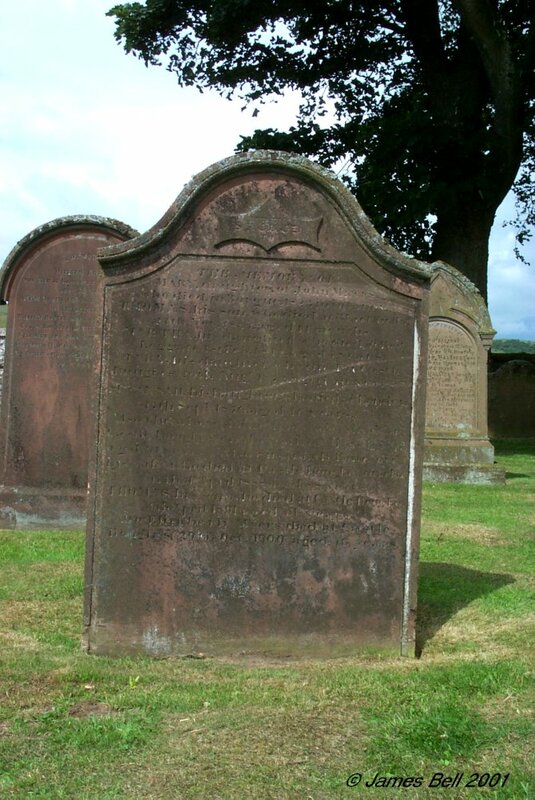 304 In memory of James Maxwell, who died at Kirkpatrick Durham, June 5th 1833, aged 72 years. 305 May be readable in good light. 306 In memory of Barbara, daughter of the late Sir George Maxwell of Orchardton, and spouse of John McWilliam of Gegerie, who died in 1782, aged 60 years. Also of the said John McWilliam, who died in 1784, aged 70 years. Also of their eldest son Thomas, who died in 1816, aged 73 years. 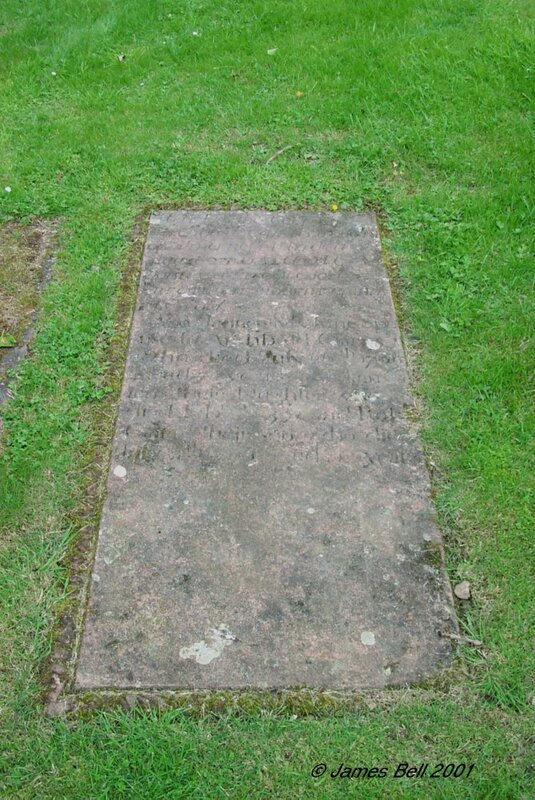 And of his spouse Elizabeth Thomson, who died in 1830, aged 87 years. As a small memento of filial regard. This stone has been erected by Elizabeth only child of the above designed Thomas McWilliam and Elizabeth Thomson. 307 In memory of Mrs. Margaret Blecklay, first spouse to the last deceased Sir George Maxwell of Orchyardtoun, Baronet, this stone is erected by Sir (Tho's) Maxwell, now of Orchyardtoun, Baronet, their eldest son. 1752. As much value as could die. 308 In memory of James, son of James Rain, who died at Palnackie, 5th Feb. 1857, aged 4 years. Also Robert, his son who died at Palnackie, 27th Aug. 1868, aged 4 months. Also Nicholas, his daughter, who died at Palnackie, 21st Oct. 1868, aged 5 years & 6 months. 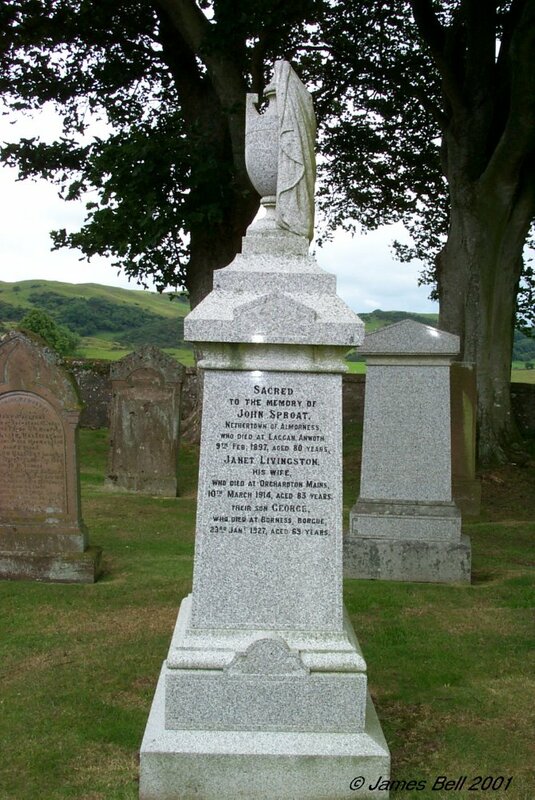 Also Jessie, his daughter, who died at Dalbeattie, 2nd September 1875, aged 17 years. 309 In memory of George McKie, son of Peter Neilson, who died at Palnackie, 15th August 1887, aged 8 years. Also Mary Ann McKie, his wife, who died 19th February 1916, aged 69 years. Also the above Peter Neilson, who died 13th July 1917, aged 77 years. 310 In loving memory of Henry Richard, beloved son of Henry Hiddleston, who died 30th April 1937, aged 20 years. 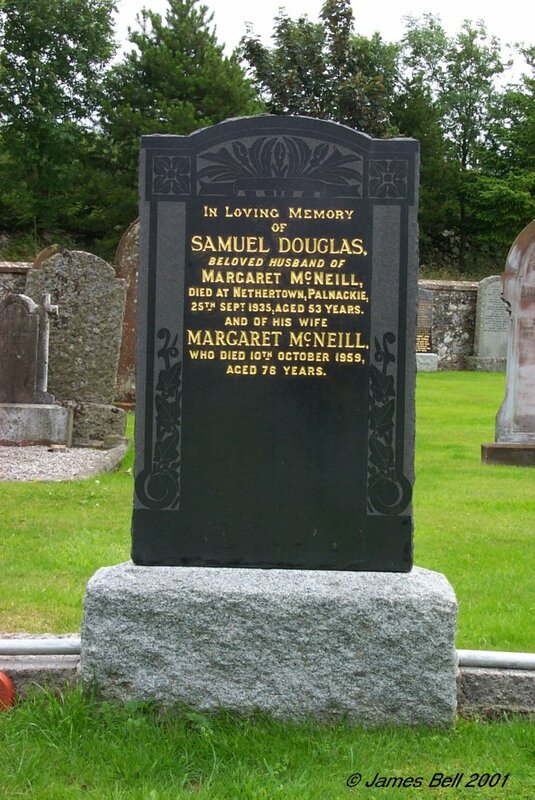 311 In loving memory of Samuel Douglas, beloved husband of Margaret McNeill, died at Nethertown, Palnackie, 25th Sept. 1935, aged 53 years. And of his wife Margaret McNeill who died 10th October 1959, aged 76 years. 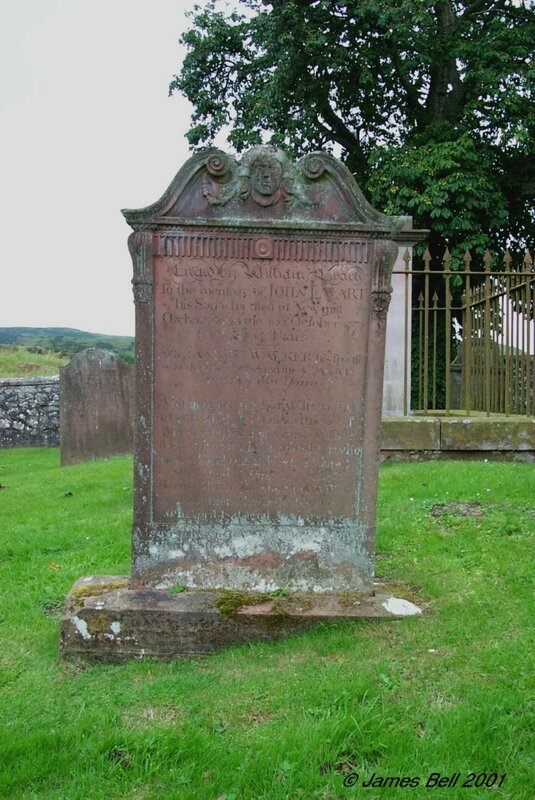 312 In loving memory of Peter Millar, dearly beloved husband of Wilkie Callander, who died at Courthill, 18th Octr. 1931, aged 41 years. Also the above Wilkie Callander, who died at Mossdale, 8th Jany. 1975, aged 80 years. 313 In loving memory of John James Maxwell, Halket Leaths, who died 13th July 1934, aged 62 years. Also his wife Agnes Jane McKie, who died 23rd May 1956, aged 86 years. 314 In loving memory of Elizabeth Gibson Robertson, beloved wife of James Campbell, who died 1st August 1951, aged 38 years. Also the above James Carter Campbell who died 11th December 1966, aged 58 years. Of Cuil, Castle Douglas. 315 In loving memory of William Greenway, beloved husband of Lucy Halliday, who died at Palnackie 20th July 1937, aged 27 years. 316 In loving memory of Margaret Maxwell, fifth daughter of W. Herries Maxwell of Munches, born 6th Feb. 1856, died 22nd May 1934. And of her sister Catherine Helen, born 17th Oct. 1864, died 29th Jan. 1944. "His servants shall serve him, and they shall see his face." 317 In loving memory of Maggie Elizabeth Black, beloved wife of Donald McMillan, who died in London, 23rd October 1929, aged 35 years. 318 In loving memory of Agnes McLean, wife of David Campbell, who died at Gardenburn, 16th Feby. 1929, aged 78 years. Also the above David Campbell who died at Gardenburn, 29th Novr. 1929, aged 76 years. 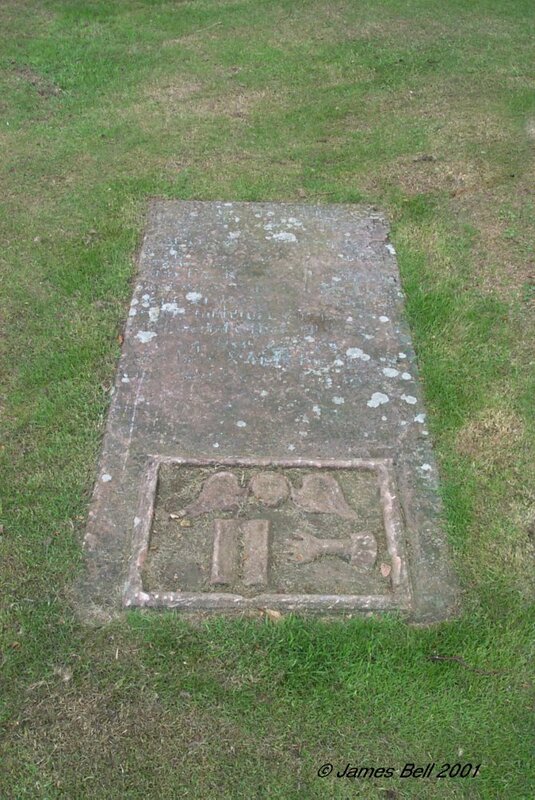 319 In loving memory of William Murray, who died at Orchardton Kennels, 1st Novr. 1931, aged 73 years. Also Isabella Buchan, his wife, who died at Bonnyrigg, 31st August 1915, aged 51 years. 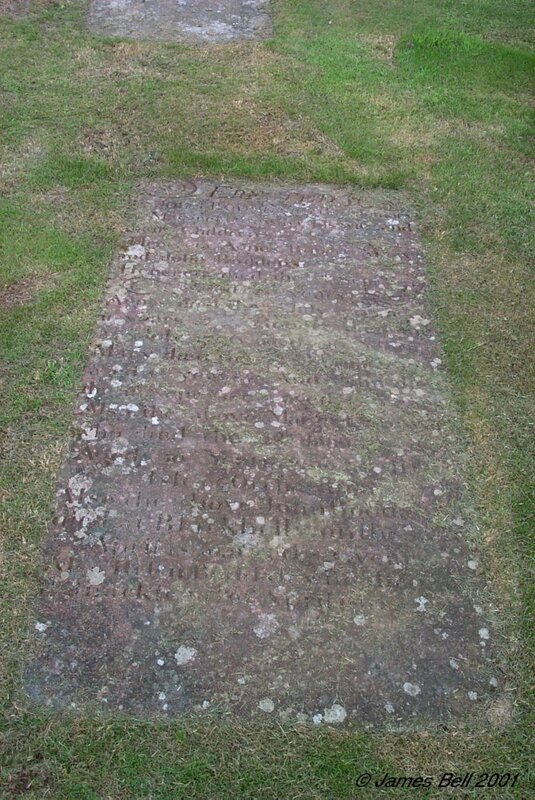 Interred at Newbattle. 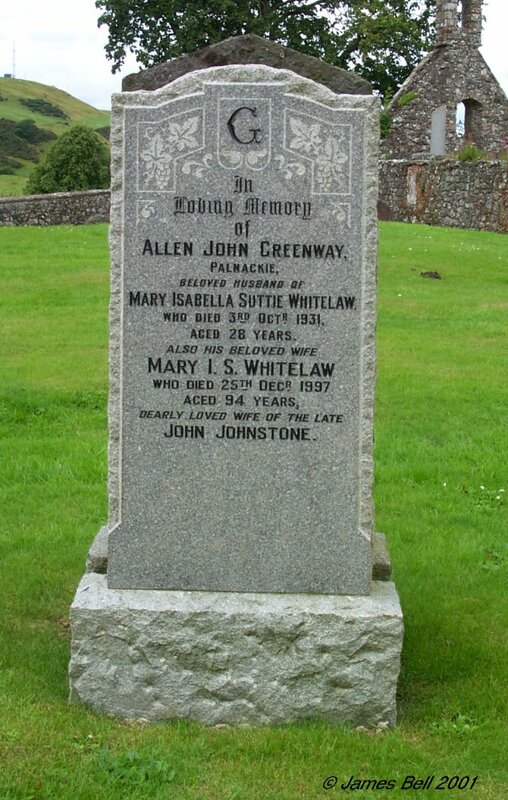 320 In loving memory of Allen John Greenway, Palnackie, beloved husband of Mary Isabella Suttie Whitelaw, who died 3rd Octr. 1931, aged 28 years. Also his beloved wife Mary I. S. Whitelaw, who died 25th Decr. 1997, aged 94 years, dearly beloved wife of the late John Johnstone. 321 Erected in memory of Peter Finnigan who died at Palnackie, 4th March 1931, aged 70 years. Also Henrietta Burnett Currie, his wife, who died at Palnackie 10th Jany. 1939, aged 76 years. 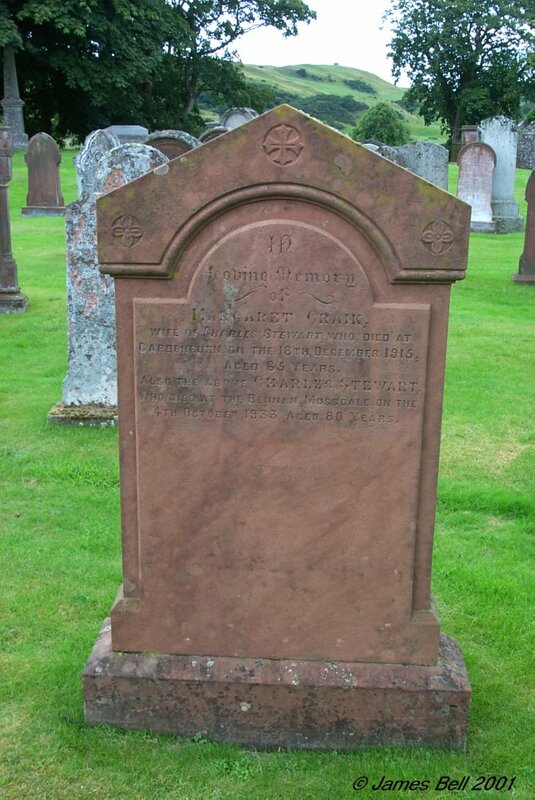 Also Henrietta, their daughter, wife of the late William Carnochan who died at Dumfries 28th March 1936, aged 38 years. 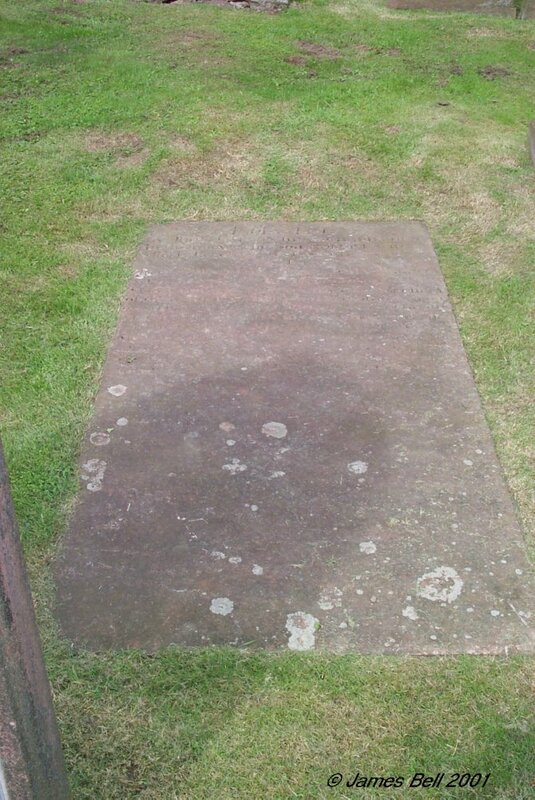 Interred at Troqueer Churchyard. 322 In loving memory of John Campbell, late of Overton, who died 23rd December 1930, aged 28 years. Also Robert Jamieson Campbell who died at Cuil, 5th March 1935, aged 72 years. 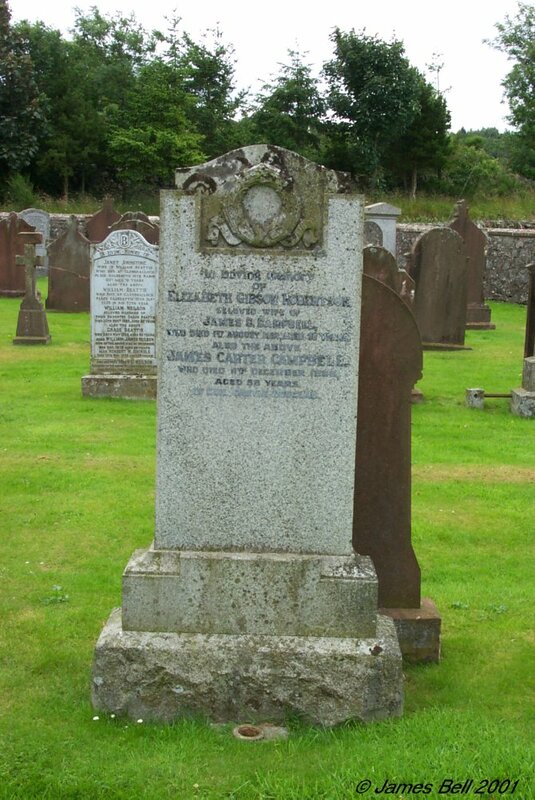 And of Mary Carter, wife of the above Robert Jamieson Campbell, who died at Castle Douglas 20th Feb. 1945, aged 74 years. 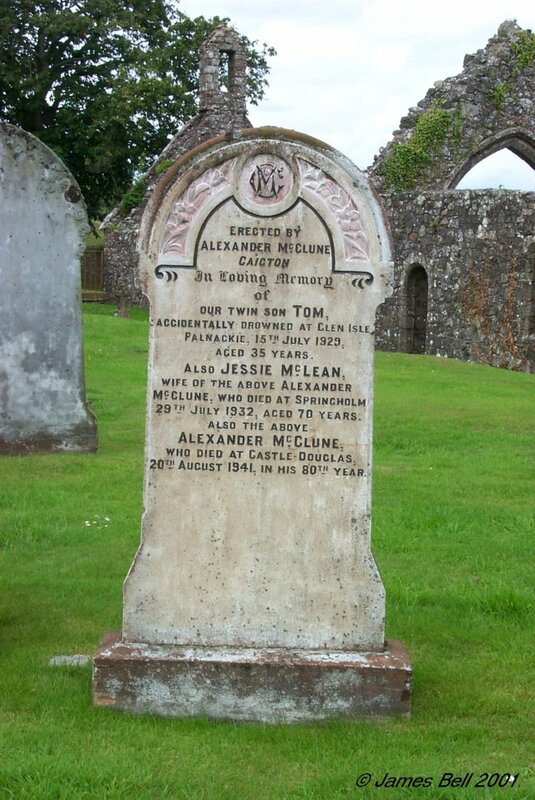 323 Erected by Alexander McClune, Caigton, in loving memory of our twin son Tom, accidentally drowned at Glen Isle, Palnackie, 15th July 1929, aged 35 years. Also Jessie McLean, wife of the above Alexander McClune, who died at Springholm 29th July 1932, aged 70 years. Also the above Alexander McClune, who died at Castle Douglas, 20th August 1941, in his 80th year. 324 Erected in loving memory of Sarah Isabella Millar, eldest daughter of Andrew Millar, who died at Hardhills, Buittle, 10th January 1911, aged 23 years. Thomas Millar, his brother, who died at Hardhills, Buittle, 19th March 1911, aged 44 years. Thomas, son of Andrew Millar, who was killed in action in France, 20th Sepr. 1917, aged 22 years. Janet Tait, wife of Andrew Millar, who died at Clone, 19th Jany. 1930, aged 67 years. Also the above Andrew Millar, who died at Carlisle, 15th May 1950, aged 85 years. 325 In loving memory of Marie, wife of J.W. 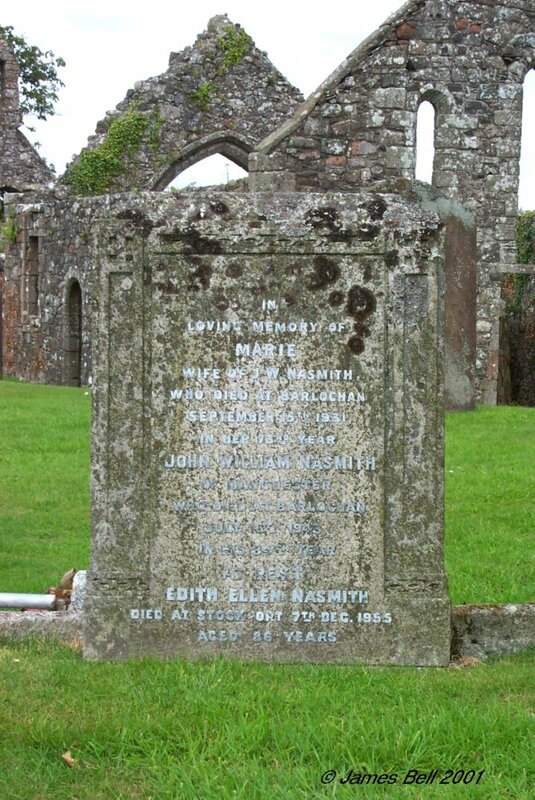 Nasmith, who died at Barlochan, September 15th, 1931, in her 73rd year. John William Nasmith of Manchester, who died at Barlochan, July 16th, 1943, in his 84th year. Edith Ellen Nasmith, died at Stockport, 7th Decr. 1955, aged 86 years. 326 In loving memory of Lizzie, daughter of John and Mary Johnstone, wife of William Black, who died at Kirkennan Cottage, 2nd July 1908, aged 31 years. Jeannie, their daughter, who died at Parkgate, Kirkmichael, 14th Oct. 1883, aged 5 months. Also the above Mary Johnstone who died at Kirkennan Cottage, 9th May 1930, aged 86 years. 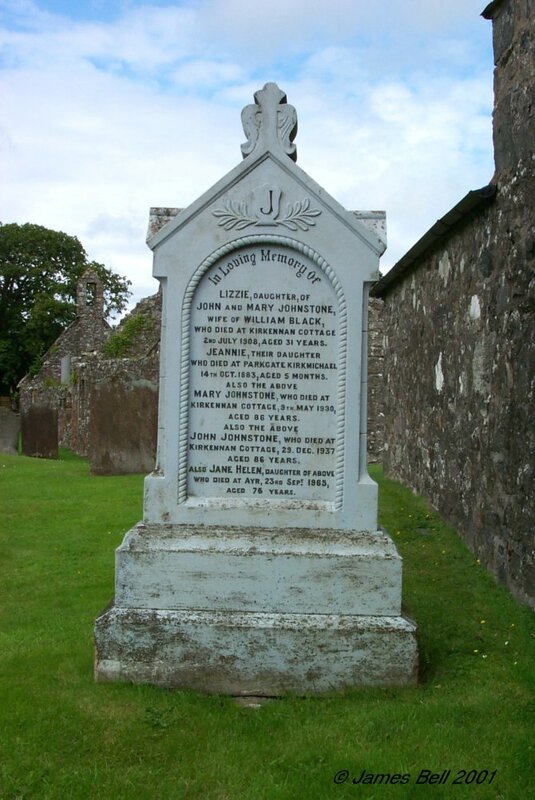 Also the above John Johnstone who died at Kirkennan Cottage, 29th Dec. 1937, aged 86 years. Also Jane Helen, daughter of the above, who died at Ayr, 23rd Sepr. 1965, aged 76 years. 327 In loving memory of Jean Herries Carlyle, wife of Ivie Craik, who died 23rd June 1937, aged 43 years. 328 In loving memory of John Sewell, who died at Railway Cottages, Buittle, 28th June 1929, aged 61. Jane Herries Martin, his wife, who died at same place, 22nd Novr. 1928, aged 55. 329 In loving memory of John Walker, beloved husband of Sarah Fletcher, who died at Burnside, Colvend, 15th Novr. 1928, aged 68 years. "Sadly Missed." 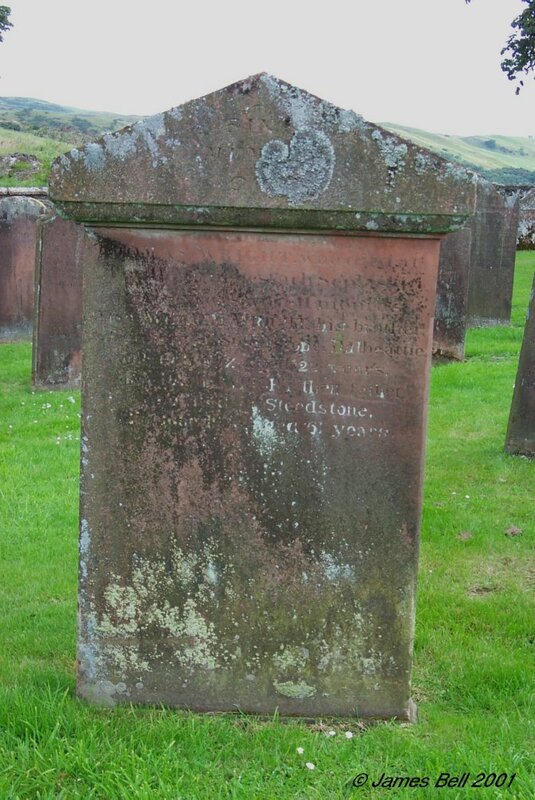 Also the above Sarah Fletcher who died at Meikle Knox, 18th Sept. 1946, aged 90 years. 330 In loving memory of Janet Johnstone, wife of William Beattie, who died at Glenshalloch Place, Dalbeattie, 14th March 1927, aged 72 years. 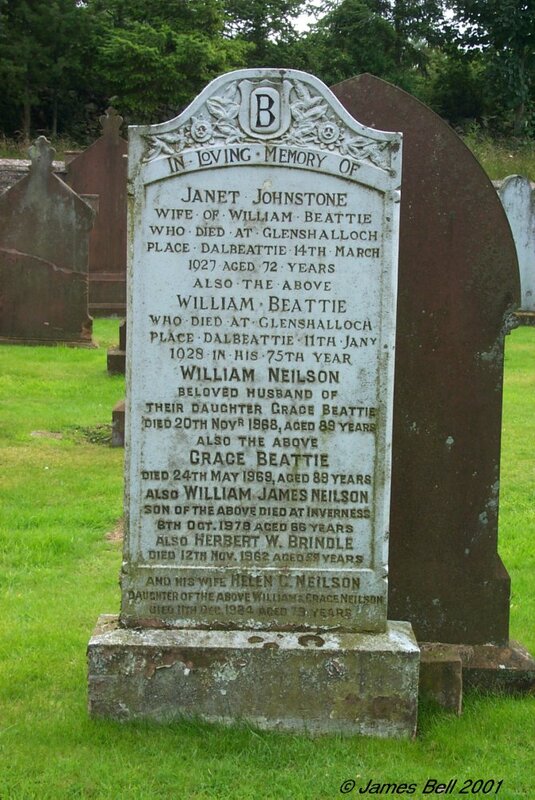 Also the above William Beattie who died at Glenshalloch Place, Dalbeattie, 11th Jany. 1928, in his 75th year. William Neilson, beloved husband of their daughter Grace Beattie, died 20th Novr. 1968, aged 89 years. Also the above Grace Beattie, died 24th May 1969, aged 89 years. 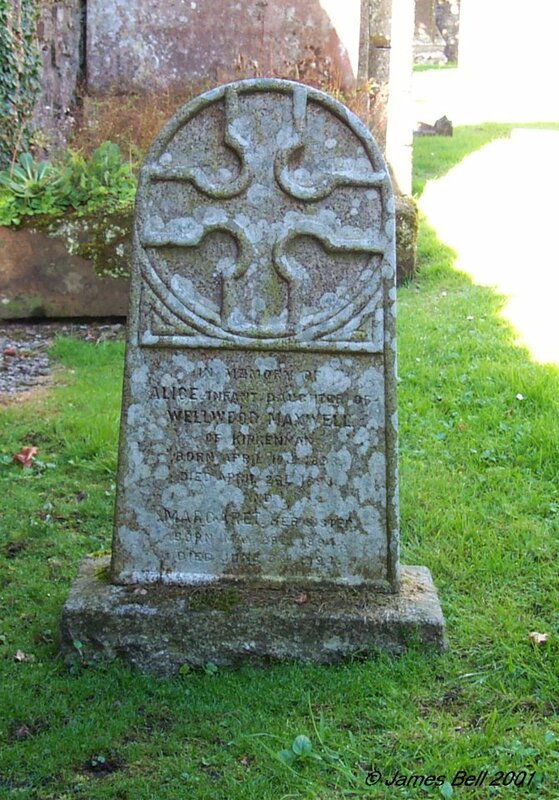 Also William James Neilson, son of the above, died Inverness 8th Oct. 1978, aged 66 years. Also Herbert W. Brindle, died 12th Nov. 1962, aged 59 years, and his wife Helen C. Neilson, daughter of the above William and Grace Neilson, died 11th Dec. 1984, aged 79 years. 332 In loving memory of Matthew Smith, who died at Leaths, 18th January 1926, aged 62 years. Also his wife Grace Anderson, who died at Edingham, 6th October 1954, aged 87 years. 333 In loving memory of Agnes Hope, wife on John Welsh, who died at Toull, Munches, 1st February 1920, aged 58 years. Also the above John Welsh who died at Toull, Munches, 18th February 1925, aged 71 years. 334 Sacred to the memory of Nicol Frederick Paterson, who was lost at sea 31st Jany. 1891, aged 43 years. Also Helen Black, his wife, who died at Palnackie 4th June, 1929, aged 79 years. 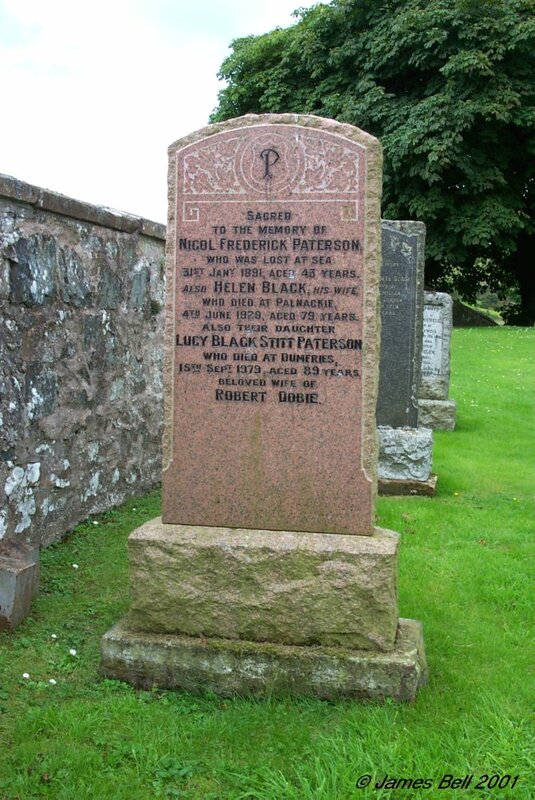 Also their daughter Lucy Black Stitt Paterson, who died at Dumfries 15th Sept. 1979, aged 89 years. Beloved wife of Robert Dobie. 335 In loving memory of James Paul Helm, who died at Galson, Bonnyrigg, 14th Decr. 1929, aged 80 years. And his wife Margaret Fowlie, who died at Galson, 24th June 1941, aged 82 years. Also their daughter Janet Isabella who died at Edinburgh 30th June 1975. 336 Erected by Janet Gordon, in loving memory of Thomas H. McWilliam, her husband, who died at Chapelcroft, Buittle, 3rd June 1900, aged 36 years. Also Janet Gordon, widow of the above, who died at Mollance, Castle Douglas, 21st March 1947, aged 76 years. 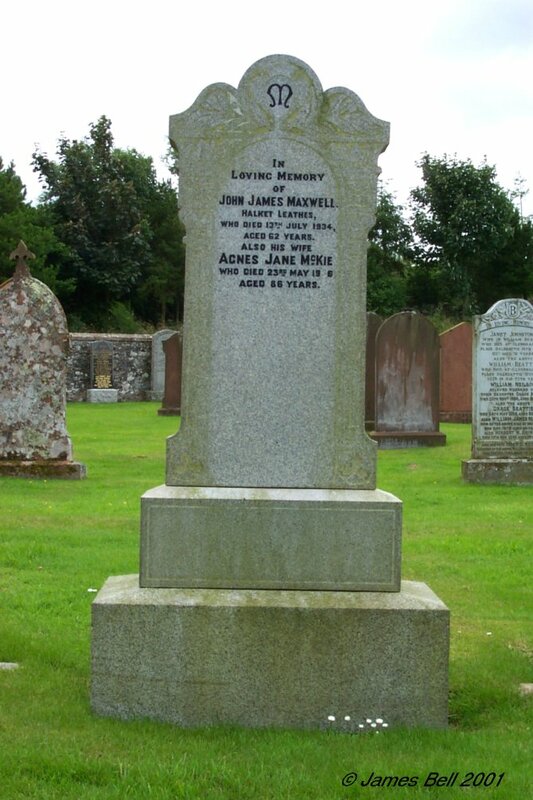 337 In loving memory of Alexander Nivision, who died at Castle Douglas 18th May 1900, aged 57 years. Jessie Agnes Nivision, his daughter, who died at Palnackie, 1st April 1903, aged 16 years. John Nivision, his eldest son who died at Brisbane 30th Sepr. 1916, aged 34 years. 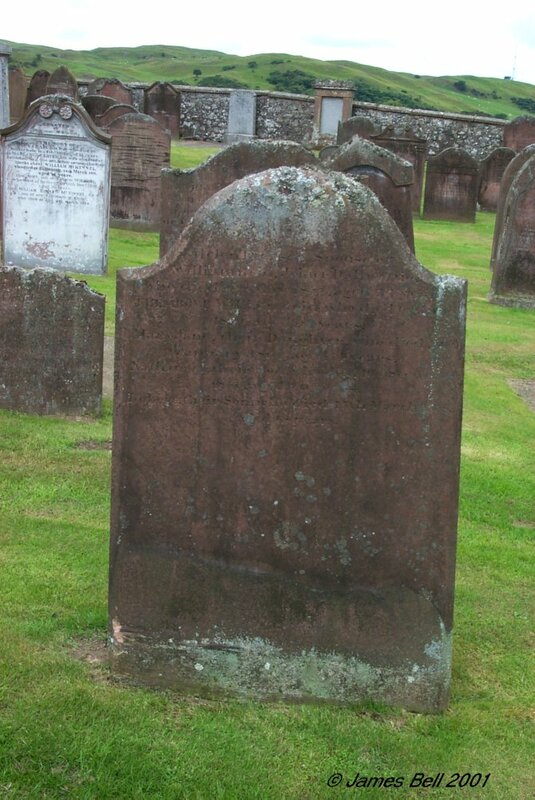 Margaret Grieve, wife of the above Alexander Nivision, who died at 117 Queen St., Dumfries, 17th Decr. 1927, aged 79 years. Also his second son Captain Thomas Grieve Nivision, O.B.E., Master Mariner, Blue Funnel Line, who died 1st May 1947, at Castletown, I.O.M., aged 63 years. Buried off Niarbyl Point, at sea. 338 Erected in memory of Robert Patterson, who died at Haugh of Urr, 23rd Jan y. 1869. 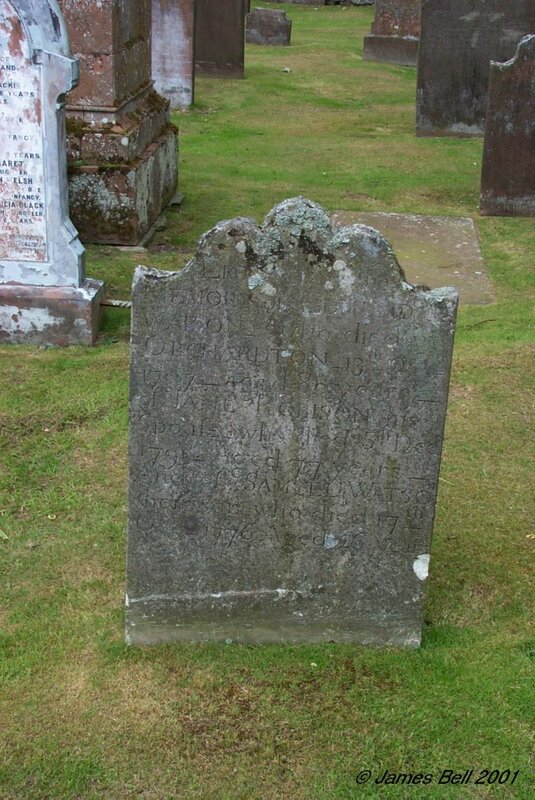 And Mary McLachlan, his wife who died at Breckoniehill, April 1846, aged 49 years. Also their son Robert, who died at Kirkstyle, 5th April 1900, aged 71 years. Also their daughter Isabella, who died at Kirkstyle, 16th Feby. 1904, aged 77 years. 339 In affectionate remembrance of Mary Graham, eldest daughter of Andrew Graham, died at Old Buittle, Nov. 29th 1899, aged 20 years and 8 months. Agnes Graham, his daughter, who died at Elder's Hospital, Govan, 5th August 1907, aged 21 years. 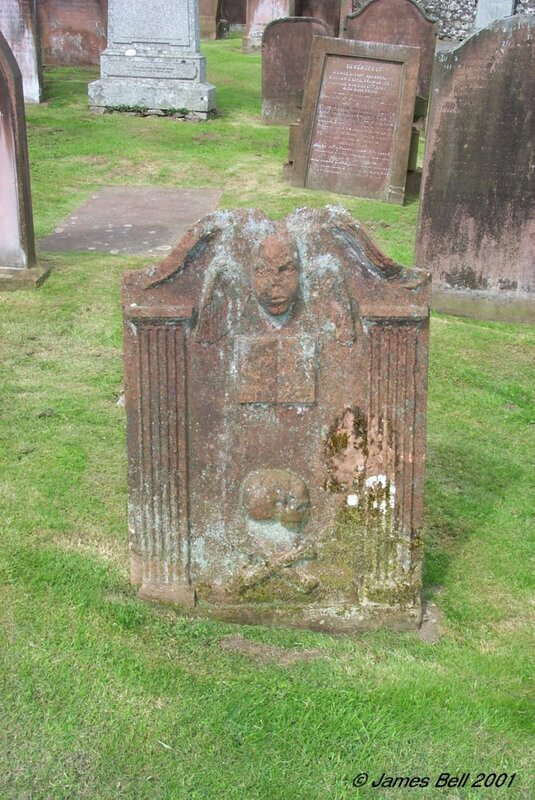 Interred in Craigton Cemetery. 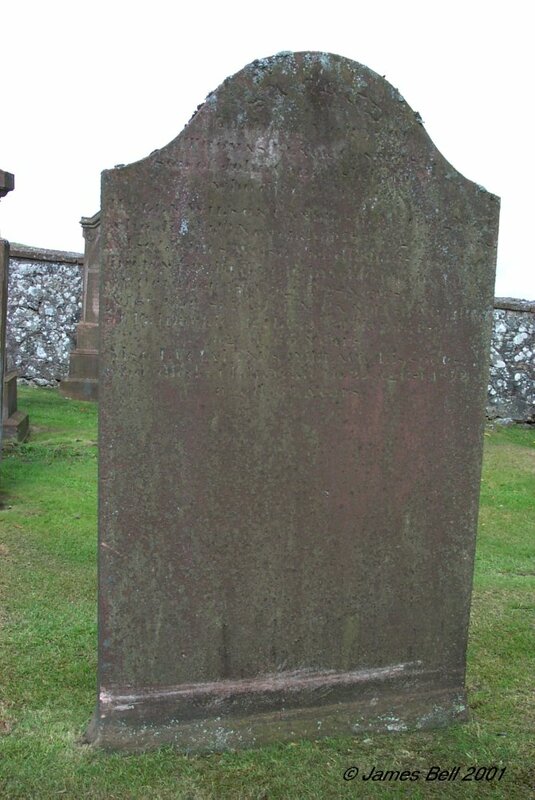 Also Andrew Graham, late of Old Buittle, who died at 2 Glenaerlie Terrace, Jan. 2nd 1929, aged 79 years. 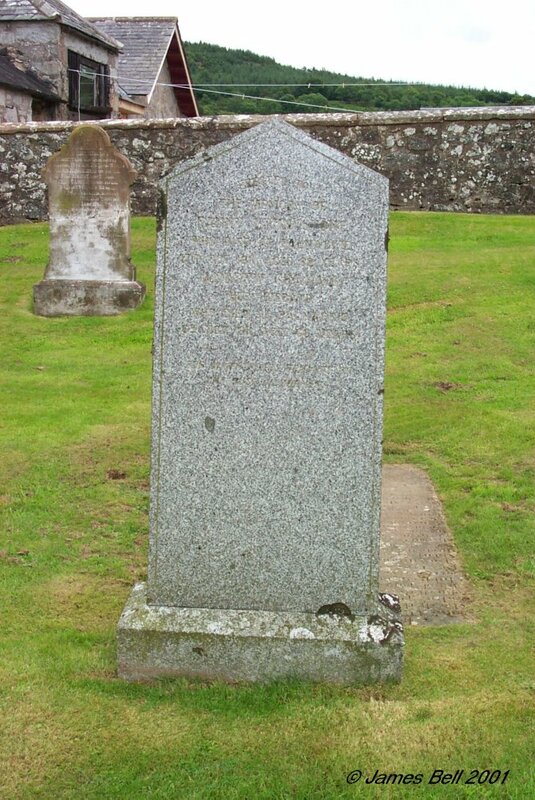 340 ............ Barrowman, who died at Caigton, Castle Douglas, 9th February 1890, aged 65 years. James Barrowman, their youngest son, who died at Almingham, Manchester, 1901, aged 24 years. 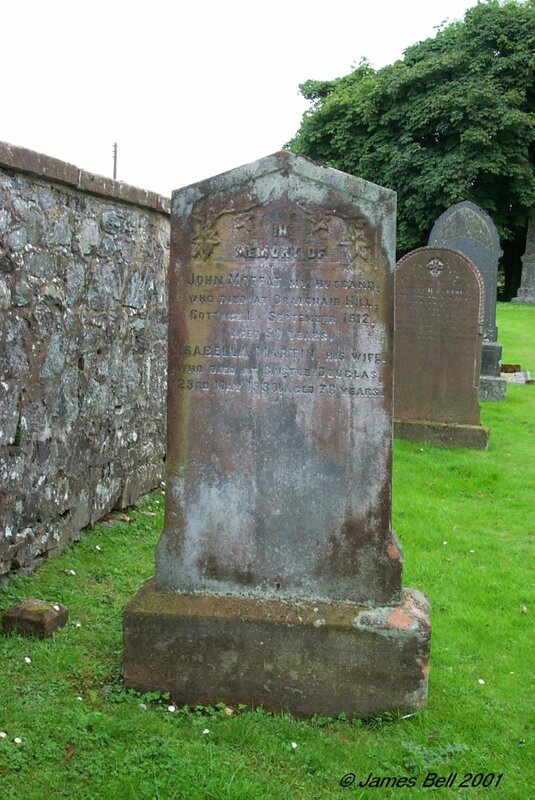 Agnes Thomson Barrowman, grand-daughter, of the above who died at Kirkcudbright, 6th Nov. 1910, aged 1 year & 9 months. Also the said John Howat Barrowman, who died at Corrahill, Rerrick, 24th May 1921, aged 80 years. Also John Douglas Barrowman, fourth son of the above died West Auchensheen, Colvend, 17 April 1935. Also Andrew Barrowman, second son of the above, who died at West Auchensheen, 18th Feb'y. 1936. 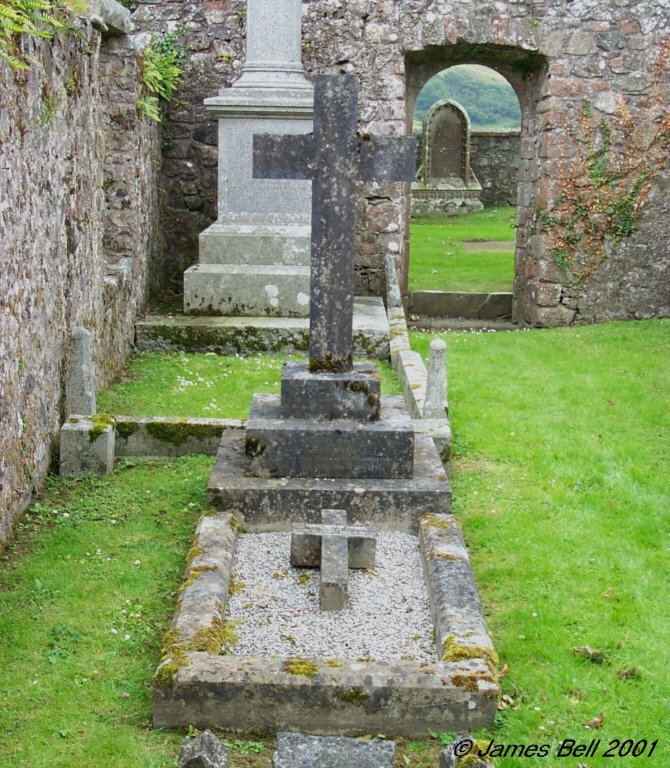 Interred in Dalbeattie Cemetery. 341 Sacred to the memory of James Gordon, who died at Buittle Mains, on the 27th July 1895, aged 63 years. Also Margaret, his eldest daughter, who died at Cullinaw, 27th August 1875, aged 1? years. Also Jessie, third daughter, who died at Buittle Mains, 21st March 1886, aged 9 years & 11 months. 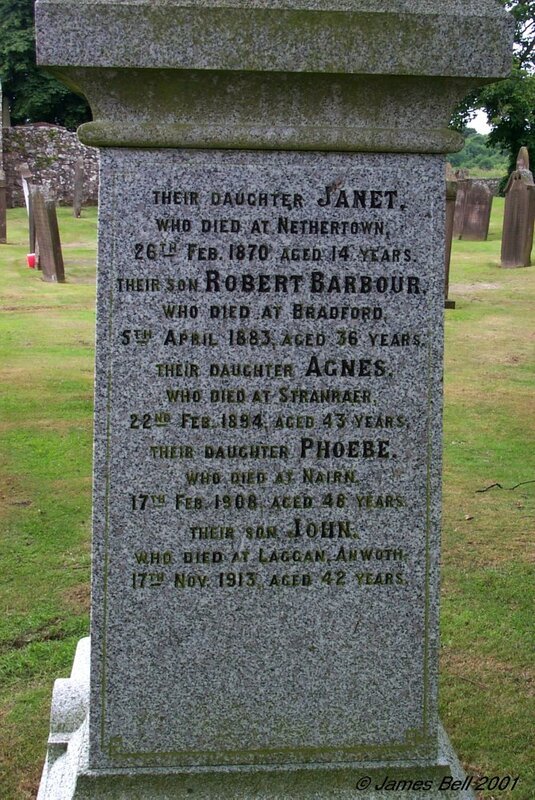 Also Agnes, his fourth daughter, who died at Larbart, 25th Oct'r. 1886, in her 12th year. Also James, his second son, who died at Glasgow, 11th Dec'r. 1902, in his 22nd year. Also Jessie Lindsay, his wife, who died at Glasgow, 19th May 1920, aged 83 years. 342 Sacred to the memory of George Wilson, Palnackie, died 7th February 1895, aged 60 years. Helen Wilson Black, his wife who died 20th October 1920, aged 83 years. Also their children:- John Black Wilson, Chief Officer, Barque, 'Lamorna', lost at sea on voyage to Sandwich Islands, Pacific Ocean, 1893, aged 27 years. Thomas Wilson, died in Asheville, N.C. U.S.A., 23rd October 1904, aged 40 years. William Charles Wilson, died 17th January 1943, aged 76 years. Mary Helen Bell Wilson, died 16th February 1948, aged 79 years. Francis Hamilton Wilson, died in Nairobi, Kenya, 10th August 1961, aged 81 years. 343 In loving memory of Jane Grey Stitt, beloved wife of James Rae Halliday, who died at Woodlea, Palnackie, 23rd Sepr. 1934, aged 60 years. Also the above James Rae Halliday who died at Woodlea, Palnackie, 15th Feby. 1952, aged 77 years. 344 In loving memory of Georgina Coates, wife of William Blair, who died at Gardenburn, 25th March 1937, aged 79 years. 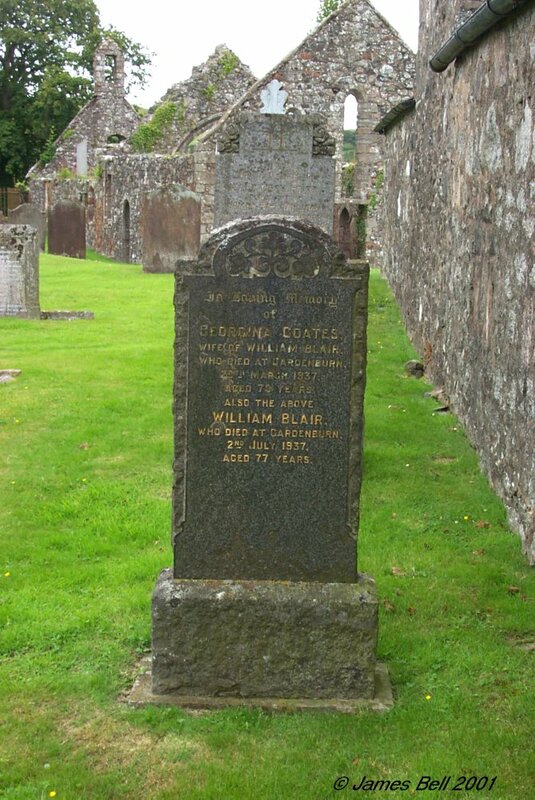 Also the above William Blair, who died at Gardenburn, 2nd July 1937, aged 77 years. 345 In loving memory of Elizabeth Martin, wife of James Litster, who died at Kirkennan Lodge, 3rd July 1898, aged 42 years. And of the said James Litster, who died on the 24th December 1916, aged 68 years. 346 The upper part of this stone has been turned 180? and now faces the wrong way. 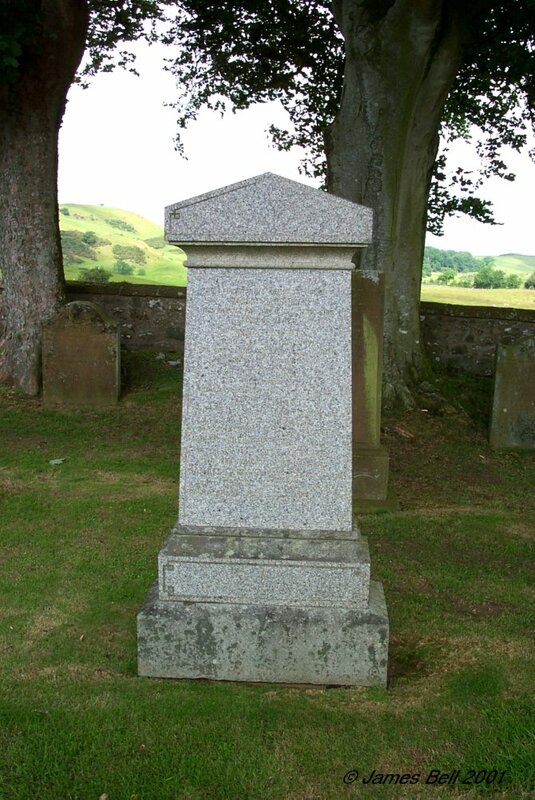 In loving memory of Andrew Barrowman, died at West Logan, 24th Jan. 1897, aged 19 years. And Jeanie Barrowman, who died 27th Jan. 1897, aged 9 years. James Barrowman, who died 21st Nov. 1919, aged 74. Erected by their mother. 347 Erected by Margaret Maxwell, in loving memory of her husband Robert Callander, who died at Park, Palnackie, 25th December 1896, aged 92 years. 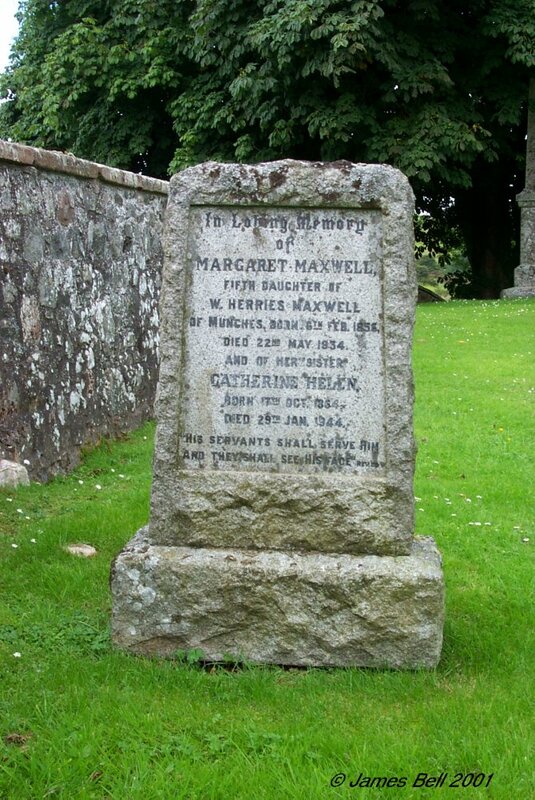 Also Margaret Maxwell, spouse of the above, who died at Castle Douglas, 26th December 1901, aged 77 years. Also Lily McMillan, wife of their son Robert, who died at Ringford 10th June 1935, aged 74 years. Also the above Robert Callander, who died 22nd Nov'r 1937, aged 79 years. 348 In memory of Robert Smith, who died at Toul, Munches, October 19th 1896, aged 30 years. Thomas Smith, who died at Mill Cottage, Dalbeattie, 31st July 1918, aged 78 years. Also Agnes Kirk, wife of the above Thomas Smith, who died 24th March 1937, aged 95 years. Also their son William, who died 12th April 1935, aged 53 years. 349 Erected by George Macaulay, in loving memory of Jane Steele, his wife, who died at Palnackie, 25th August 1896, aged 45 years. For in the Lord Jehovah is everlasting strength.' Isaiah XXVL IILIV. 350 In loving memory of Janet Hunter, wife of Alexander Helm, who died at Little Knox, 9th June 1895, aged 72 years. Also the above Alexander Helm, who died at Little Knox, 11th September 1903, aged 82 years. 'Until the day break and the shadows flee away. 351 In loving memory of Robert McCartney, who died at Doach, Gelston, 23rd May 1899, aged 63 years. William, his son, who died at Calva, Henry Co, Illinois, U.S.A., 20th February 1889, aged 27 years. Agnes Anderson, who died at Doach, Gelston, 16th Dec'r. 1916, aged 78 years. Mary Jane, his daughter, who died on the 1st June 1917, aged 52 years. 352 In loving memory of Elizabeth McMichael, wife of Thomas Wallace, who died at Courthill, Buittle, 19th Dec. 1900, aged 53 years. The above Thomas Wallace, who died at Courthill, Buittle, 14th Nov. 1919, aged 75 years. Janet Wallace, his mother, who died at Courthill, Buittle, 7th January 1907, aged 84 years. Thomas Wallace, son of the above Thomas & Elizabeth Wallace, died 20th July 1970, aged 84 years. 353 In affectionate remembrance of Elizabeth Jardine, relict of Joseph Bond of Luton, Beds, who died at Palnackie, on the 23rd day of March 1902, in her 88th year. And Mary Jardine, sister of the above who died at Palnackie, on the 17th Nov. 1905, in her --- year. 354 Erected by William McCulloch, in affectionate remembrance of my wife Agsey Marton Colter, who died at Palnackie, 6th April 1904, aged 64 years. Also my daughter Helen, who died at Palnackie, 16th April 1905, aged 14 years and 9 months. The above William McCulloch, who died at Palnackie, 14th Jan. 1915, aged 80 years. Also William Hartley, their son, who died at Royal Infirmary, Edinburgh, 10th April 1916, aged 59 years. Interred in Morningside Cemetery. Also Agnes McCulloch, their daughter, who died at Edinburgh Infirmary, 27th November 1918, aged 39 years. 355 In loving memory of Robert Steel, who died 6th April 1920, aged 28 years. 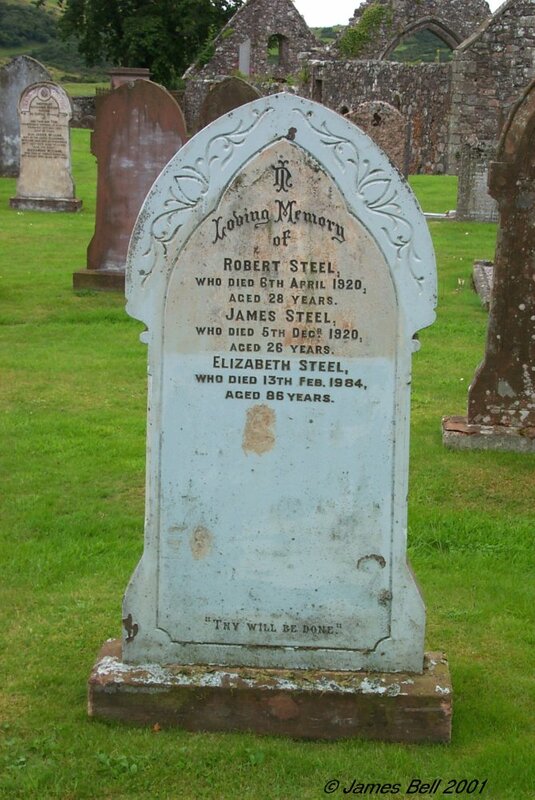 James Steel, who died 5th Dec'r 1920, aged 26 years. Elizabeth Steel, who died 13th Feb. 1984, aged 86 years. "Thy will be done." 357 In loving memory of Margaret Craik, wife of Charles Stewart, who died at Gardenburn, on the 18th December 1915, aged 65 years. Also the above Charles Stewart, who died at the Bennan, Mossdale, on the 4th October 1933, aged 80 years. 358 In loving memory of Mary Logan, widow of David Gibson, who died at Douganhill, 5th Oct. 1906, aged 64 years. Also David, beloved son, of John and Jessie Gibson, who died at Douganhill, 27th Jan'y 1908, aged 1 year and 7 months. 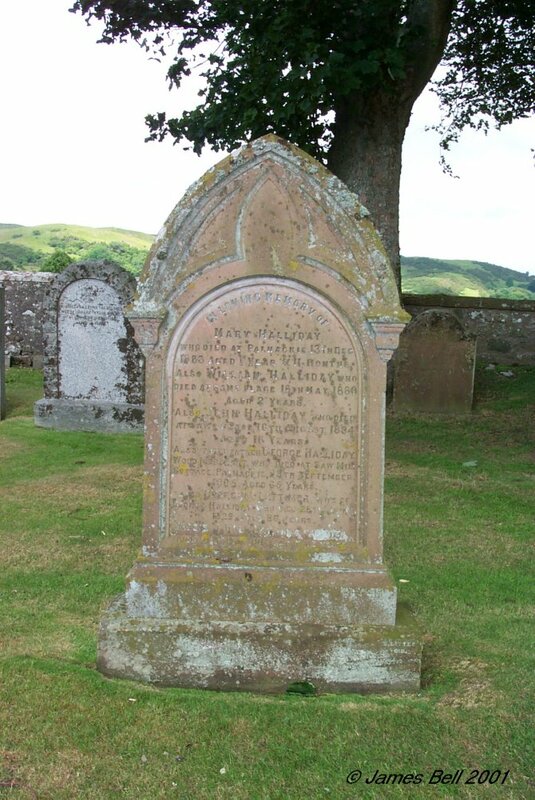 Also Winifred Mary, their beloved daughter who died at Mochrum, Parton, 20th July 1920, aged 3 years and 3 months. Also the above John Gibson, of Mochrum, beloved husband of Jessie McVinnie, who died 8th June 1934, aged 87 years. 359 In memory of John Moffat, my husband who died at Craignair Hill Cottage, 1st September 1912, aged 50 years. 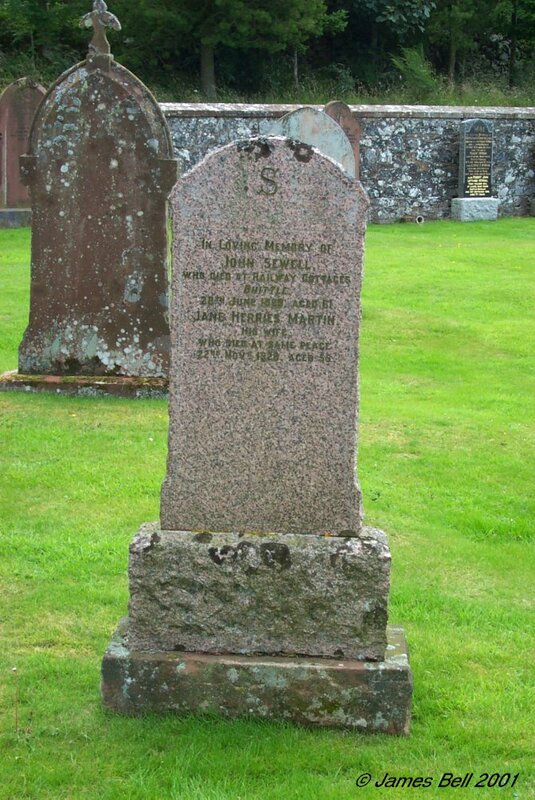 Isabella Martin, his wife, who died at Castle Douglas, 23rd May 1930, aged 76 years. 360 In loving memory of Thomas Rae, who died at Isle of Almorness, 31st Oct'r 1917, aged 72 years. 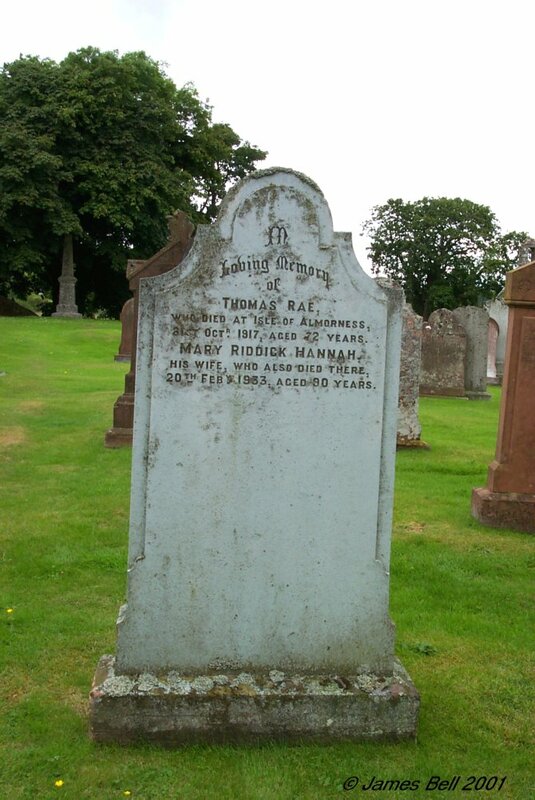 Mary Riddick Hannah, his wife who died there, 20th Feb'y 1933, aged 90 years. 361 In loving memory of Robert Wright, who died at Clonyard, 23rd April 1918, aged 63 years. 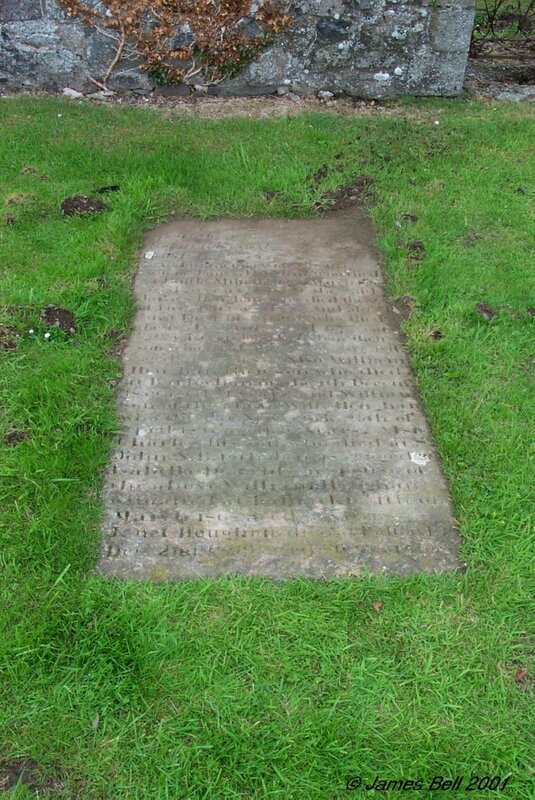 Elizabeth Ramage, his wife who died at Washington, England, 12th May 1919, aged 67 years, and is interred here. 363 In memory of Catherine Campbell, dearly beloved wife of William Sargent, who died at Gardenburn, 7th April 1922, aged 34 years. Also their son Angus, who died at Edinburgh 13th April 1919, aged 1 year. 364 In loving memory of Michael Higgins, who died at Boghall, 5th April 1918, aged 70 years. Also Mary Jane Higgins, his daughter, who died 30th Nov. 1920, aged 27 years. Also Janet B. Higgins. his daughter, who died 17th August 1932, aged 47 years. Also Jane Breckenridge, his widow, who died at Crossmichael Village, 20th July 1936, aged 77 years. 365 In loving memory of John McLellan, who died at St. Colmes, West Kirkby, 30th October 1914, aged 71 years. And Samuel Wilson McLellan, his son, who died at Liverpool, 16th October 1919, aged 38 years. Also William McLellan, C.B.E., who died at Orchard Knowes, Colvend, 11th December 1934, aged 60 years. Also Jane Wilson, wife of the above John McLellan, who died at Orchard Knowes, Colvend, 15th April 1937, aged 89 years. 366 Erected by John Kirkpatrick, in memory of Jane Caven, his wife, who died at Cullinaw, 2nd March 1921, aged 78 years. Also the said John Kirkpatrick, who died at Balannan, Ringford, 15th March 1932, aged 72 years. Also William, thier son, who died 26th Feb'y 1936, aged 54 years. 367 In loving memory of Helen Carswell, wife of John Neilson, who died at Palnackie 29th Sept. 1921, in her 63rd year. Also their daughter Helen, who died in Canada, 30th Oct. 1916, in her 39th year. Also the above John Neilson, who died at Palnackie 10th May 1926, in his 77th year. 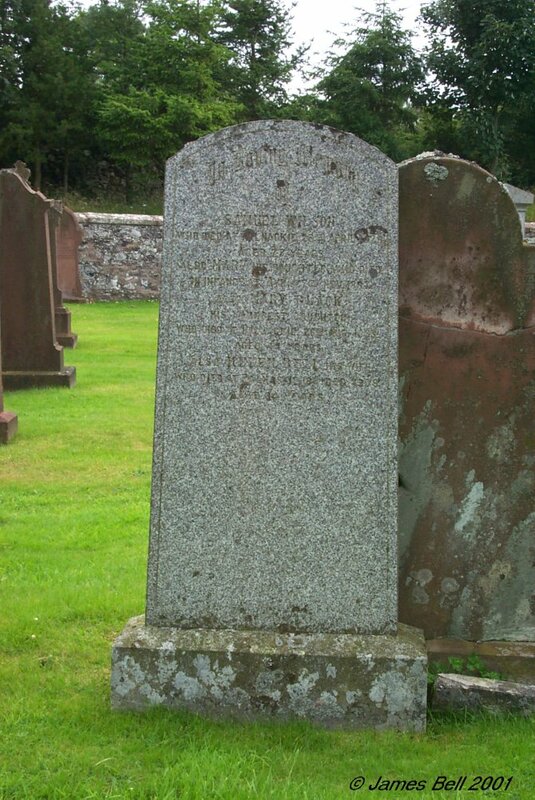 Also their grandson William Charles, who died at Dalbeattie 31st Aug. 1932, aged 8 years. Also their daughter Violet, who died 22nd March 1949, aged 52 years. 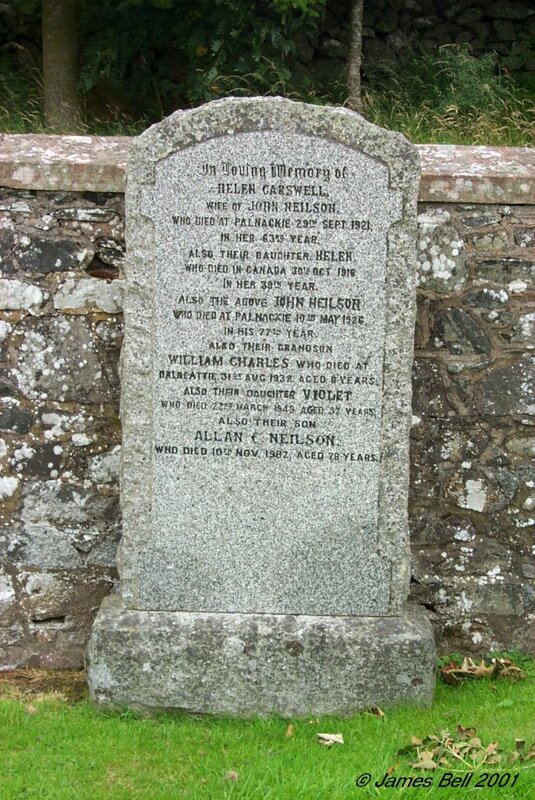 Also their son Allan C. Neilson, who died 10th Nov. 1982, aged 78 years. 368 In loving memory of Georgina Lettimer Halliday, beloved wife of Robert McMinn, died at Castle-Douglas 11th Feb'y 1922, aged 28 years. 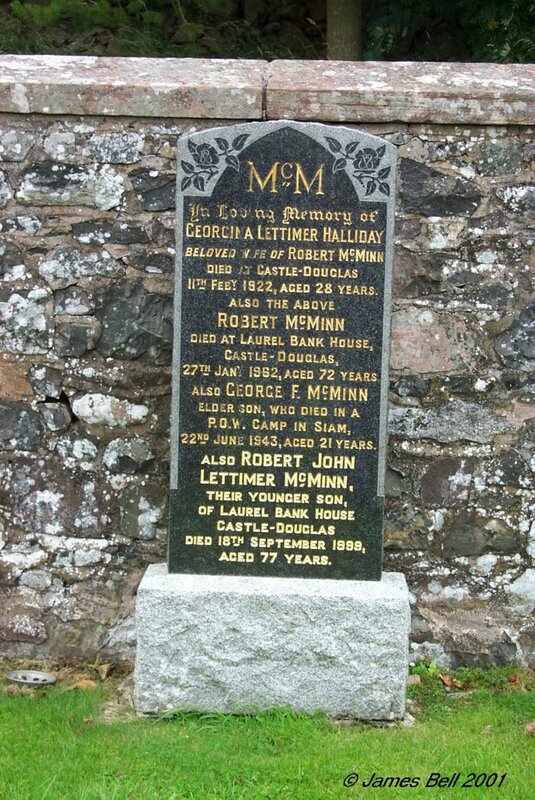 Robert McMinn, died at Laurel Bank House, Castle-Douglas 27th Jan'y 1962, aged 72 years. Also George F. McMinn, elder son who died in a P/O/W. camp in Siam, 22nd June 1943, aged 21 years. Also Robert John Lettimer McMinn, their younger son, of Laurel Bank House, Castle-Douglas, died 18th September 1999, aged 77 years. 369 In loving memory of Kenneth Graham, the beloved son of Allen and Sarah Greenway, who died at Urr Bank, Palnackie, 19th July 1922, aged 7 years. Also Stanley Ernest, grandson, died June 1st 1931, aged 13 months. Sarah Graham Halliday, beloved wife of Allen John Greenway, died at Urrbank, Palnackie, 8th Oct. 1955, aged 79 years. Allen John Greenway, master mariner, who died at 2 Derwent Terrace, Silloth, 29th June 1957, in his 88th year. 370 In loving memory of Richard Bell, who died at Broomisle, Buittle, 7th Jan'y 1926, aged 40 years. Also his wife Jane McKay Bell, who died 19th April 1982, aged 86 years.